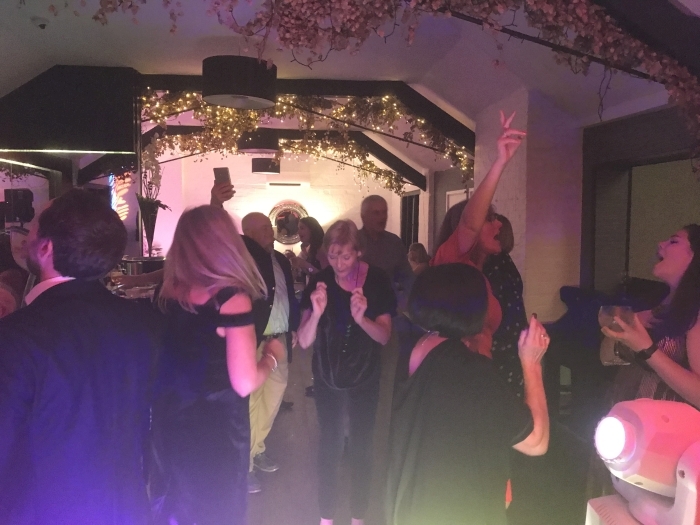 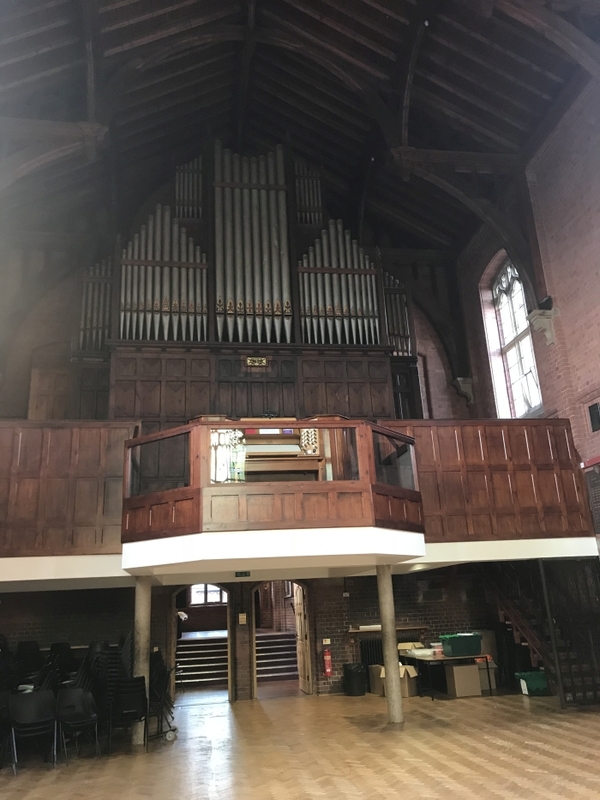 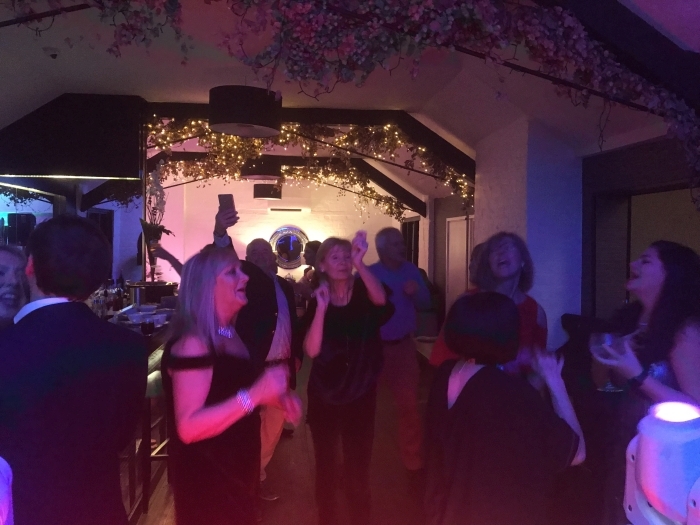 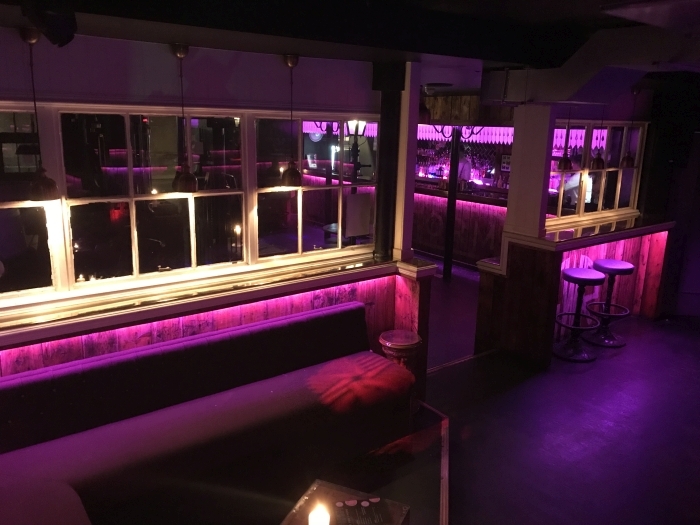 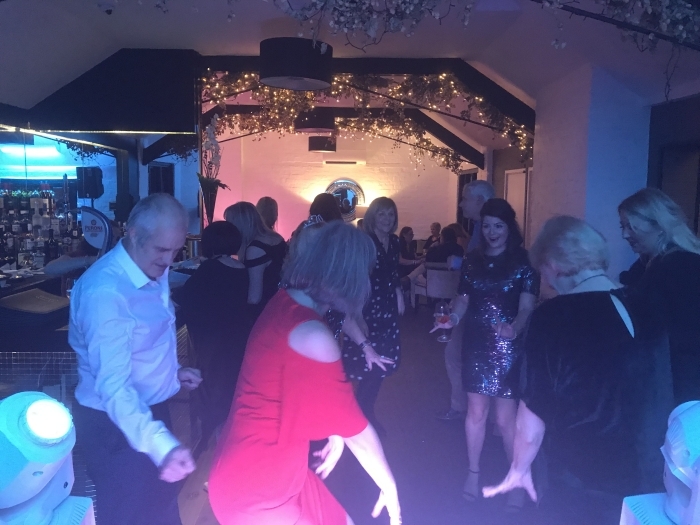 Saturday 10th November 2018 I was booked to DJ a 70th Birthday Party in Harveys Fish Street, Shrewsbury. 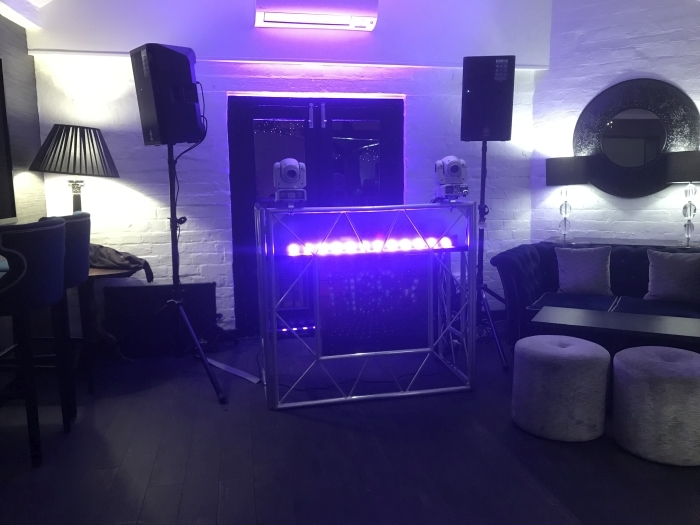 Located in the bar upstairs I started with a mixture of Jazz & Blues classics for the initial drink’s reception (2 hrs). 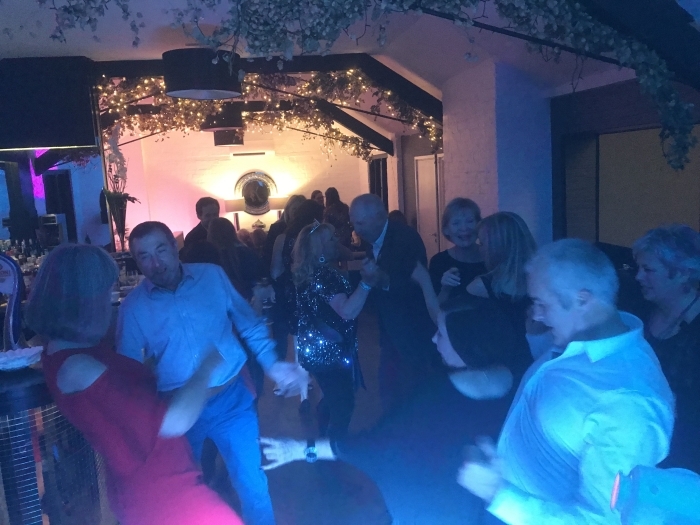 After everyone had eaten it was back upstairs to the bar where I DJ’ed through to midnight, working from a pre-provided list of tunes, taking requests and then also adding some additional tunes in keeping with the hosts requirements the dancefloor was kept busy all night long. 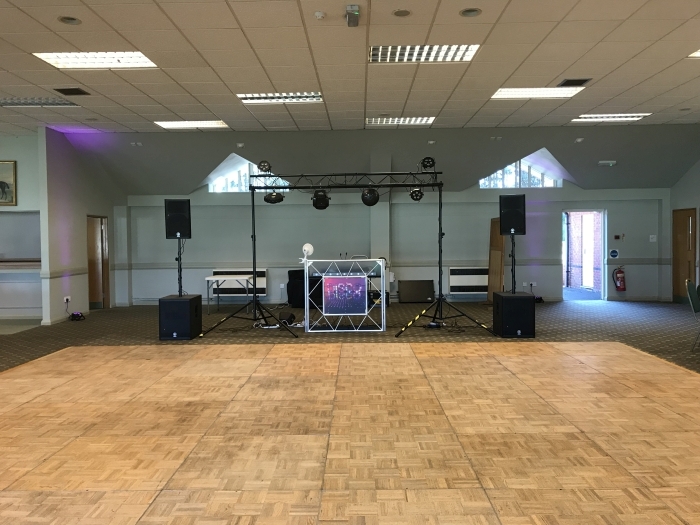 This quick video provides an overview of the setup and equipment used at this venue. 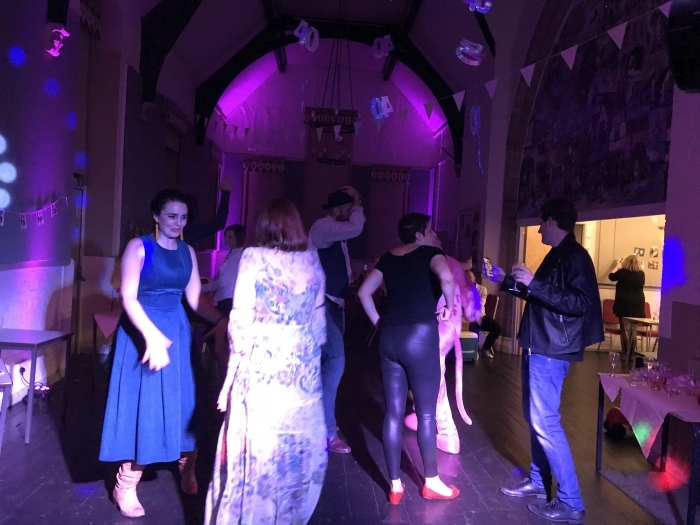 This quick video of some of the nights dancing. 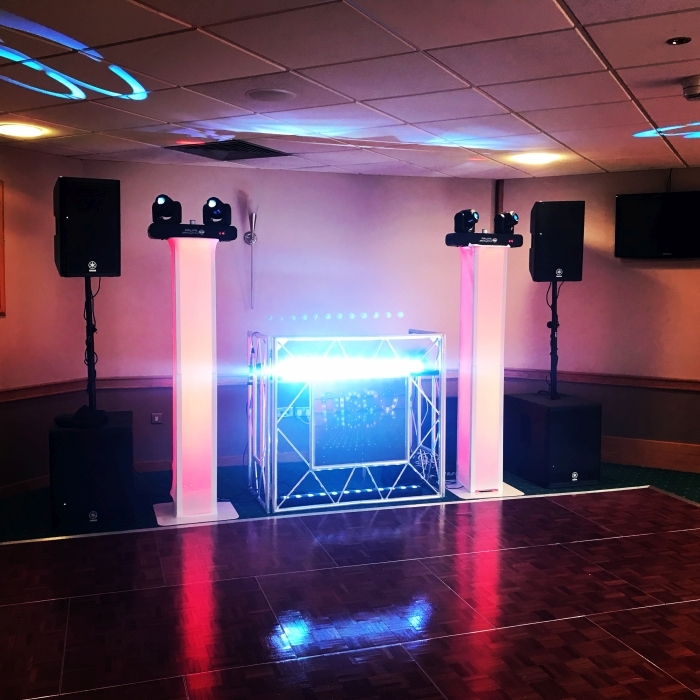 This setup is one of my compact setup options but provides a fantastic look and effect providing plenty of wow factor and eye candy. 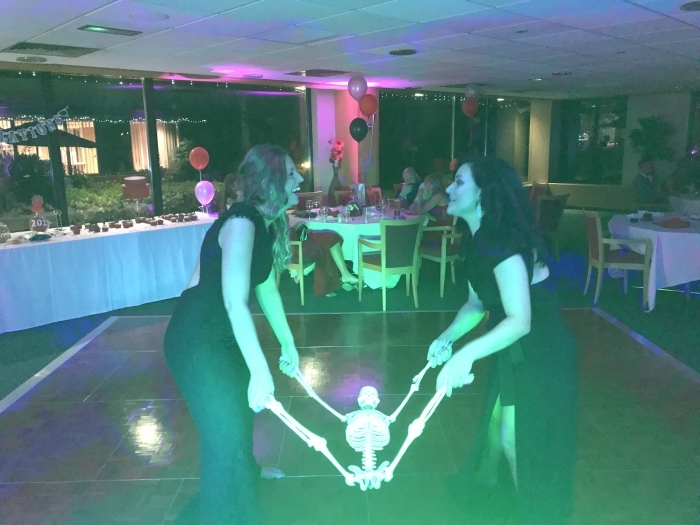 One of my favourite pictures of the night. 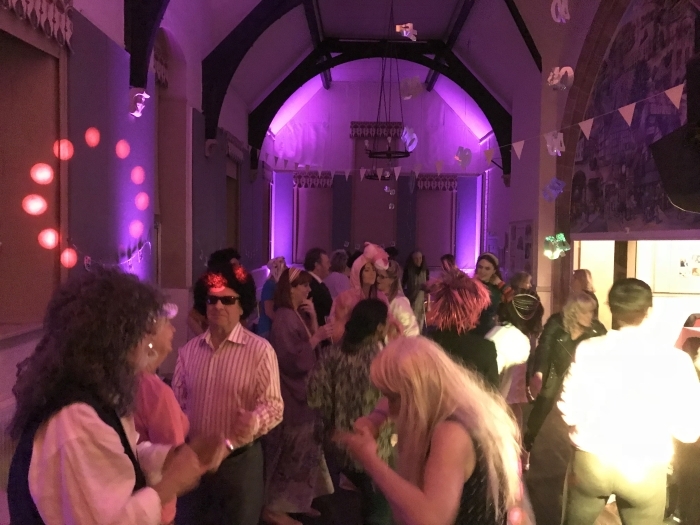 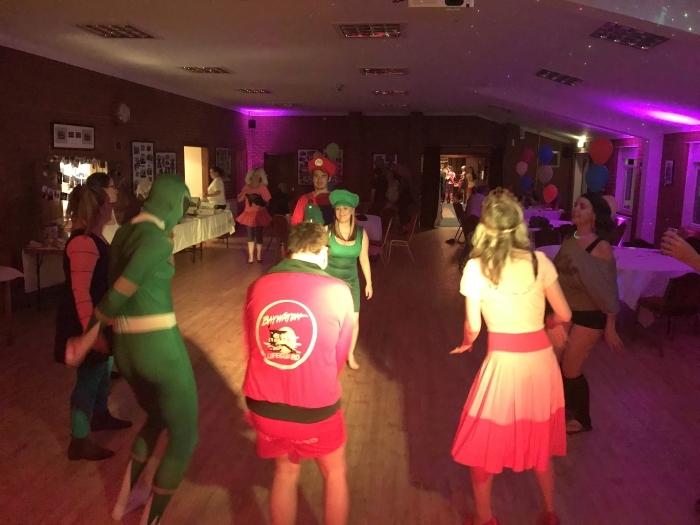 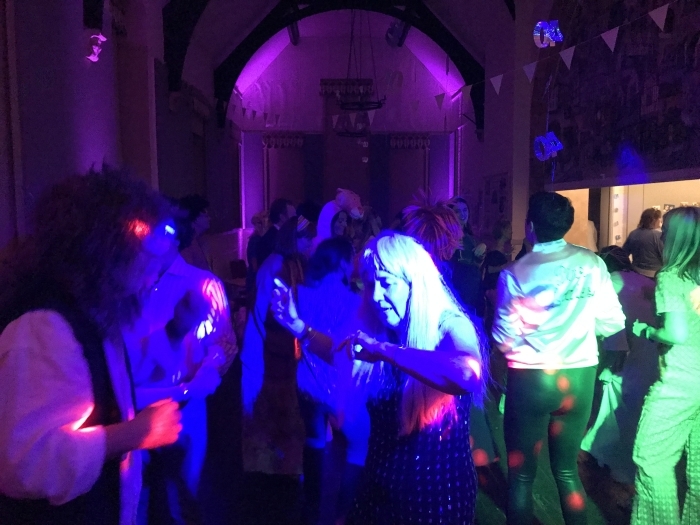 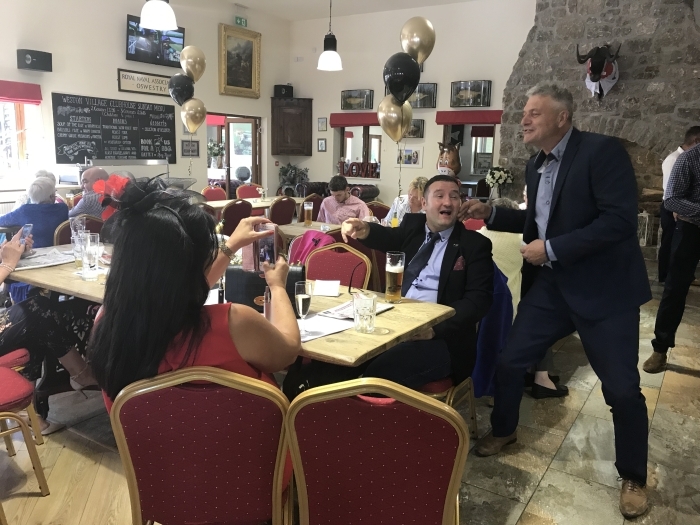 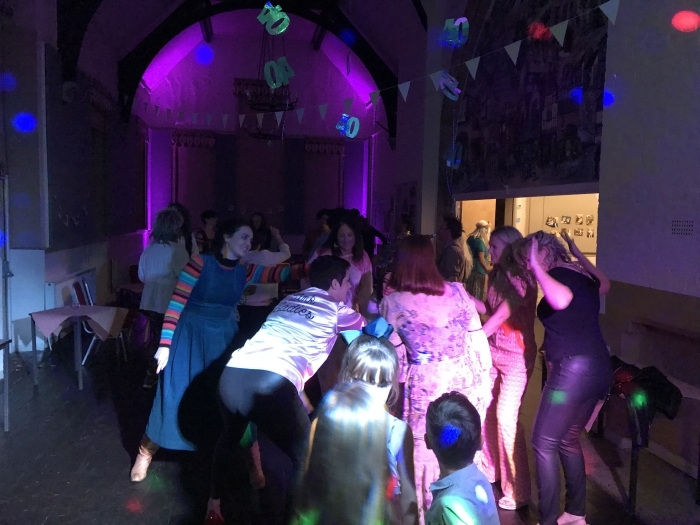 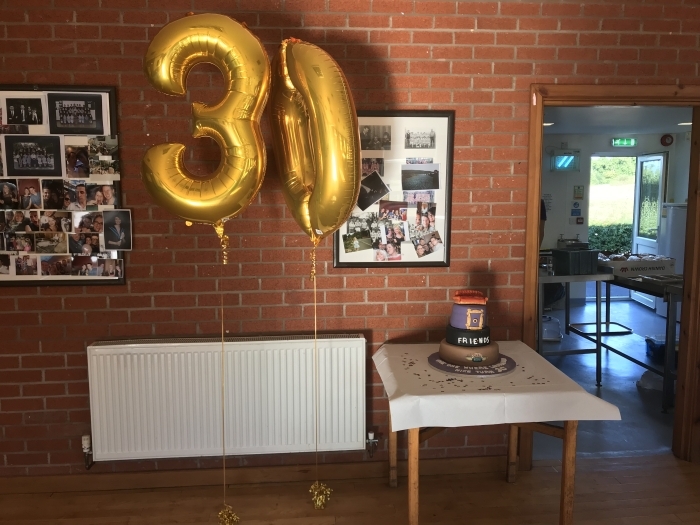 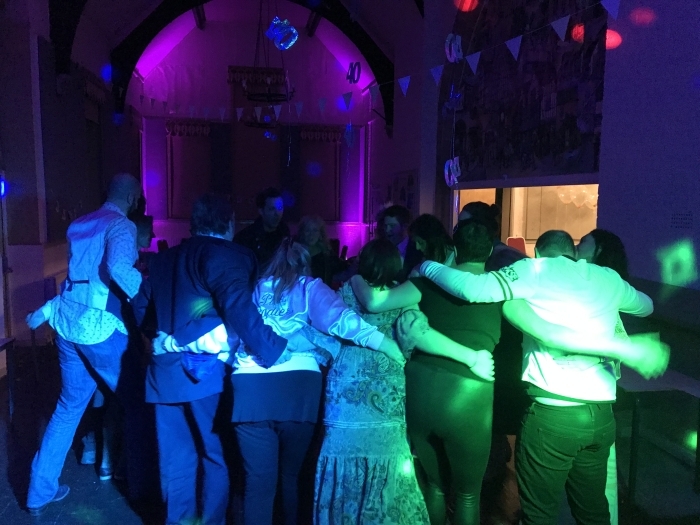 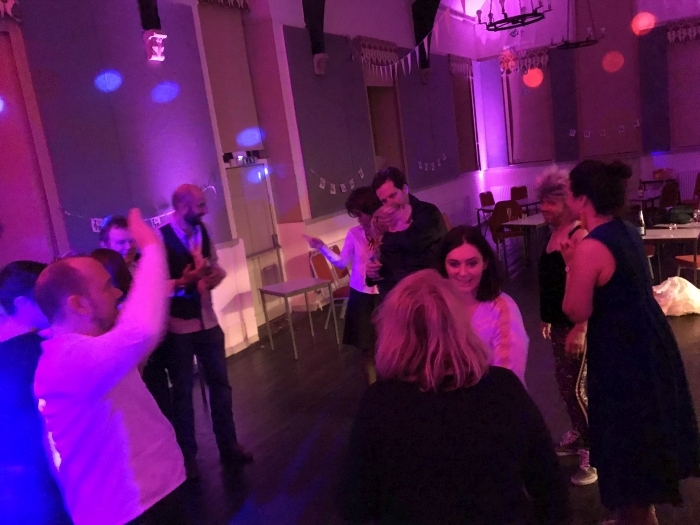 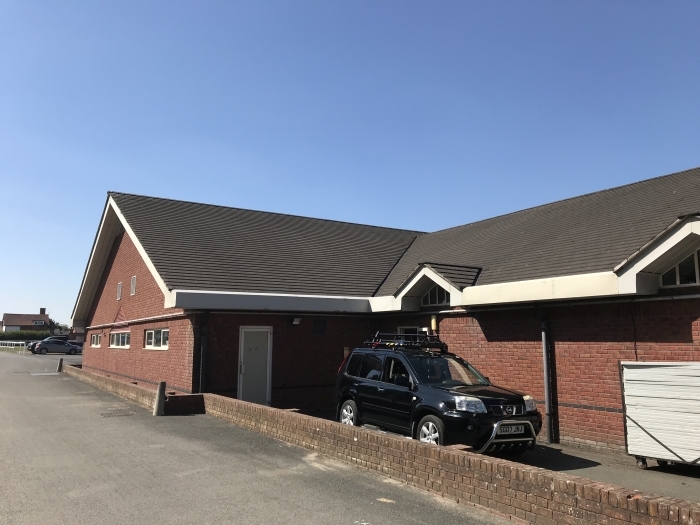 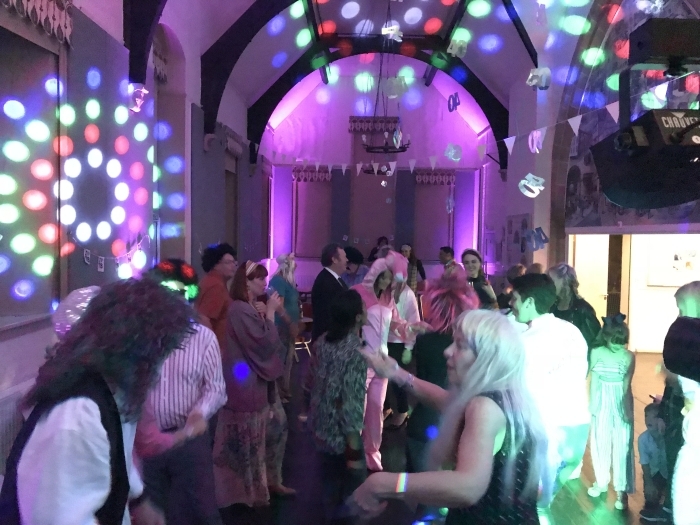 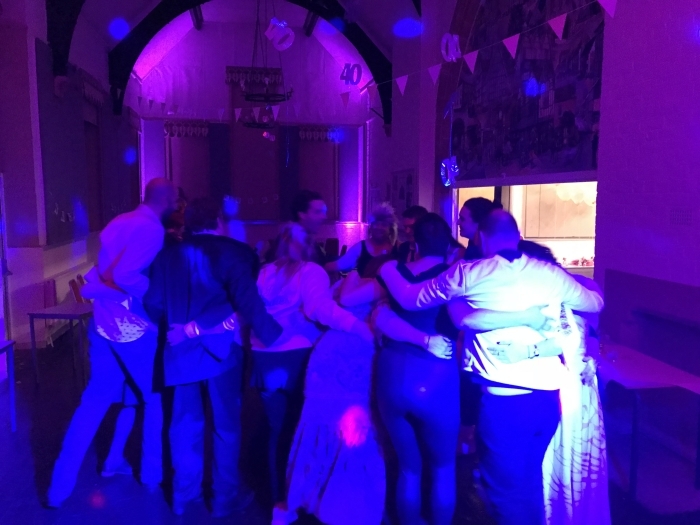 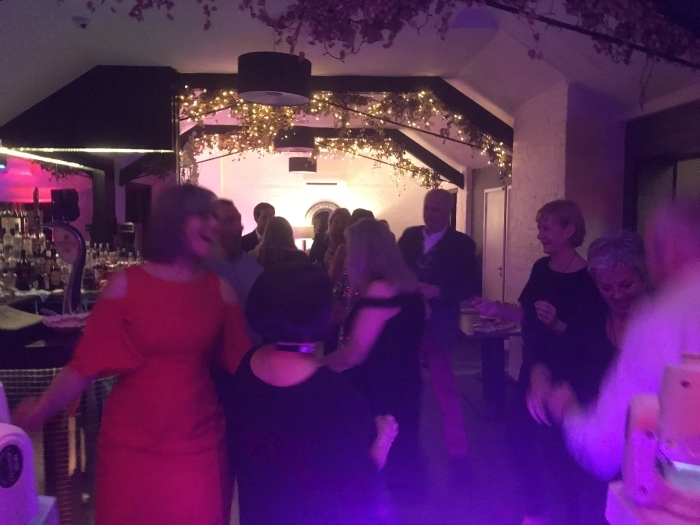 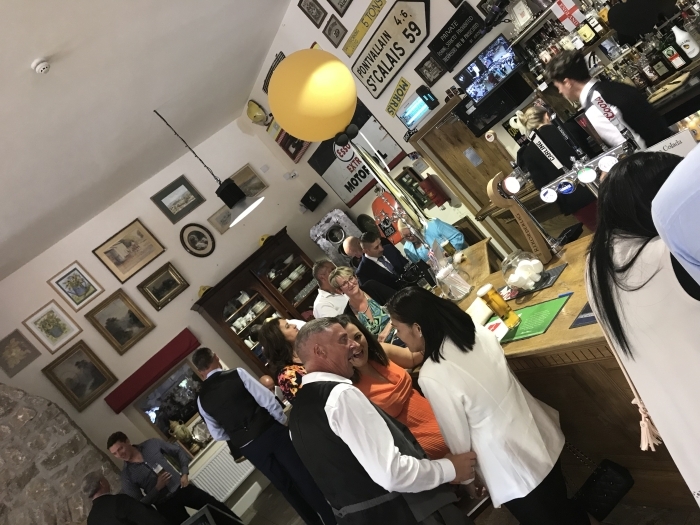 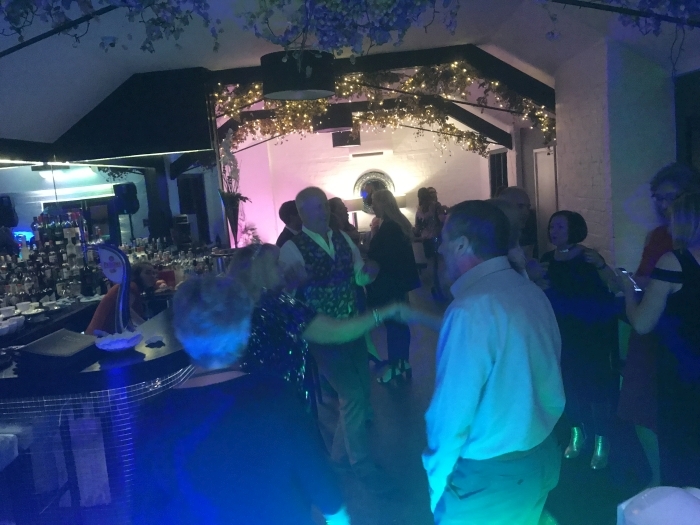 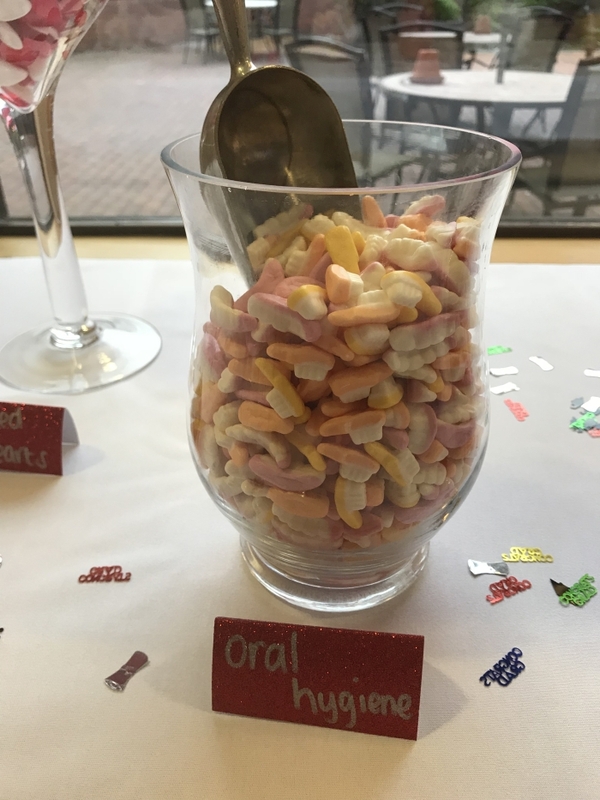 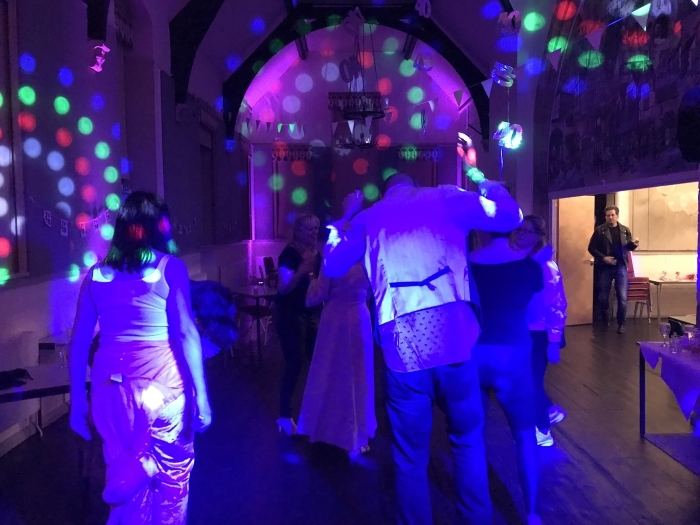 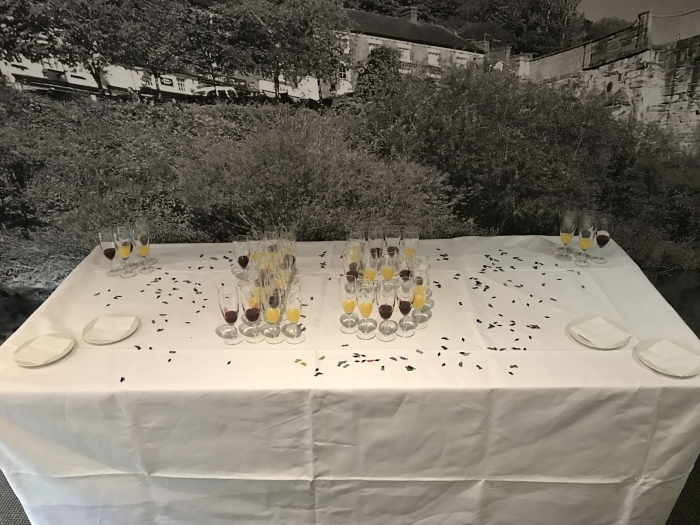 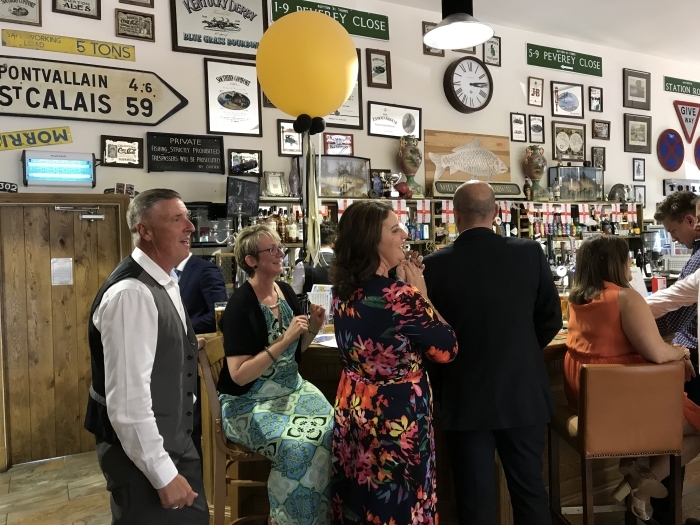 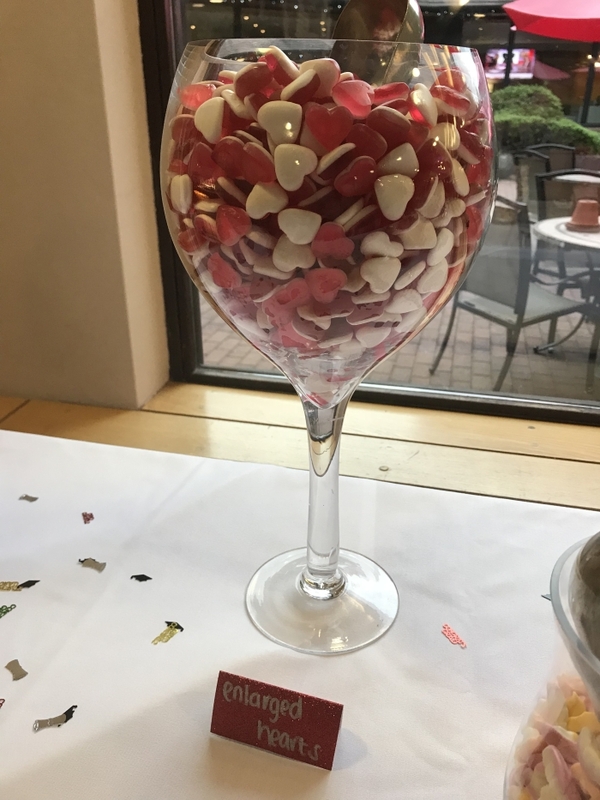 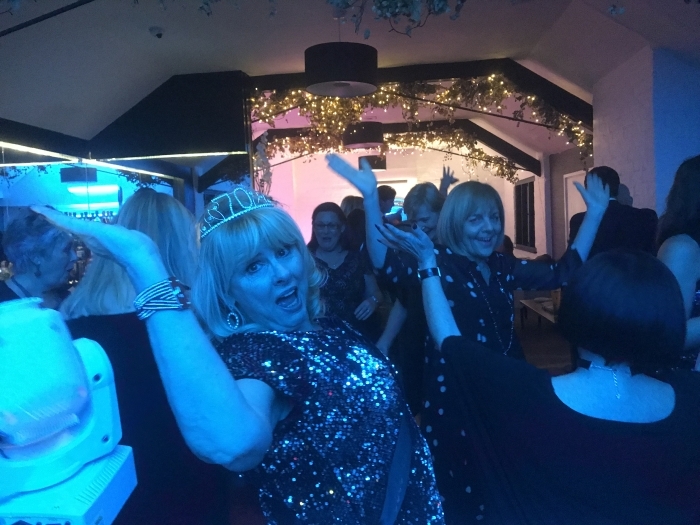 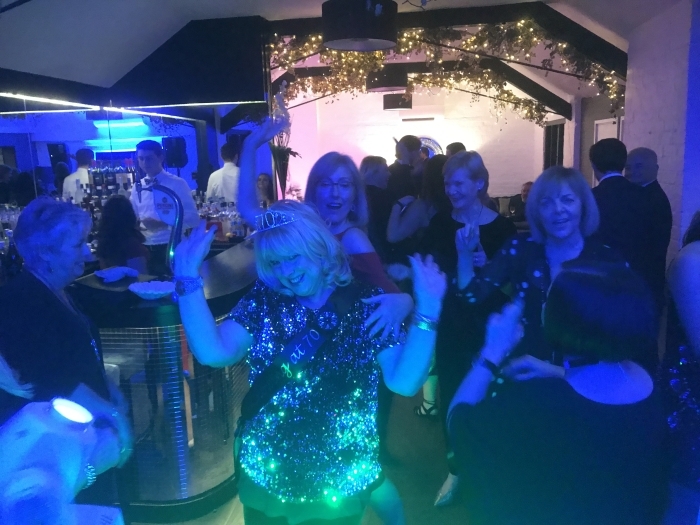 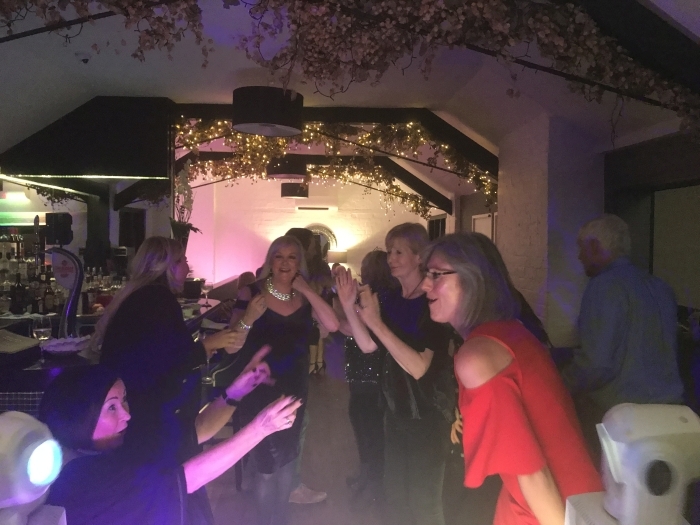 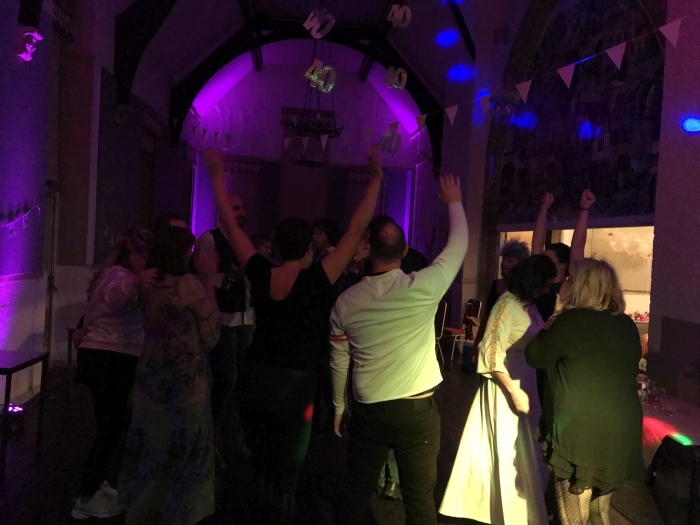 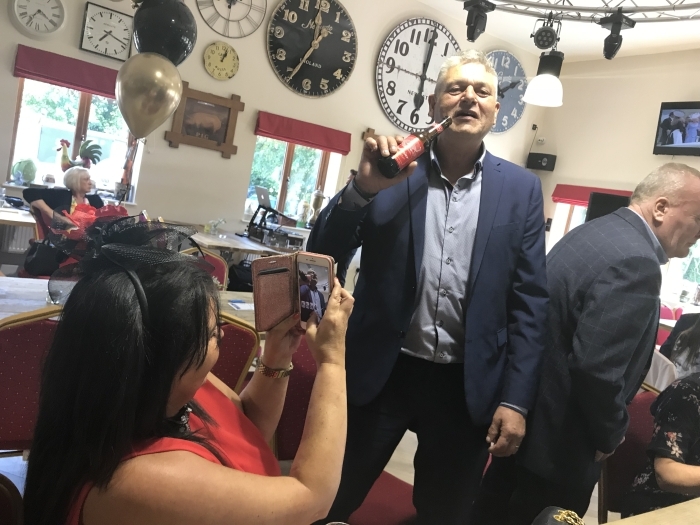 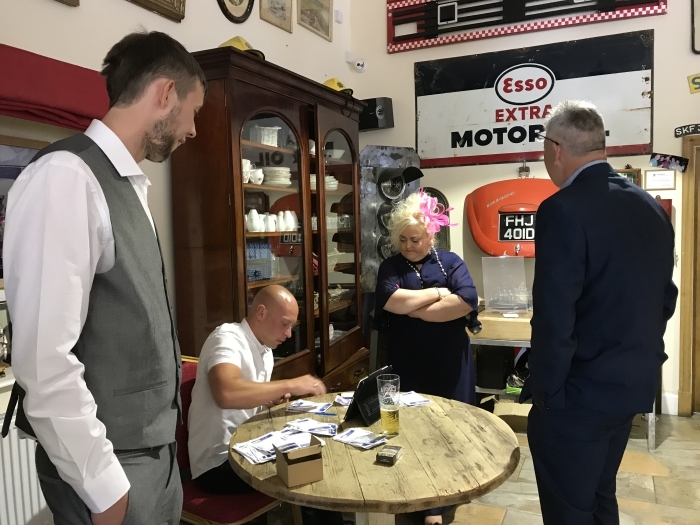 Saturday 6th October 2018 was Vick’s 40th Birthday Party which was held at the Church Hall in Much Wenlock Shropshire with around 45 members of her close friends and family attending. 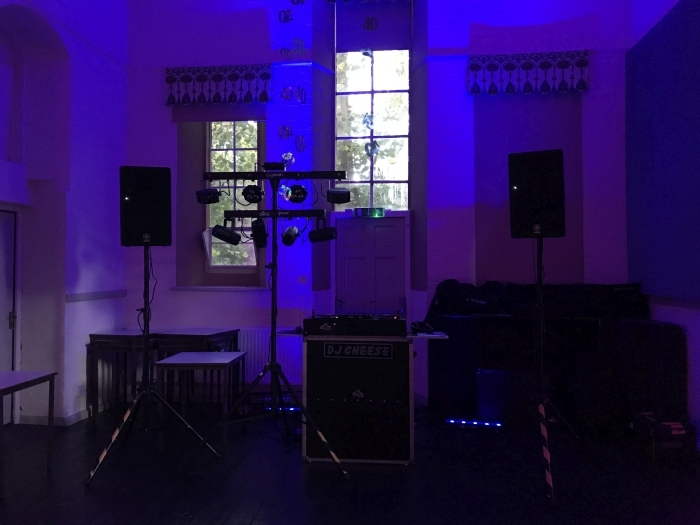 I arrived at the venue around 5pm to setup, Vicky’s husband Alex had pre booked my services and had decided upon my Compact Setup and full room mood lighting. 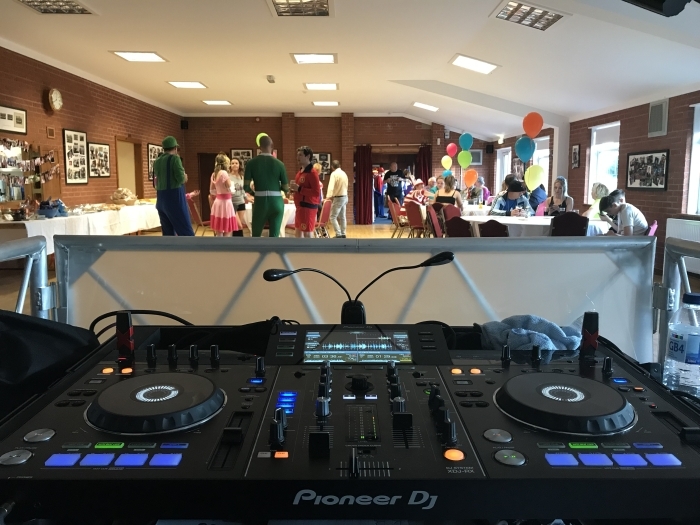 It took me around 45 minutes to setup and at 6pm I started DJing background music whilst all the guests were eating in the adjacent room. 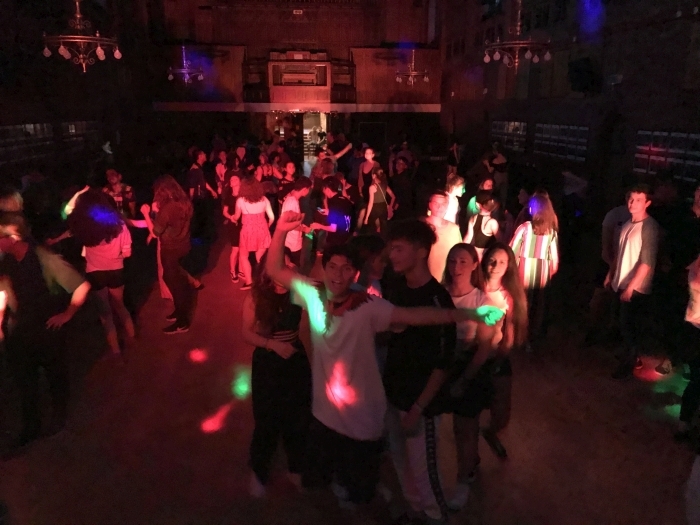 Several children were present so to entertain them prior to the main disco I DJed some recent tunes and they danced and played musical statues. 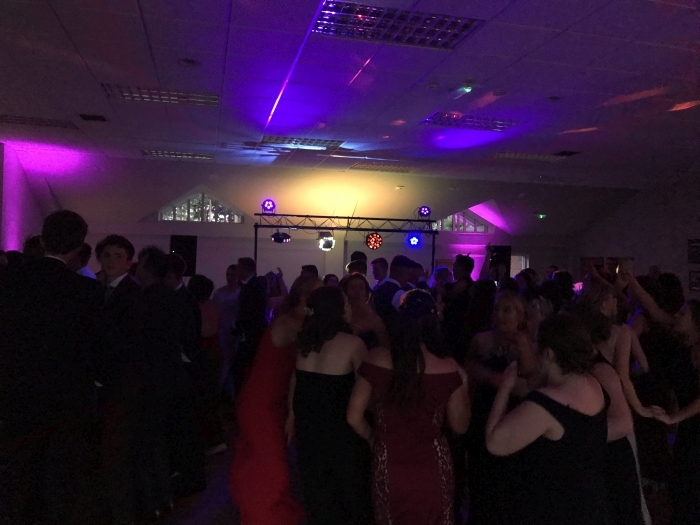 Once the food was finished at around 8:30 we moved on to the Main disco and immediately had a packed dancefloor with everyone having a fabulous time. 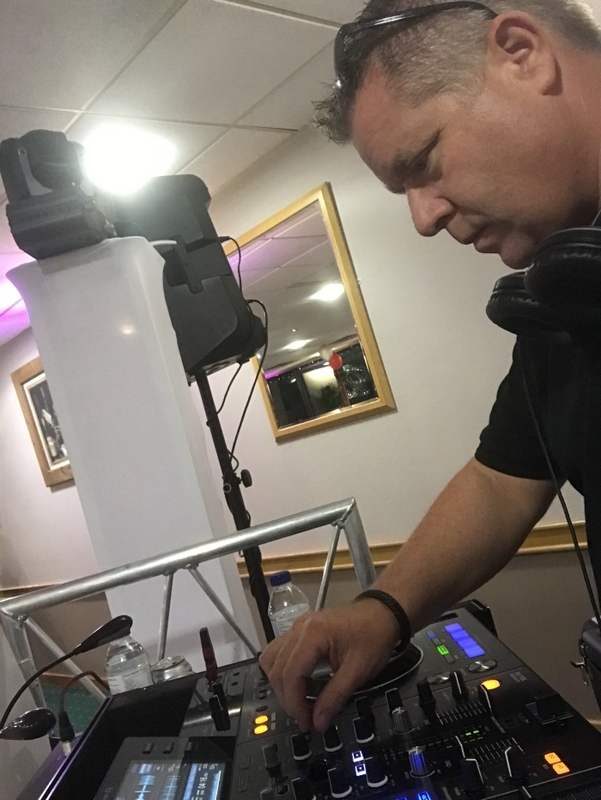 I was asked to play a lot of very different styles and genres of music throughout the evening but I managed to play almost all requests, many of which I had not been asked to play for many a moon! 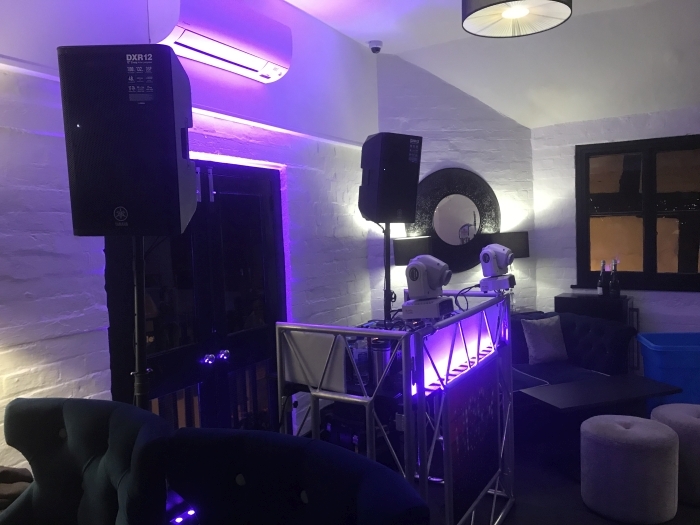 The client decided to opt for my compact setup along with room mood lighting for this event. 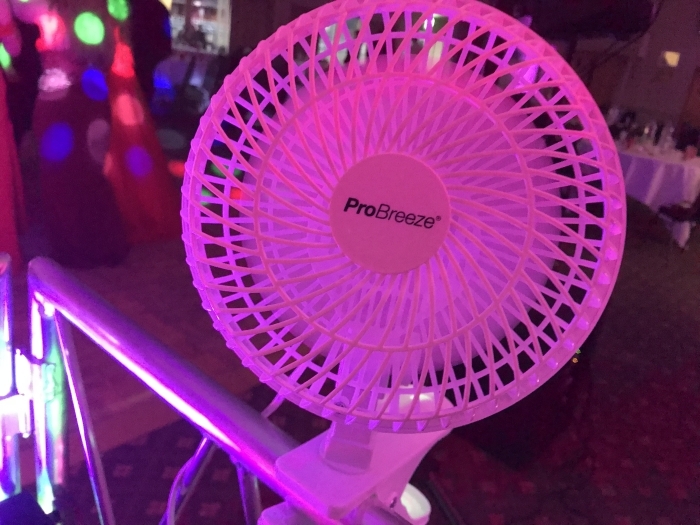 This was a quick video I did once I had setup, you will notice I made a mistake during it! 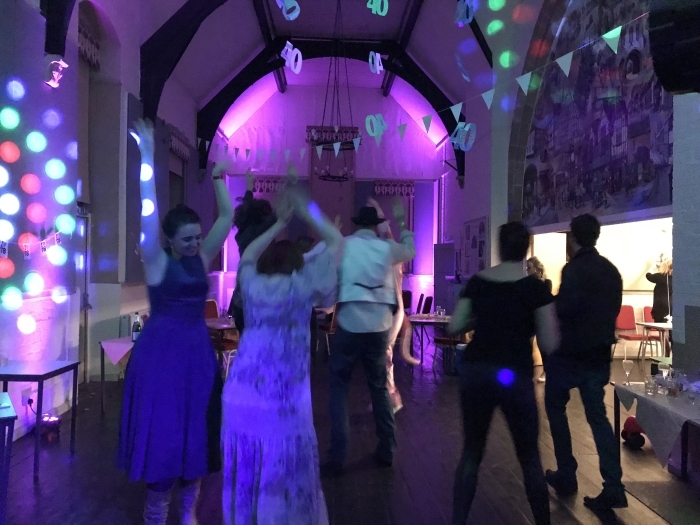 40th not 30th! 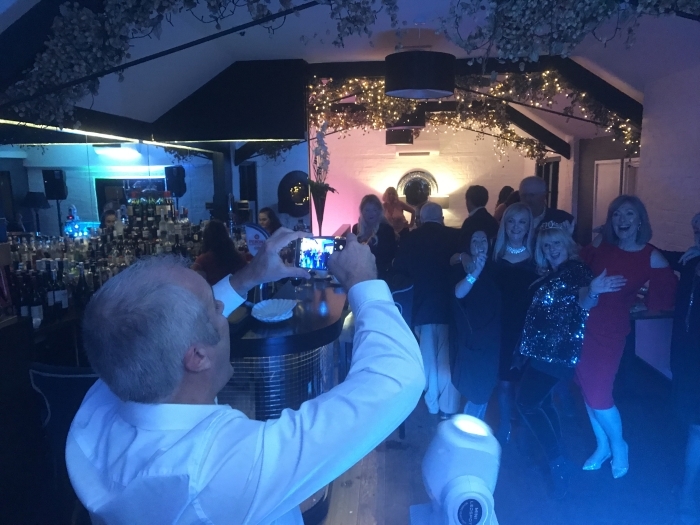 All these photos were taking from behind the DJ booth. 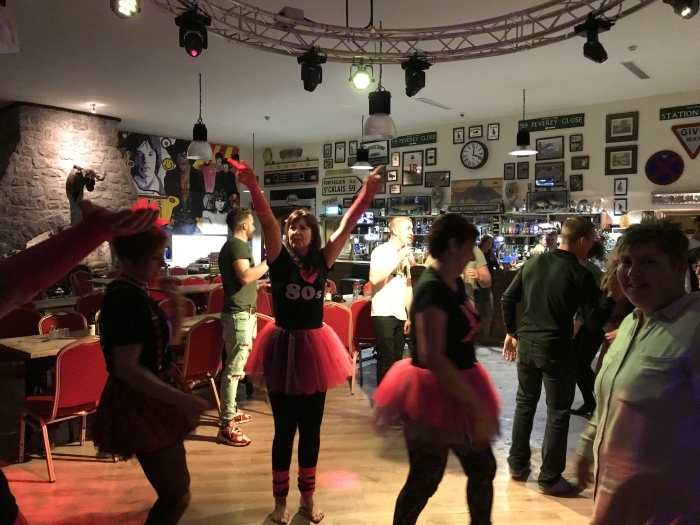 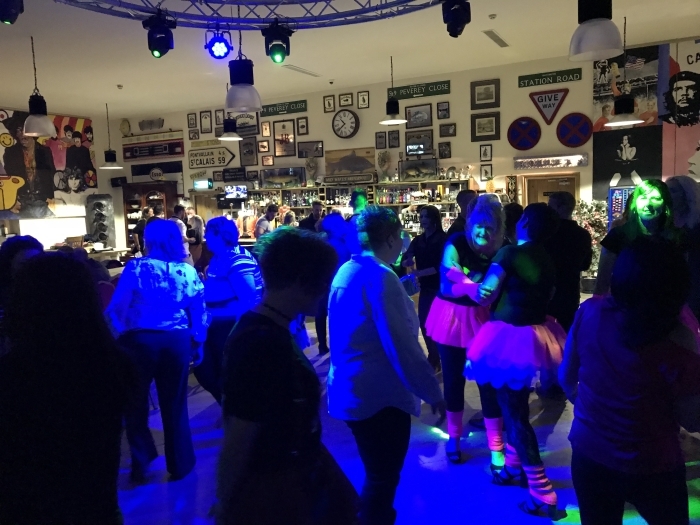 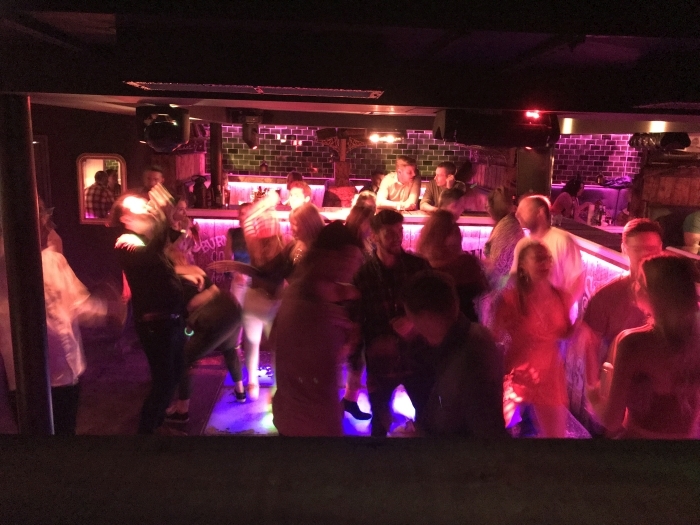 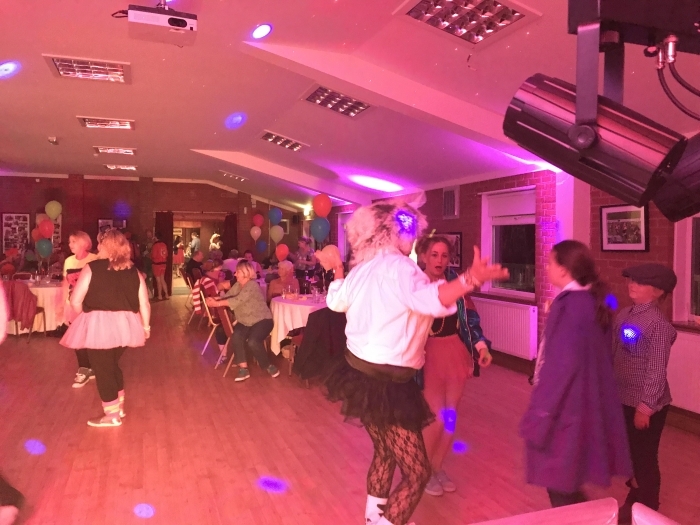 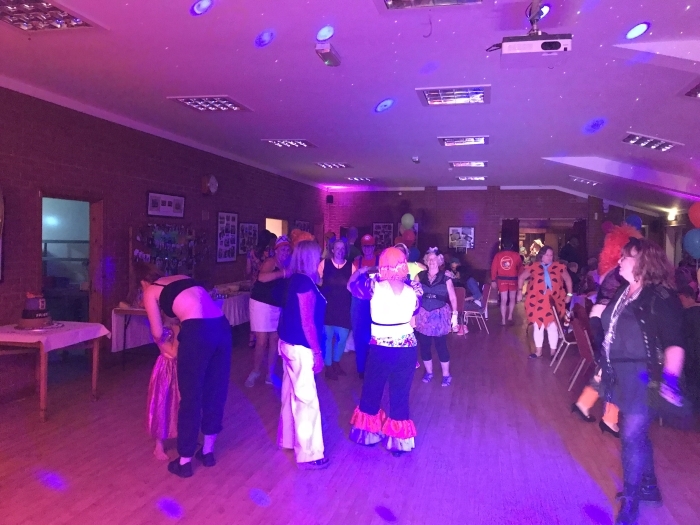 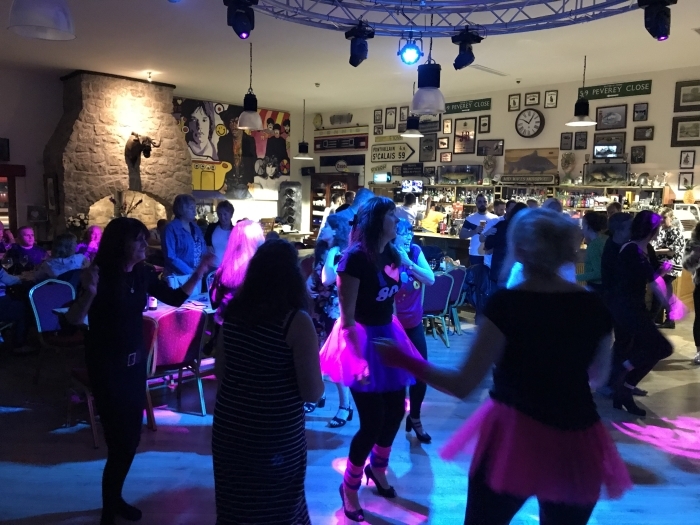 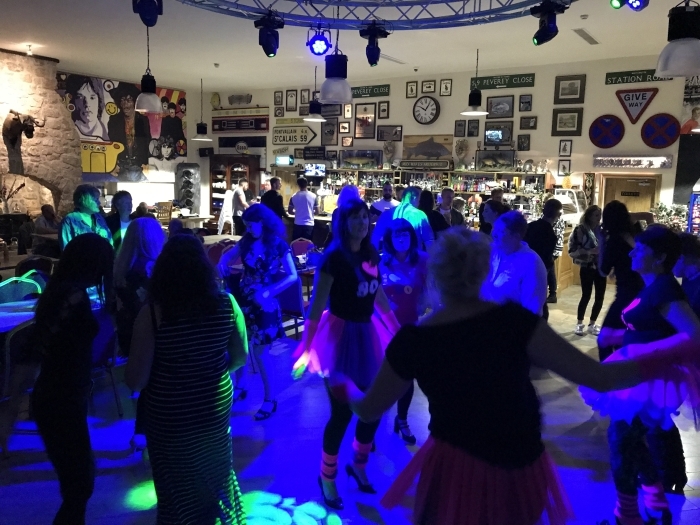 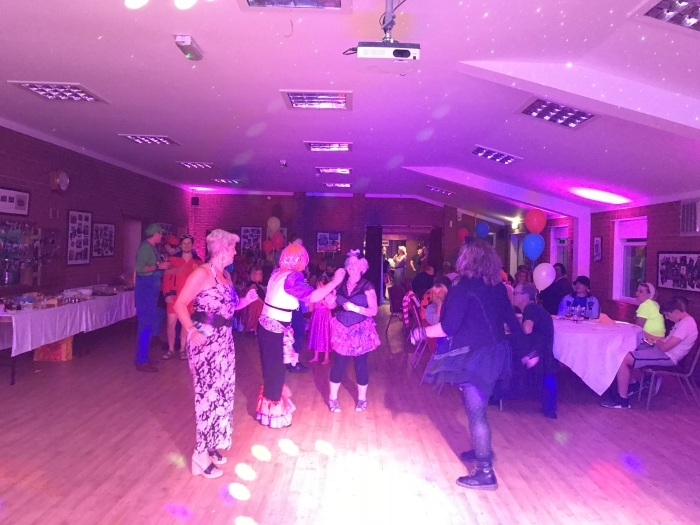 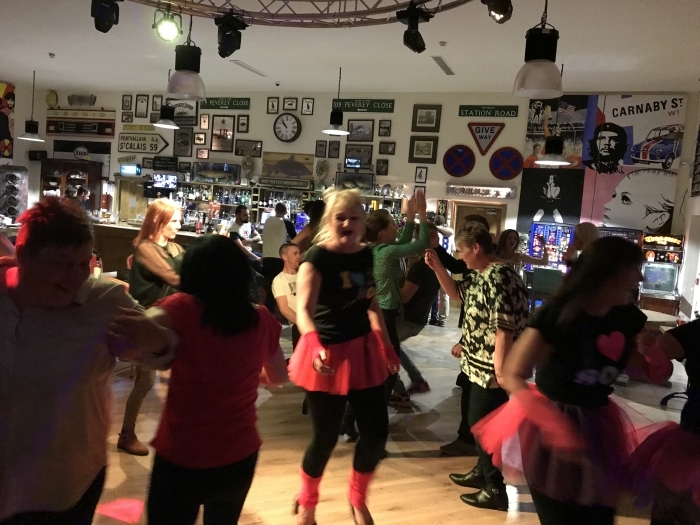 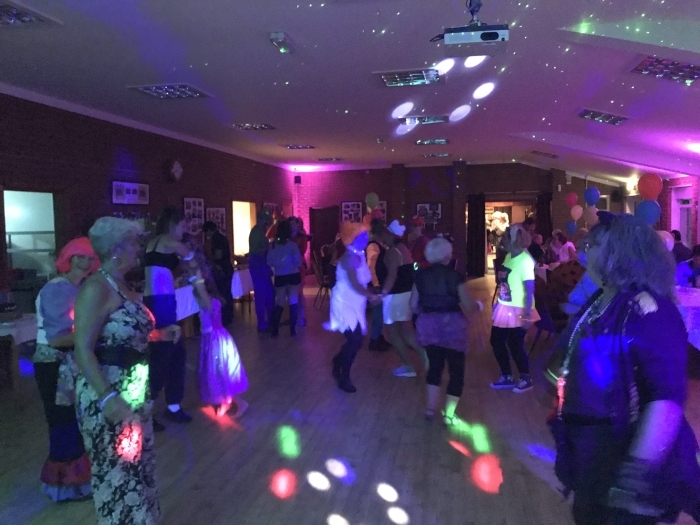 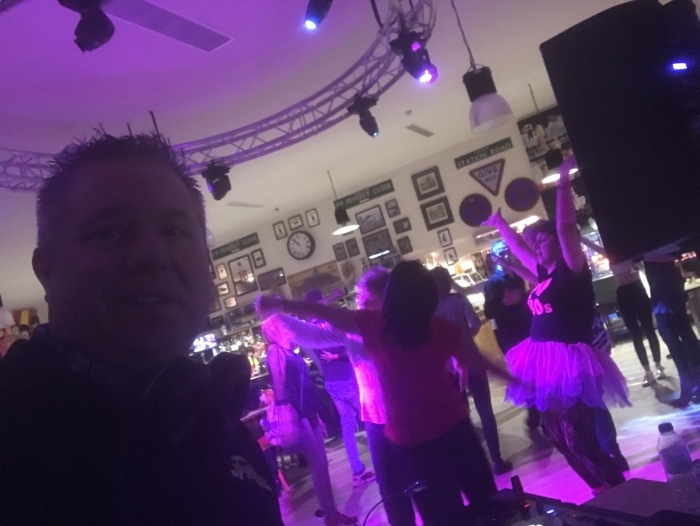 Friday 5th October 2018 was Back to the 80s night at Weston Village Clubhouse Oswestry, as a DJ I always look forward to these nights as its always a great crowd,fabulos venue and I always had a great time. 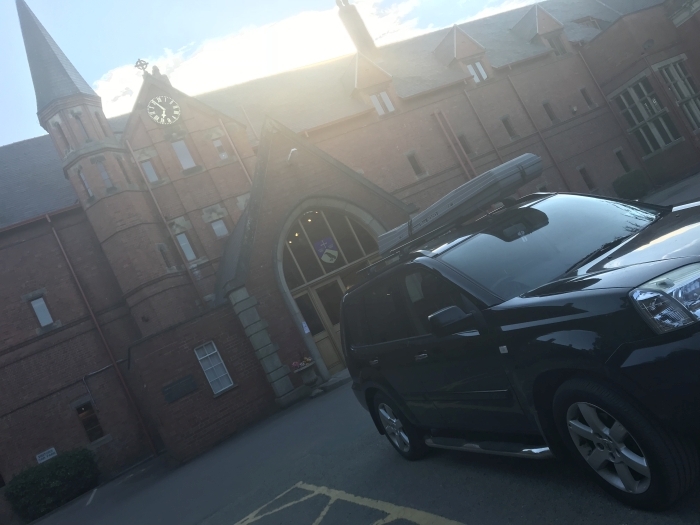 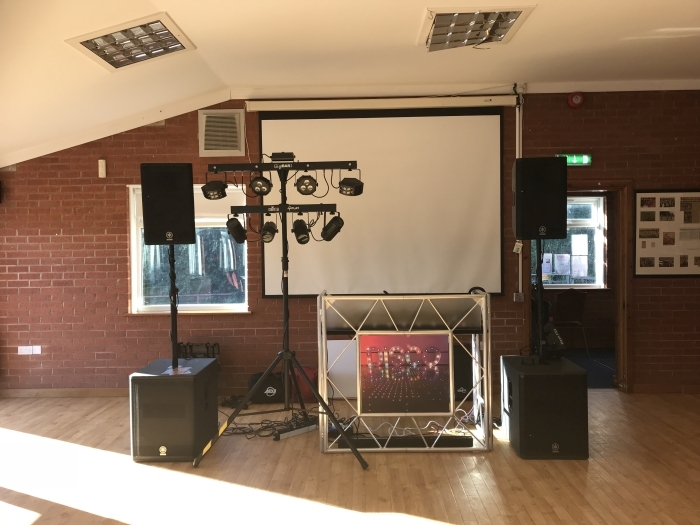 Arriving at around 7pm setup a Weston Village Clubhouse is always very quick as they have in place a fantastic lighting system installed and some amazing speakers they pack a great punch. 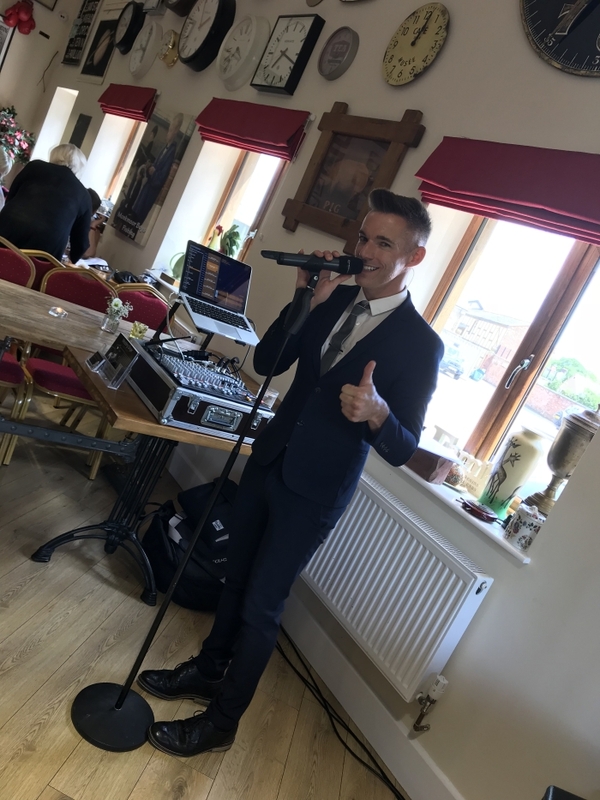 I did not do any videos at this gig, I’m not really sure why! 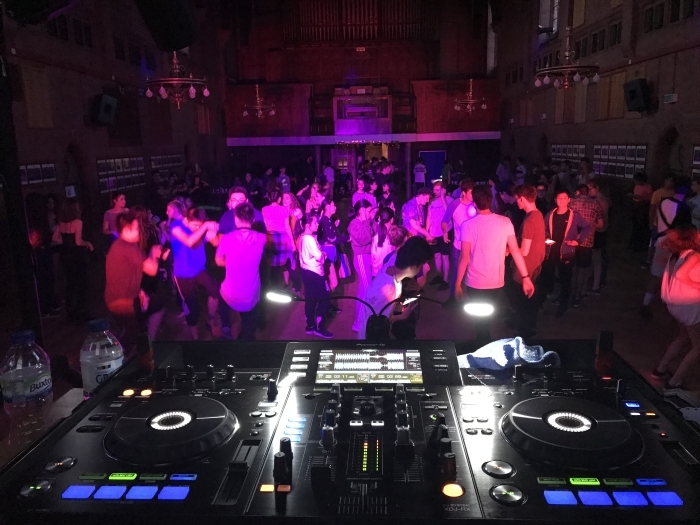 Think I was just busy DJing, I did however take a some photos that you will find below. 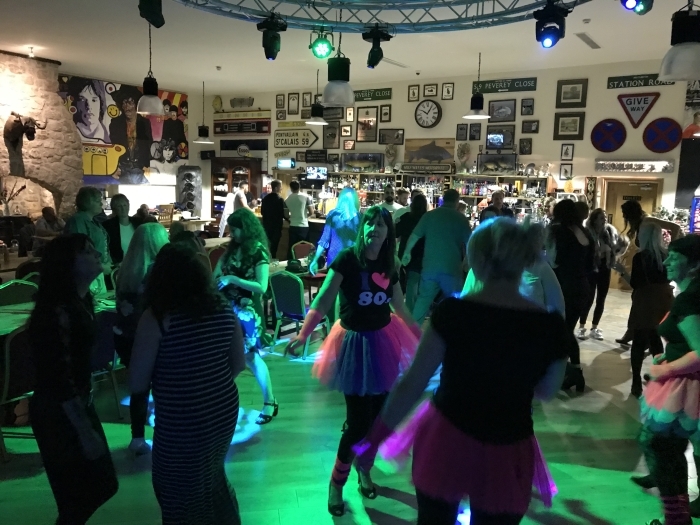 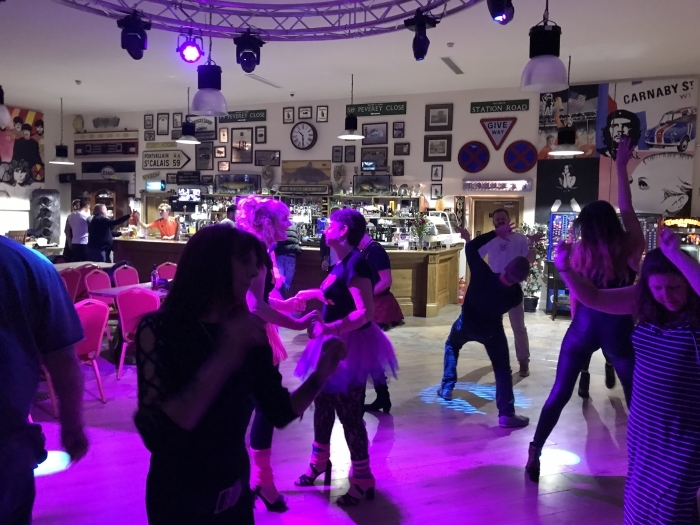 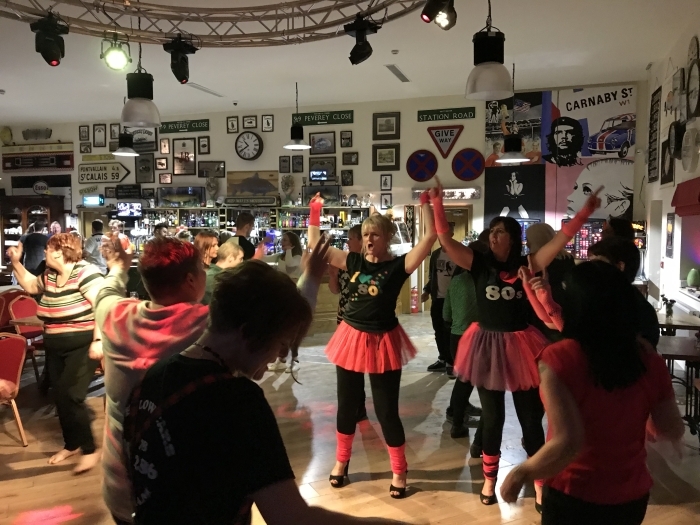 A massive thank you to everyone who went and we are hoping to organise another Back to the 80’s at Weston Village Clubhouse in march 2019. 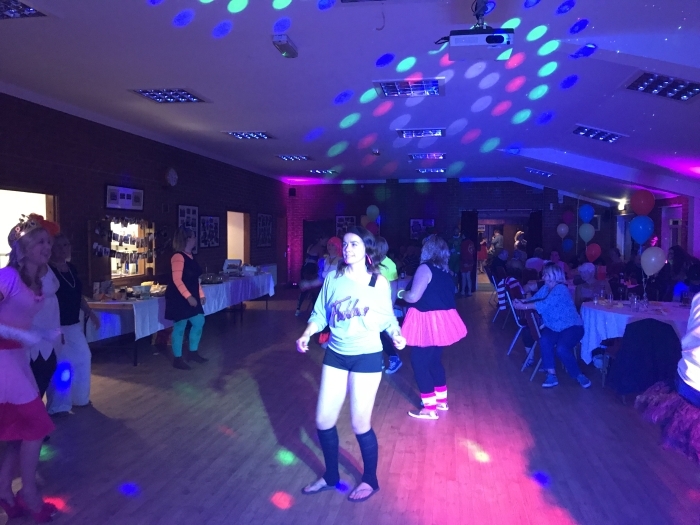 Like the ‘Back to the 80s Events’ or my Facebook page to keep up to date for the date. 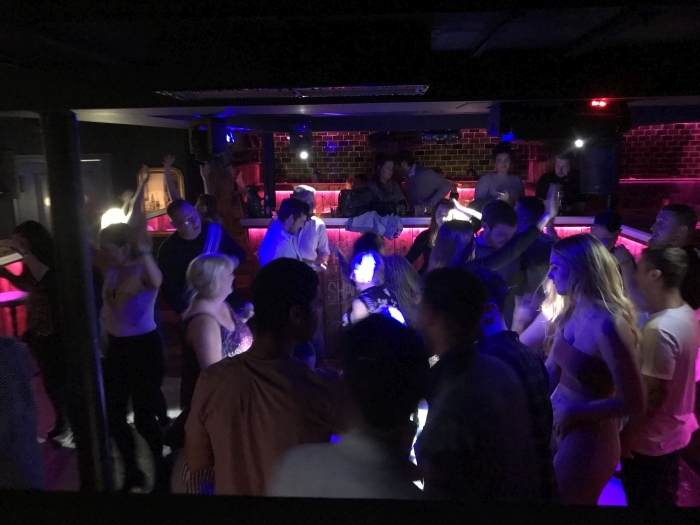 All these photos were take from behind the DJ booth. 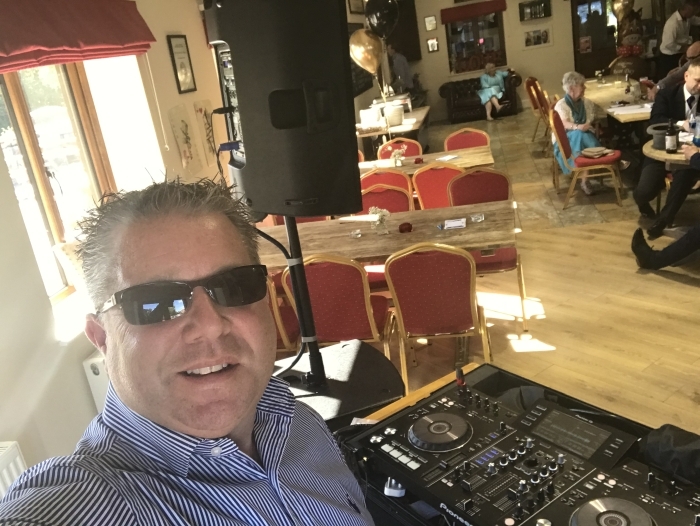 Quick selfie on my phone whilst DJing! 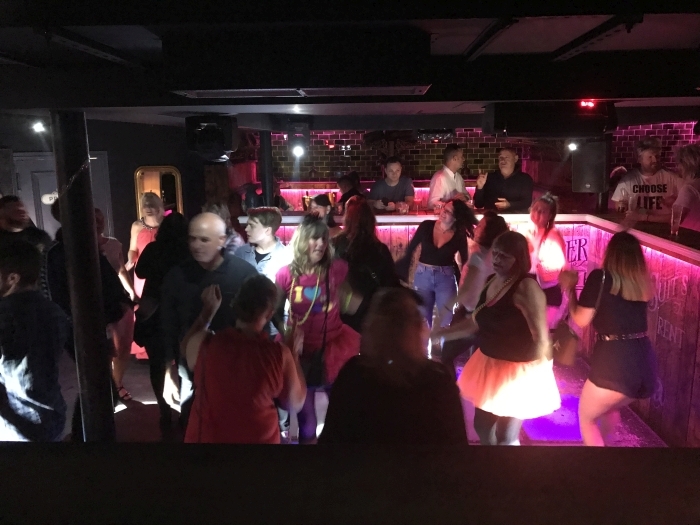 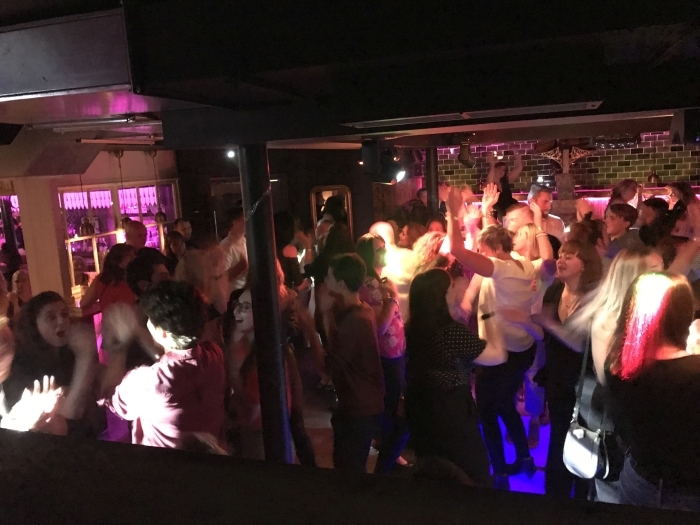 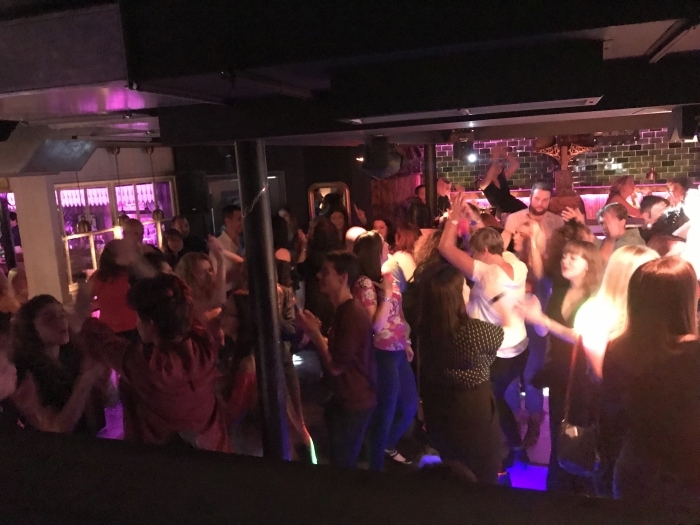 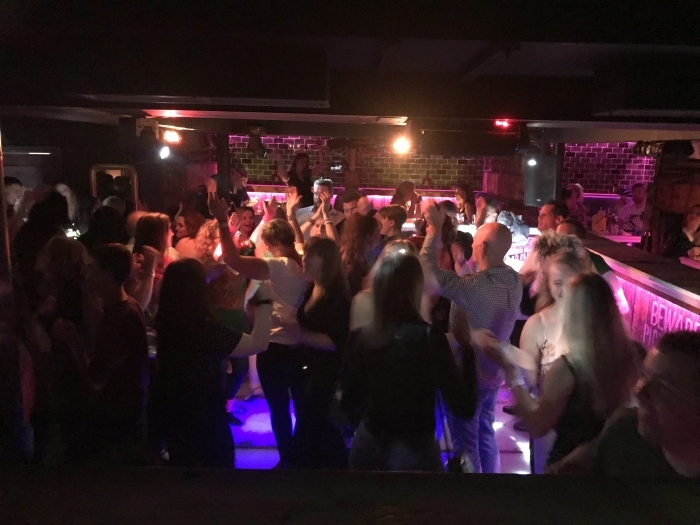 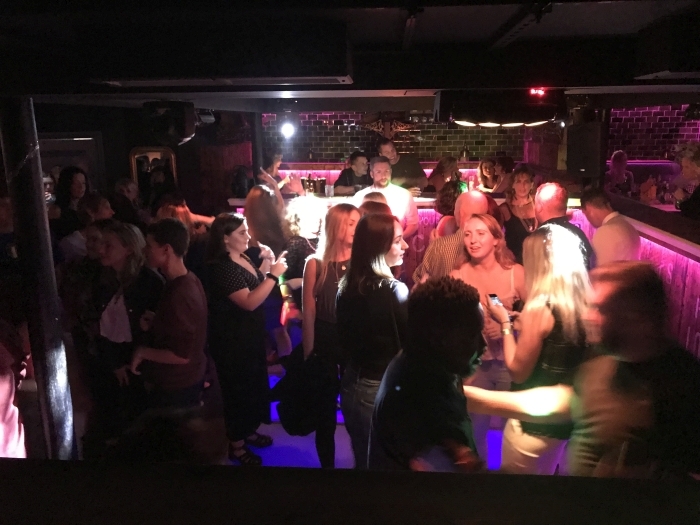 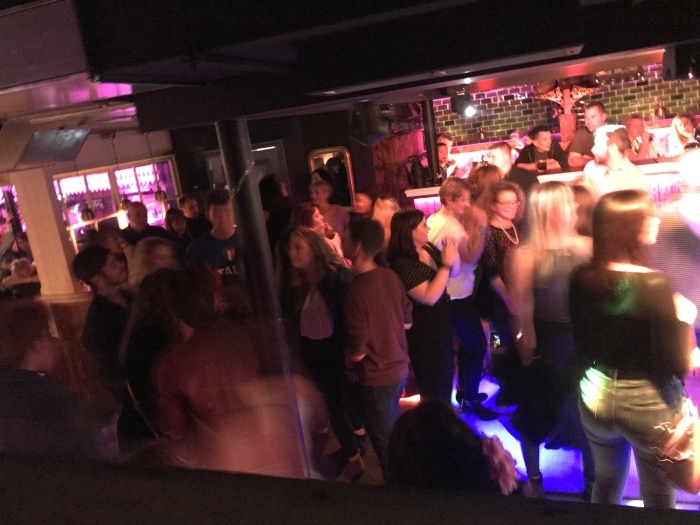 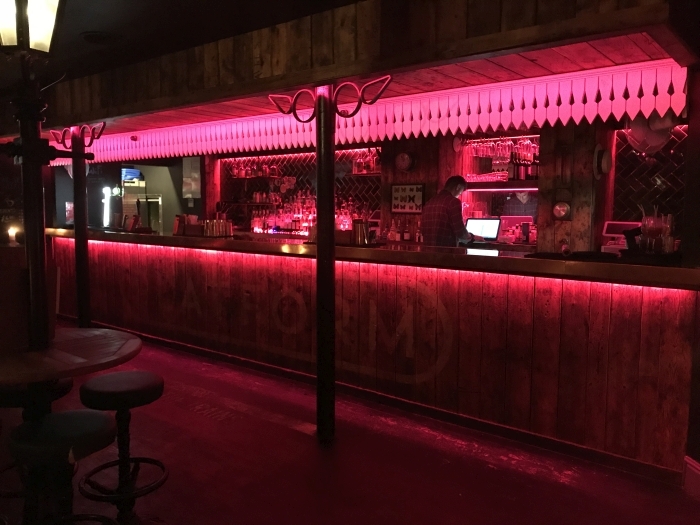 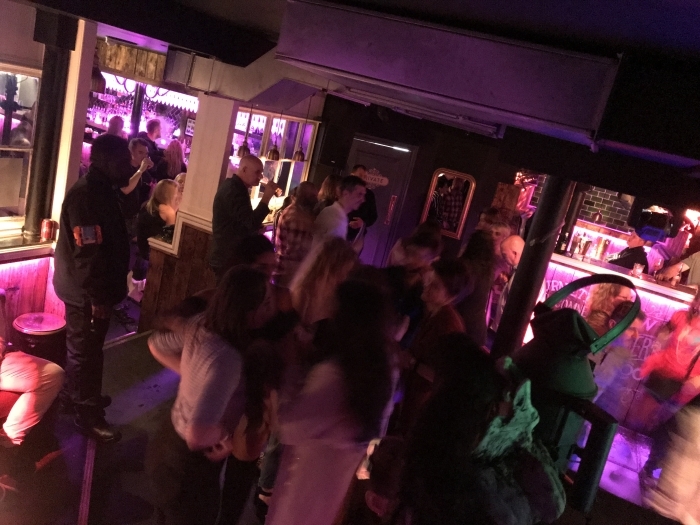 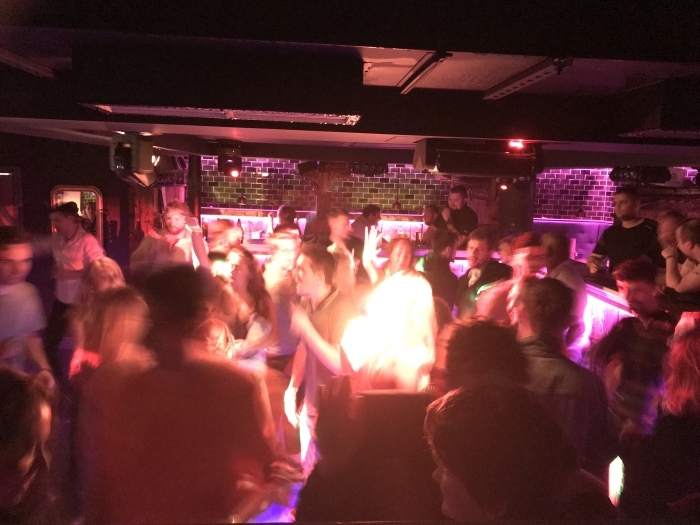 Friday 14th September 2018 was Back to the 80s Night at Platform with me DJ Cheese on the decks all night long! 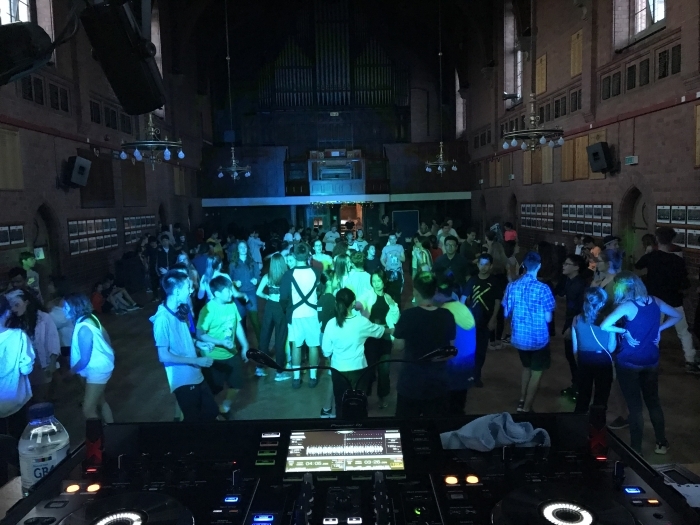 I started my 80s warm -up set at 9pm setting the ambiance and atmosphere for the night moving on to the main set from 11:30pm to 3am. 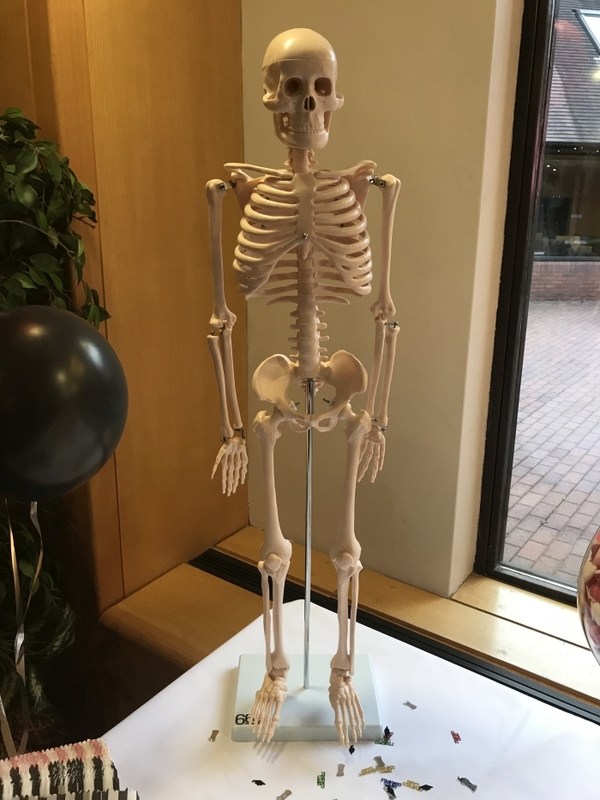 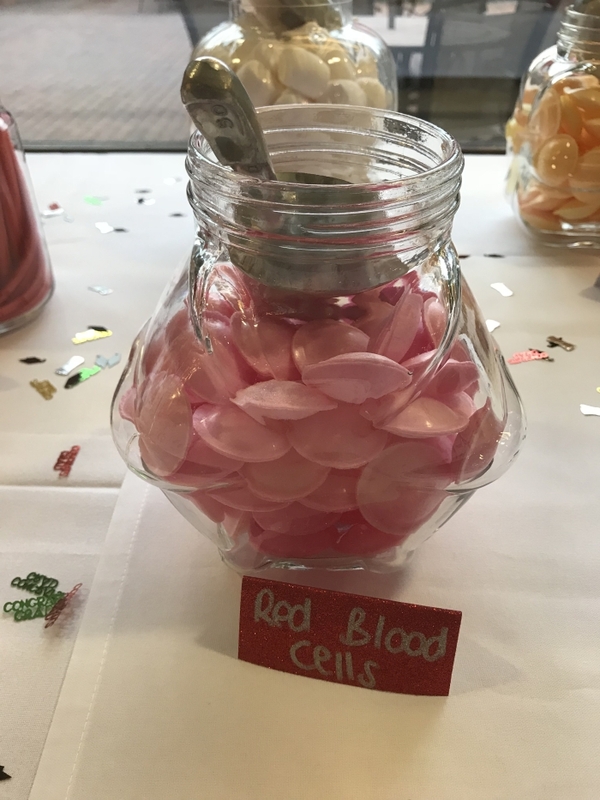 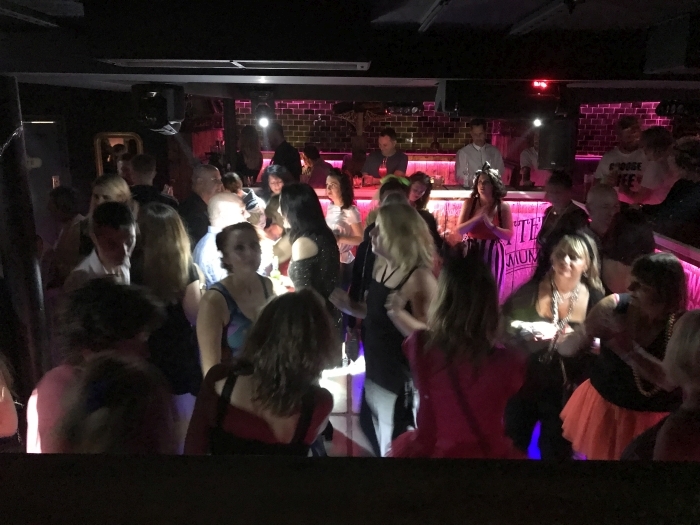 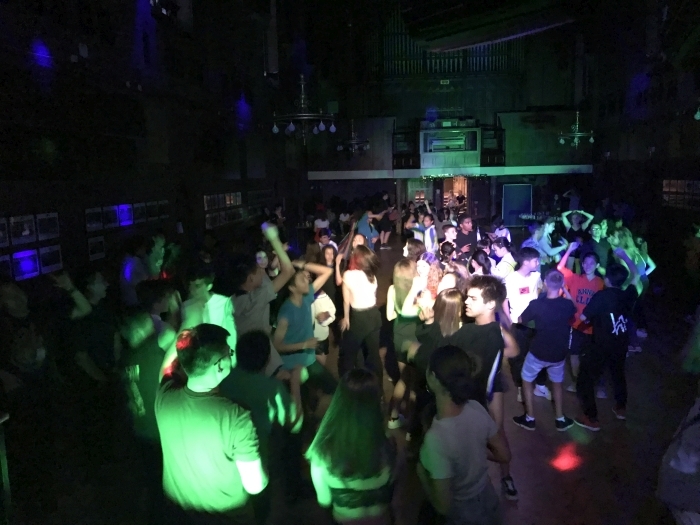 The night was a huge success with almost 300 people attending and having an amazing time, as you can see from the pictures and videos it’s an event you won’t want to miss in the future! 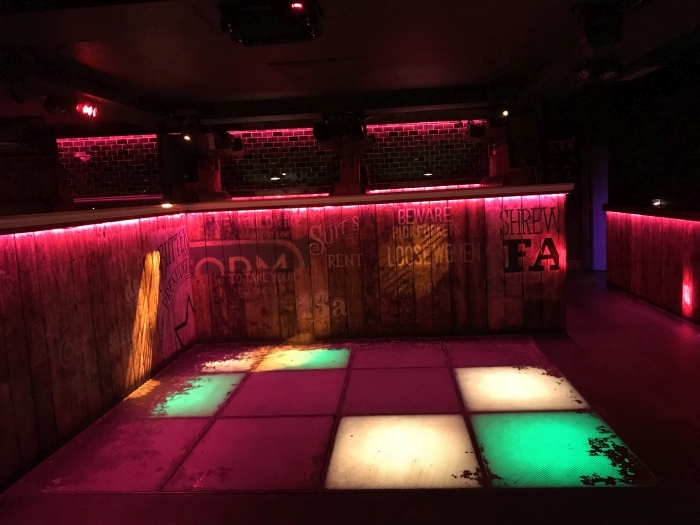 Look out for the next Back to the 80s date at Platform which will be announced shortly! 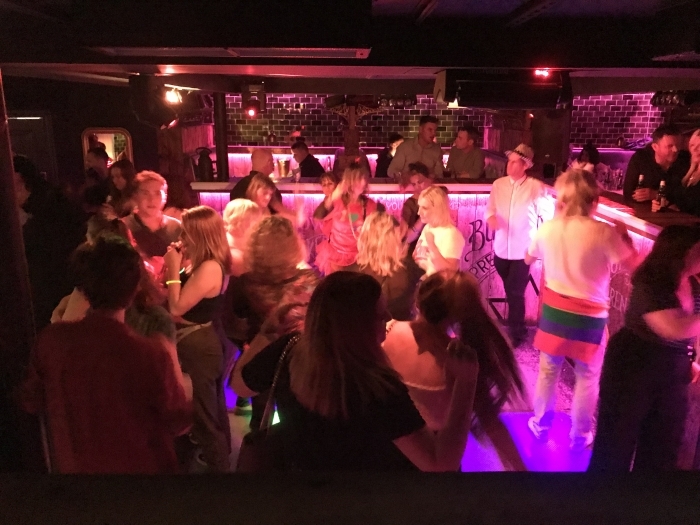 Check out www.Backtothe80sevents.uk website. 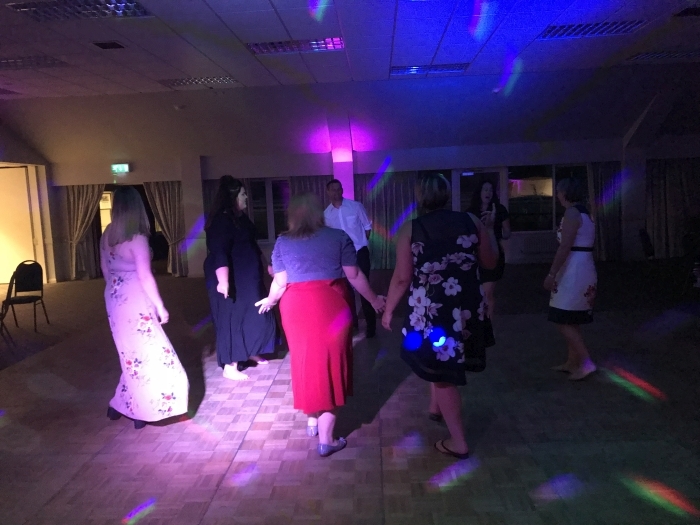 During the evening I took a couple of videos and so did a few others who attended. 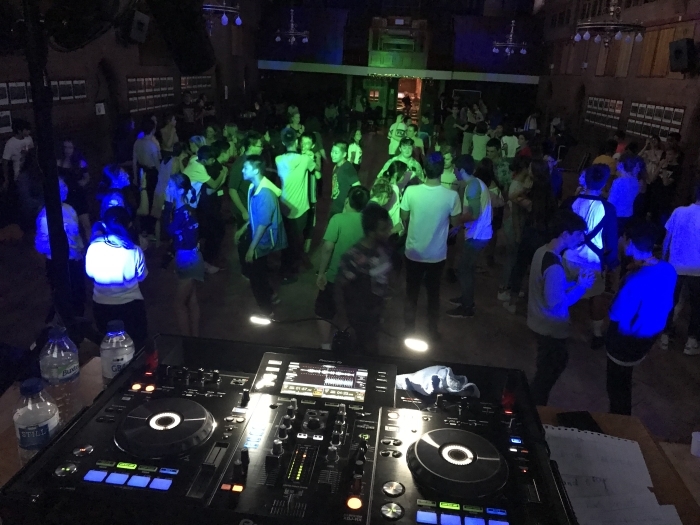 During the evening I took few pictures of the dance floor from the DJ booth. 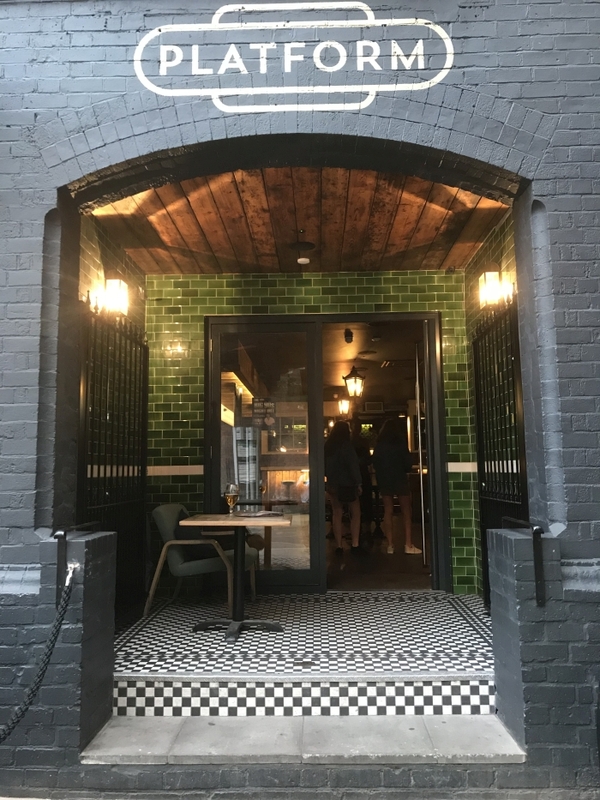 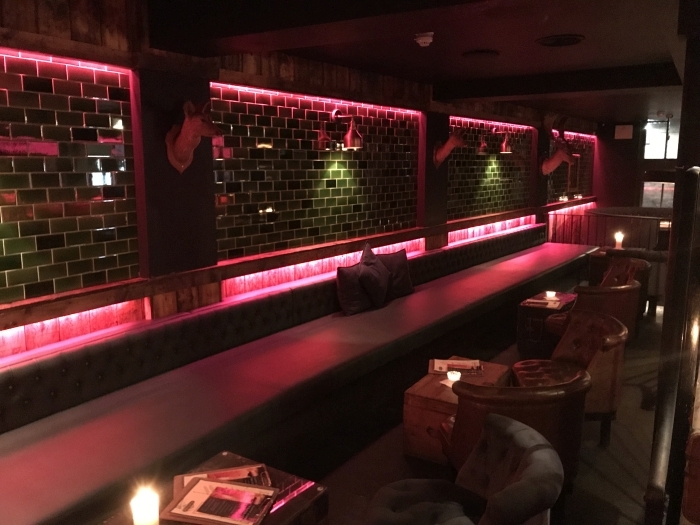 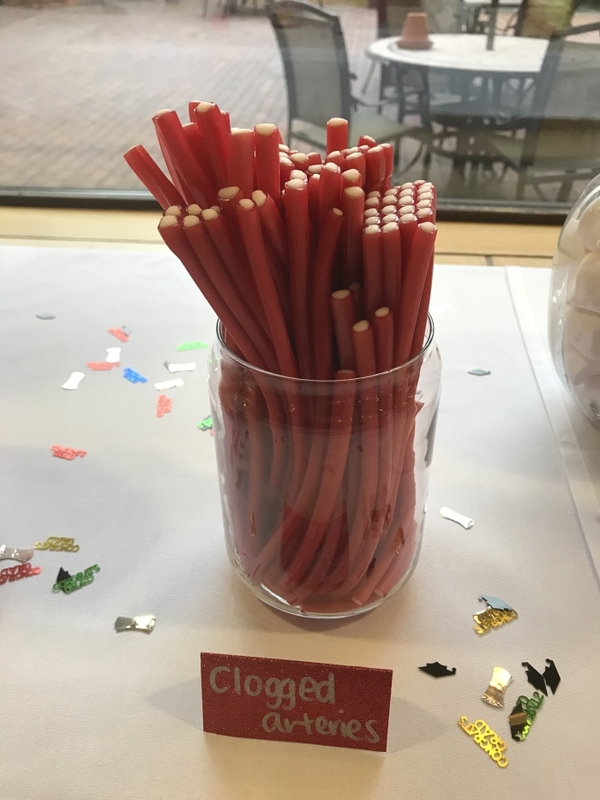 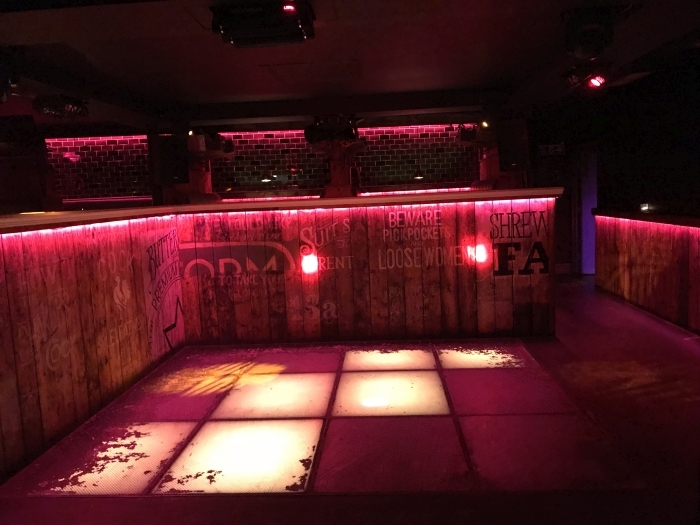 The venue had was able to checnge the colour scheme to fit out brand and theme and it looked amazing! 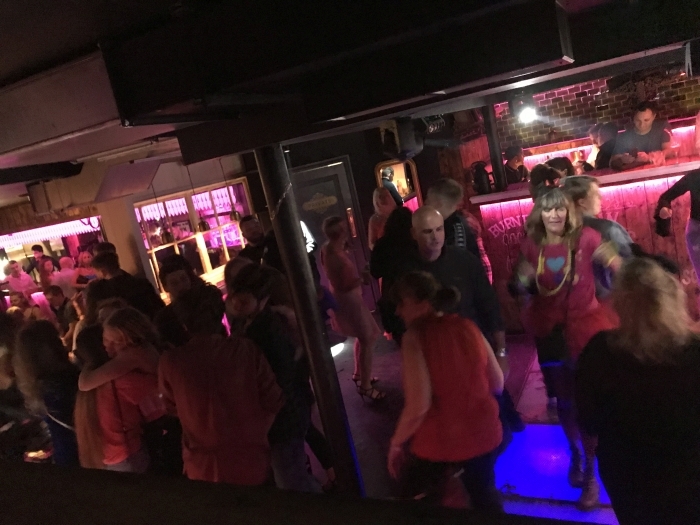 This is one of my favourite images from the Back to the 80s Night at Platform Shrewsbury. 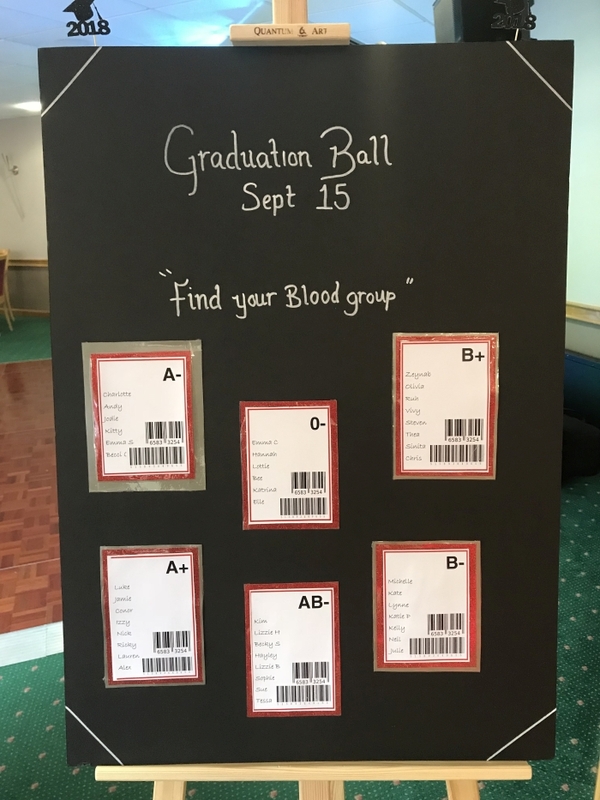 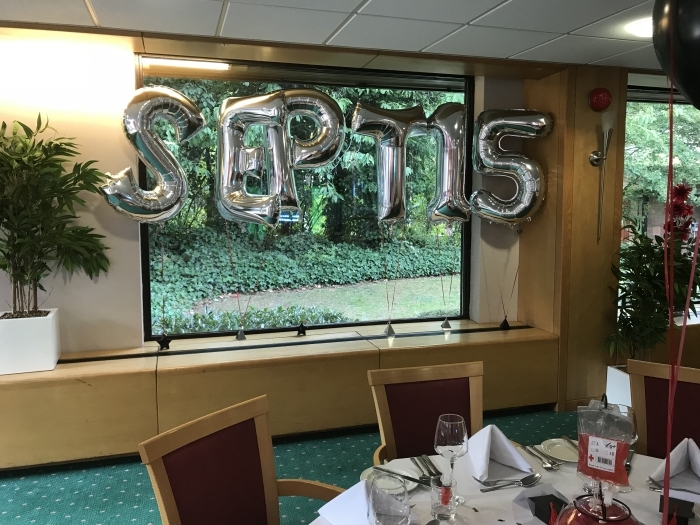 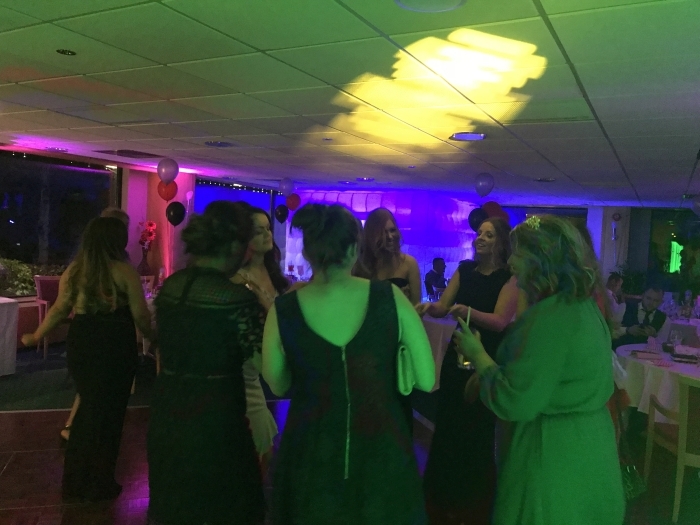 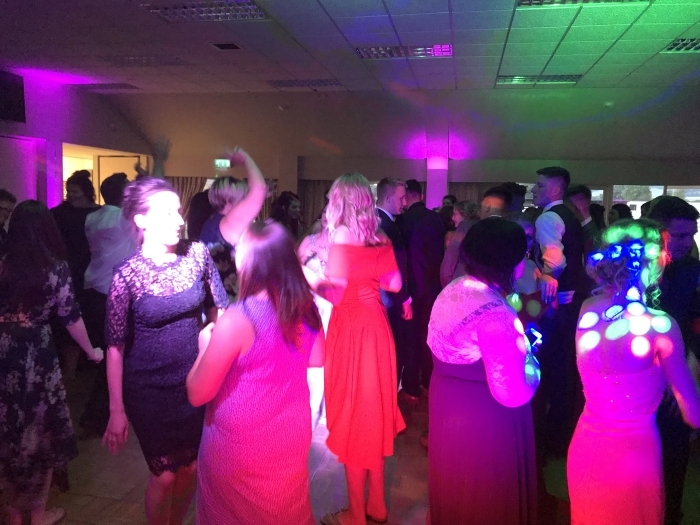 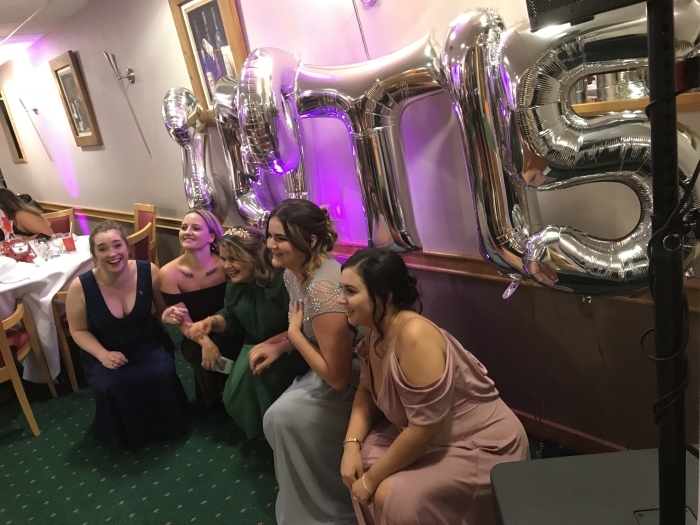 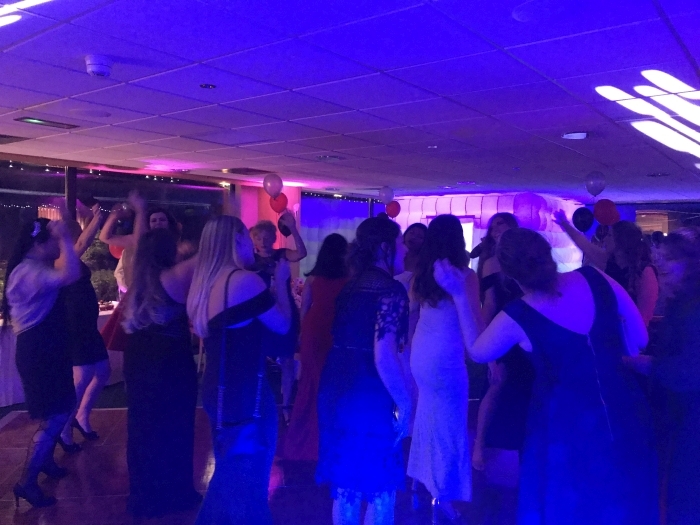 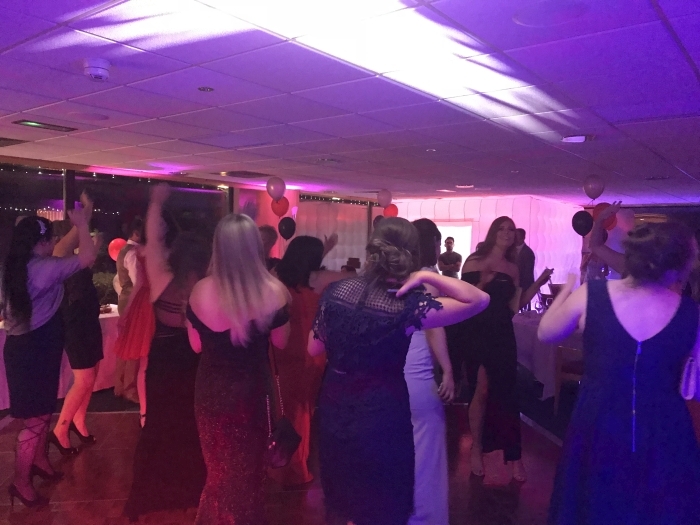 Friday 7th September 2018 was the Graduation Ball Disco for the latest group of Shropshire’s fantastic Nurses. 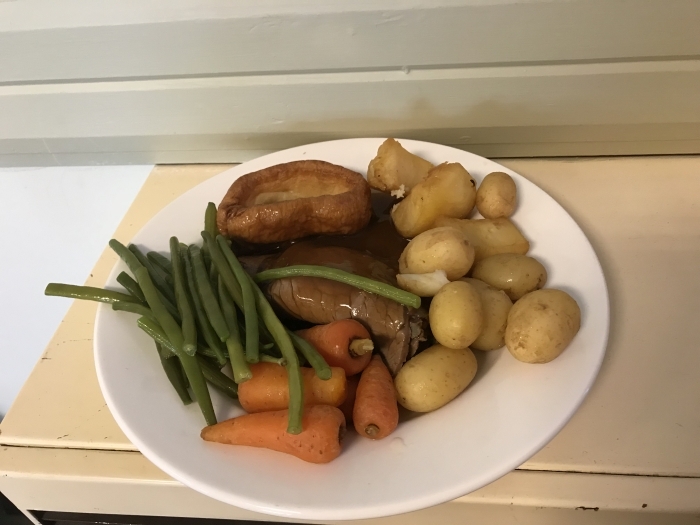 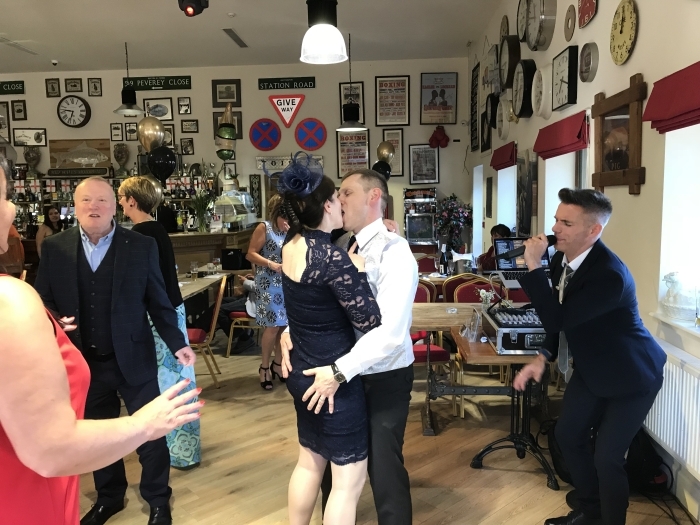 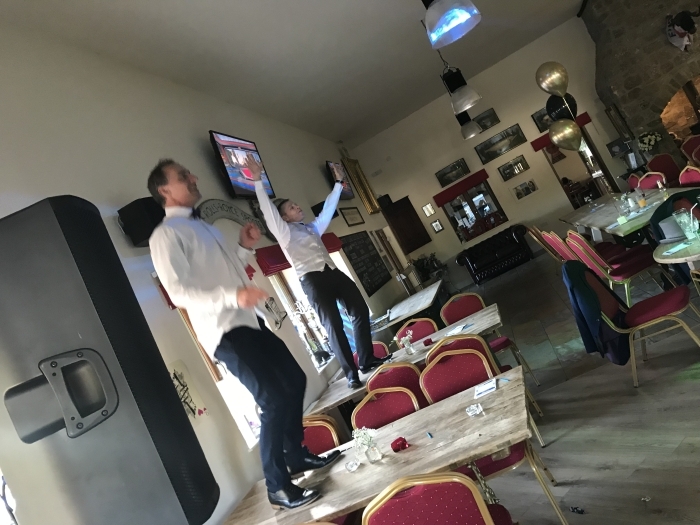 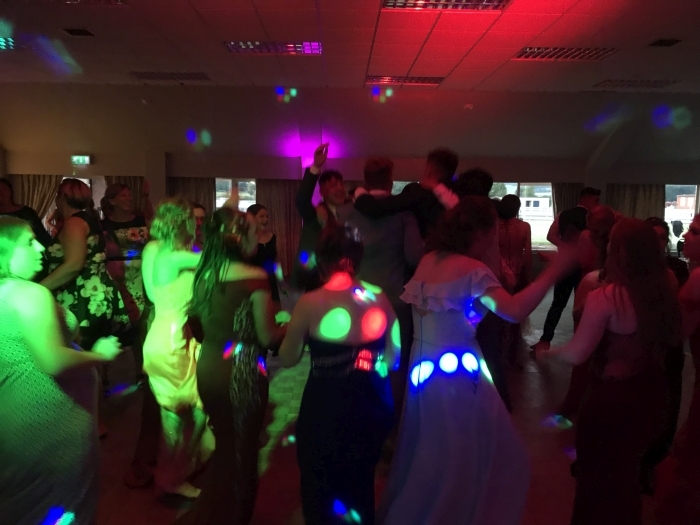 I was asked to provide the music for the evening with starting with upbeat background music from 6:30pm and following their meal and speech the main disco through to midnight. 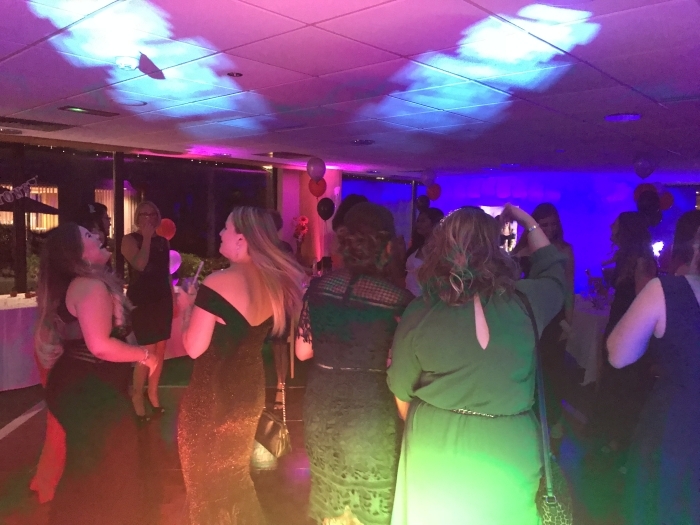 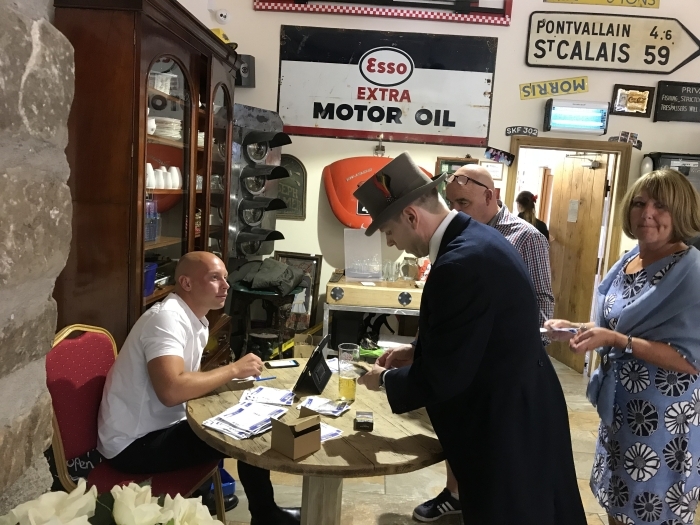 This really was a fantastic event with special themed extras around the room, three course meal, a photo booth and one of my amazing lighting setups. 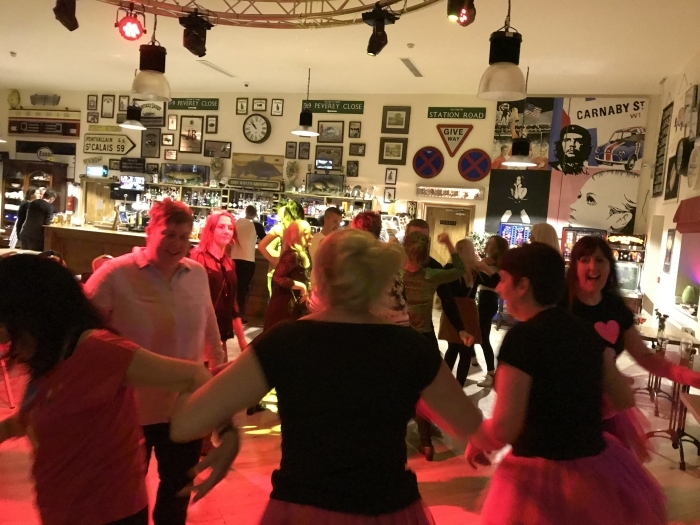 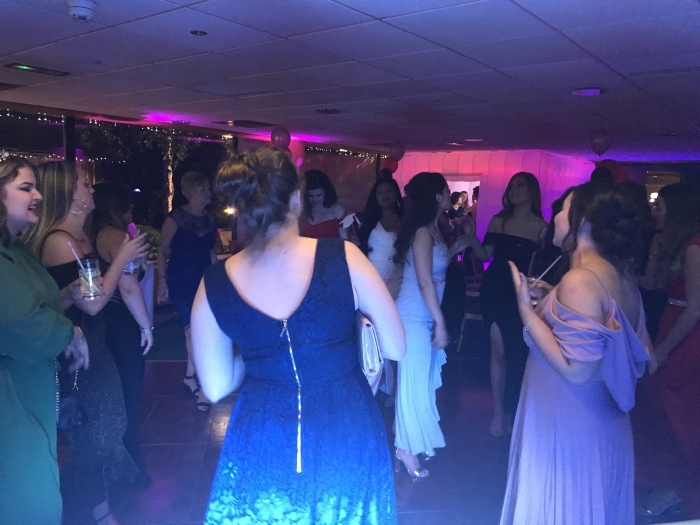 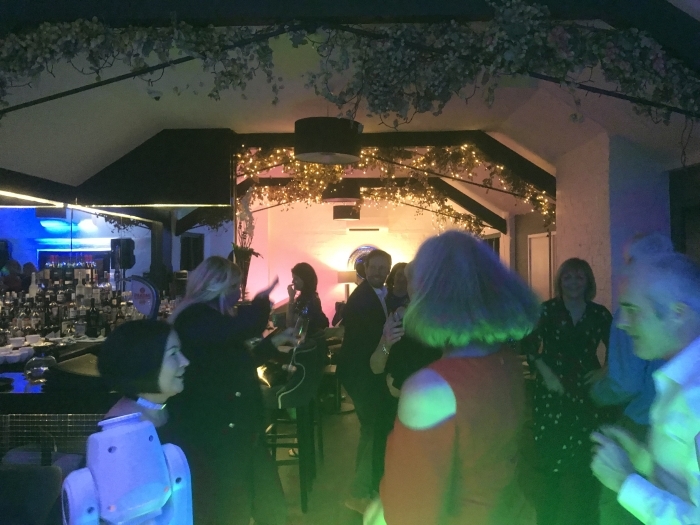 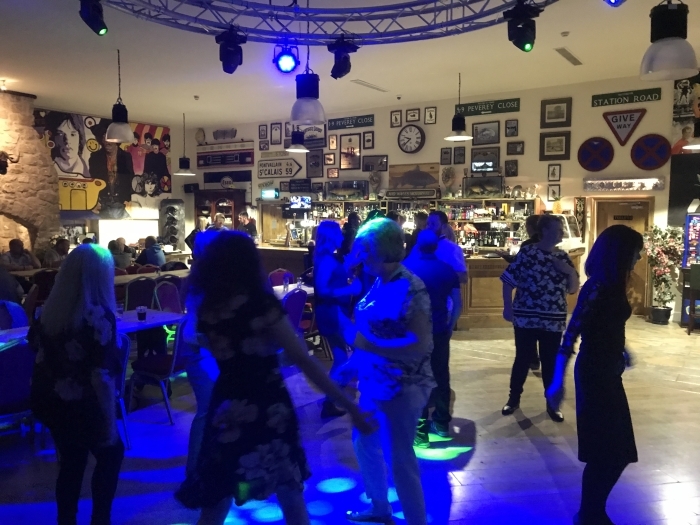 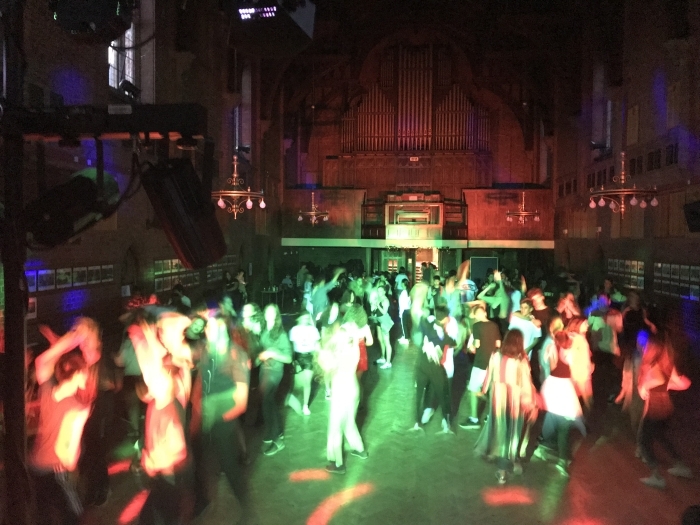 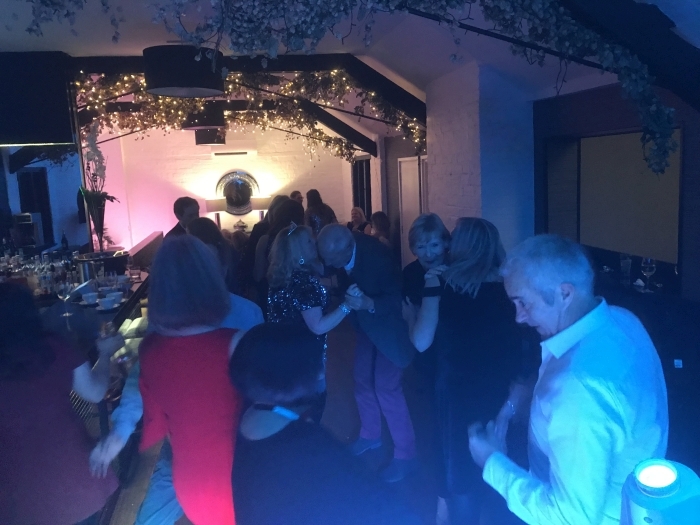 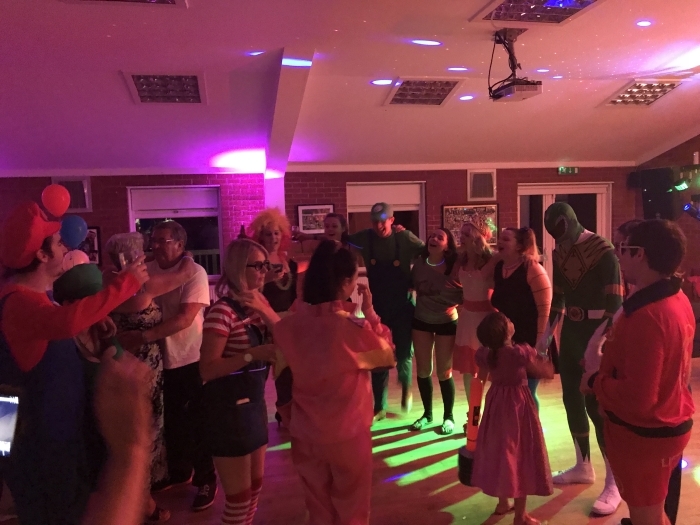 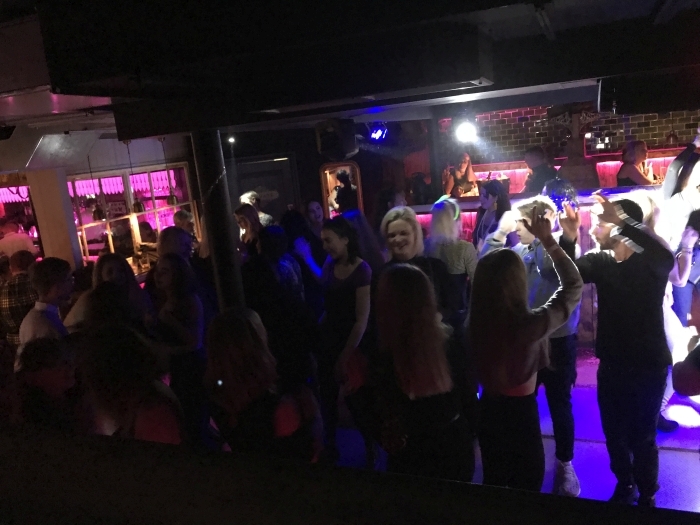 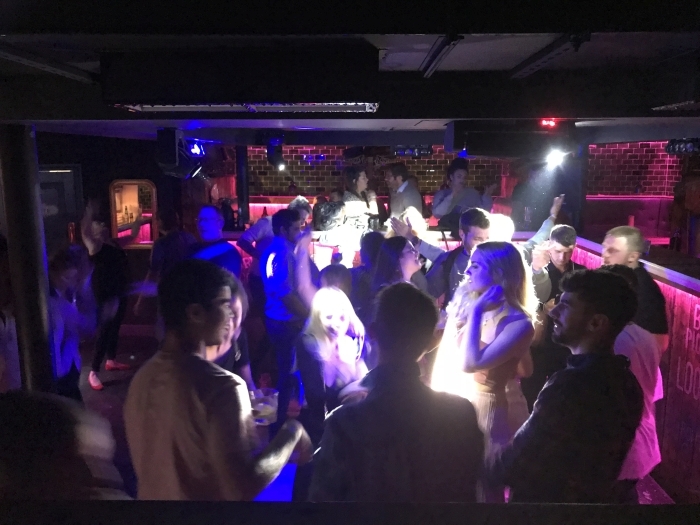 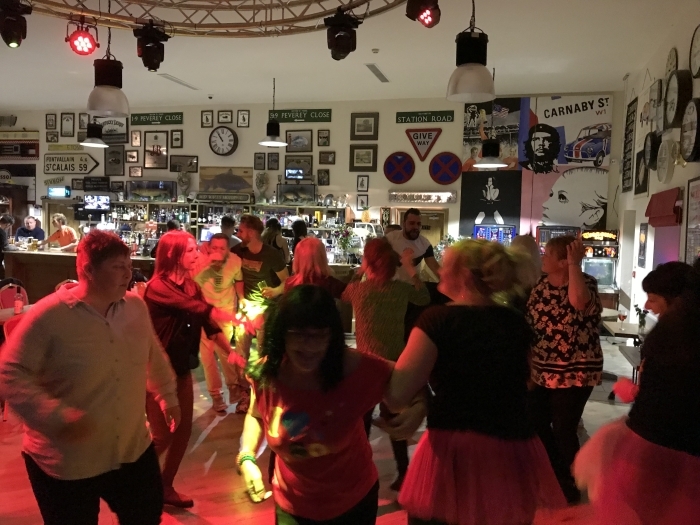 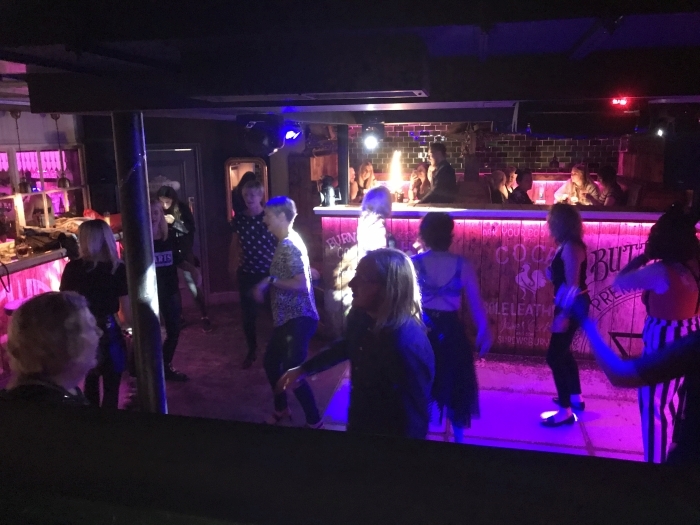 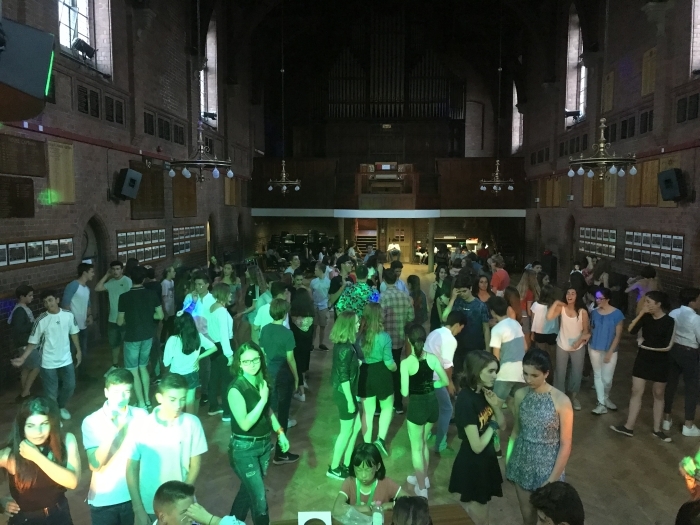 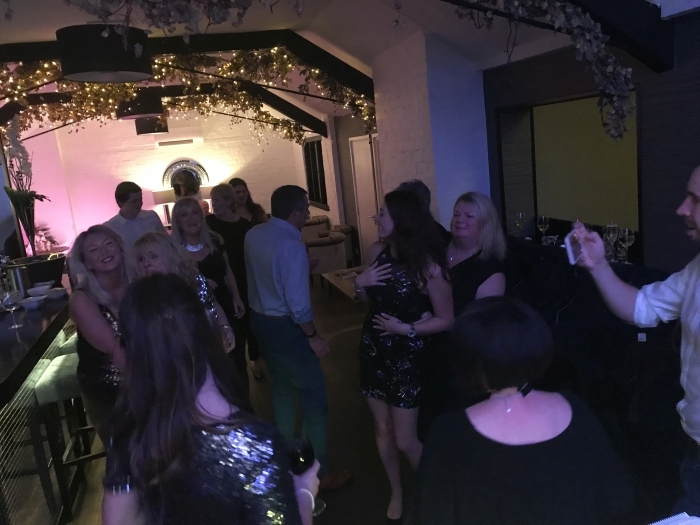 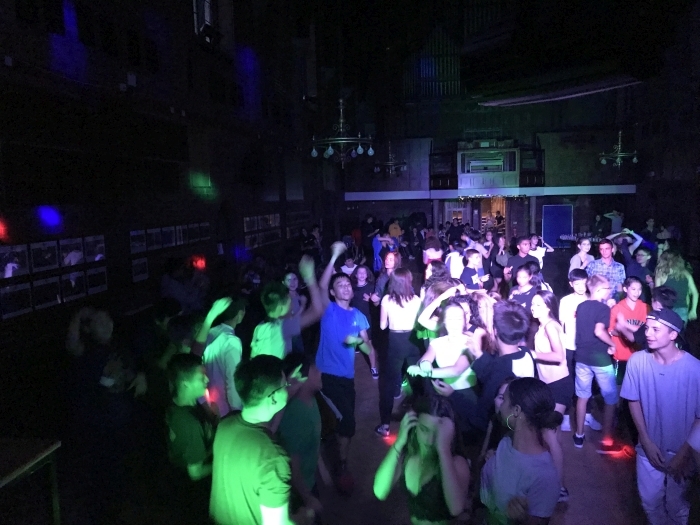 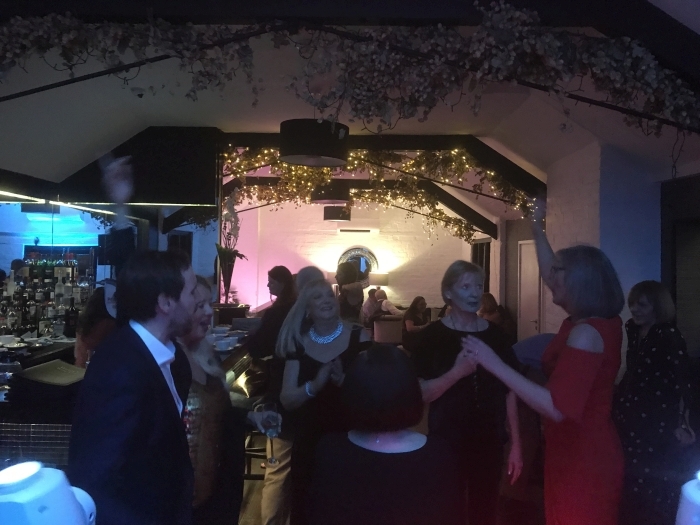 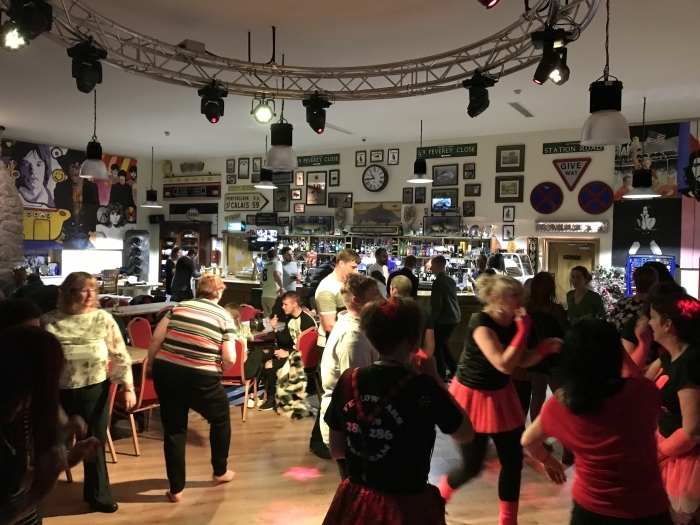 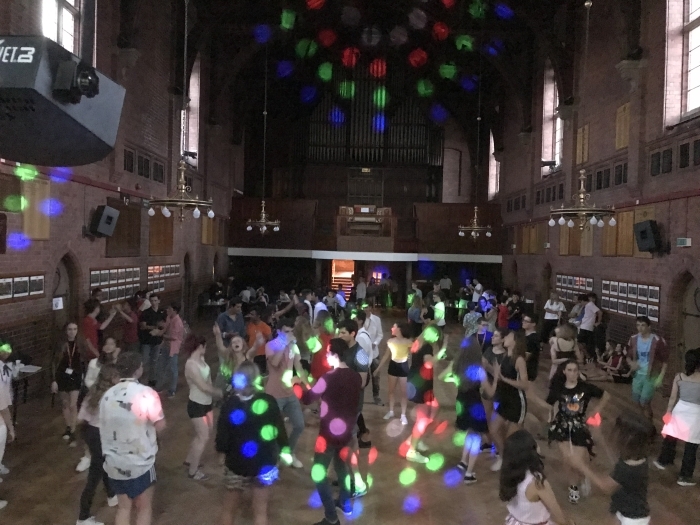 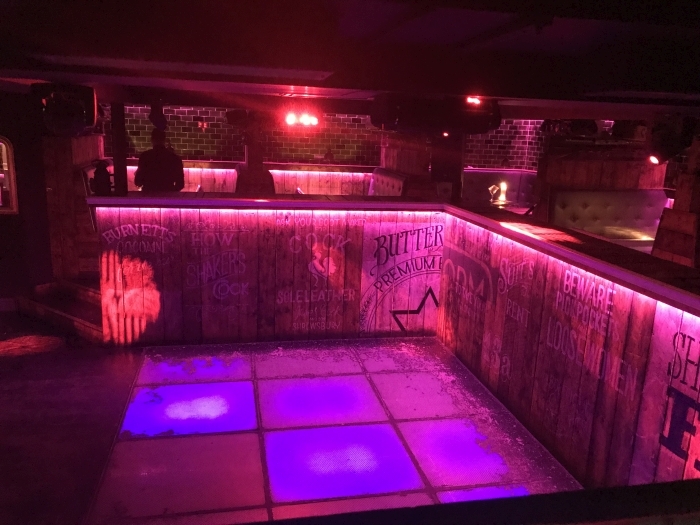 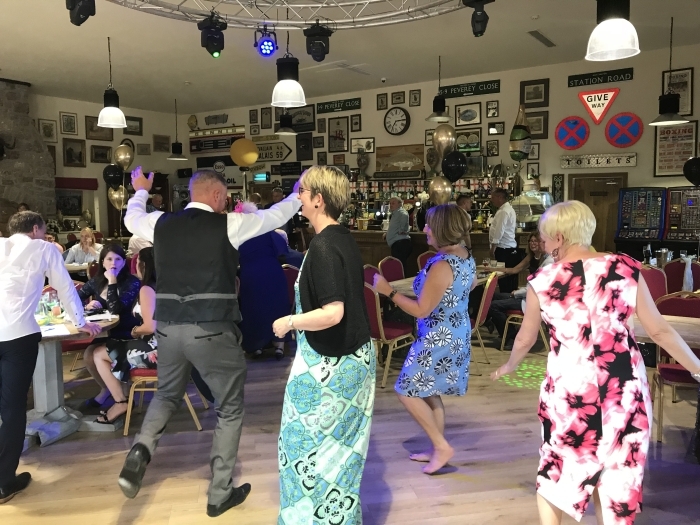 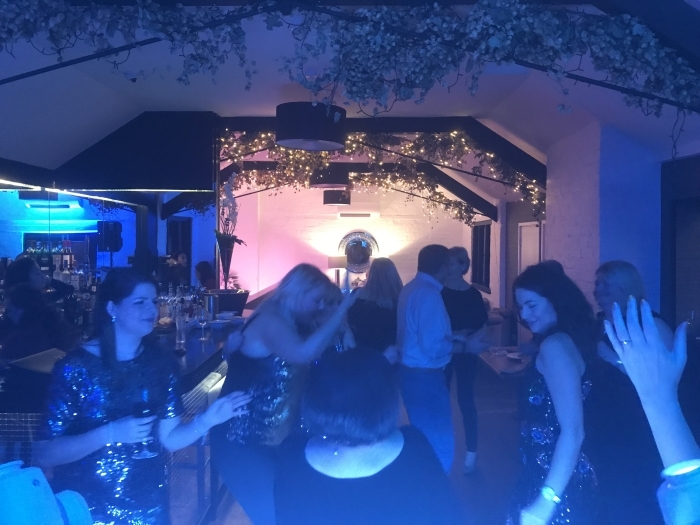 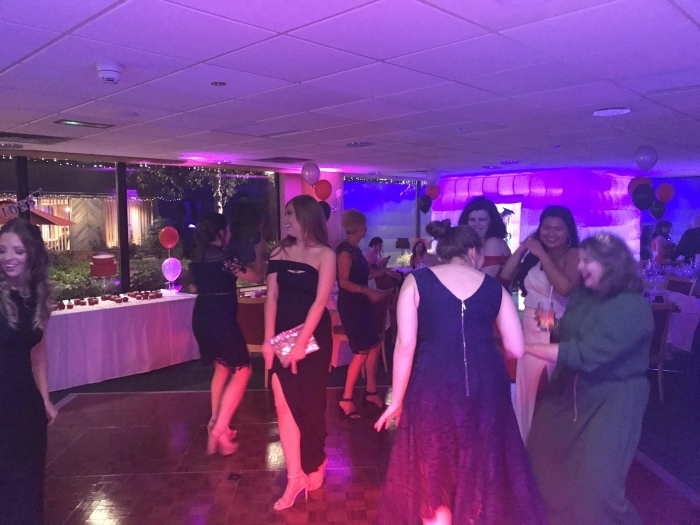 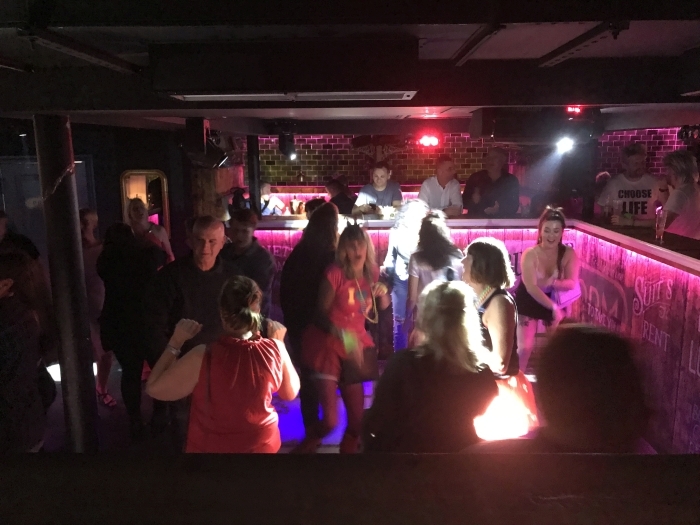 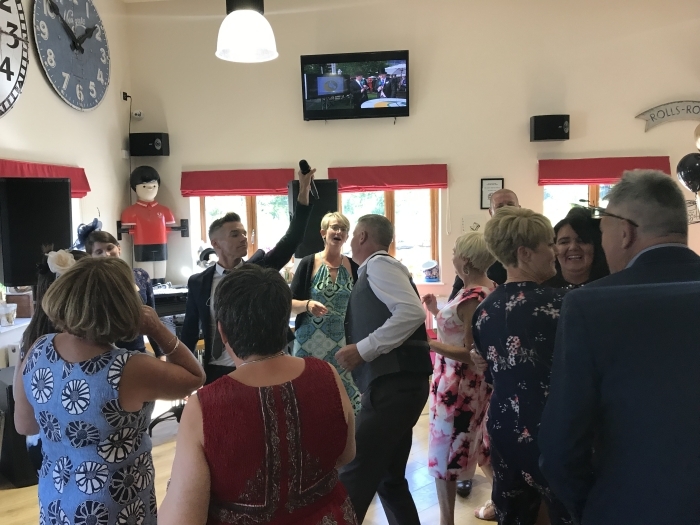 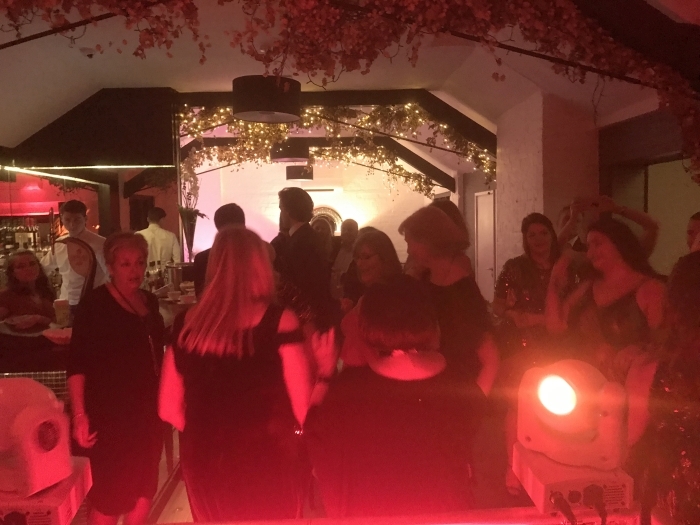 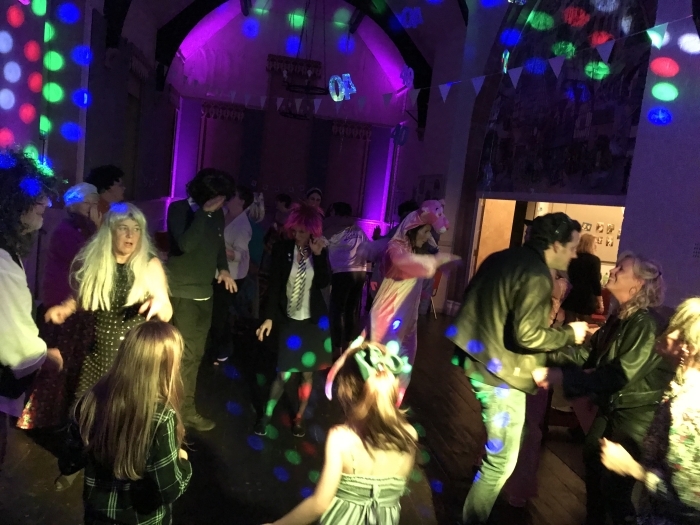 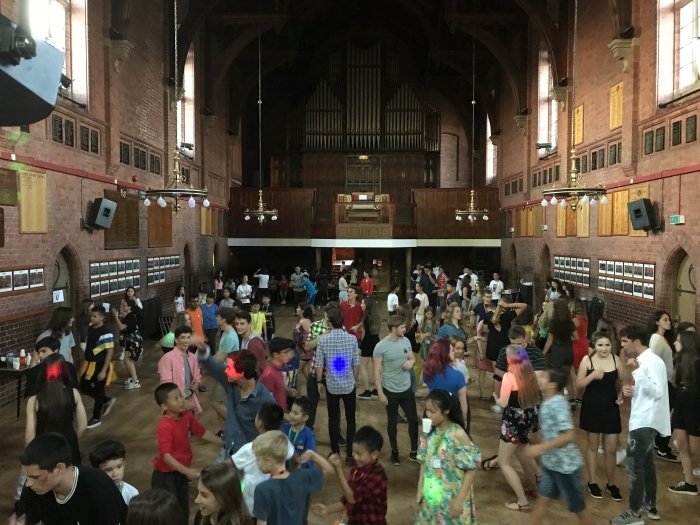 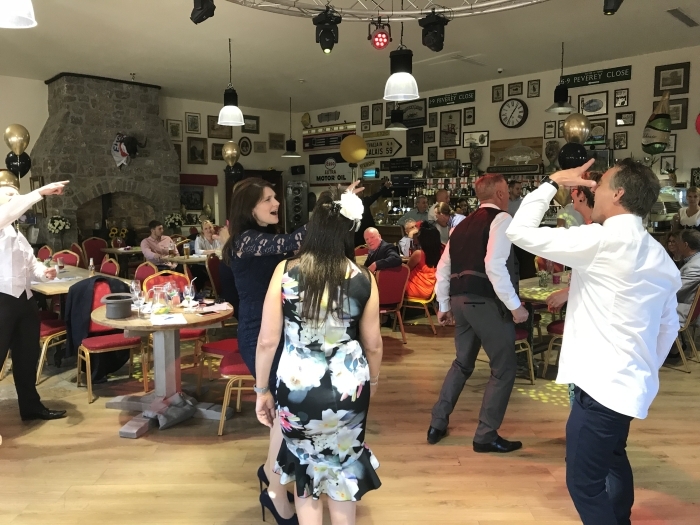 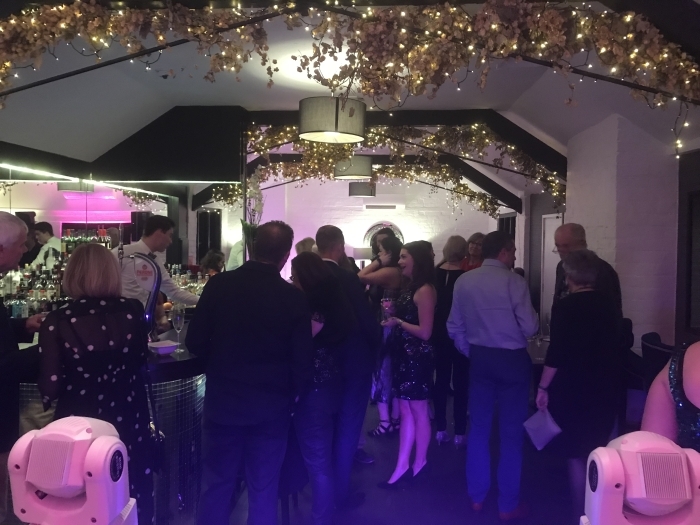 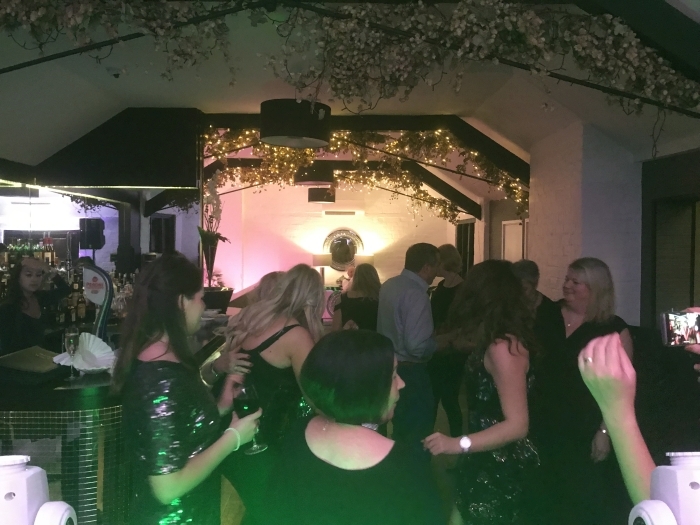 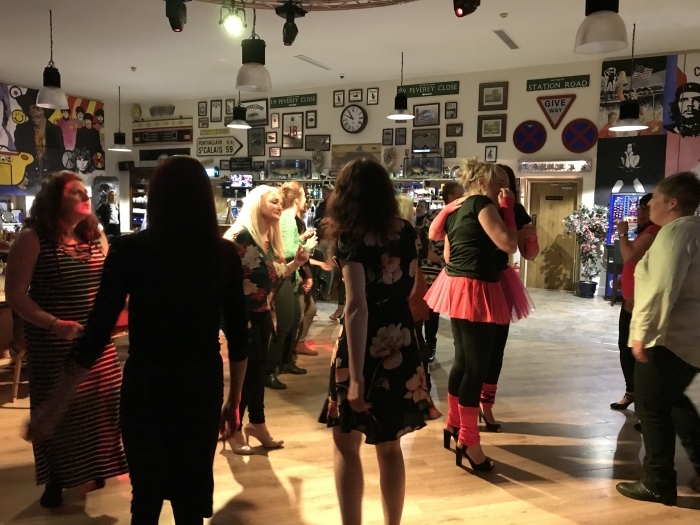 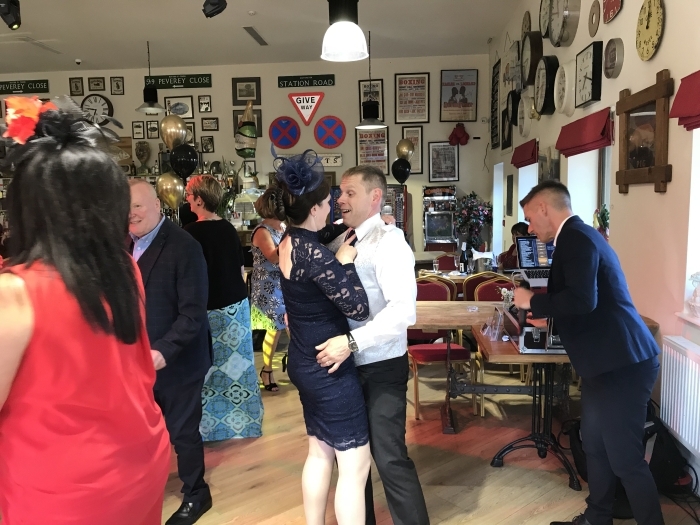 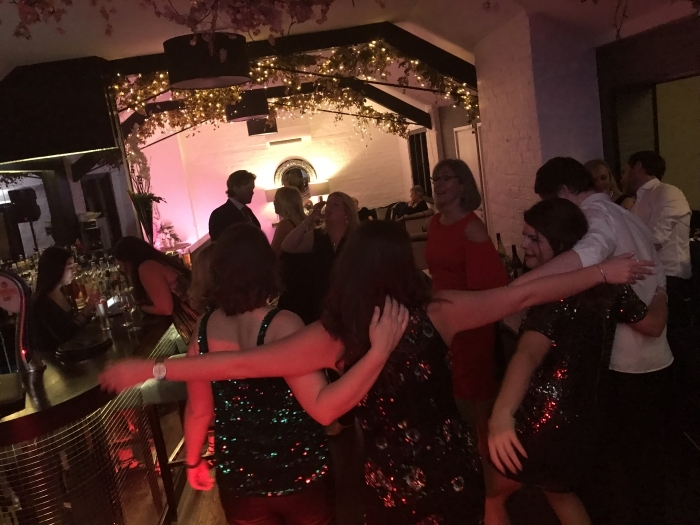 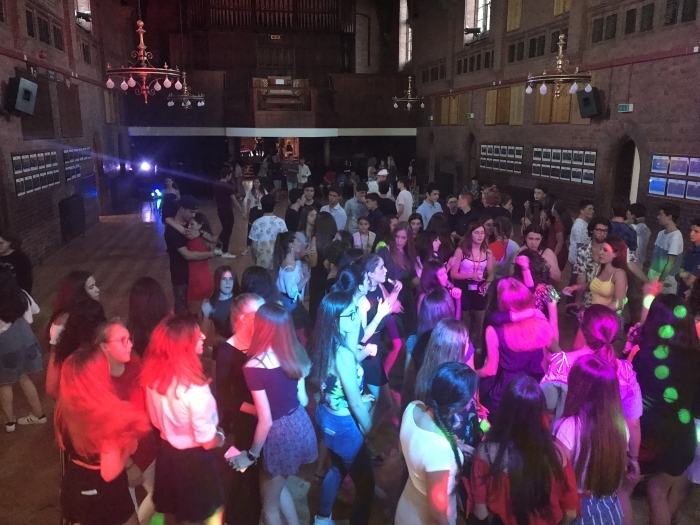 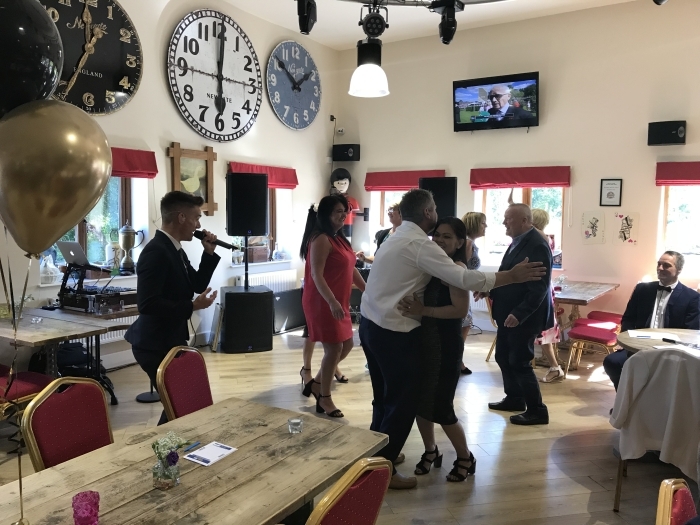 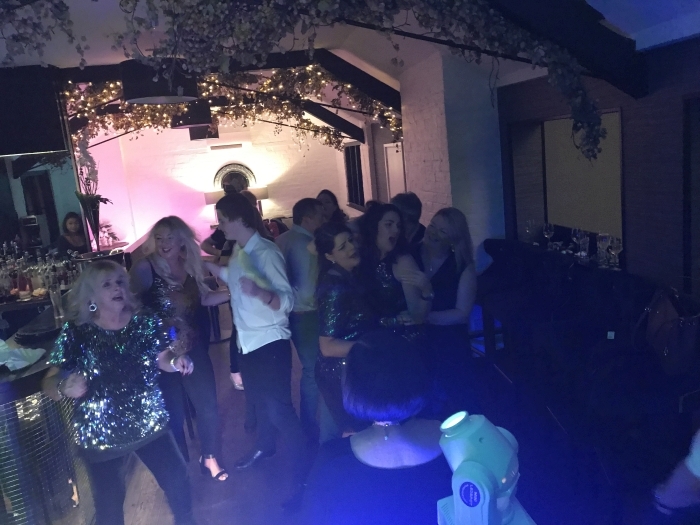 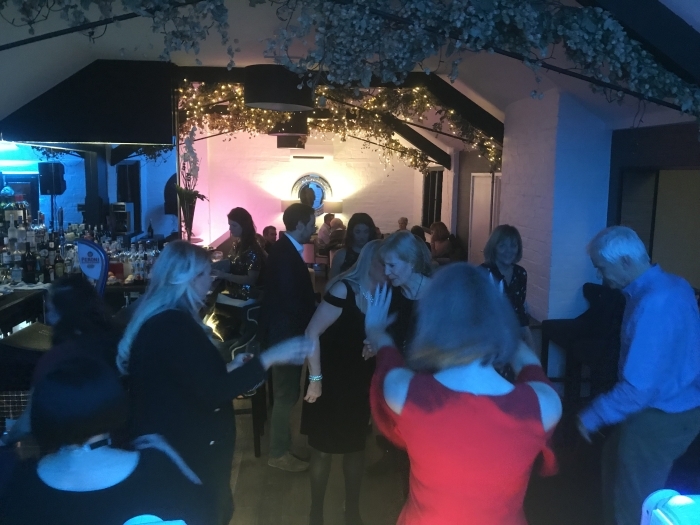 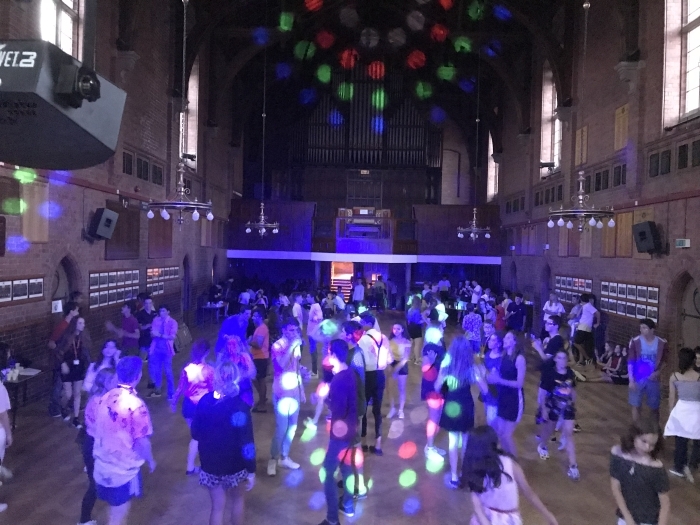 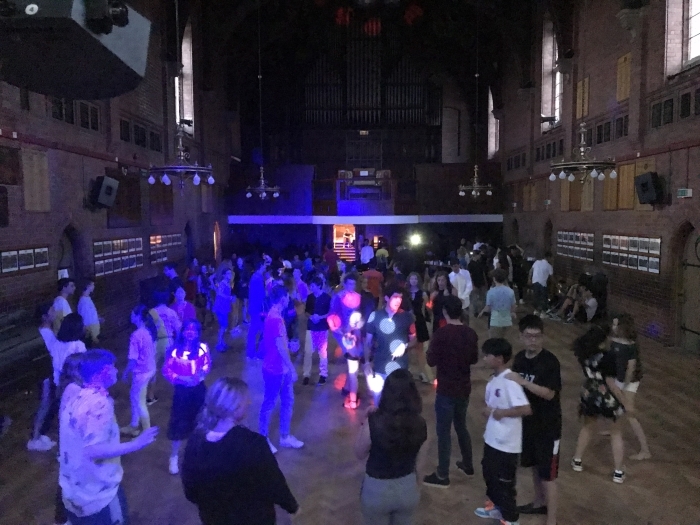 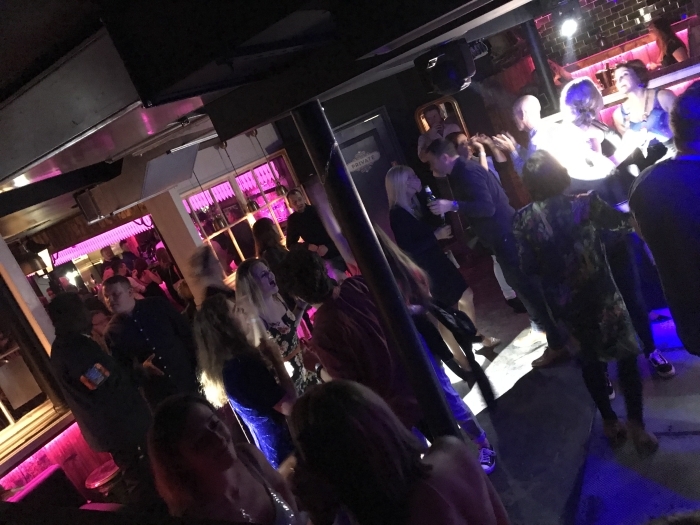 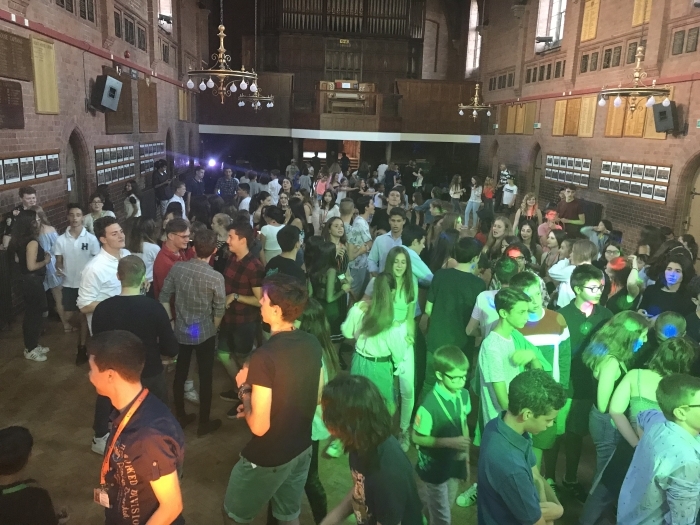 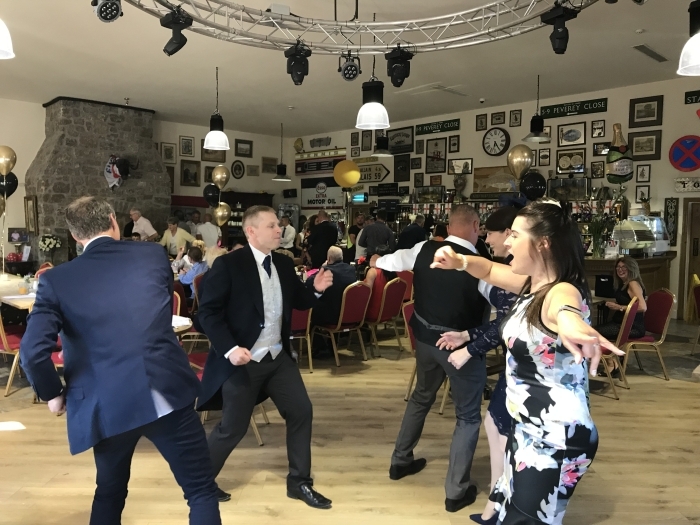 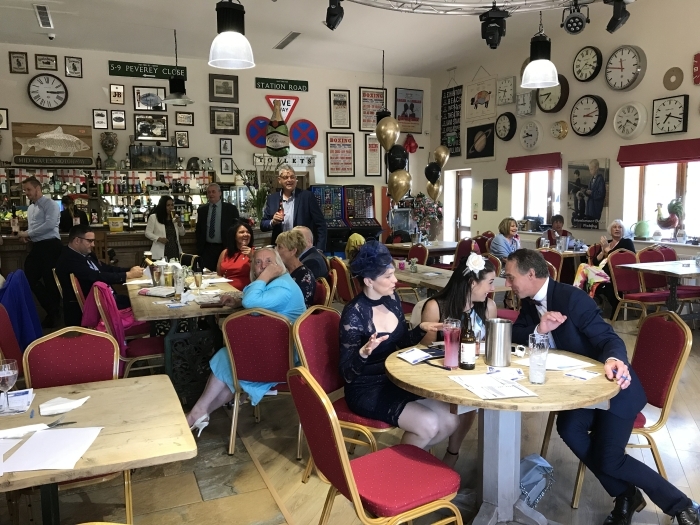 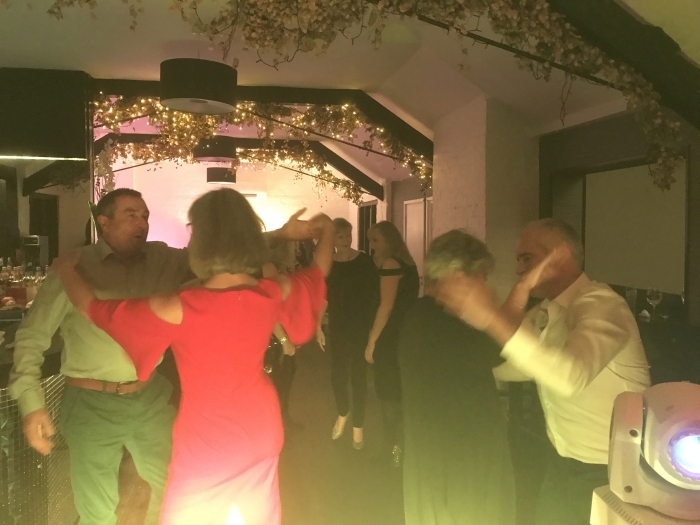 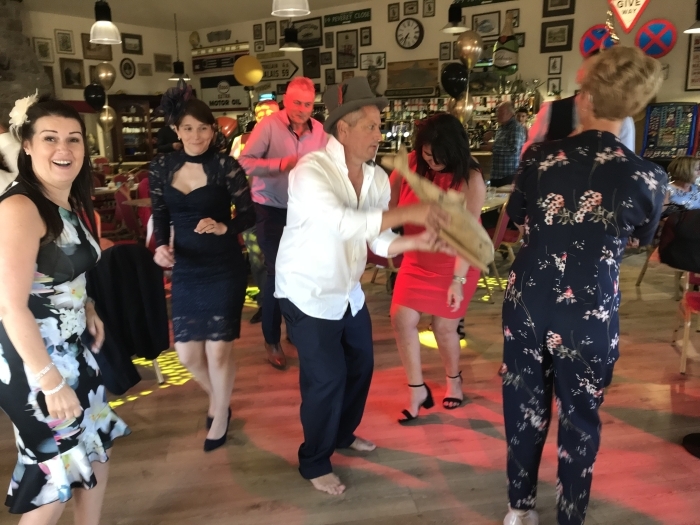 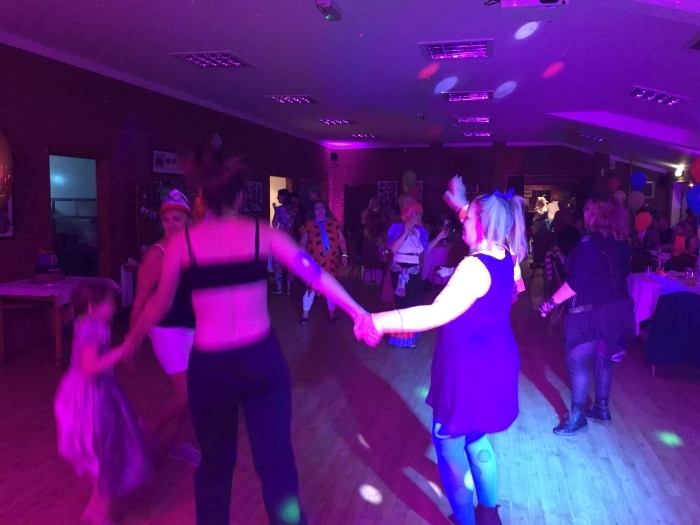 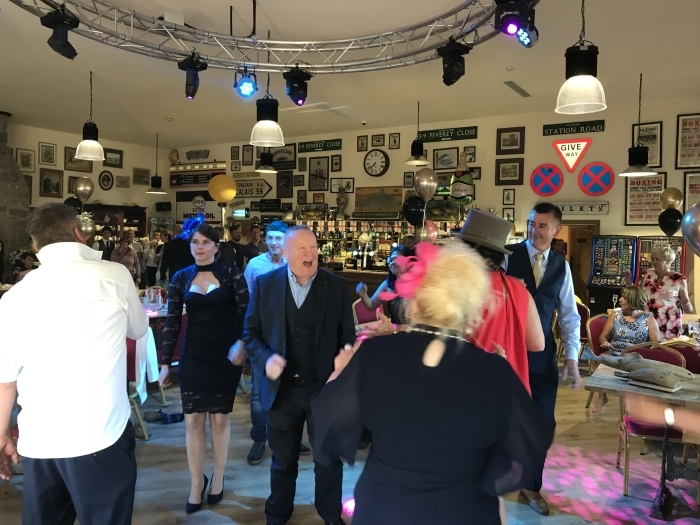 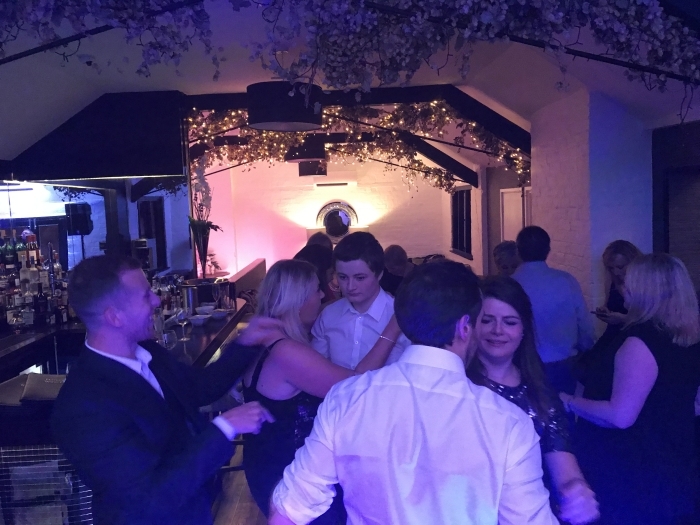 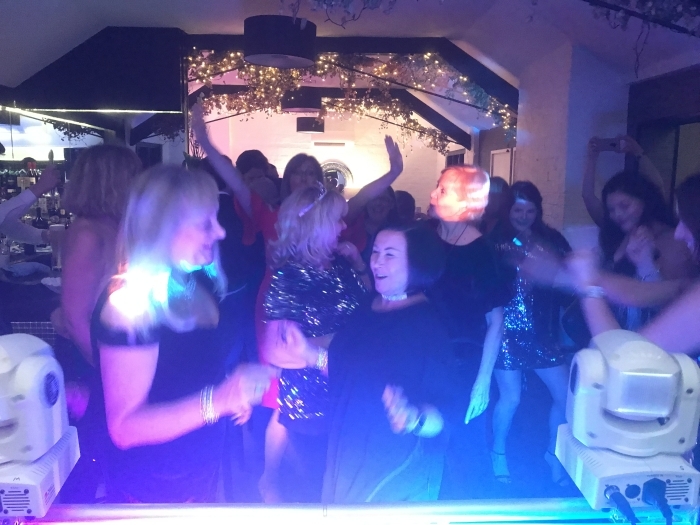 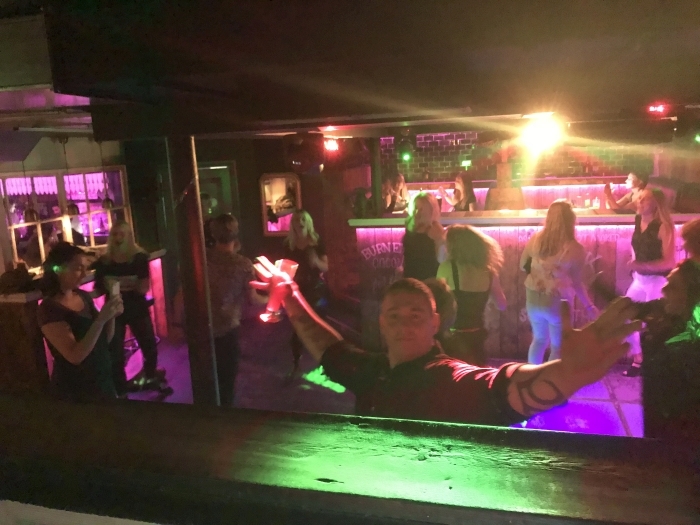 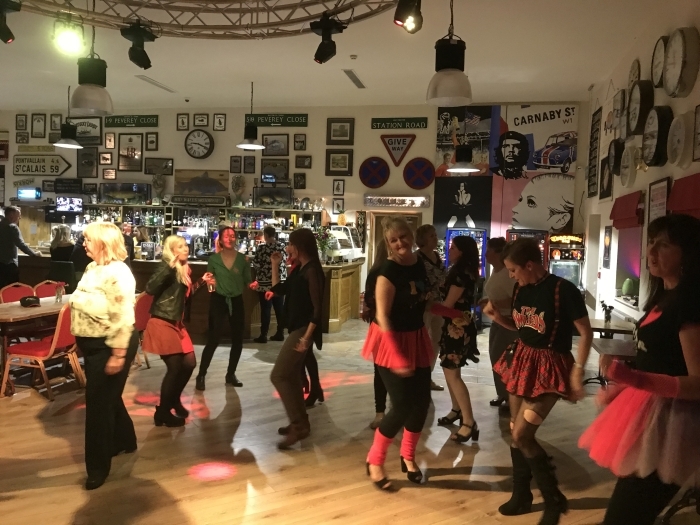 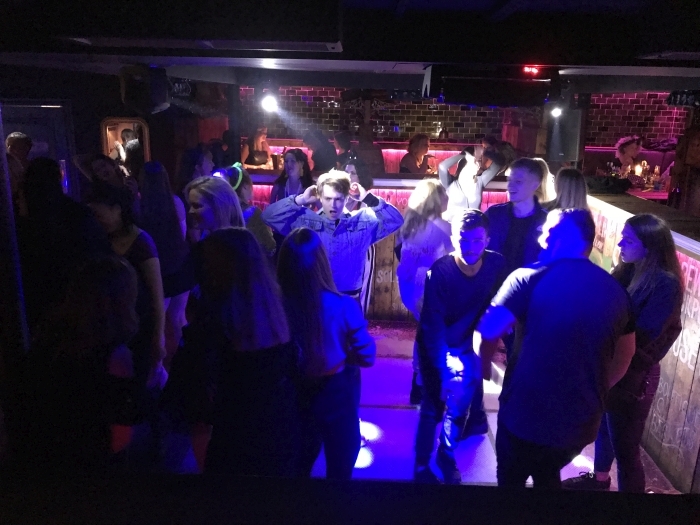 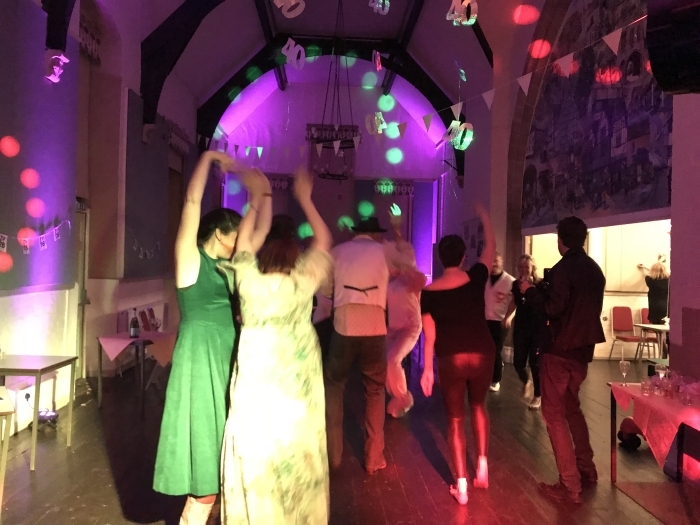 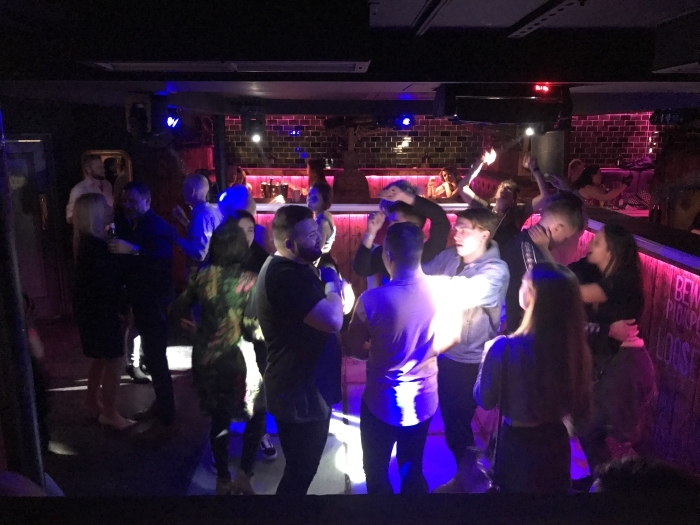 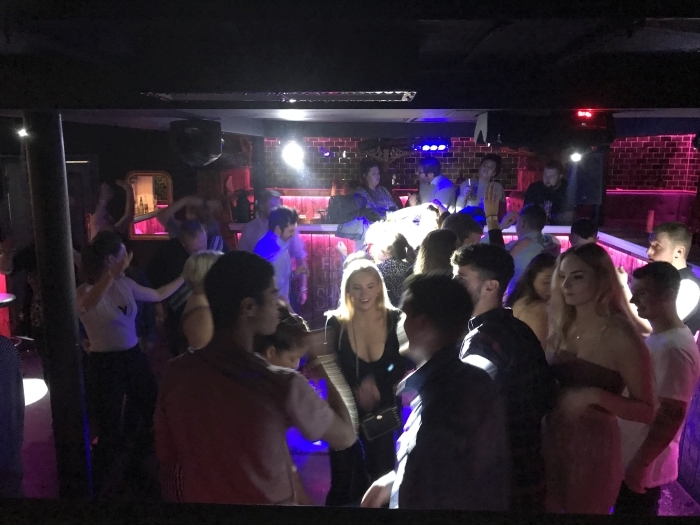 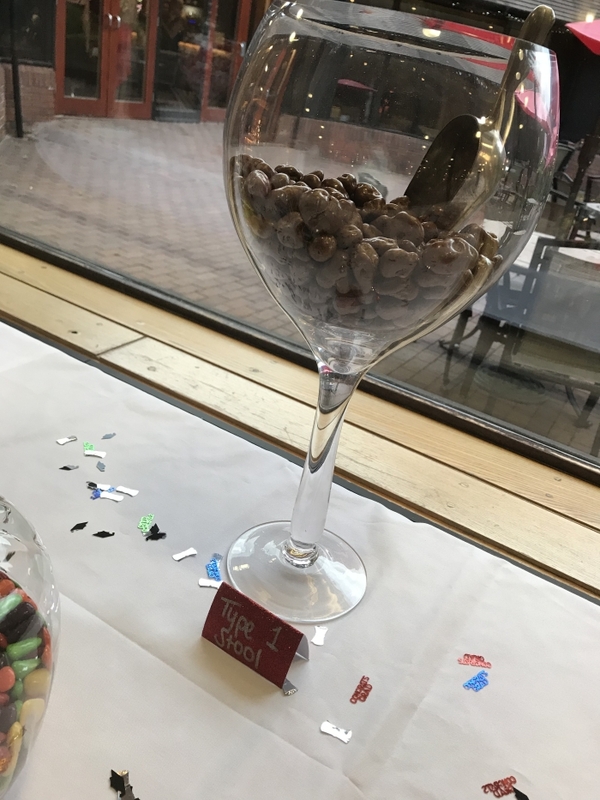 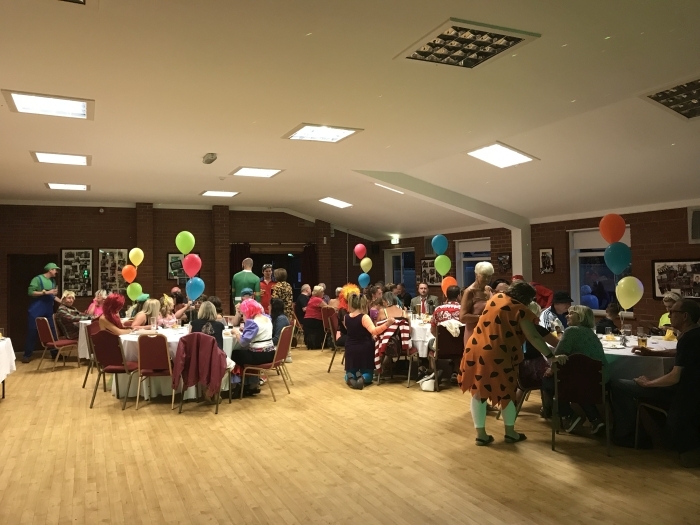 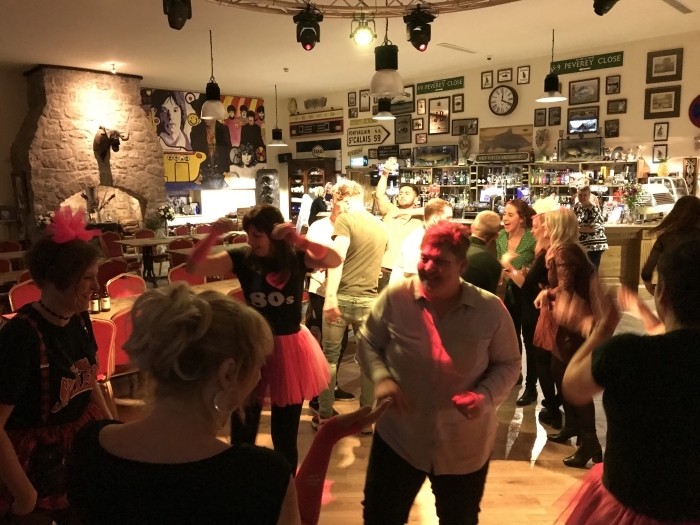 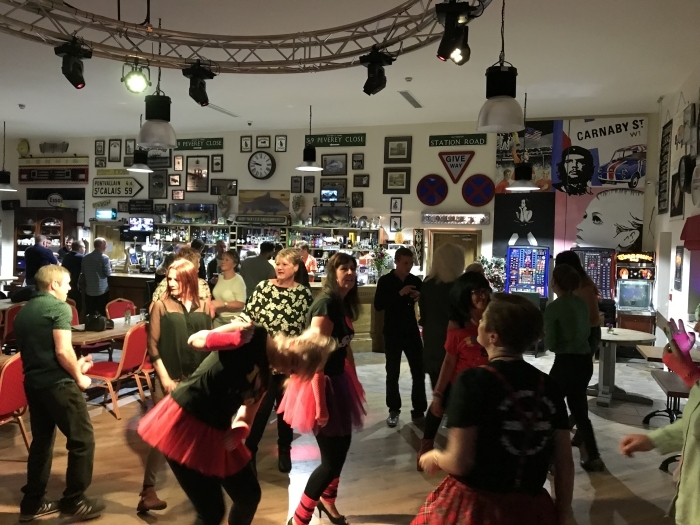 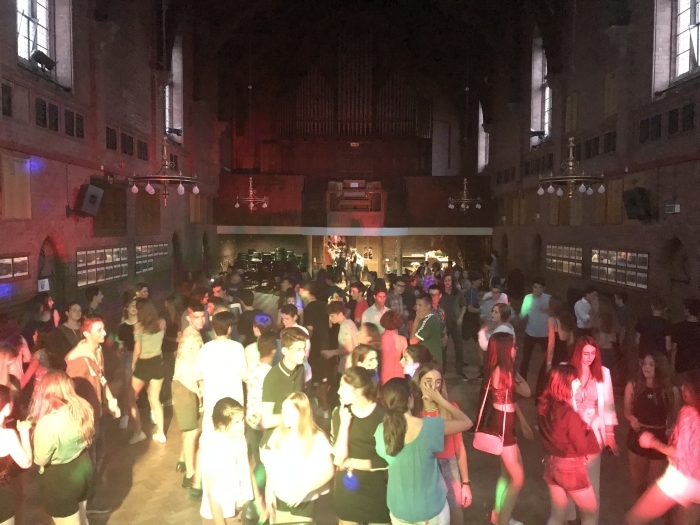 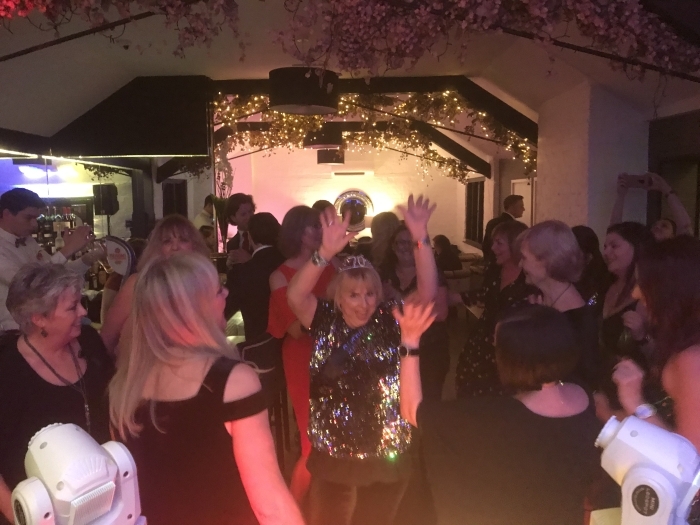 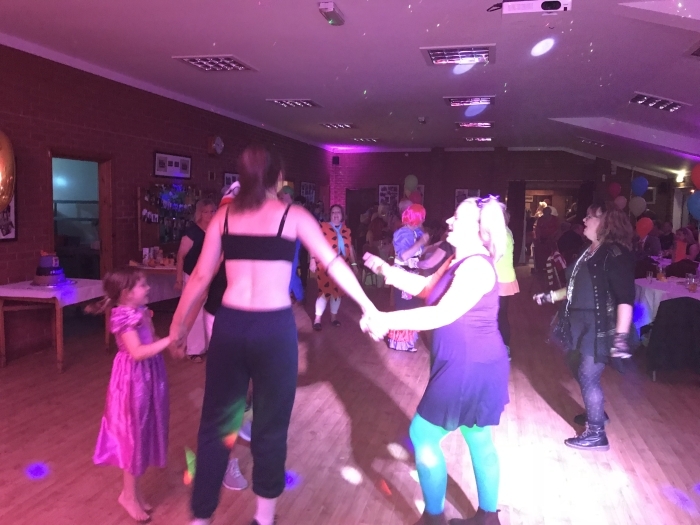 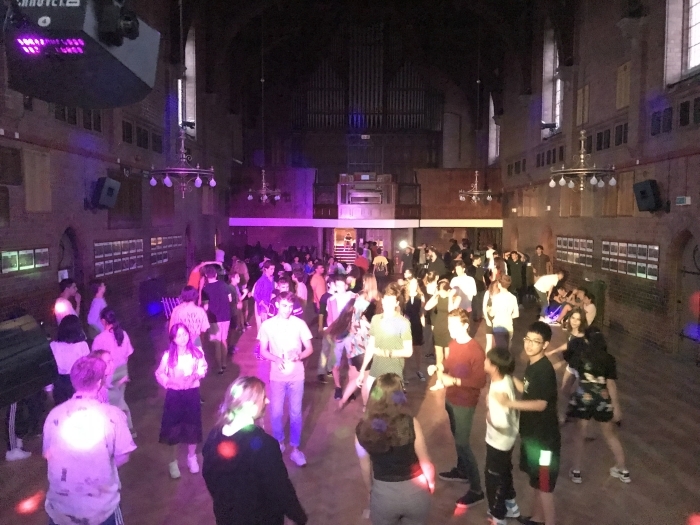 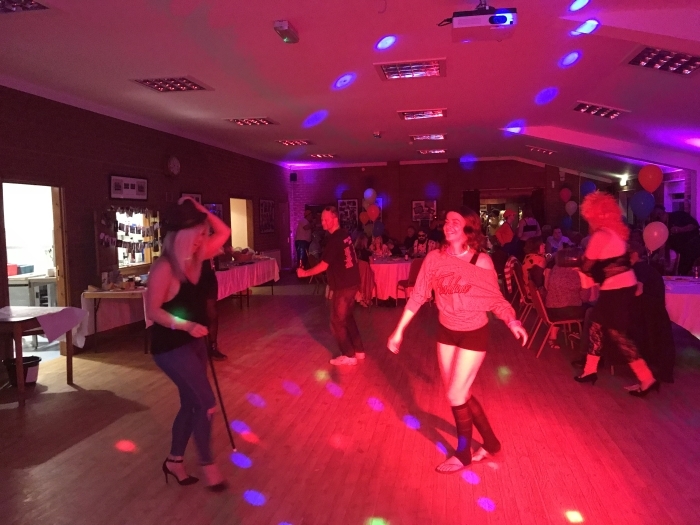 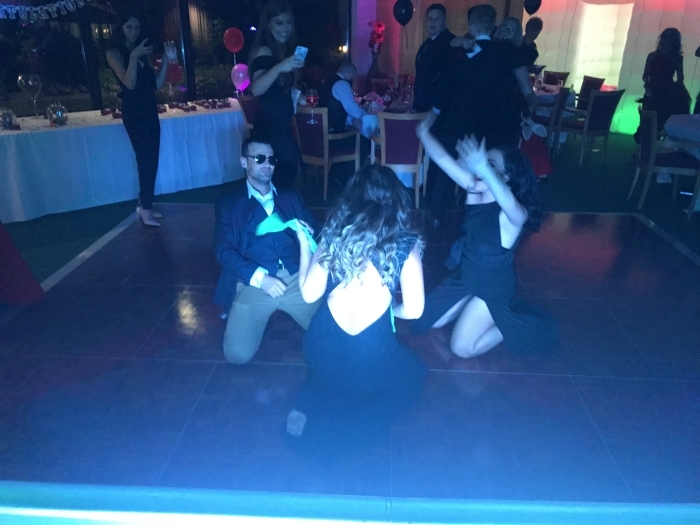 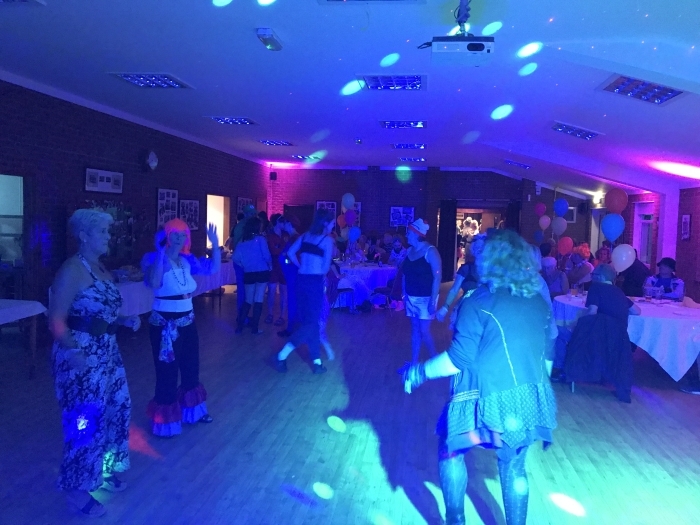 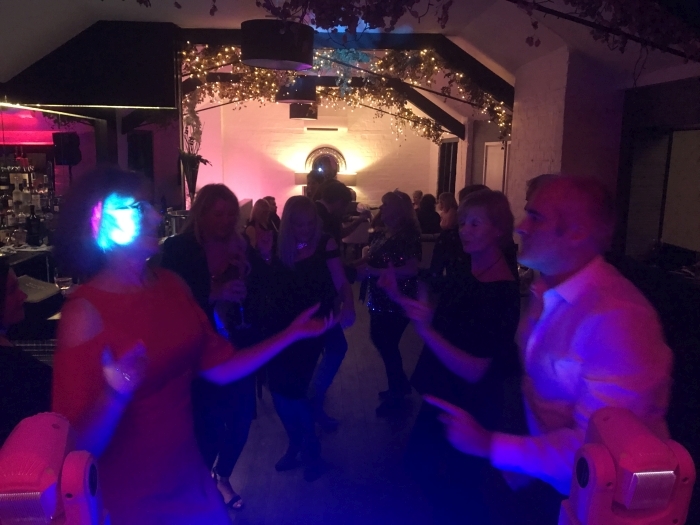 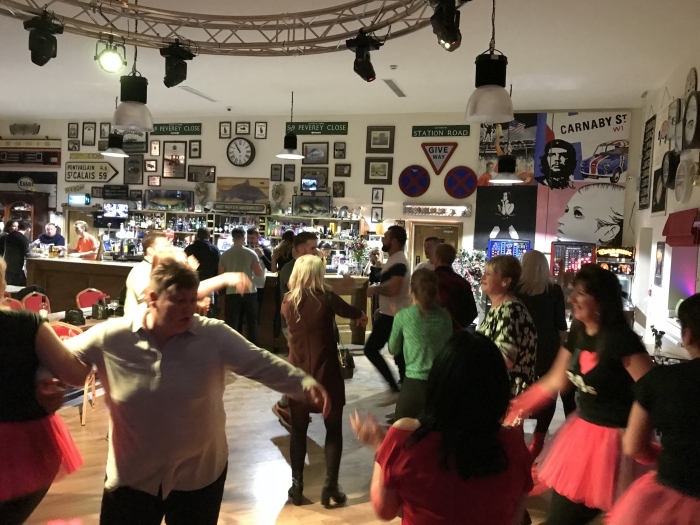 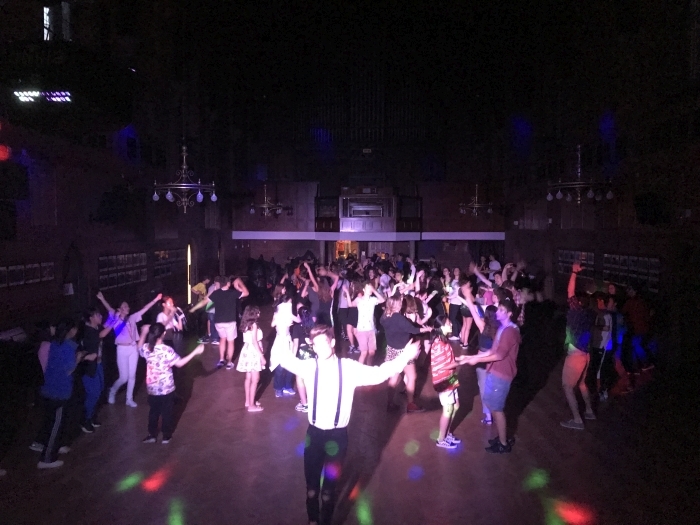 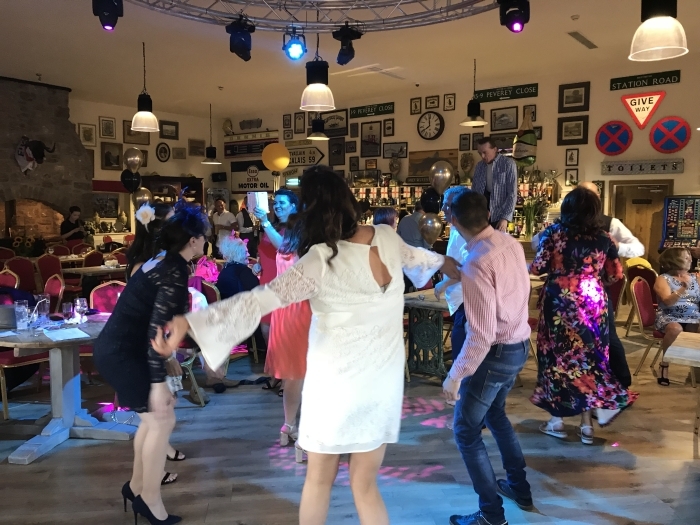 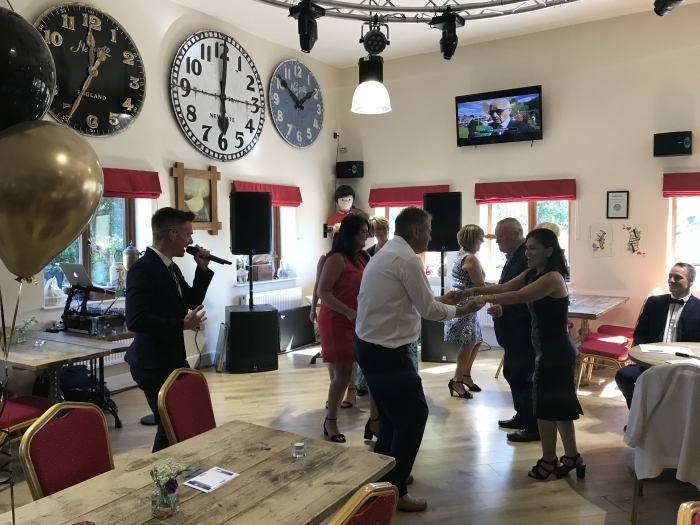 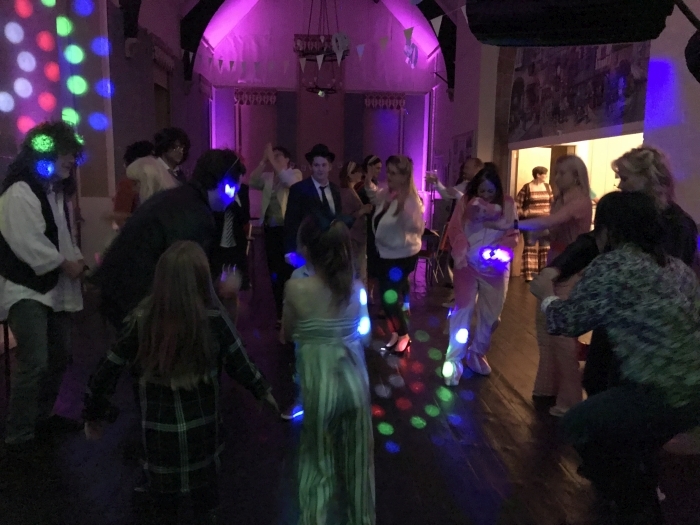 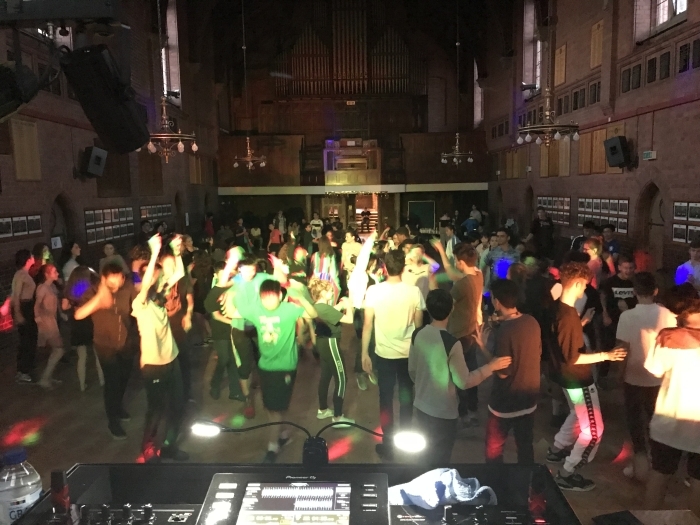 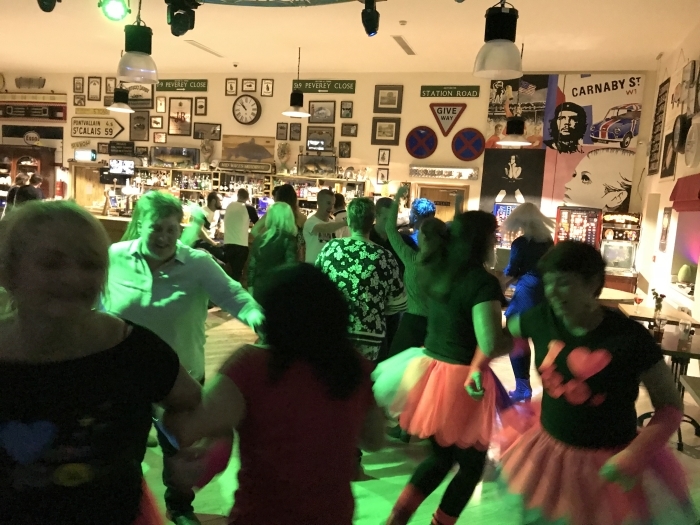 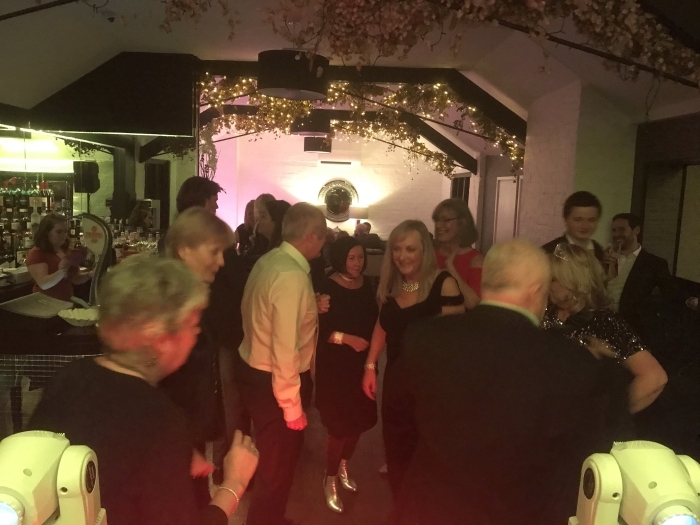 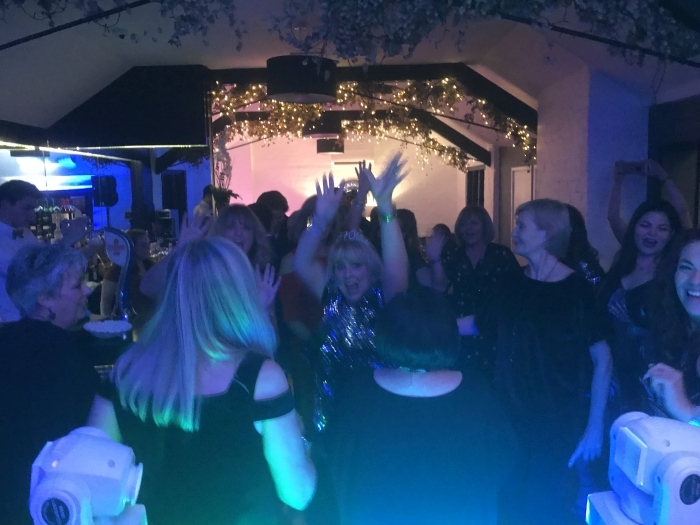 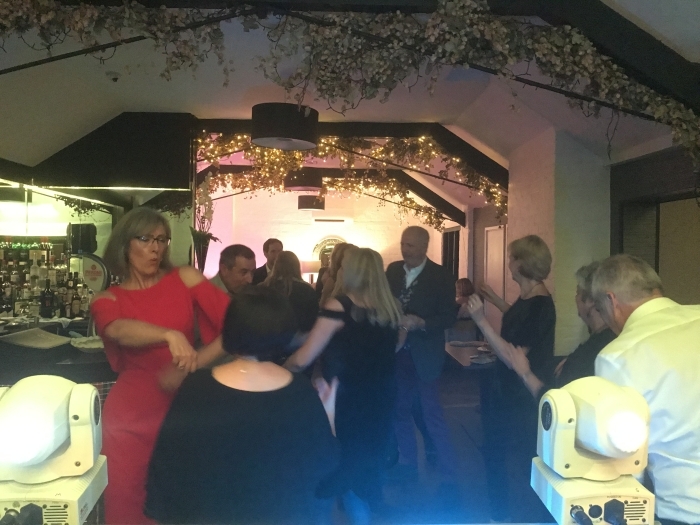 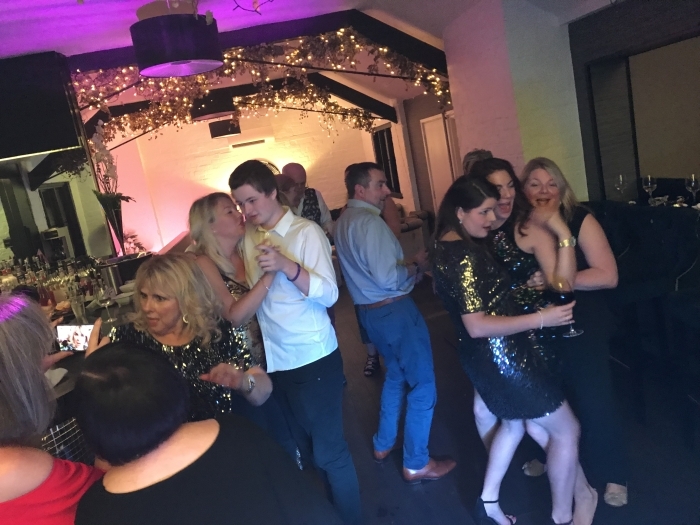 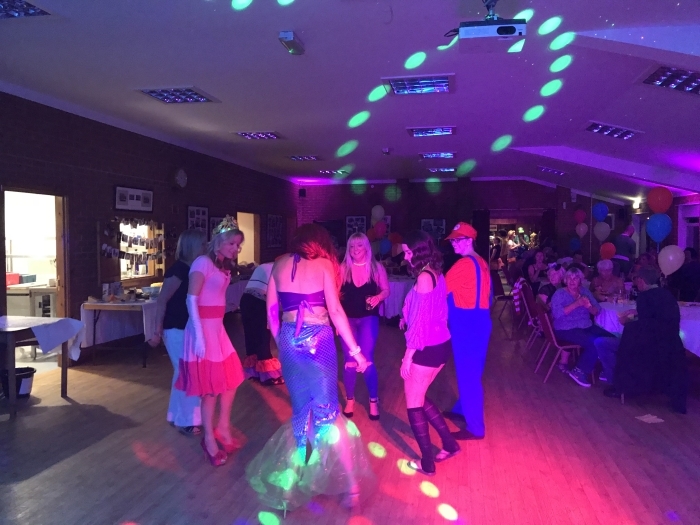 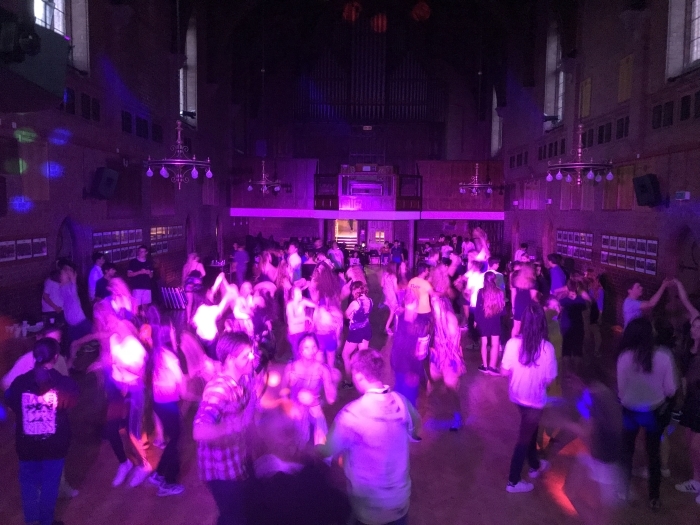 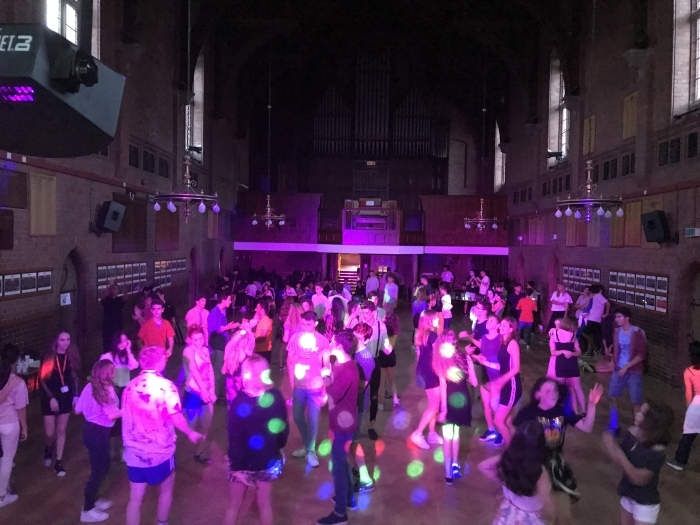 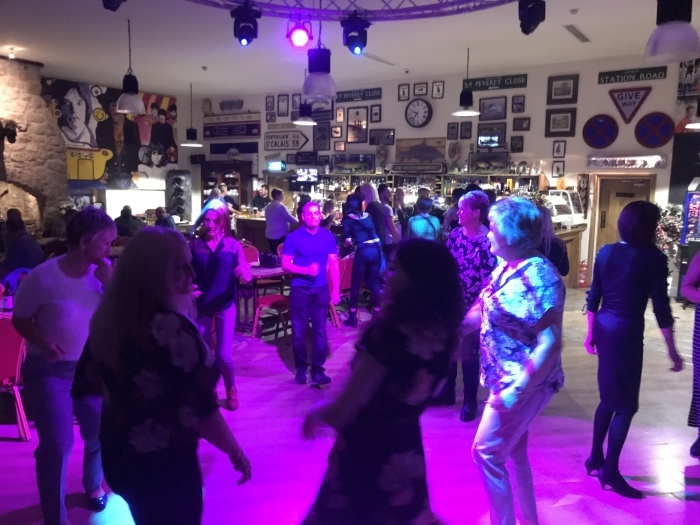 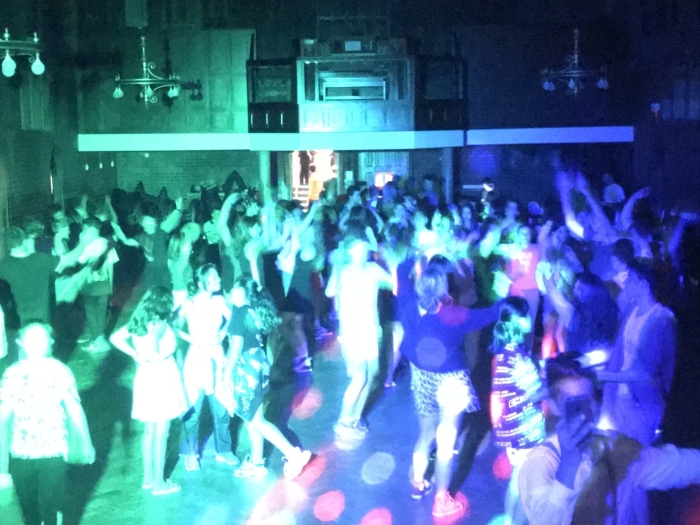 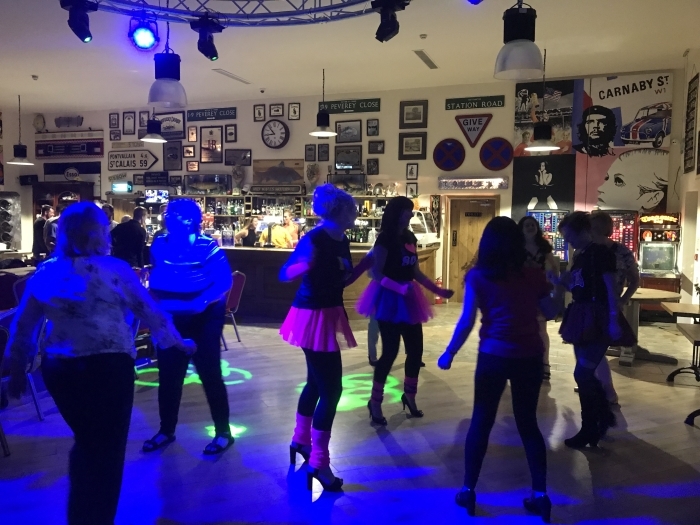 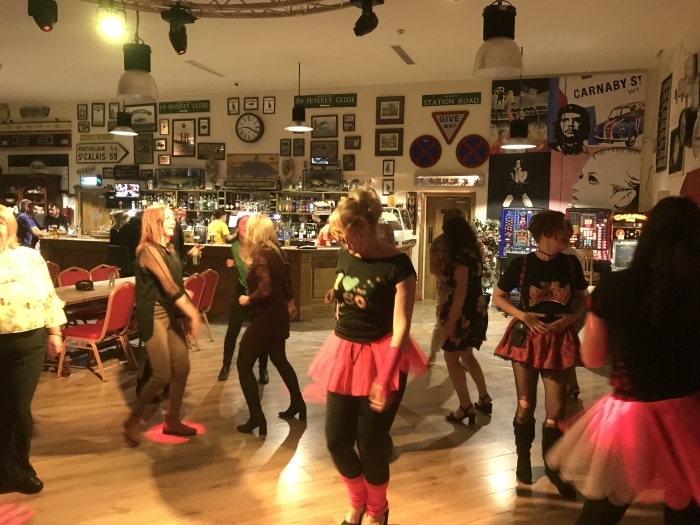 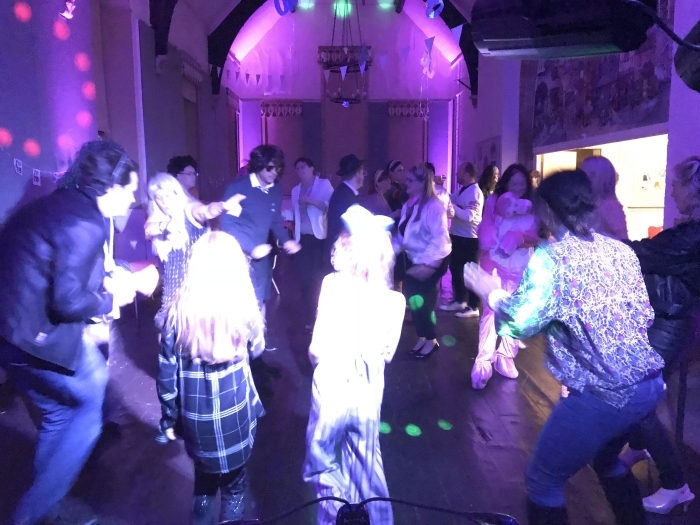 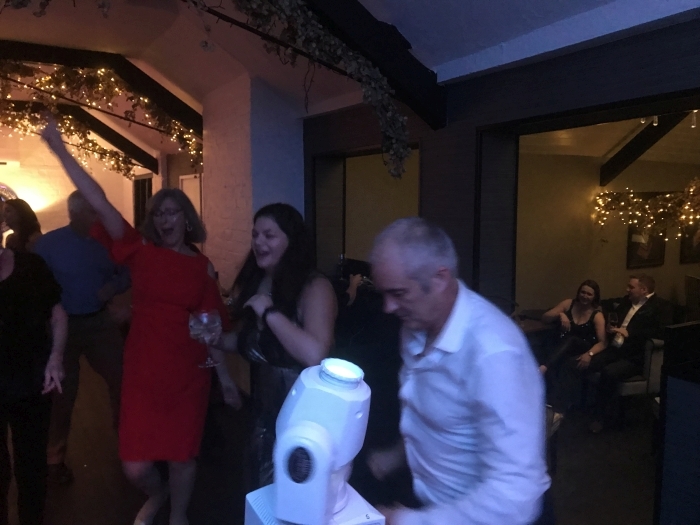 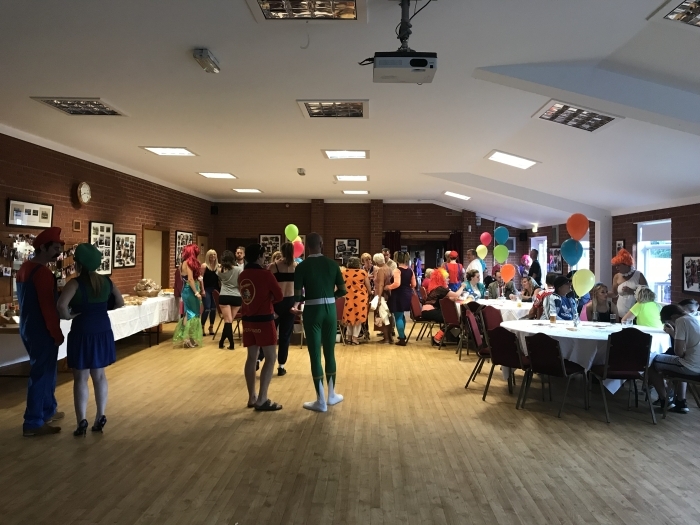 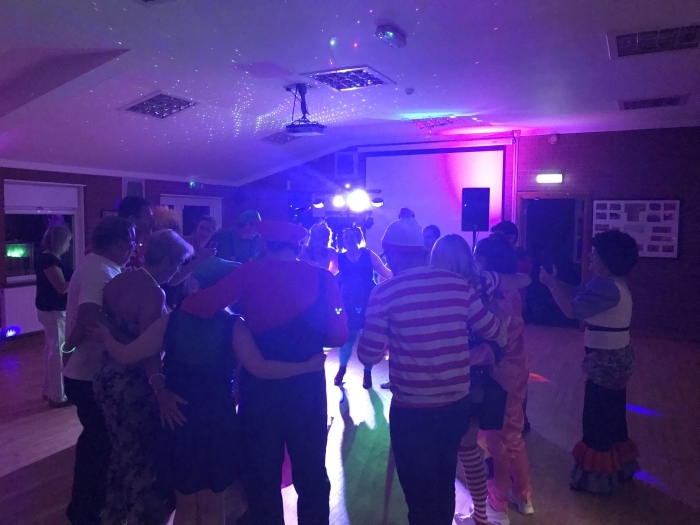 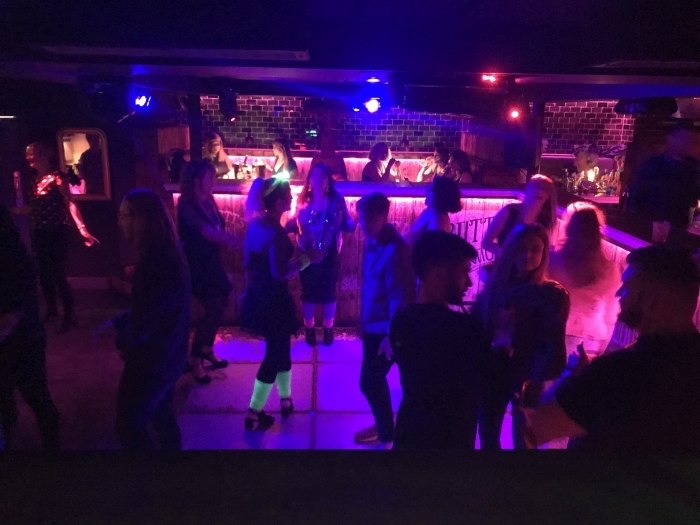 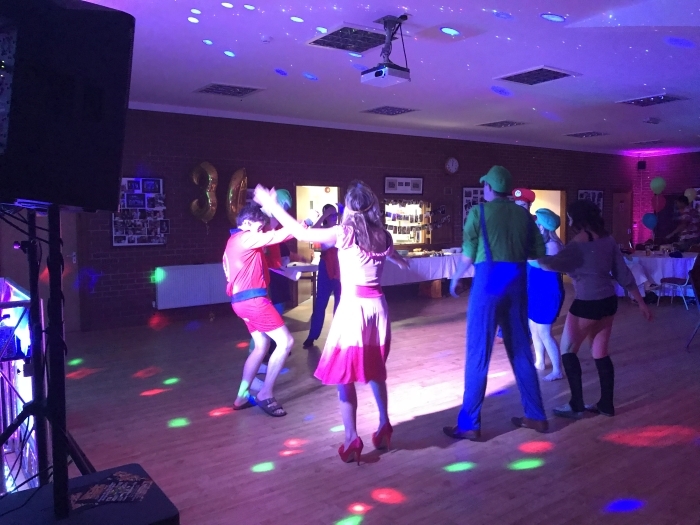 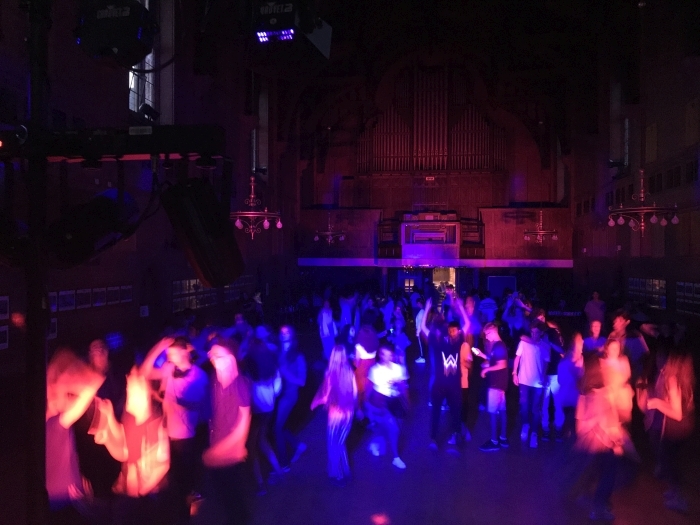 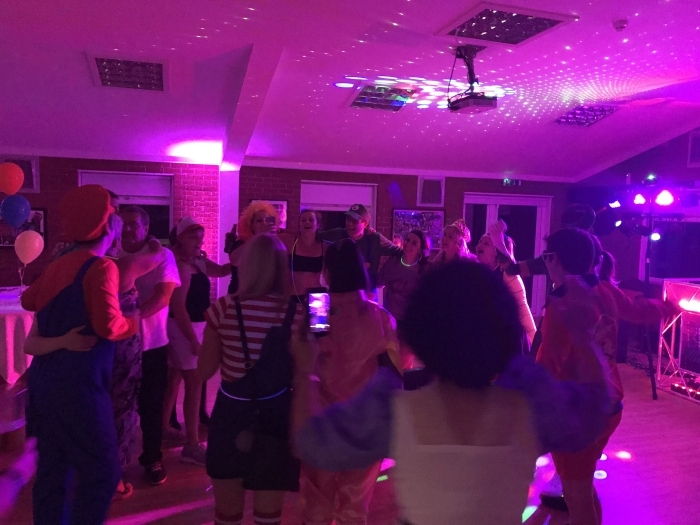 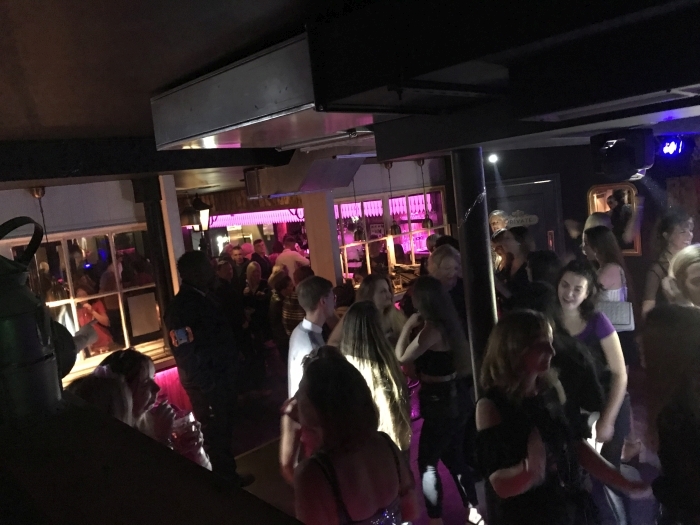 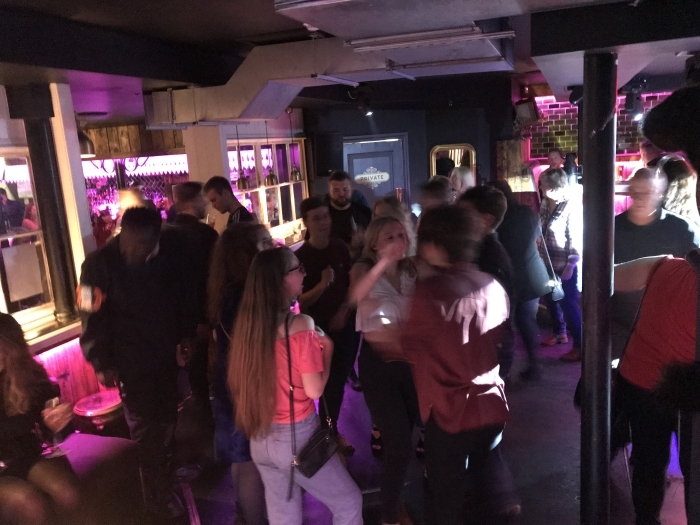 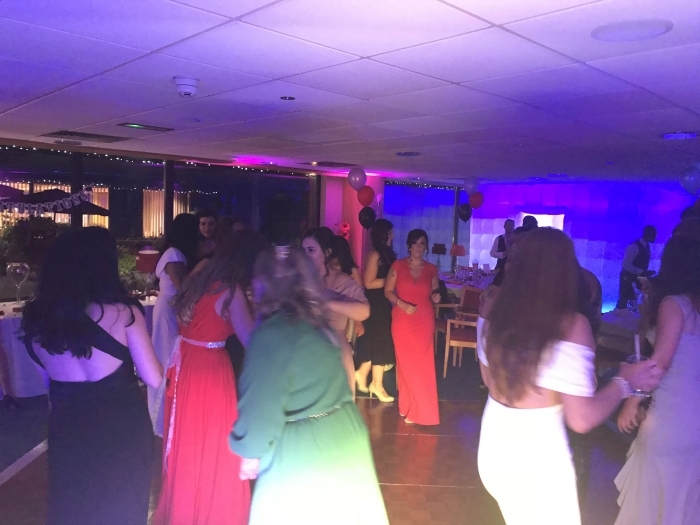 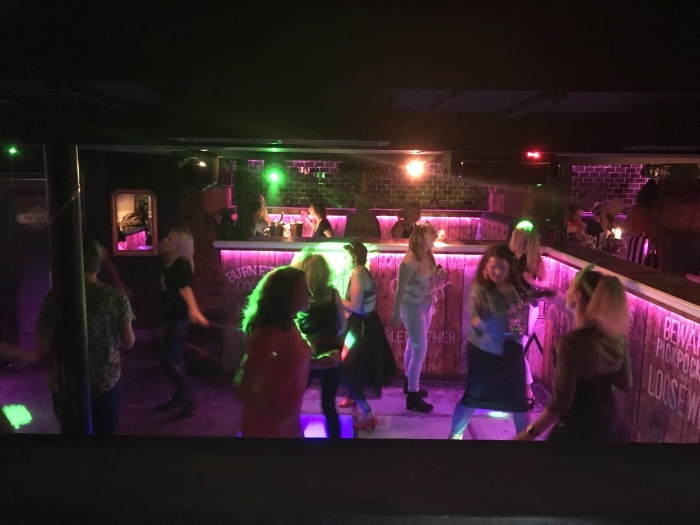 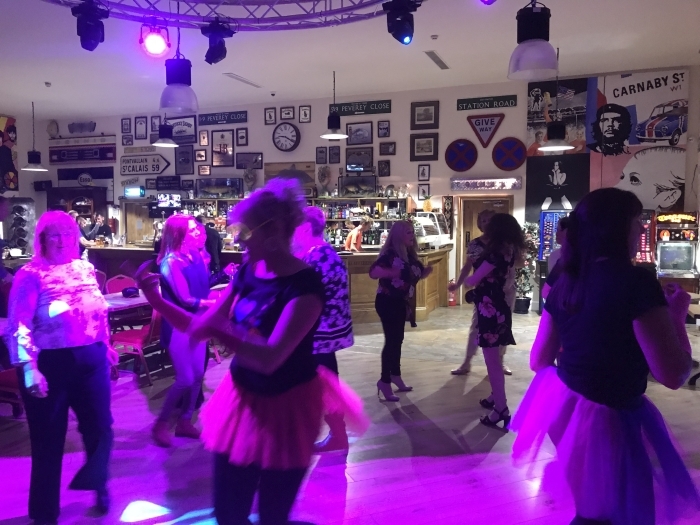 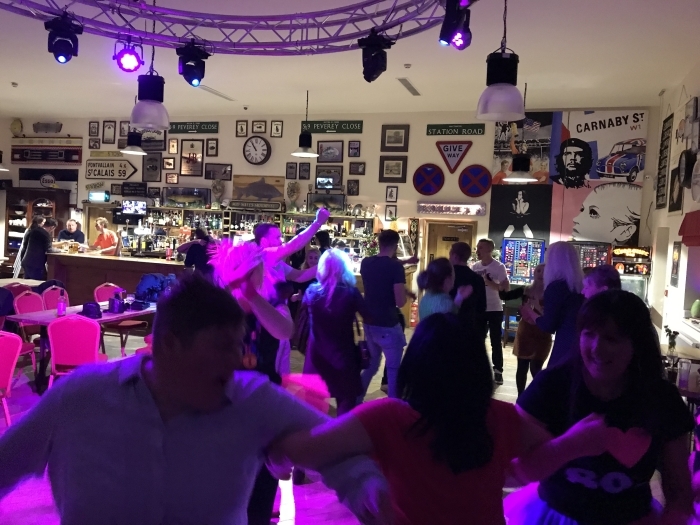 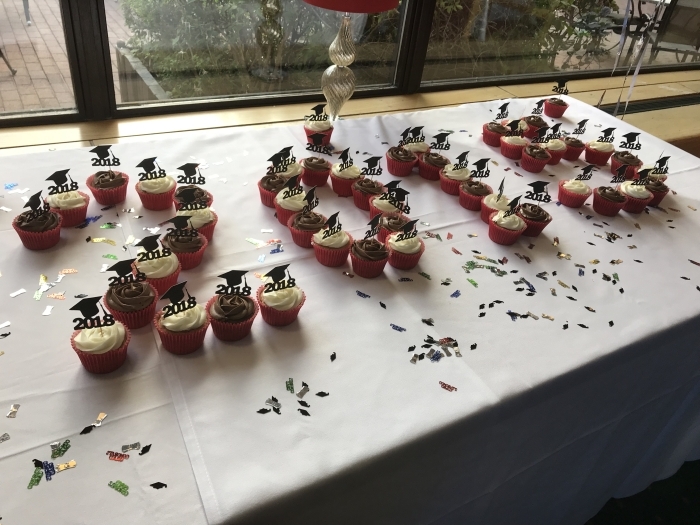 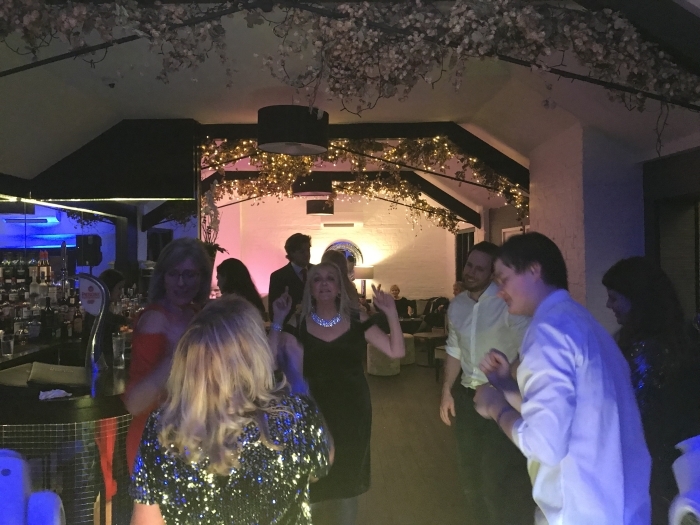 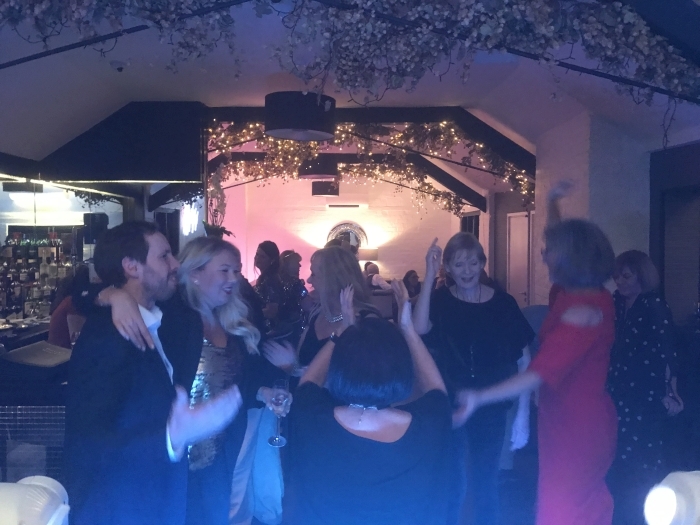 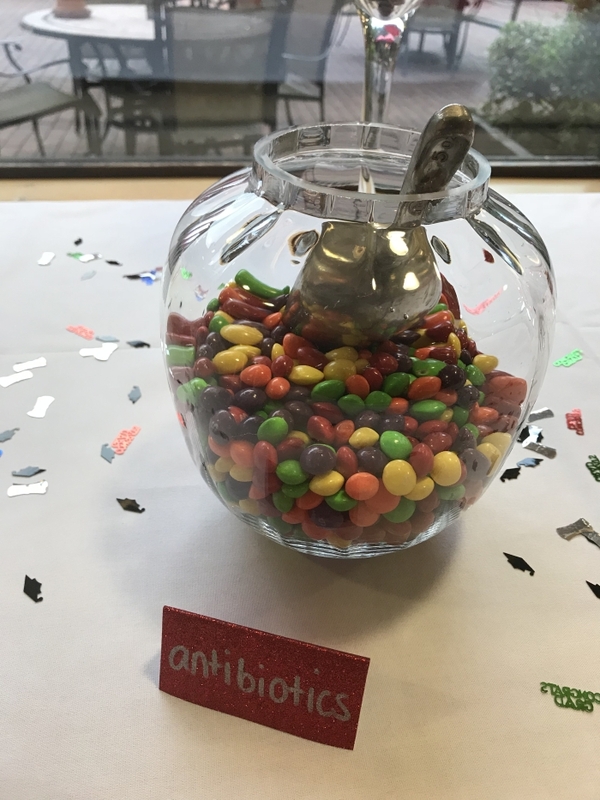 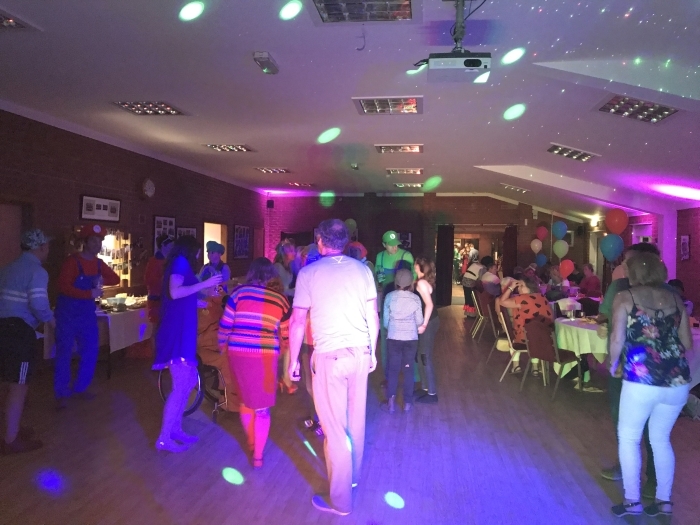 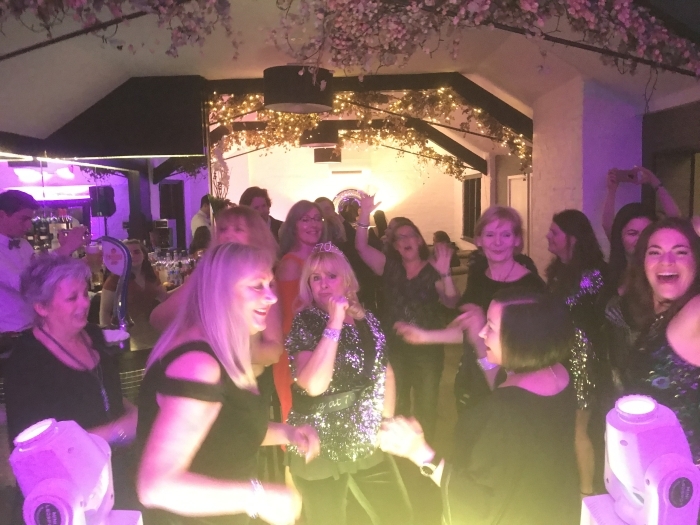 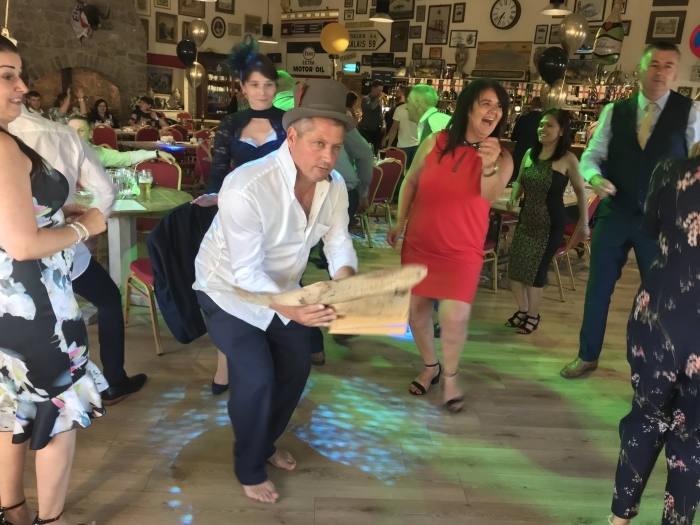 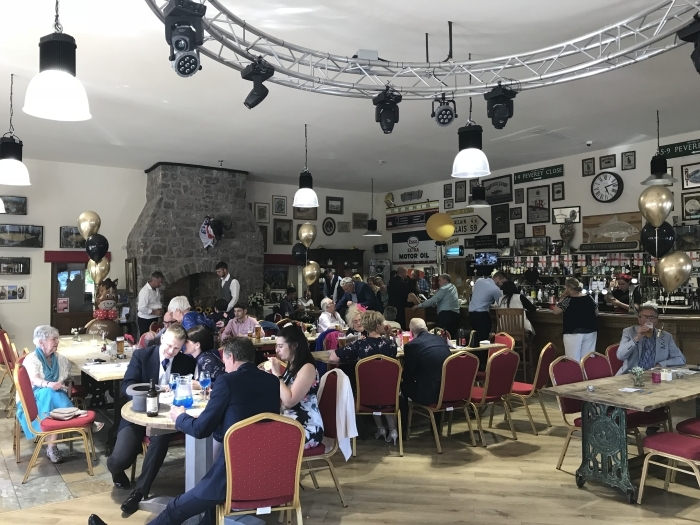 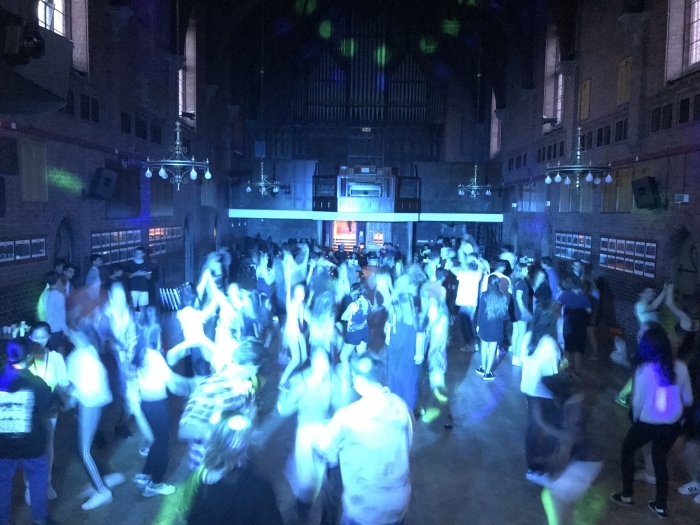 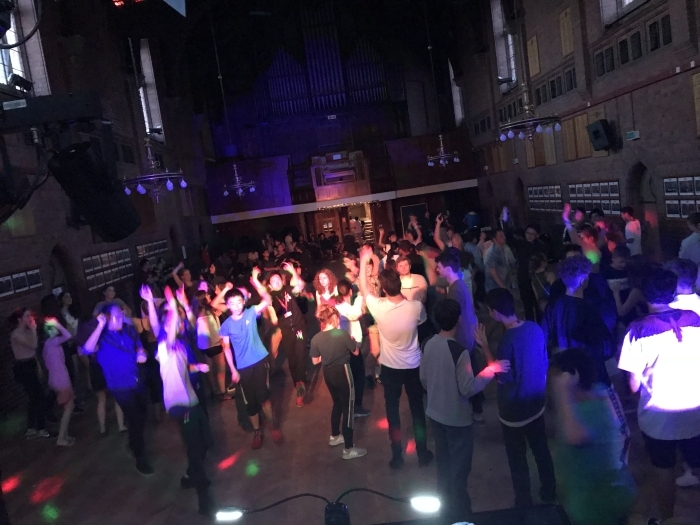 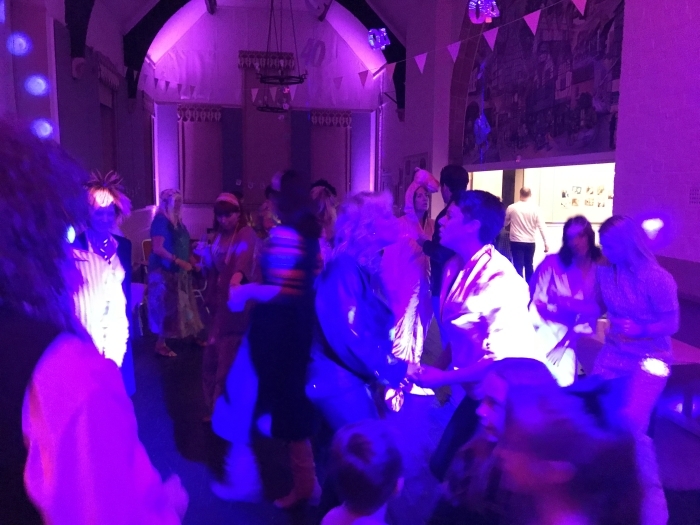 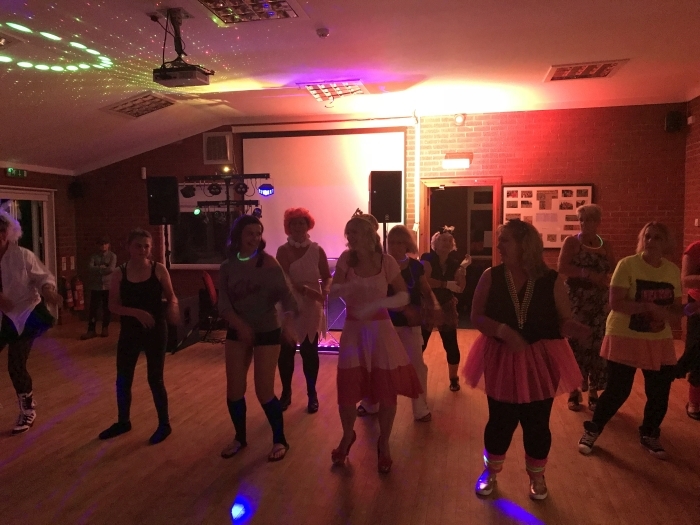 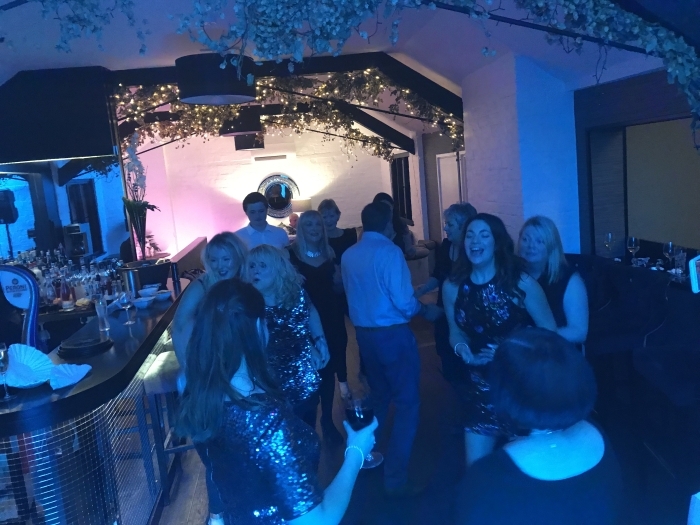 Although the total group was under 50 people that did not stop them filling the dance floor and having a great party to celebrate their fantastic achievement. 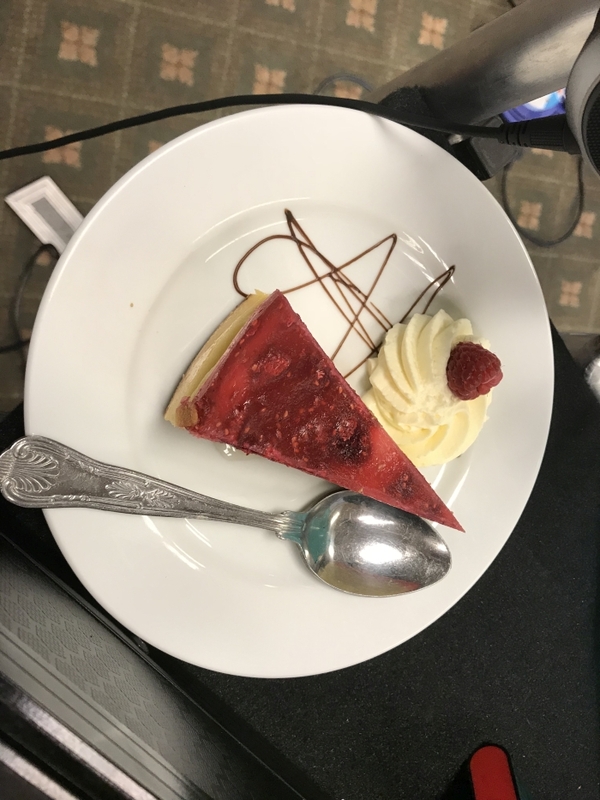 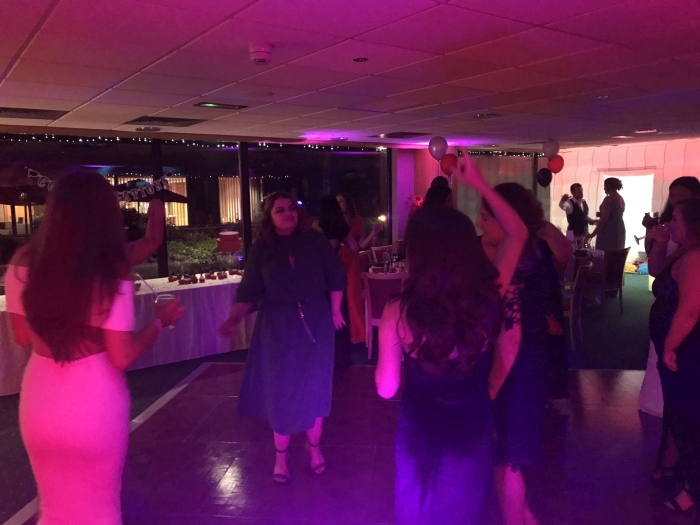 My first set was from 6:30pm which was the upbeat background music for guest arrival and during their three-course meal, I DJed live this set opposed to using a playlist on autopay as it enables me to read the room and get an idea of what people were reacting to! 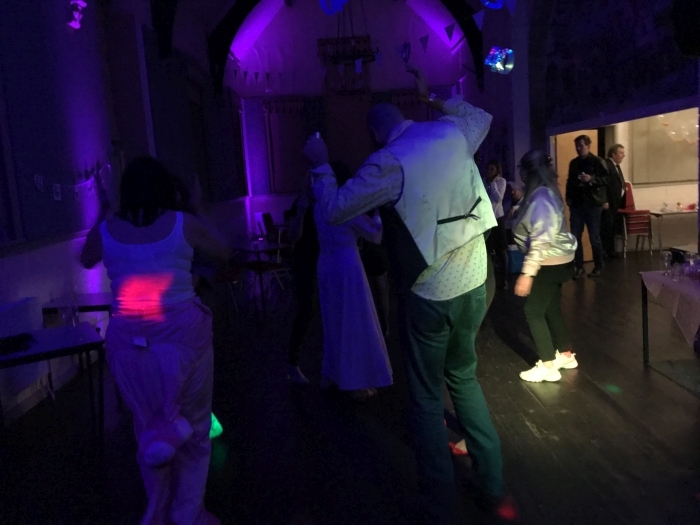 After the meal and speech, the disco lights went on and the did the main DJ set through to midnight, taking lots of requests and playing as many as I could. 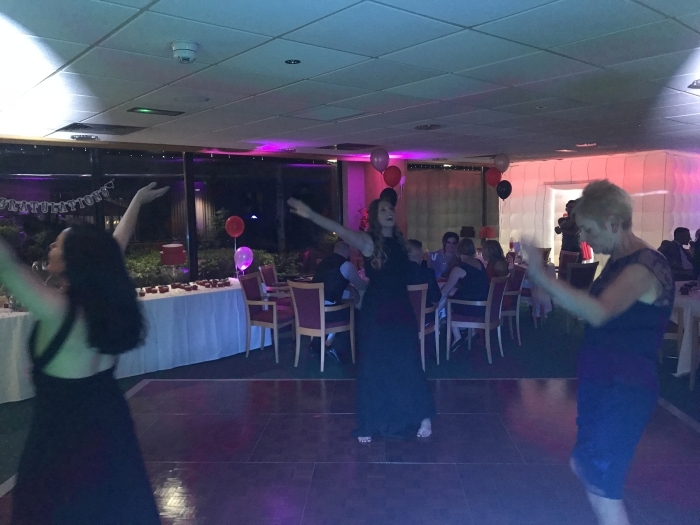 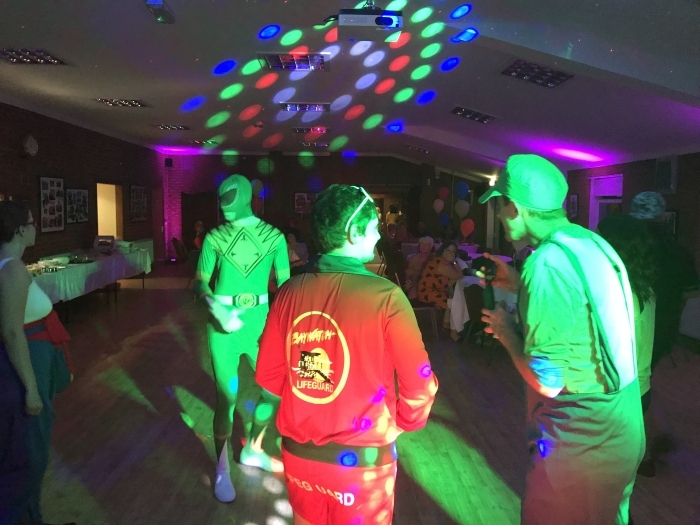 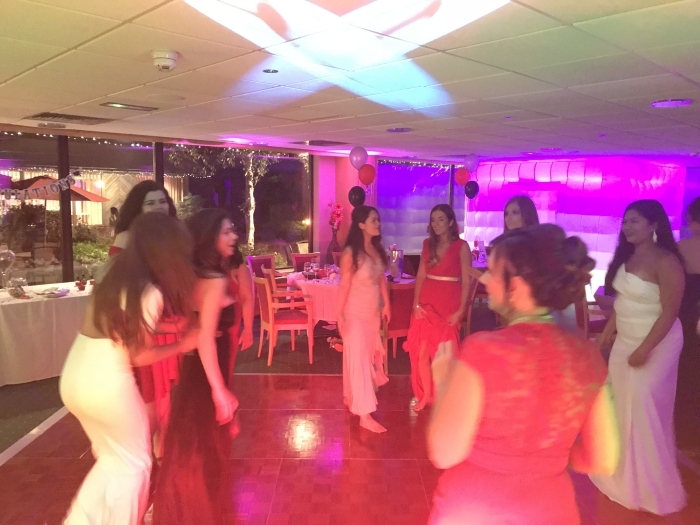 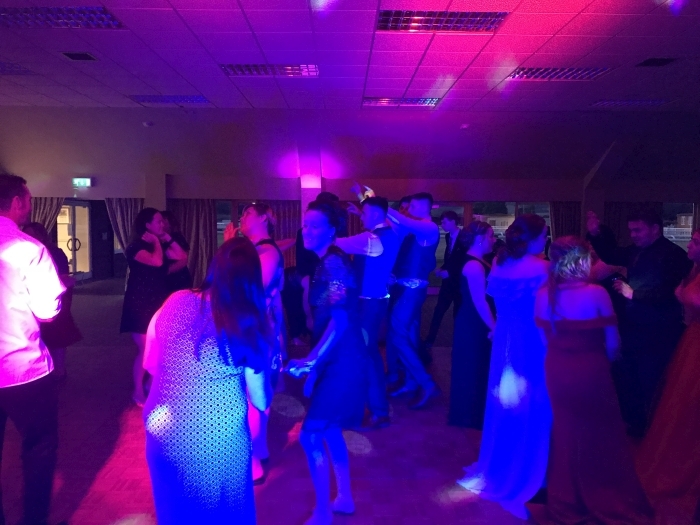 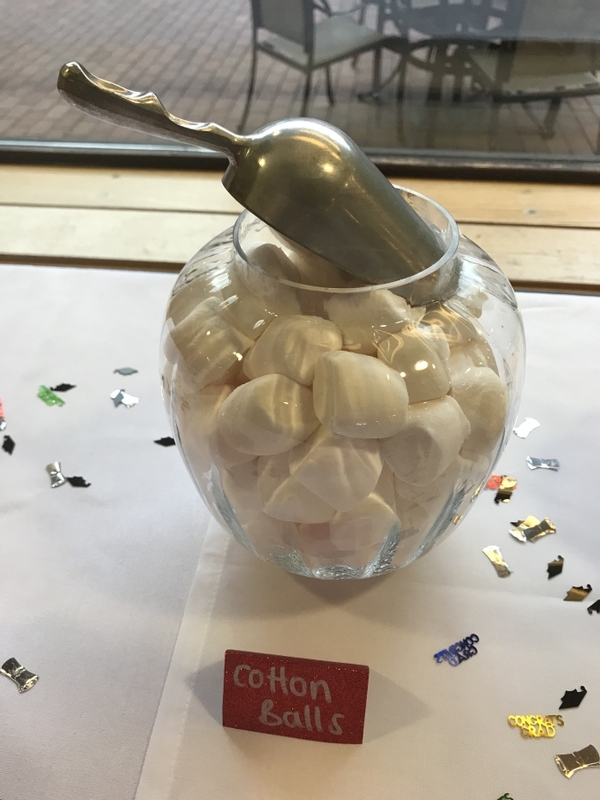 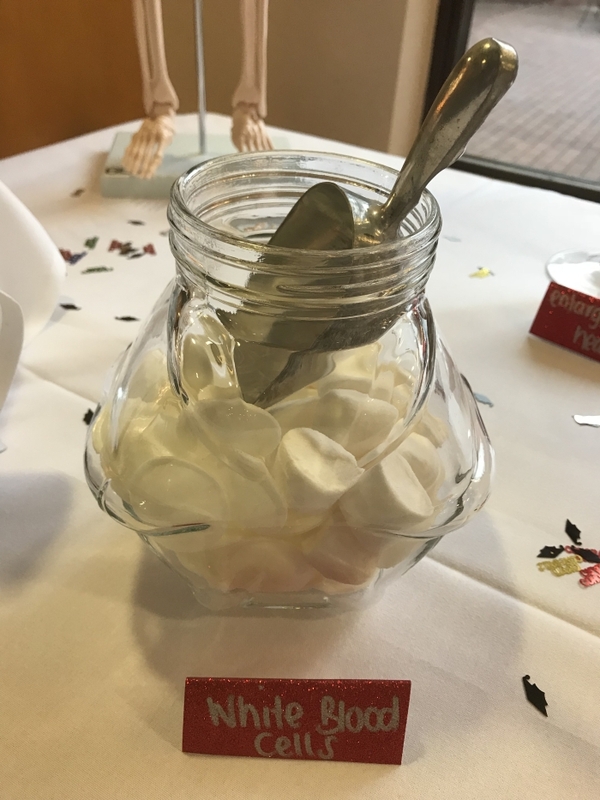 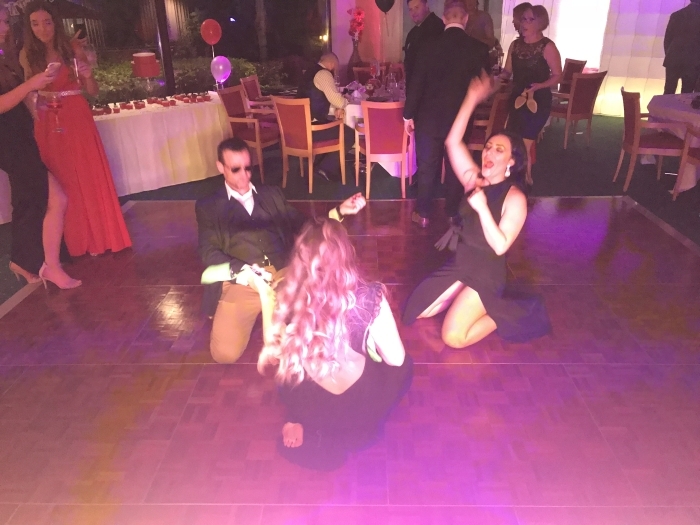 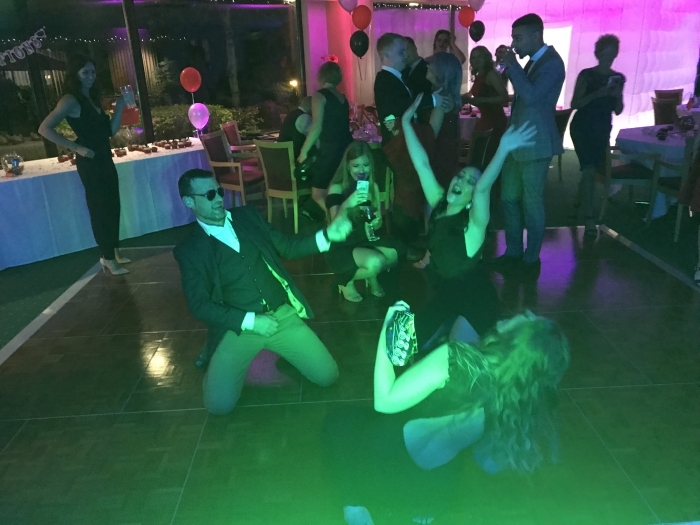 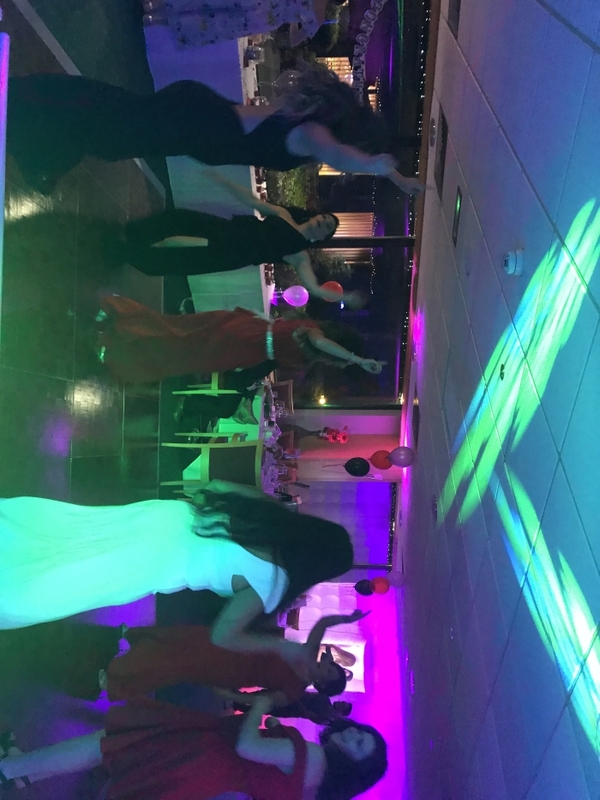 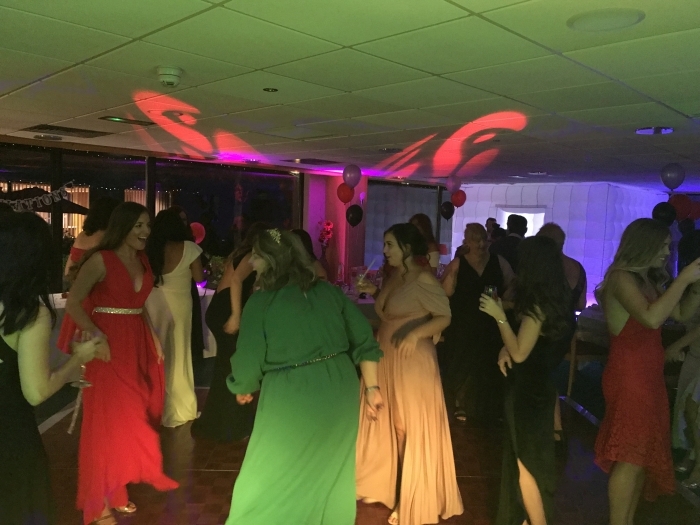 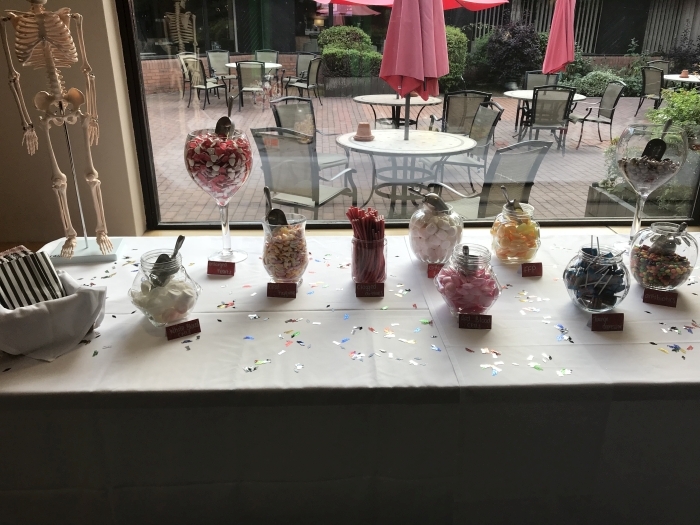 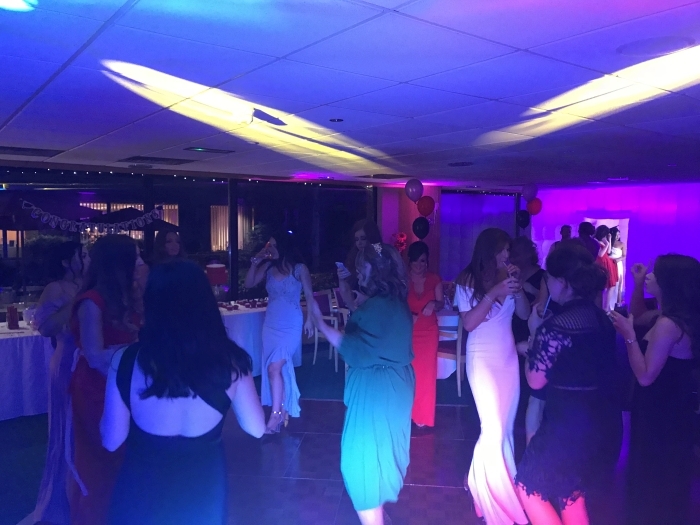 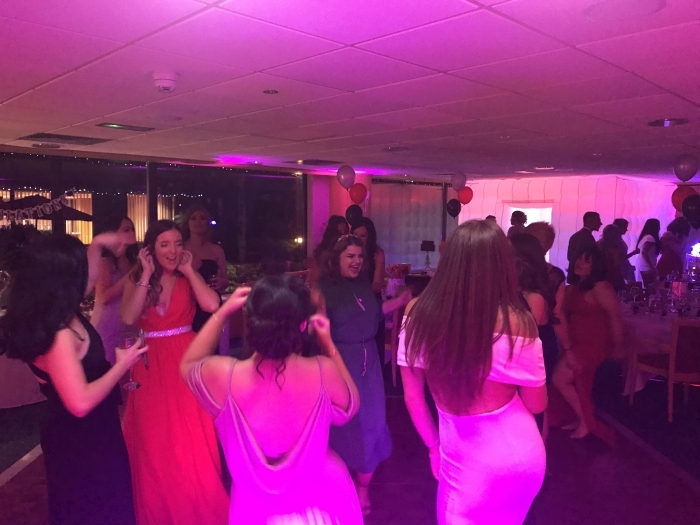 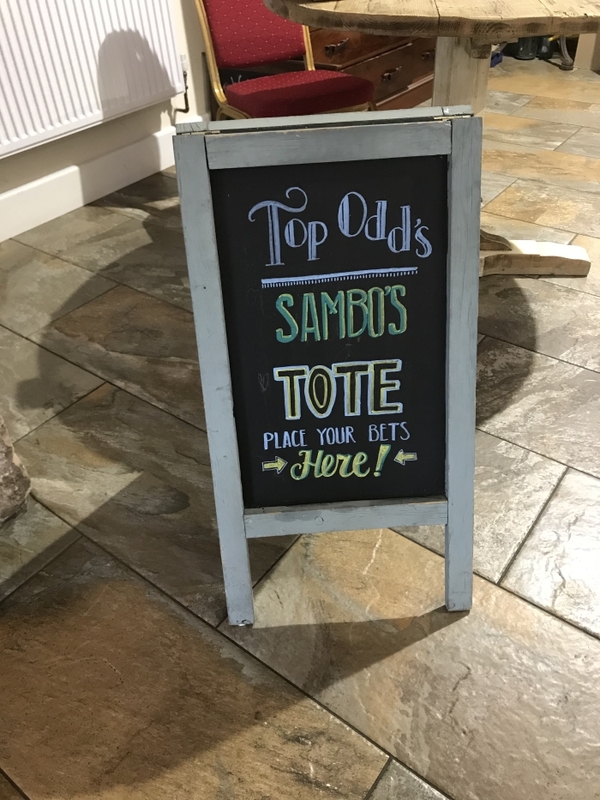 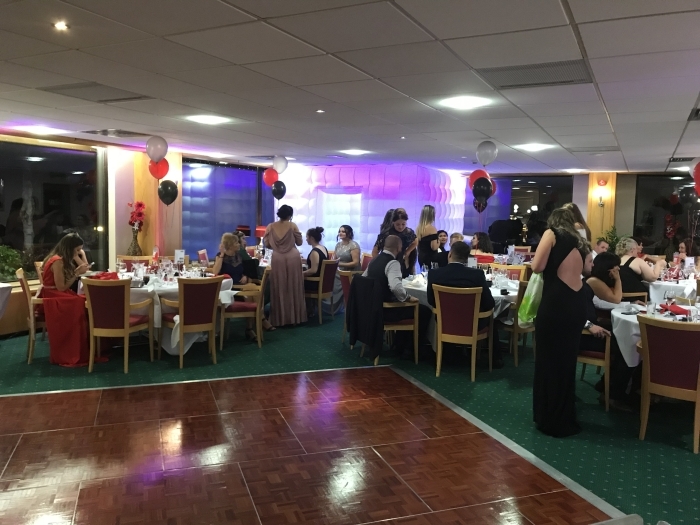 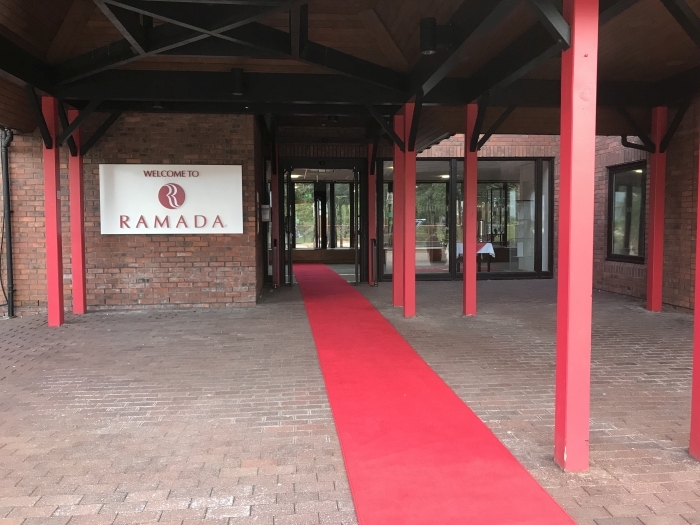 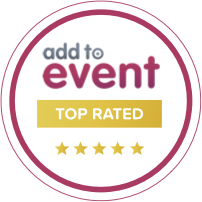 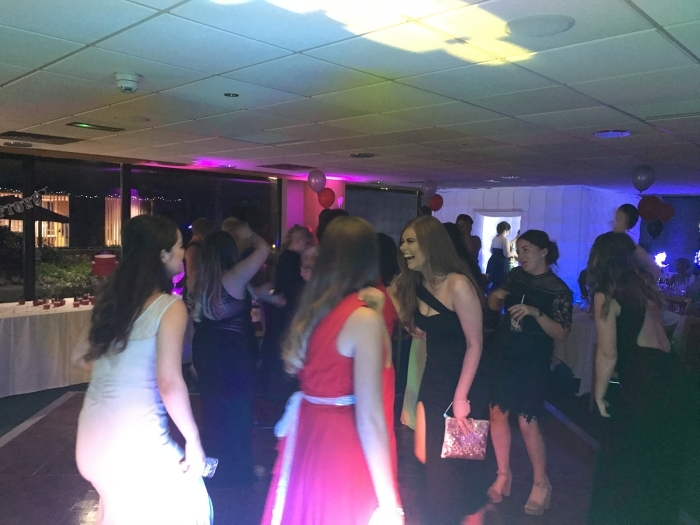 It was also the first time I had DJed at the Ramada Telford and it was really nice to work with their team who were all friendly and set on making sure the night went amazingly. 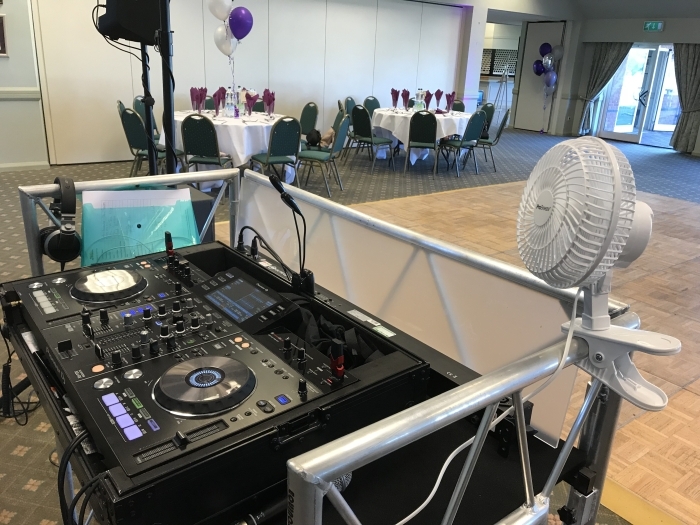 Once I had completed setting up the DJ equipment I produced this short video showing the room, setup and few of the things that had been put in place to enhance the evening. 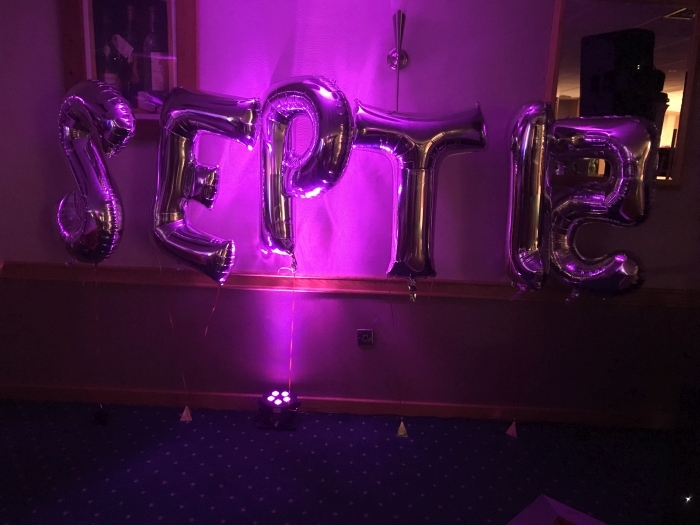 I also managed to grab a quick video during the evening! 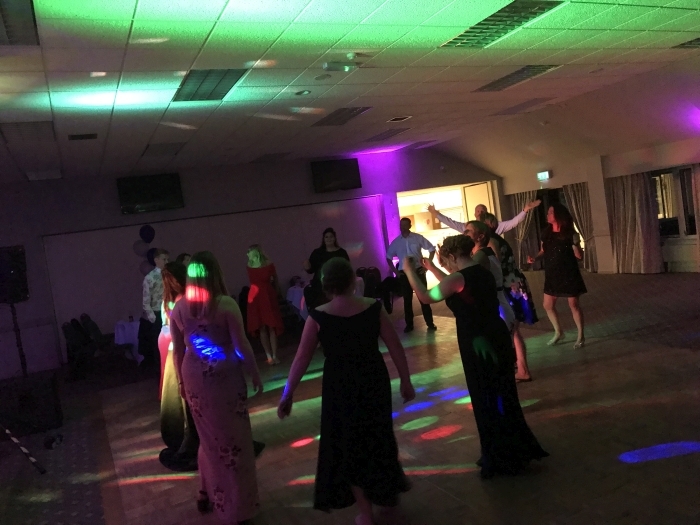 Here are a few pictures I took during the evening. 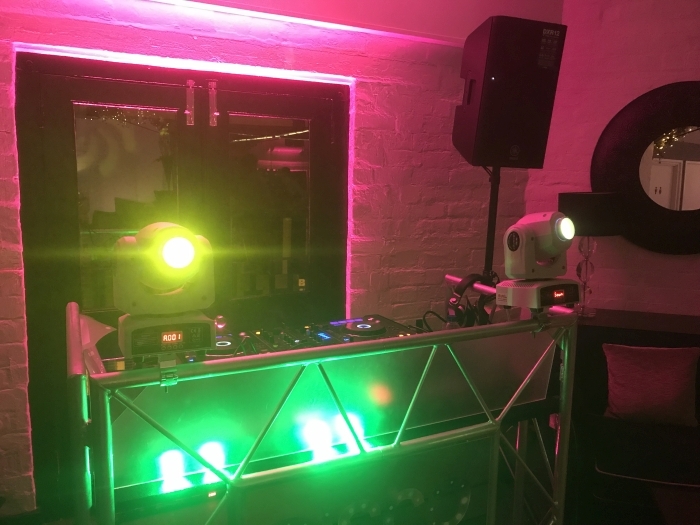 Upon arrival I found that the celling height was slightly too short for the DJ setup I had originally planned so I improvised and moved some of my lighting around, still providing an amazing look and visual wow factor for all the guests. 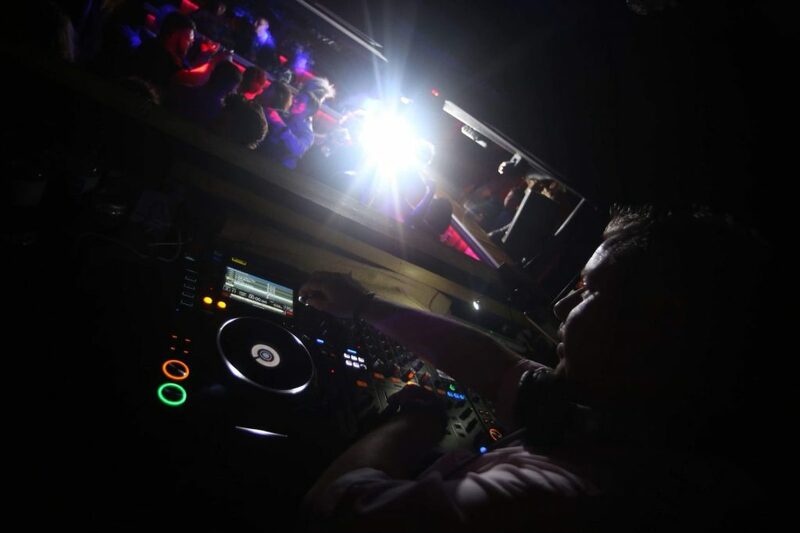 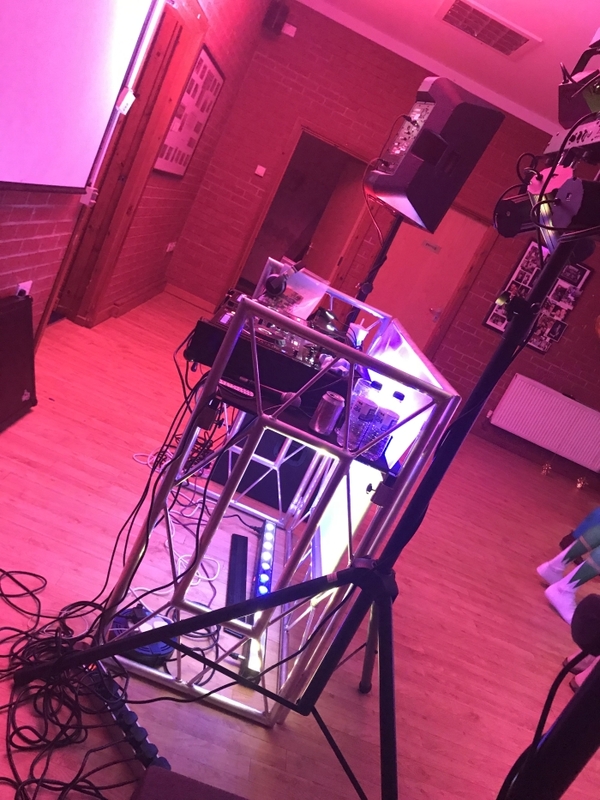 A picture of what the setup looked like on the night and one of me DJing! 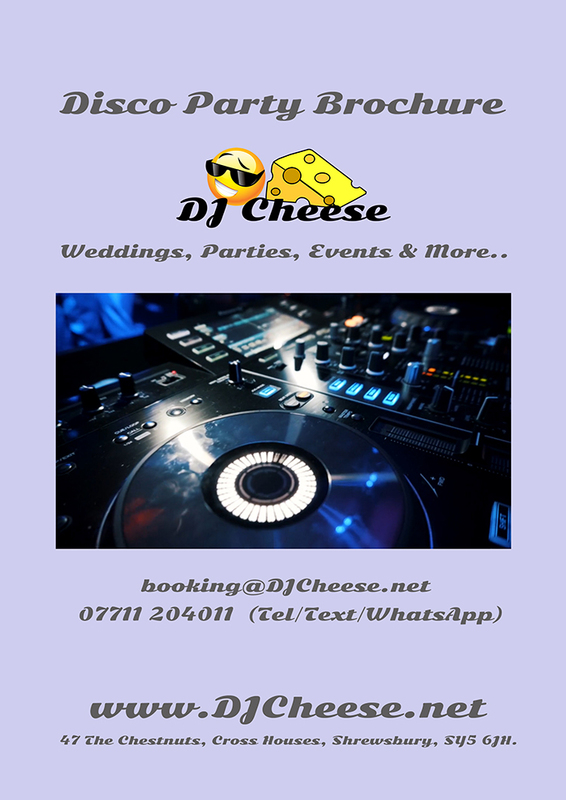 DJ Cheese on the decks! 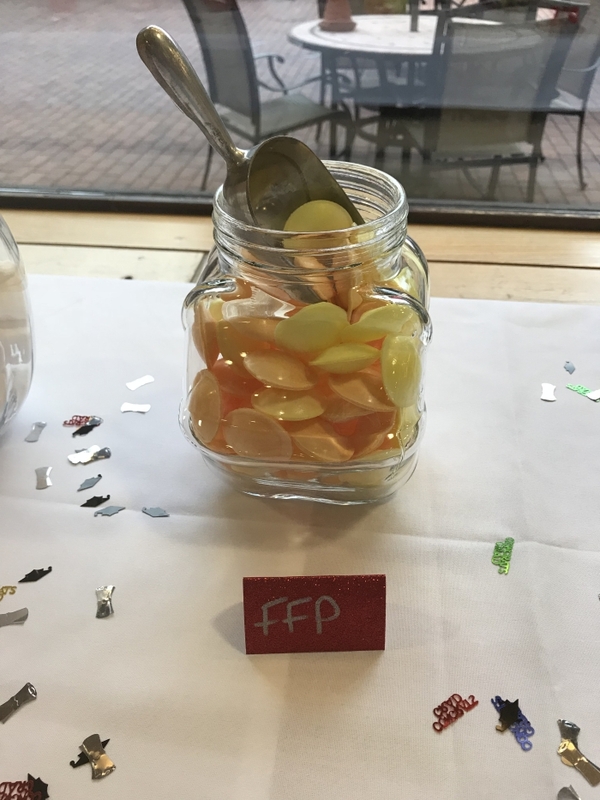 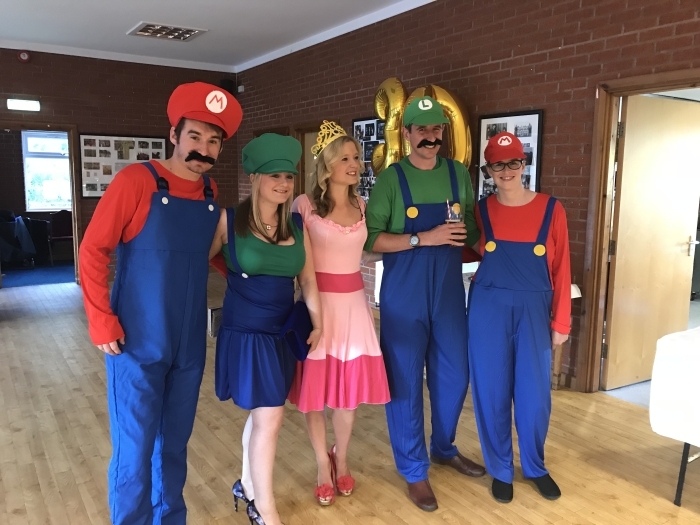 I did suggest that due to the number of Mario’s present that we could have a Mario Floss Dance Off but that was a step too far apparently! 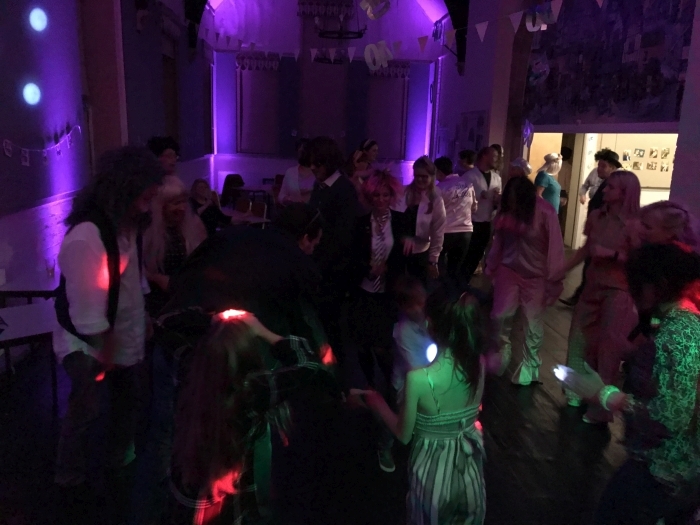 The party had a great atmosphere all night and I spent most of the night playing guest requests. 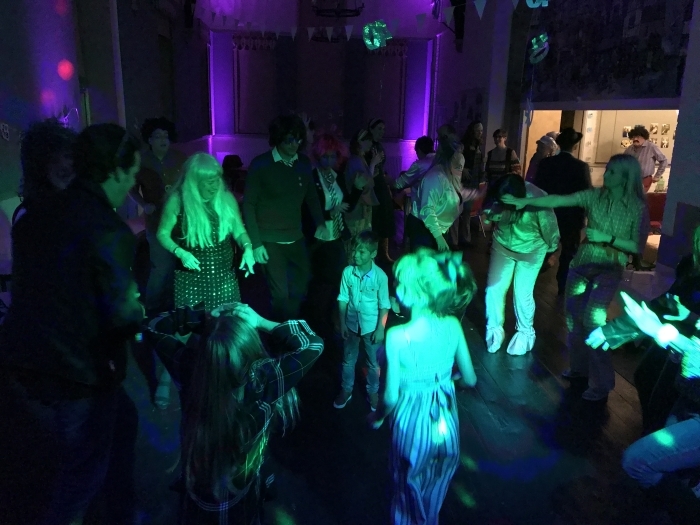 This Birthday Party DJ video intro was filmed just prior to the start of the event. 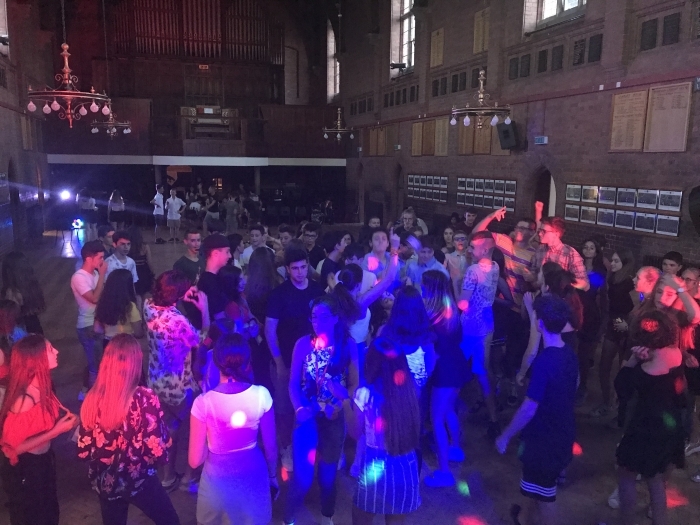 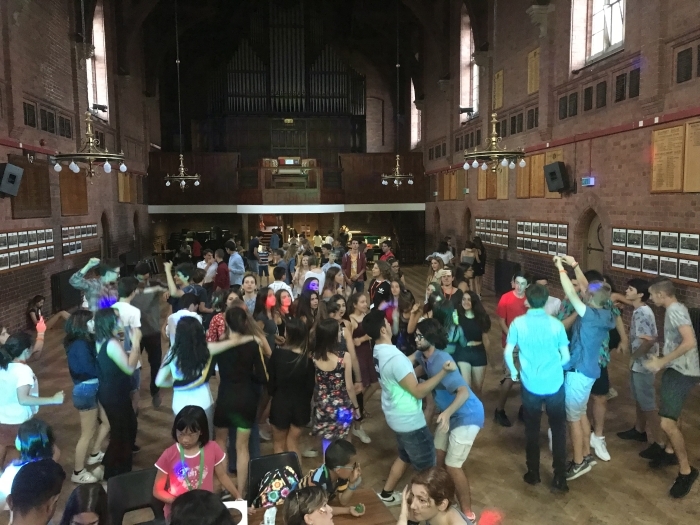 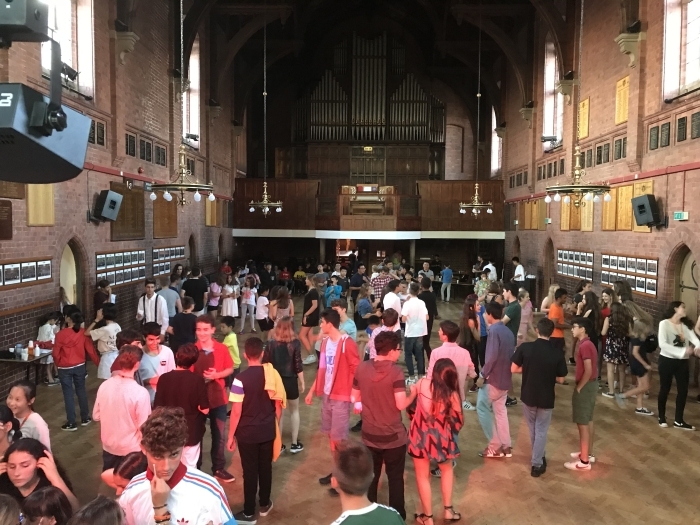 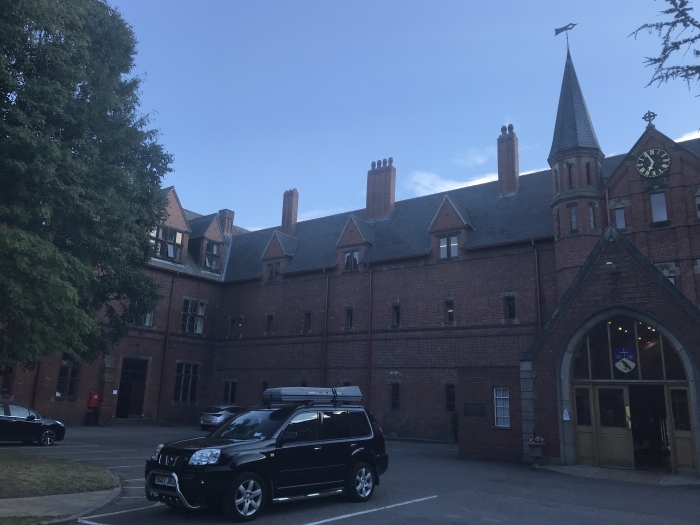 During the summer months Ellesmere College in Shropshire becomes an International Summer School for Students from Italy, Spain and France aged between 13 and 16. 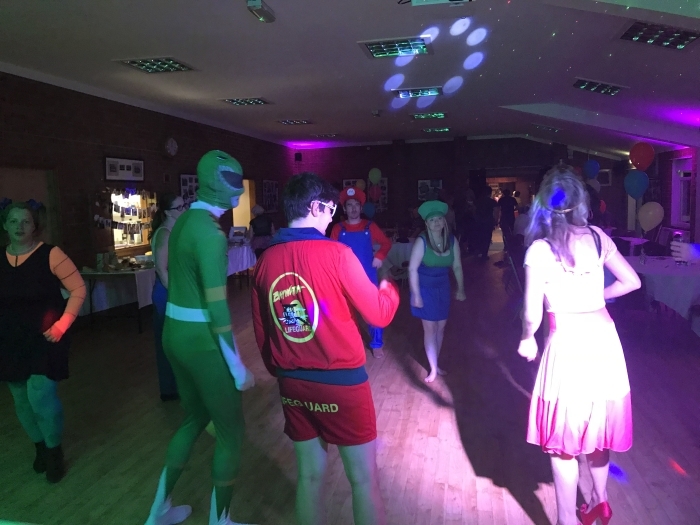 I was asked to provide the weekly disco for these children incorporating tunes they would recognise from their home countries. 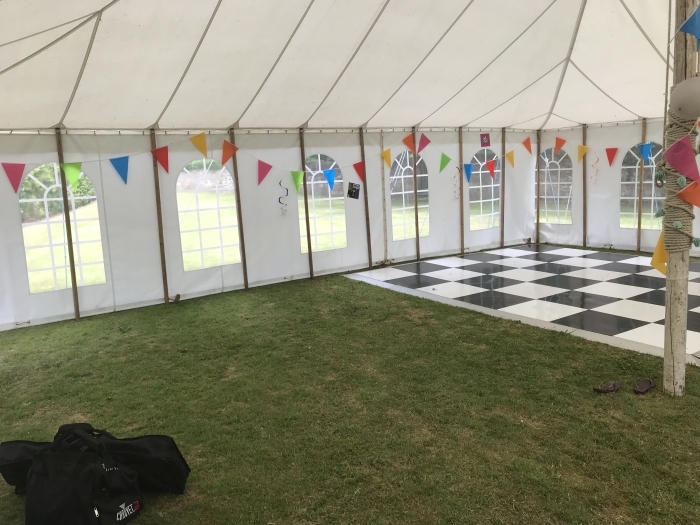 A short video made onsite. 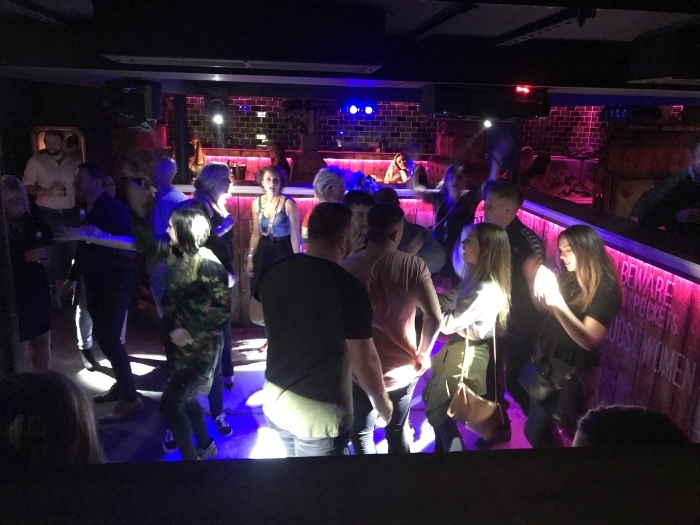 Every week the dancefloor was packed from the front of the room to the rear! 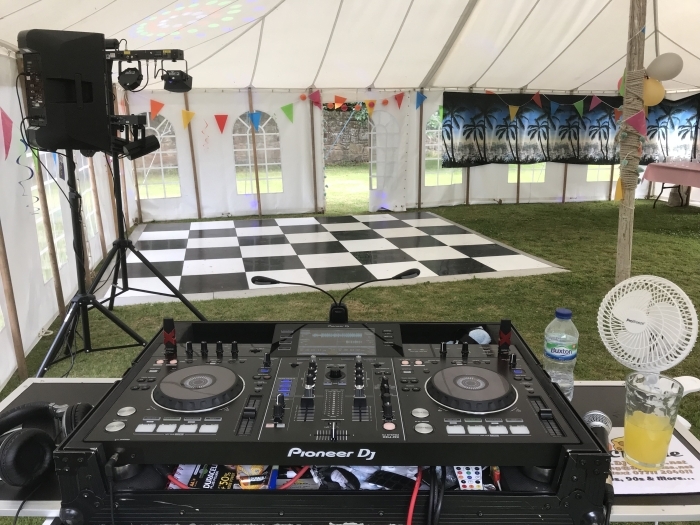 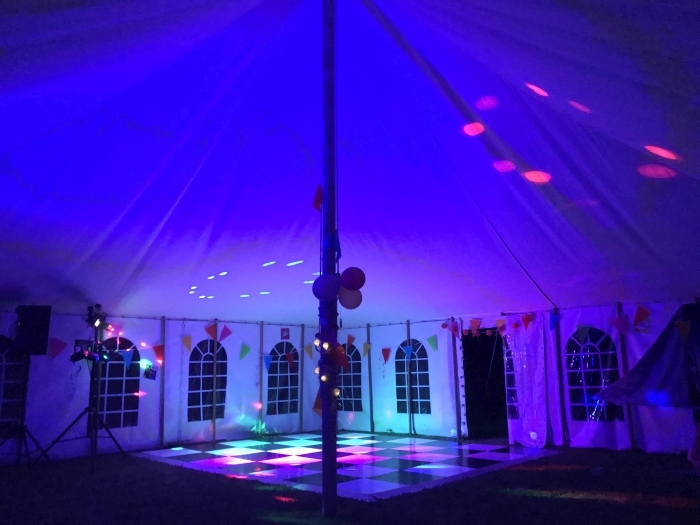 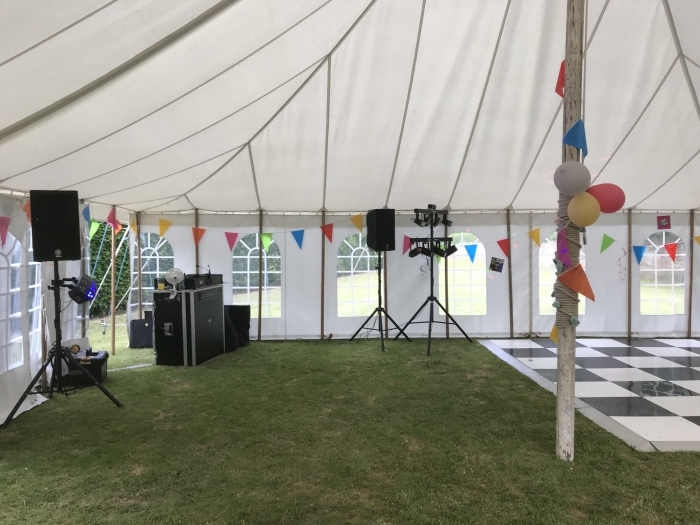 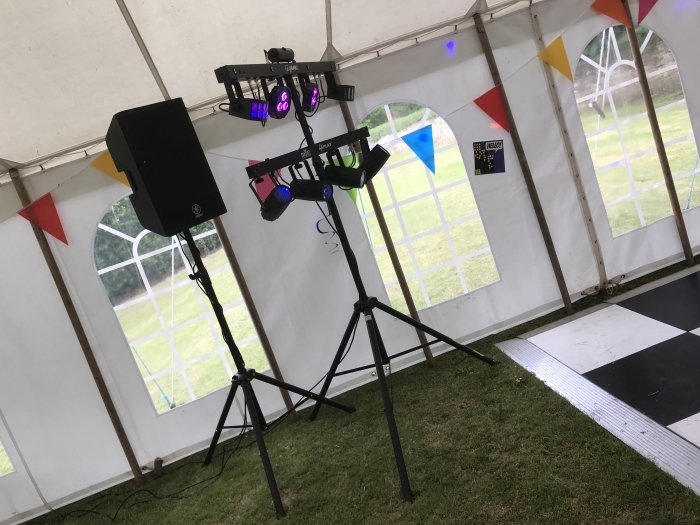 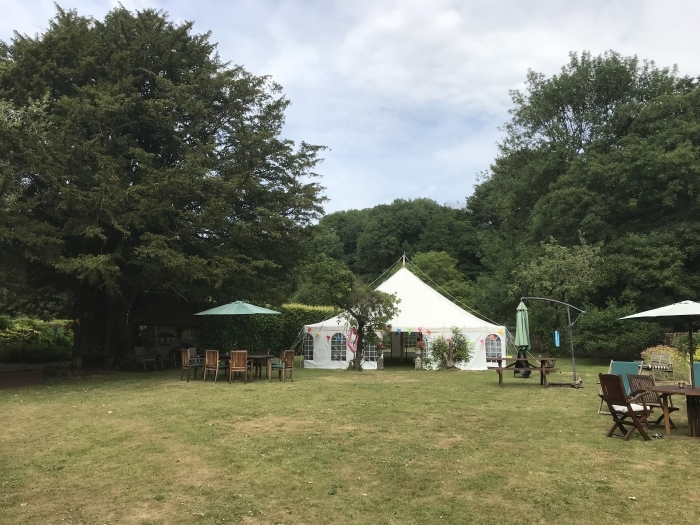 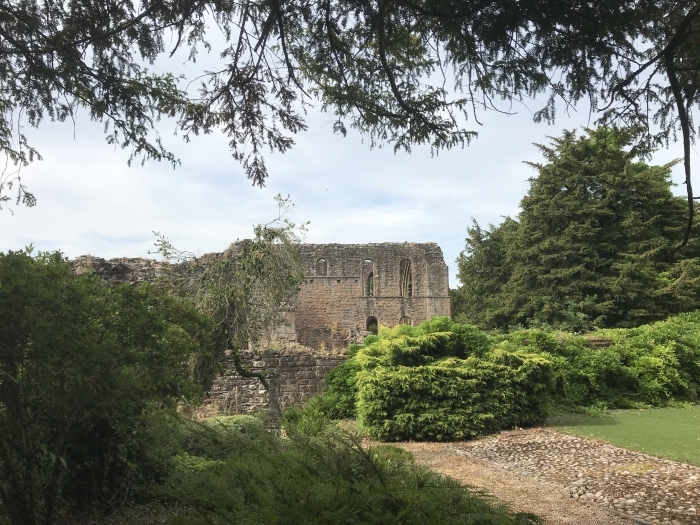 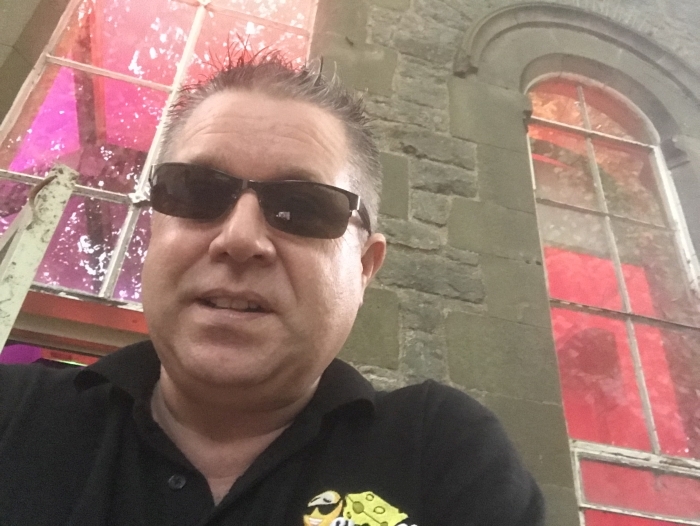 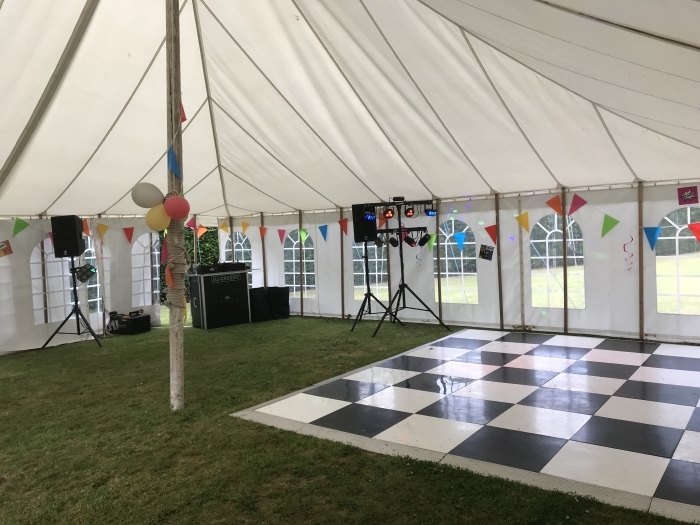 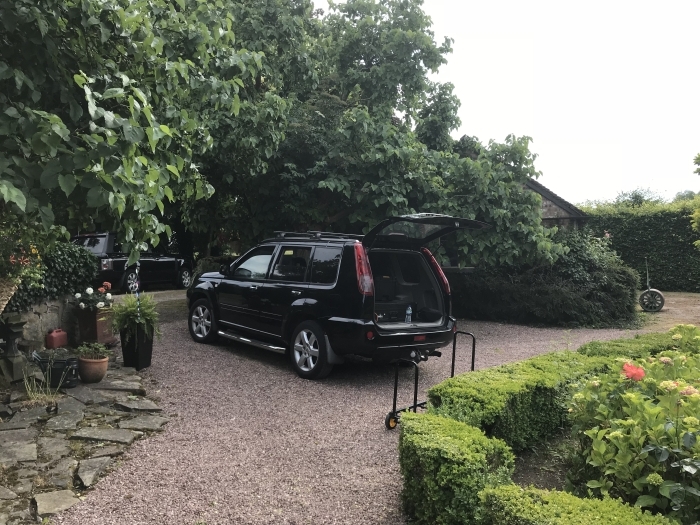 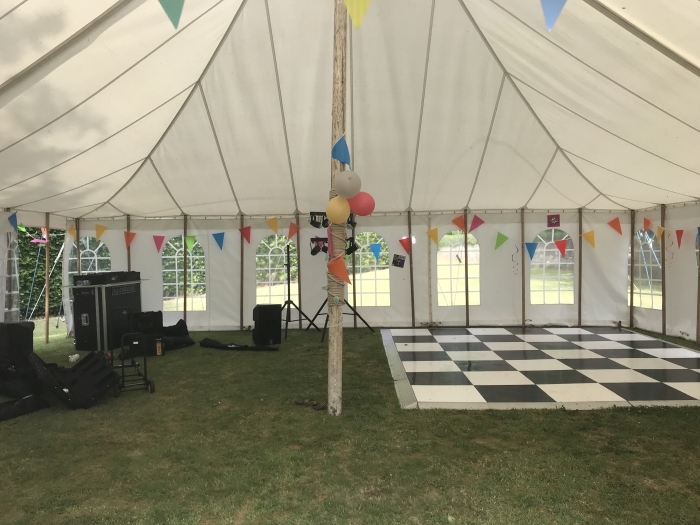 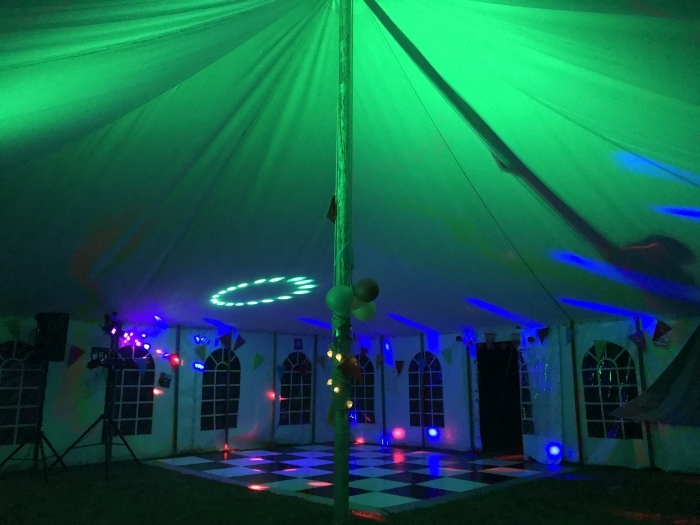 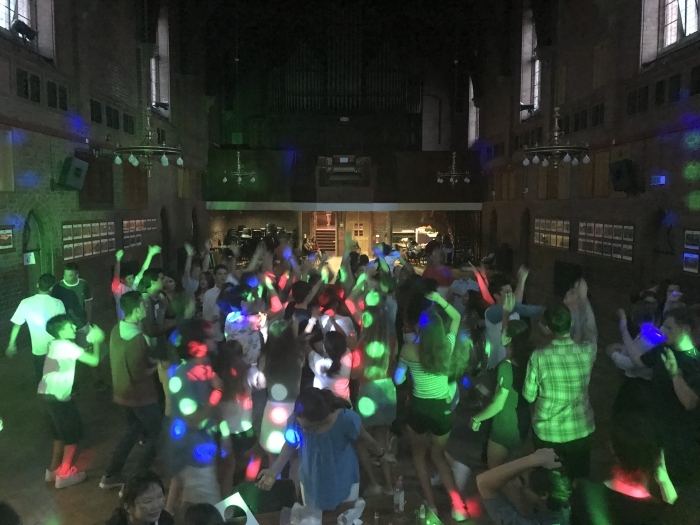 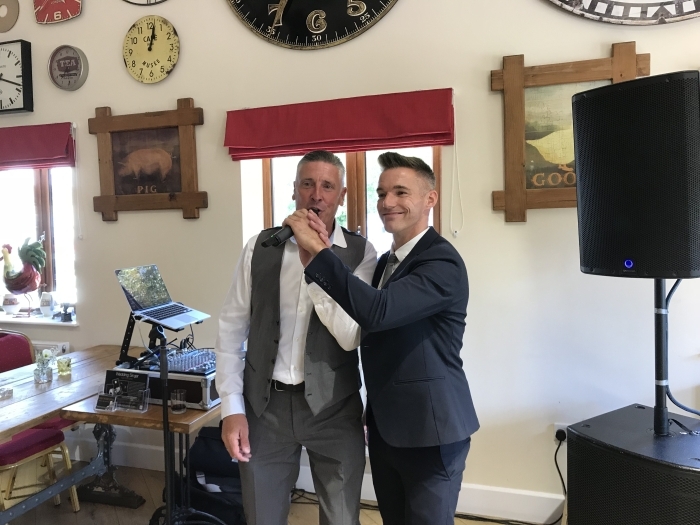 Sunday 1st July 2018 was an evening of DJing for a 14th Birthday Party in a Marquee in grounds overlooking Lilleshall Abbey. 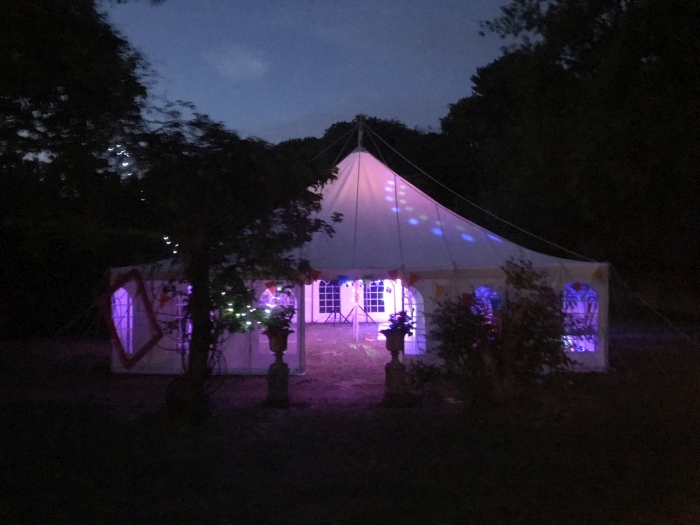 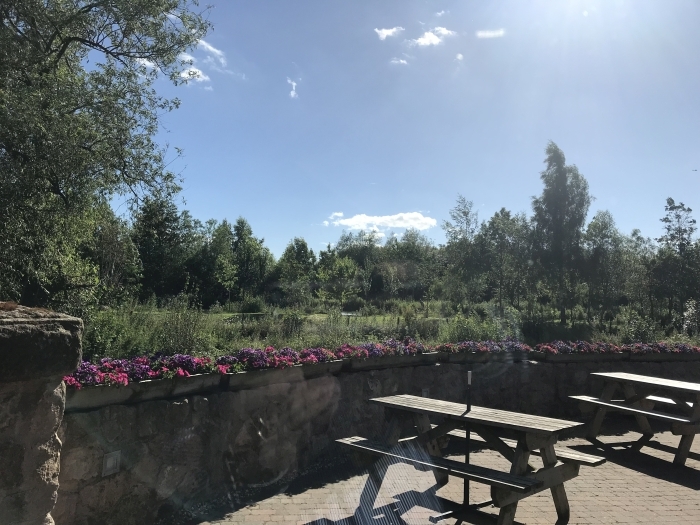 It was a hot summers evening and the location was perfect for the event. 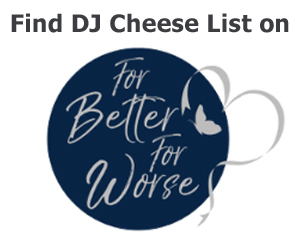 I was provided with a list of must play tunes in advance and also a request list during the evening. 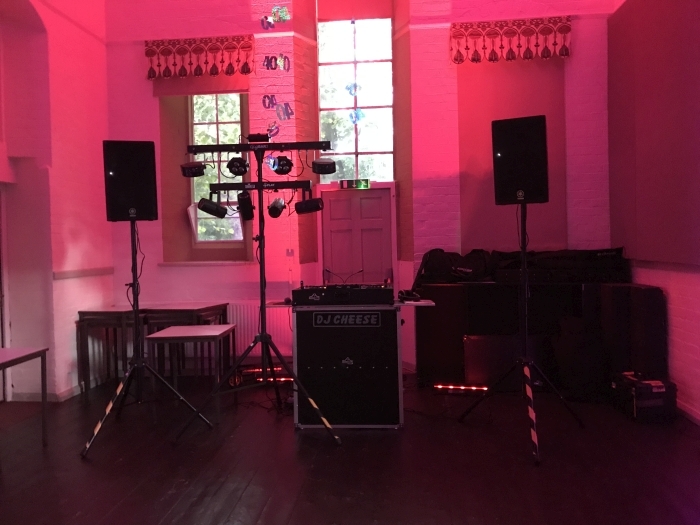 I am only able to show setup images as it was requested that I don’t show and pictures of the guests. 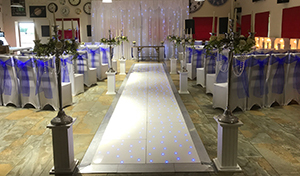 The second video is a walk through and talk video running through equipment used and information. 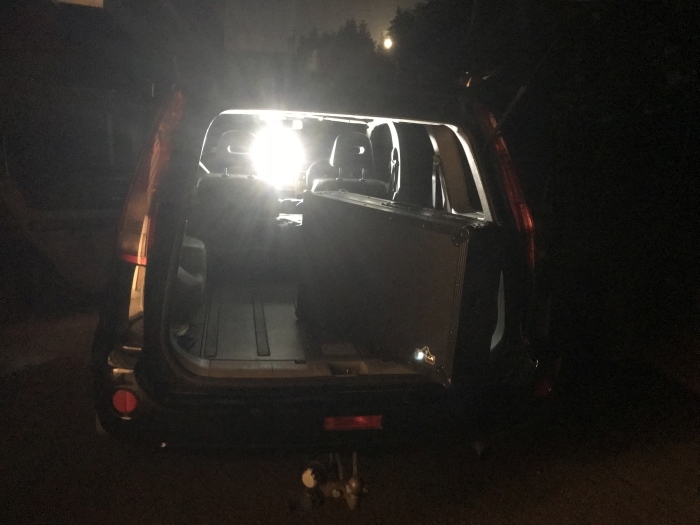 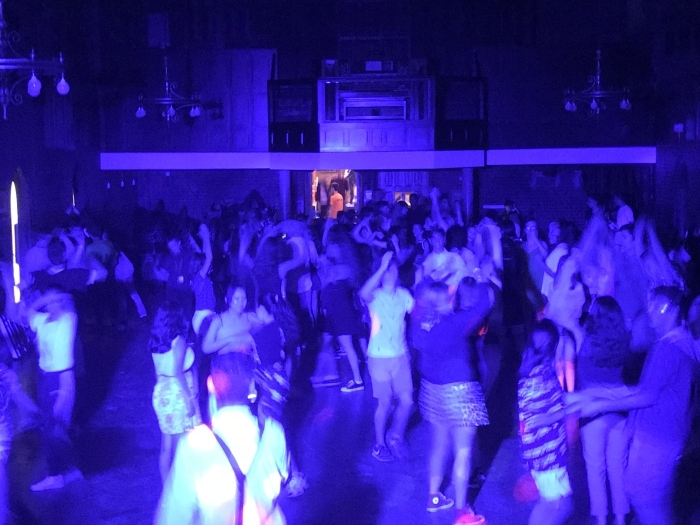 This third video shows what the lighting looked like once the venue was dark. 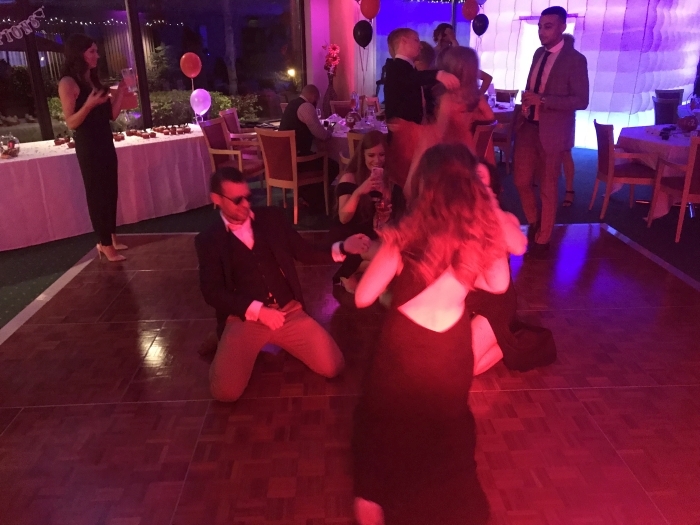 I was able to take this video once the party had ended as it had a 10pm finish. 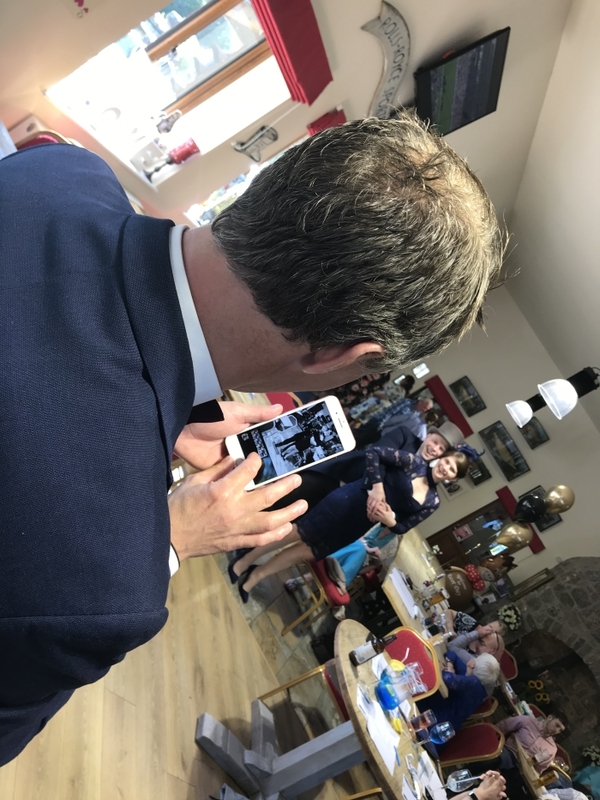 This is a selection of photos from the event. 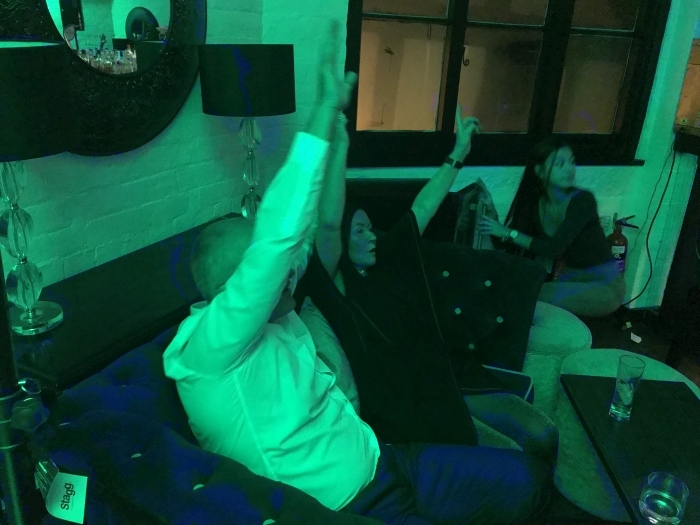 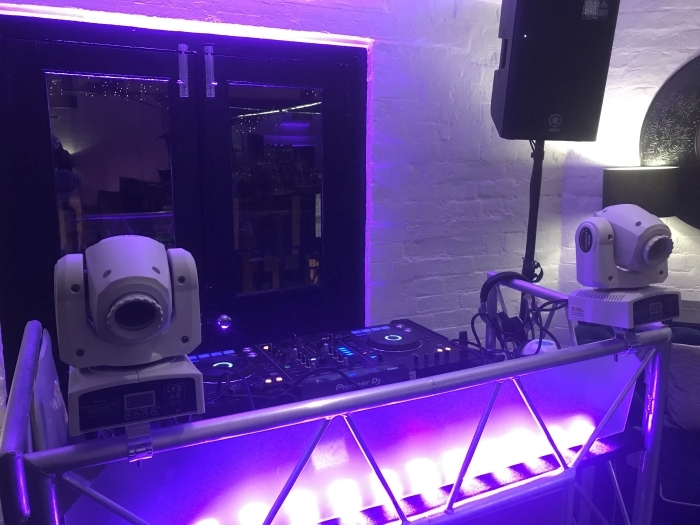 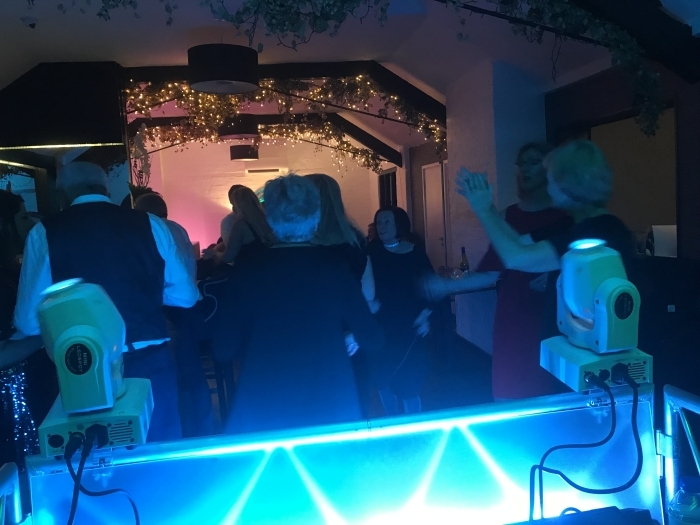 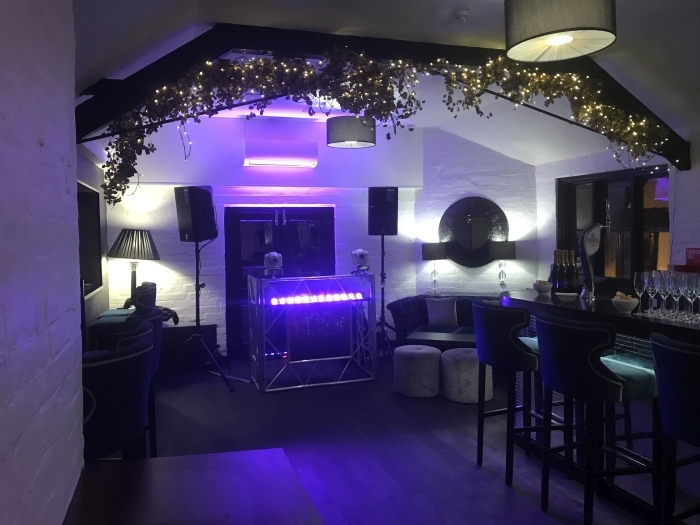 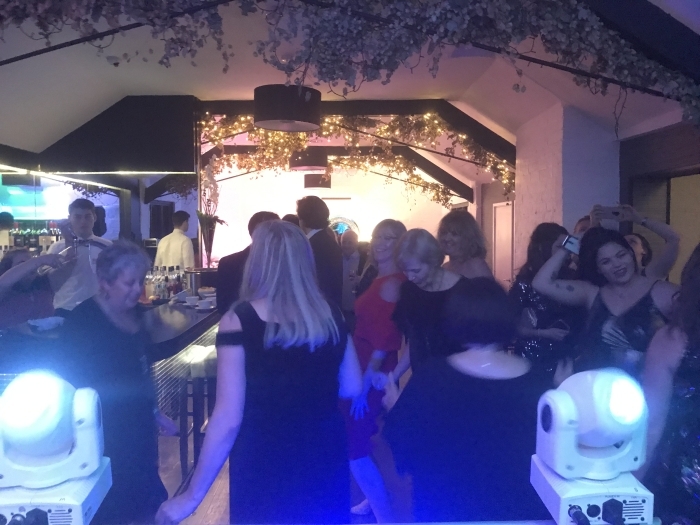 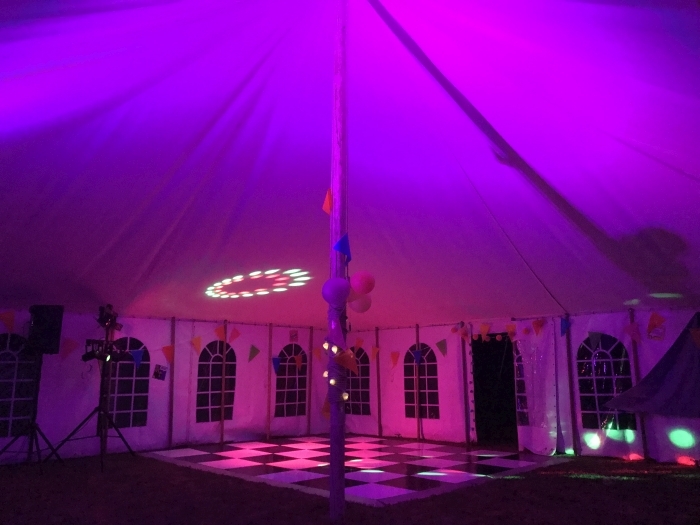 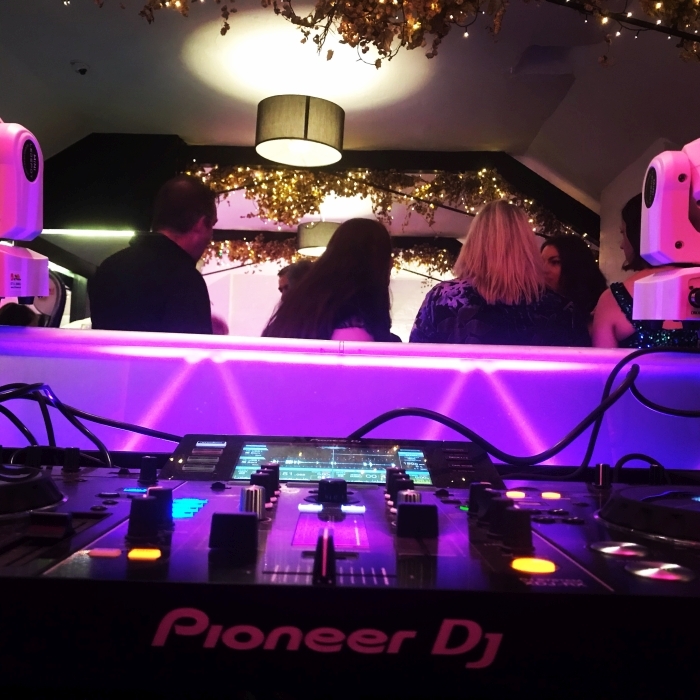 The client had opted for my compact setup for this event, but as you can see from the images that did not reduce the wow factor provided by my DJ Disco lighting. 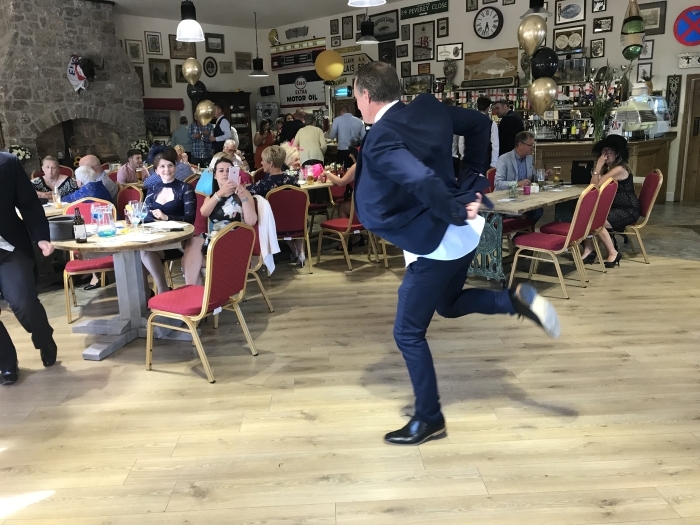 This picture is one of my favourites from this event. 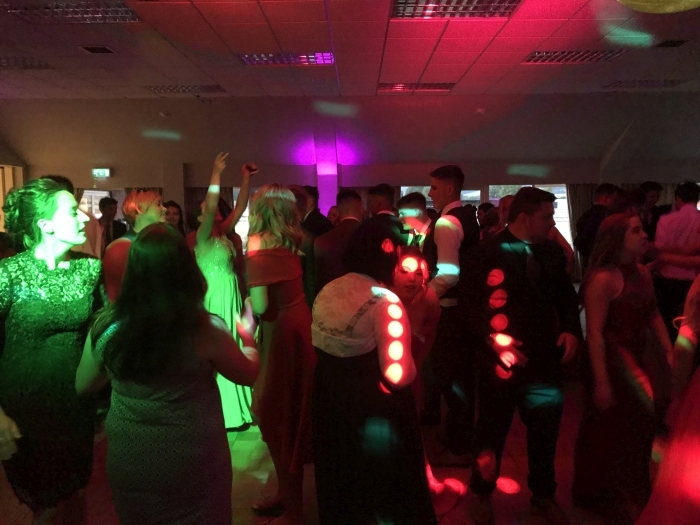 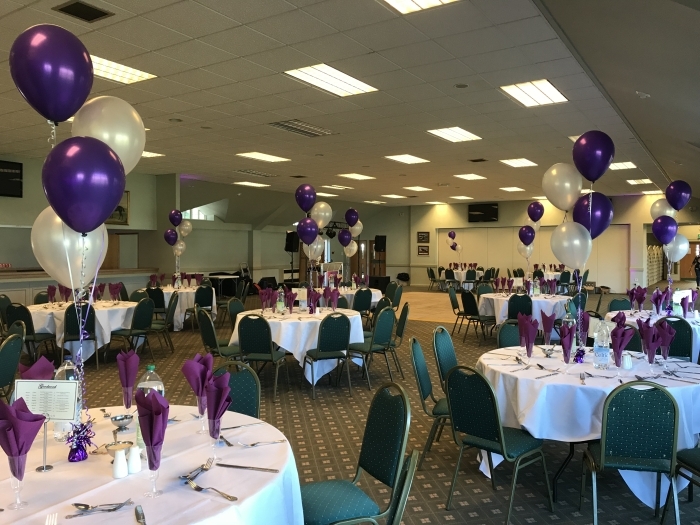 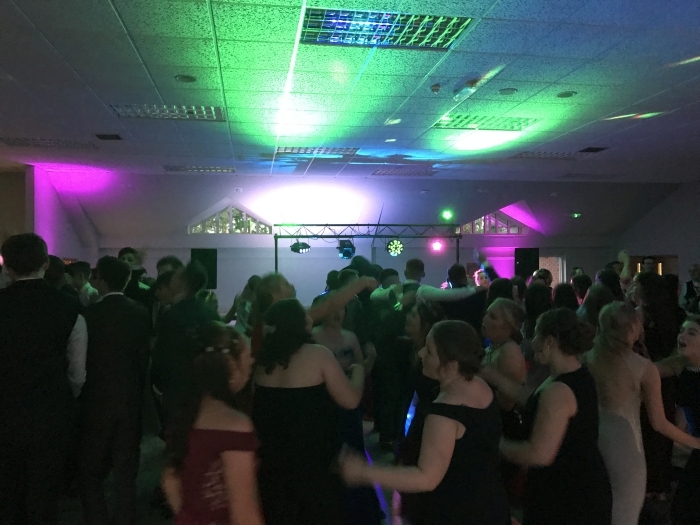 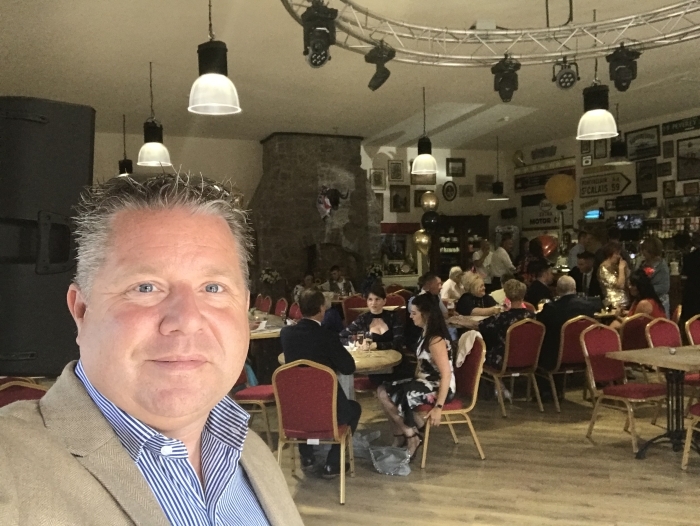 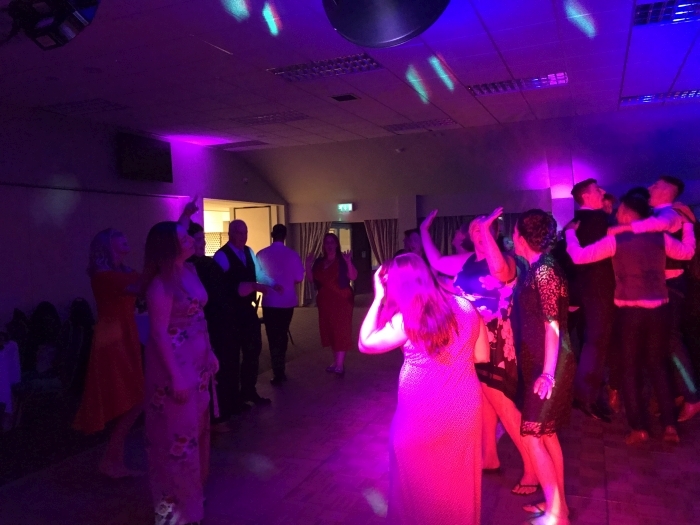 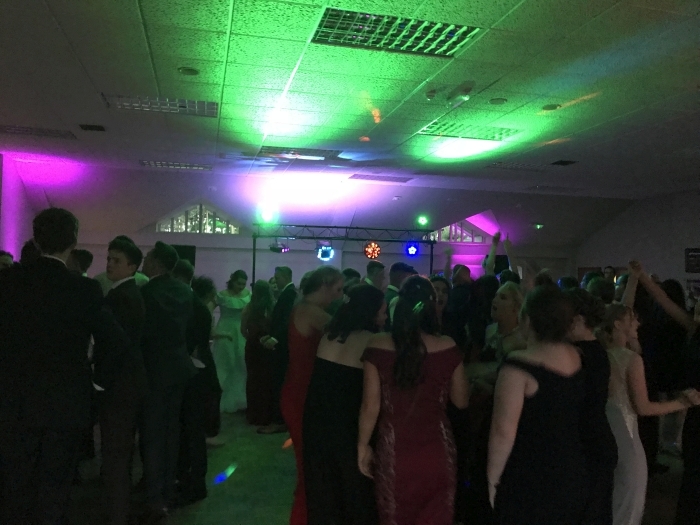 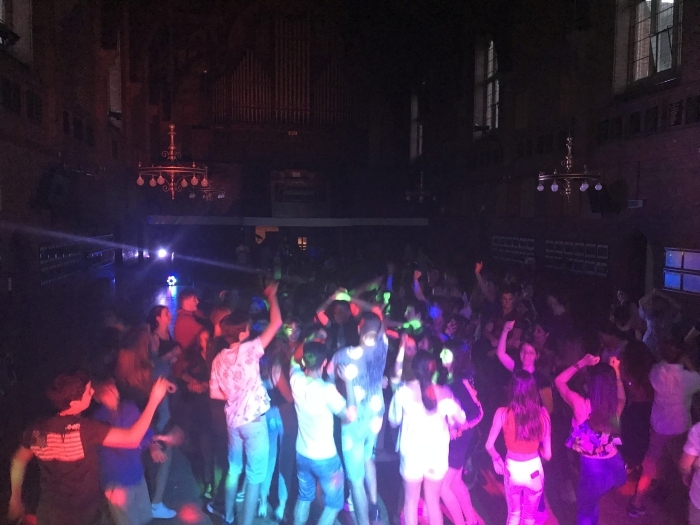 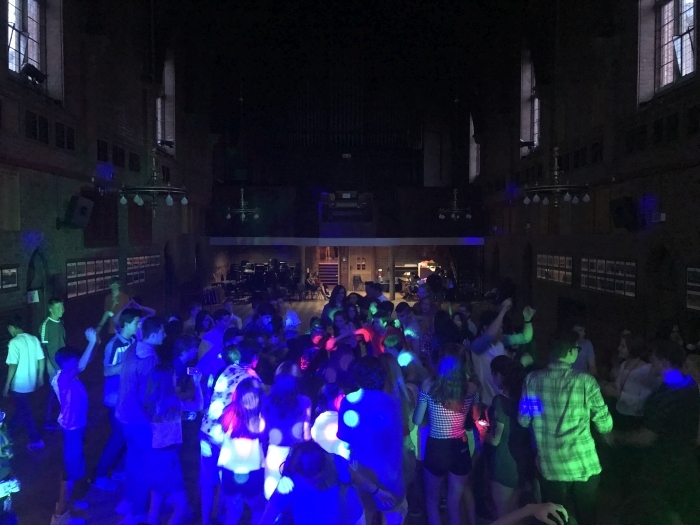 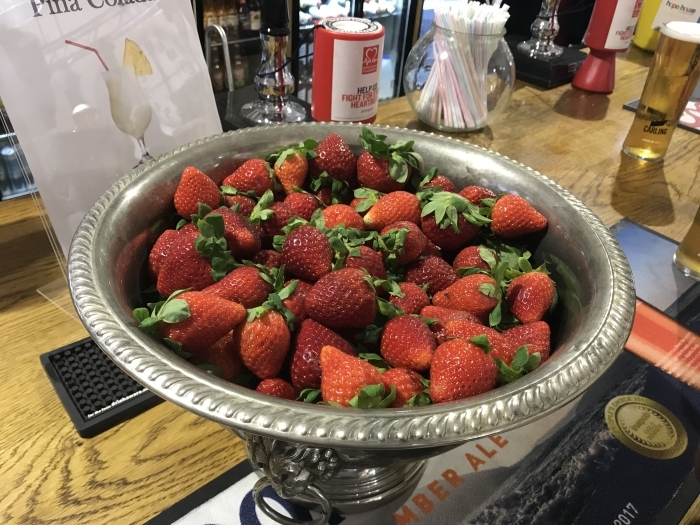 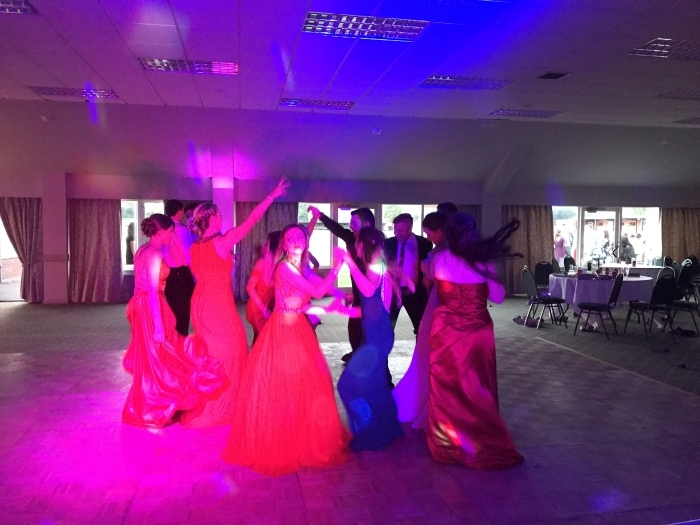 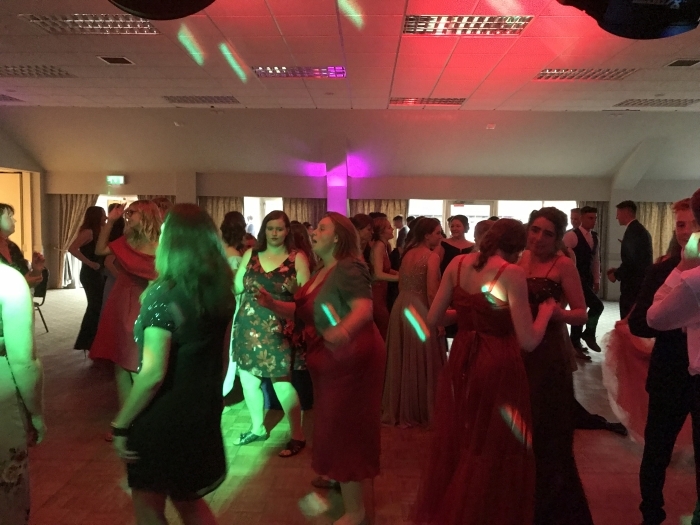 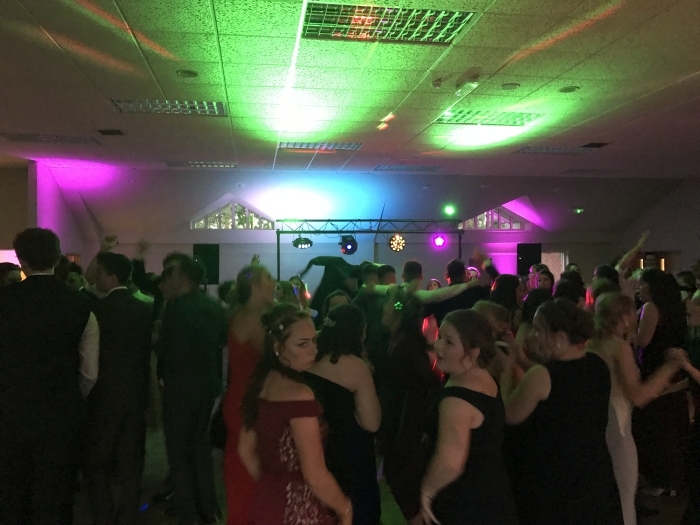 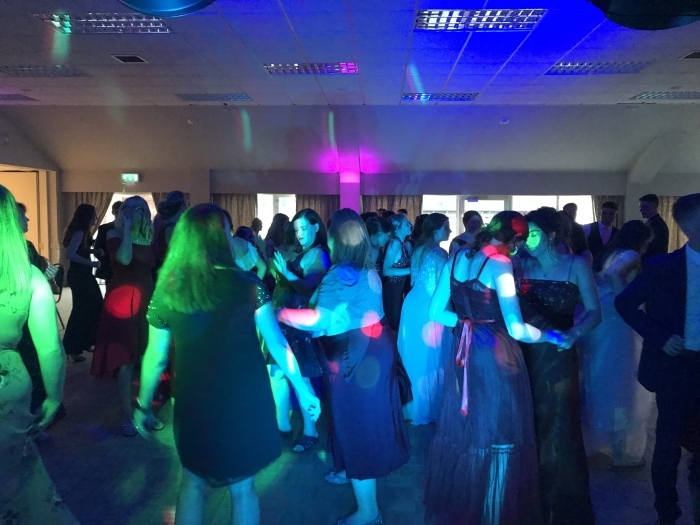 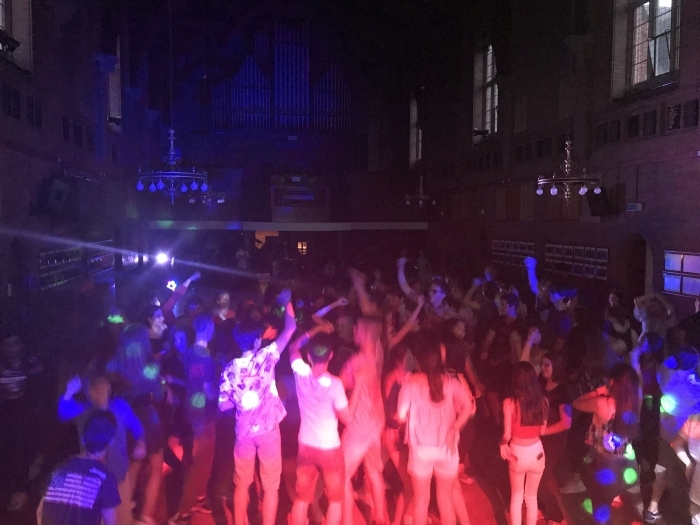 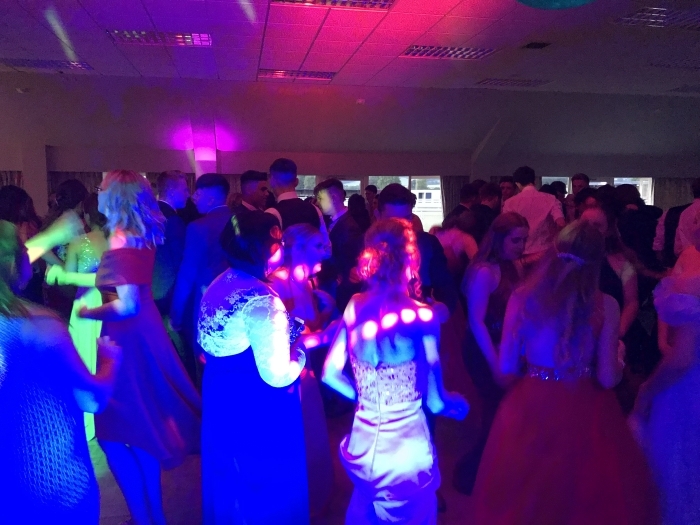 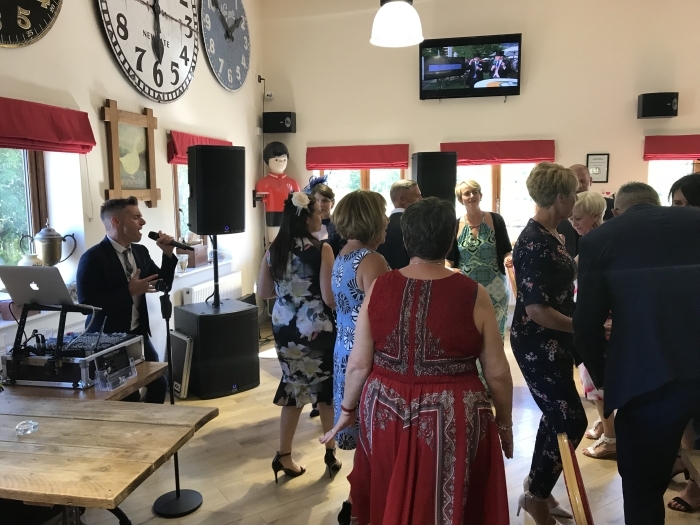 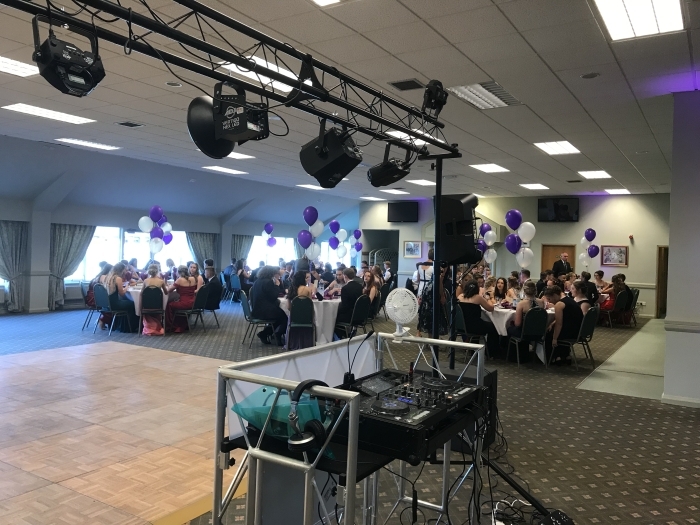 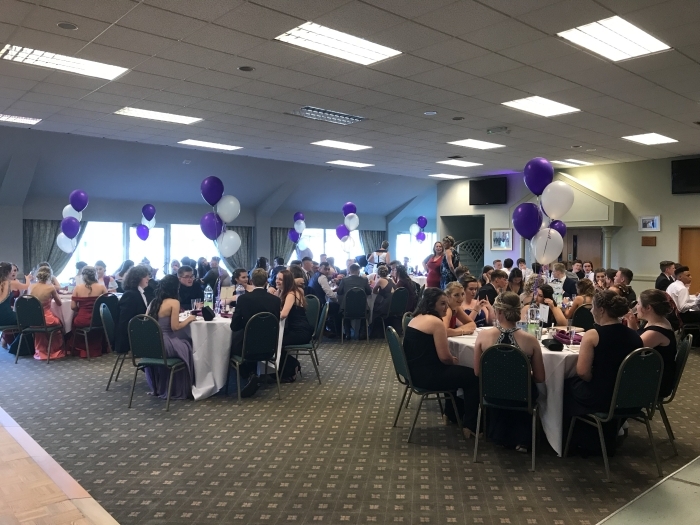 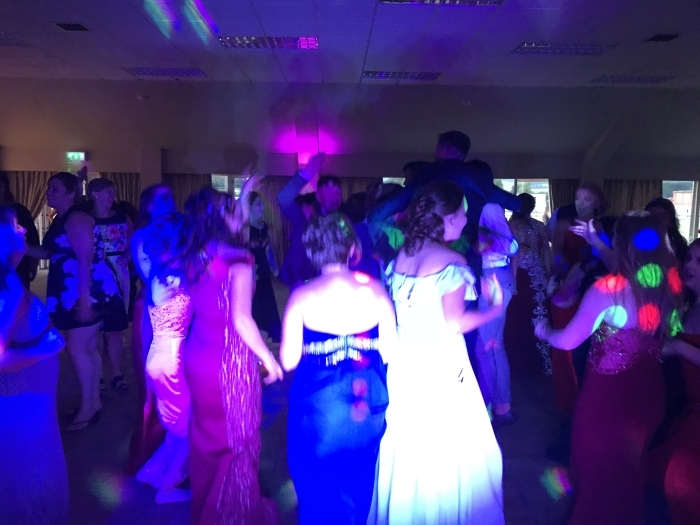 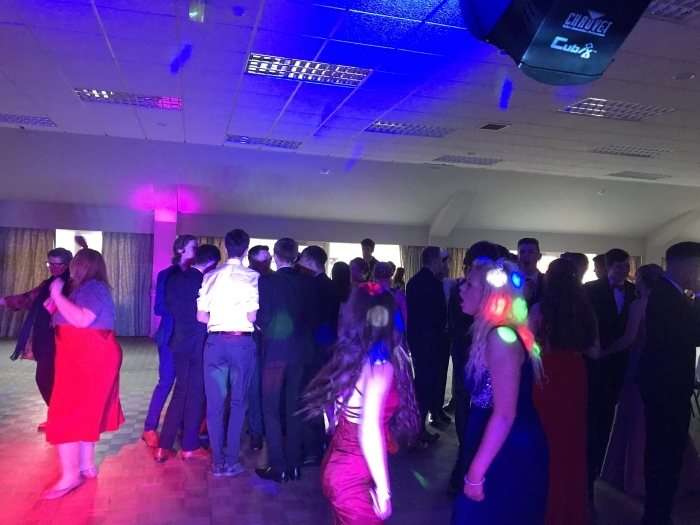 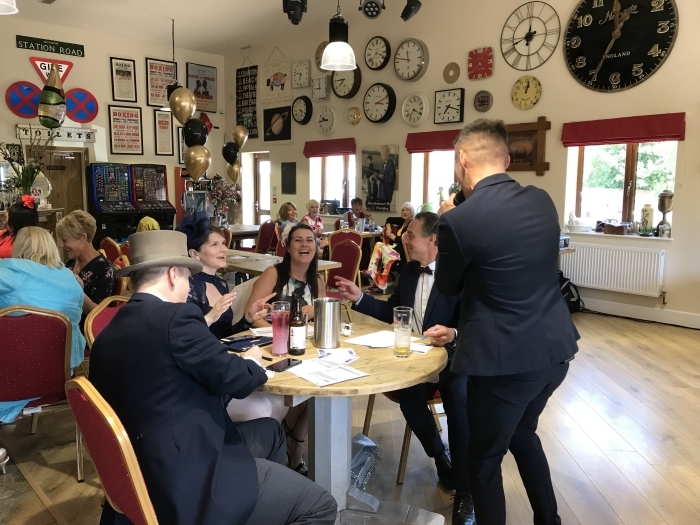 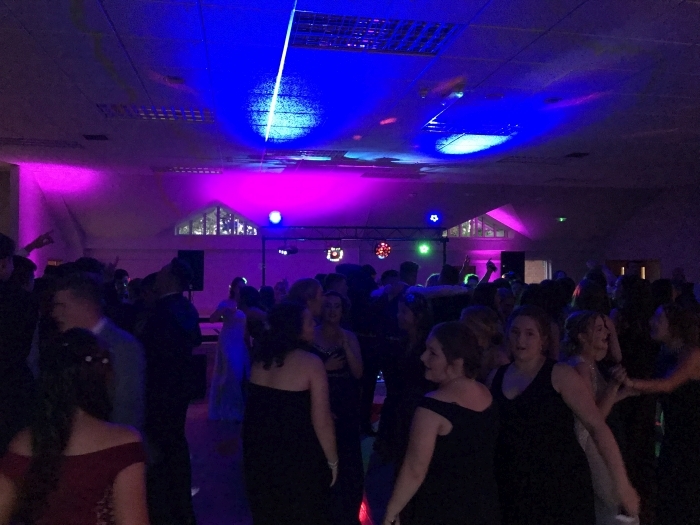 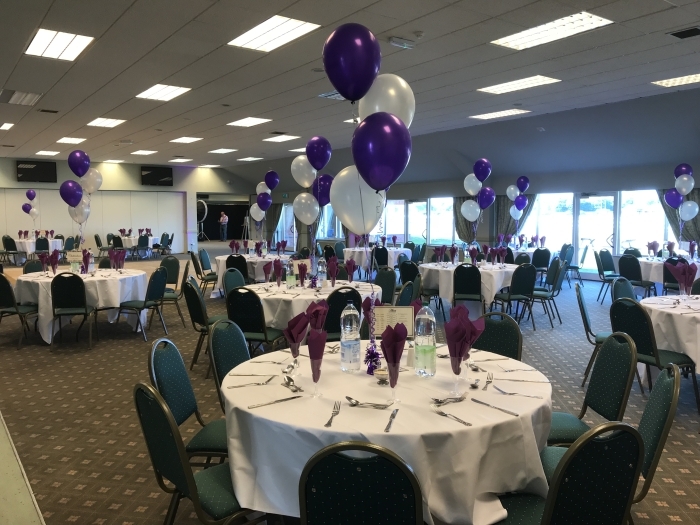 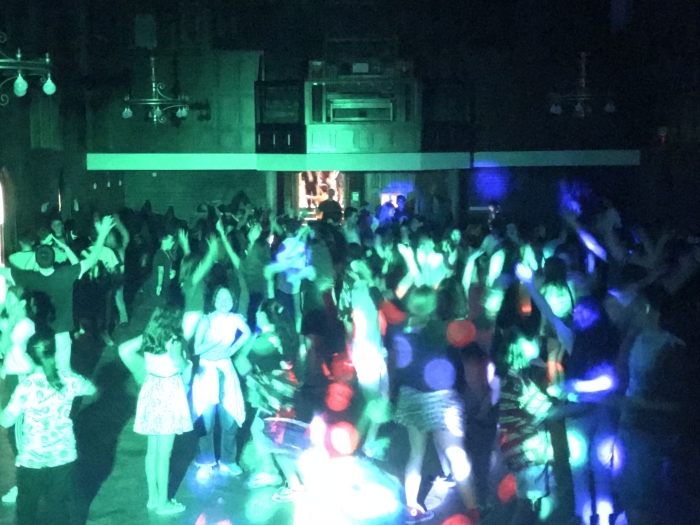 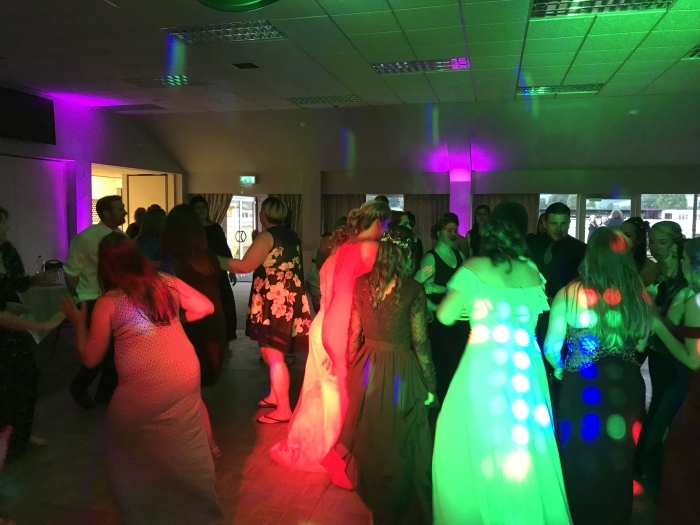 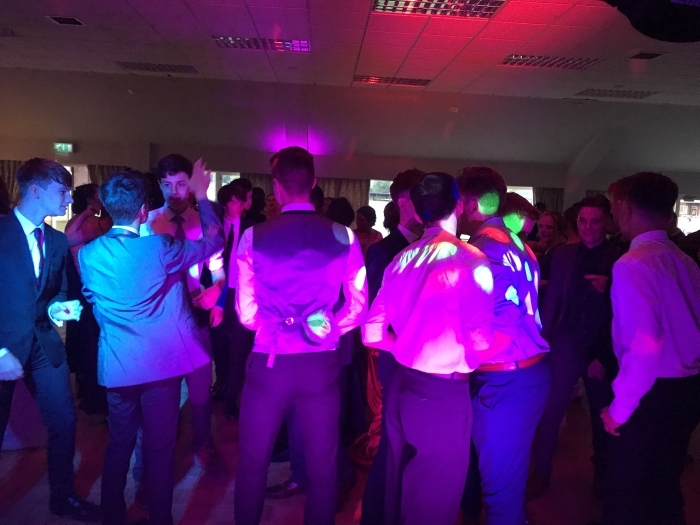 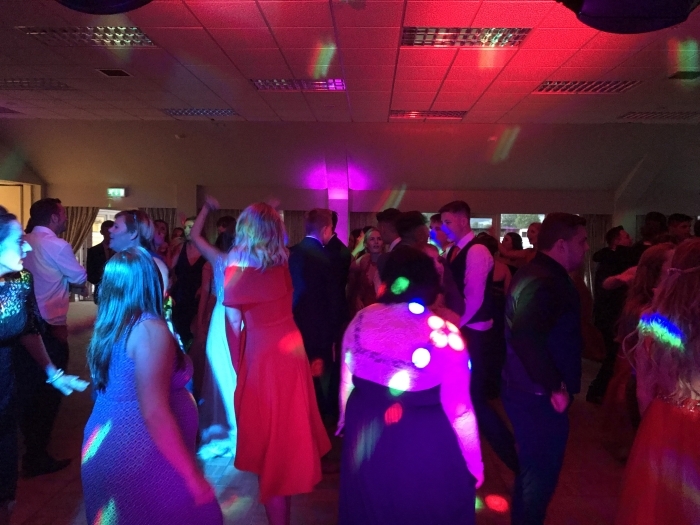 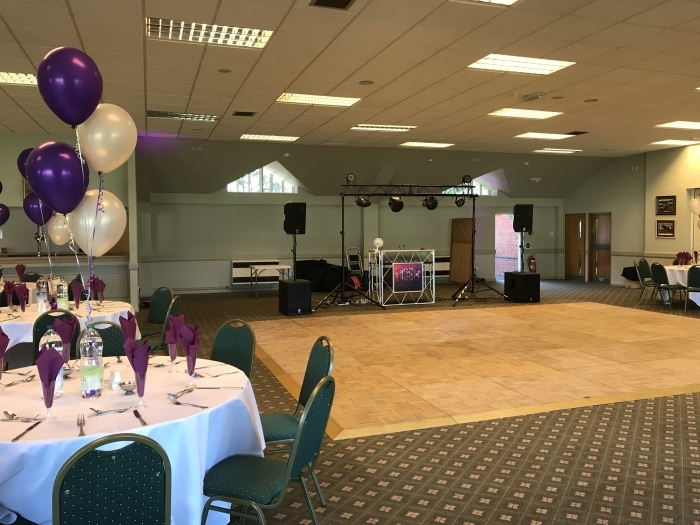 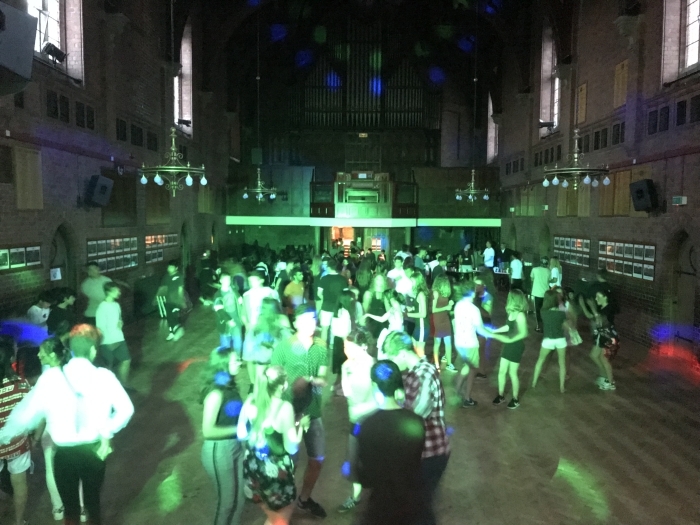 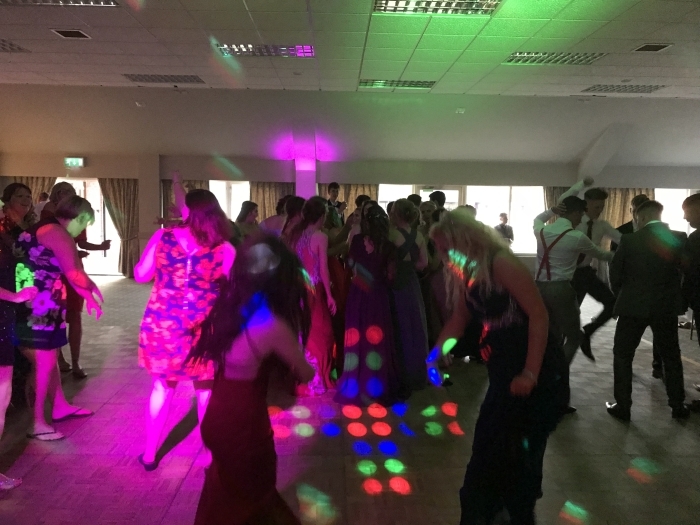 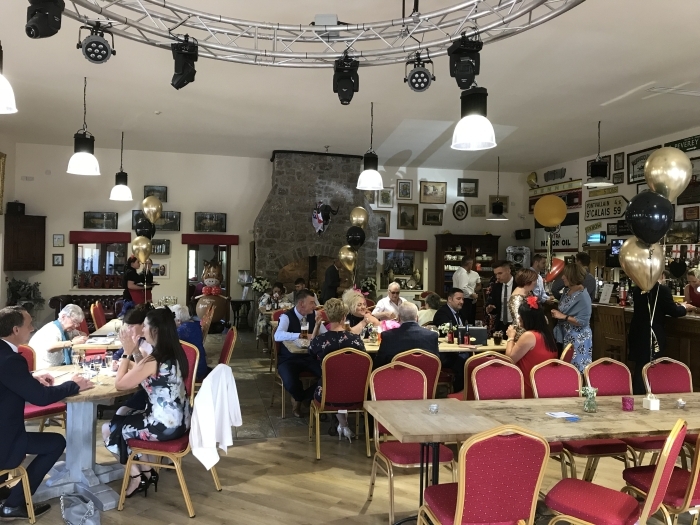 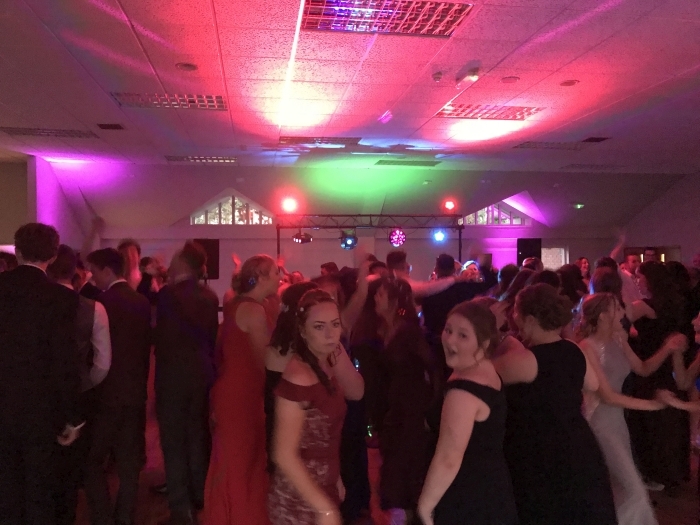 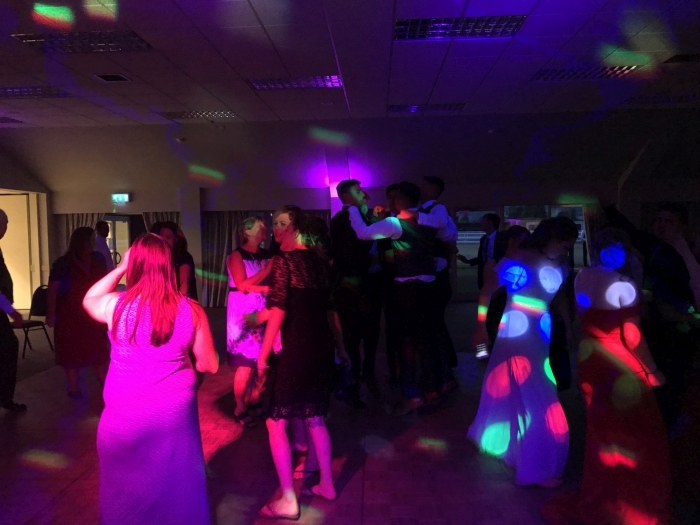 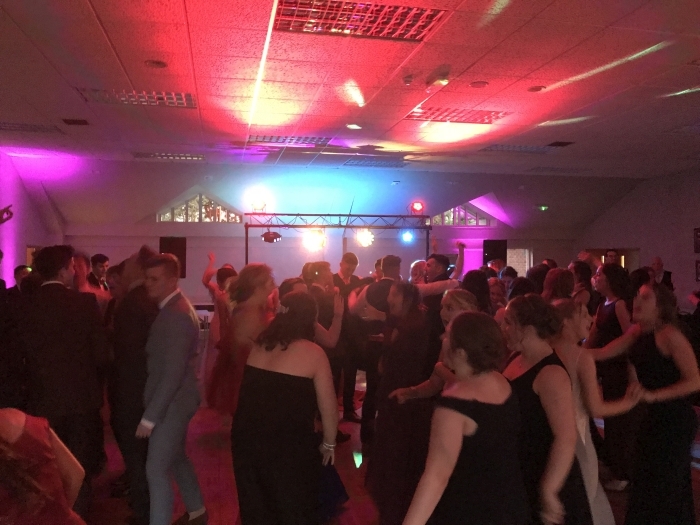 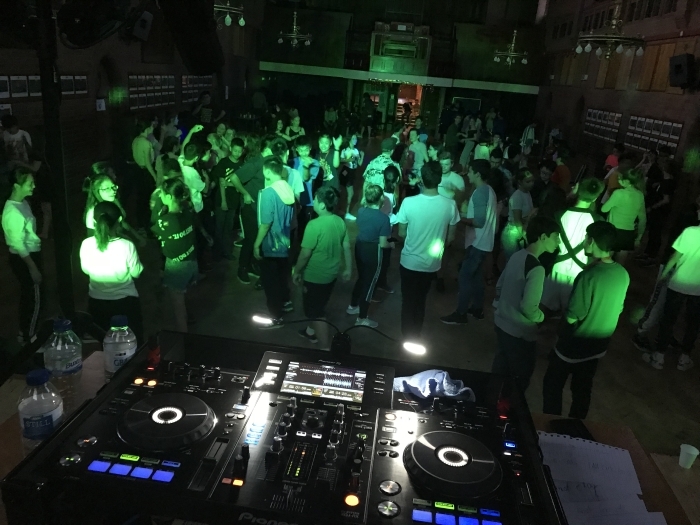 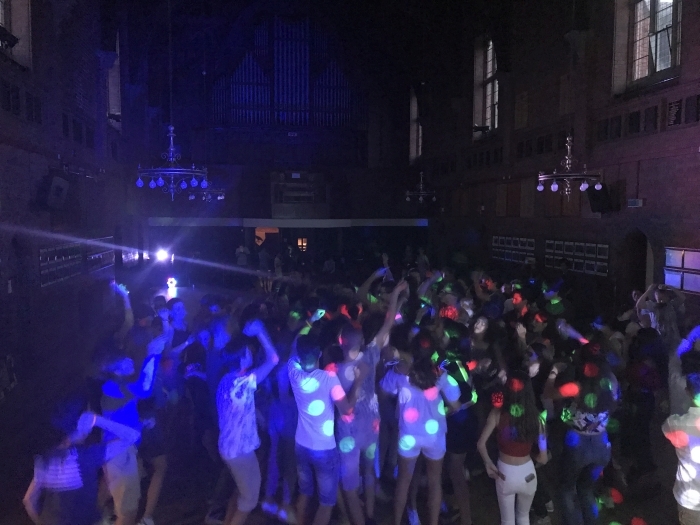 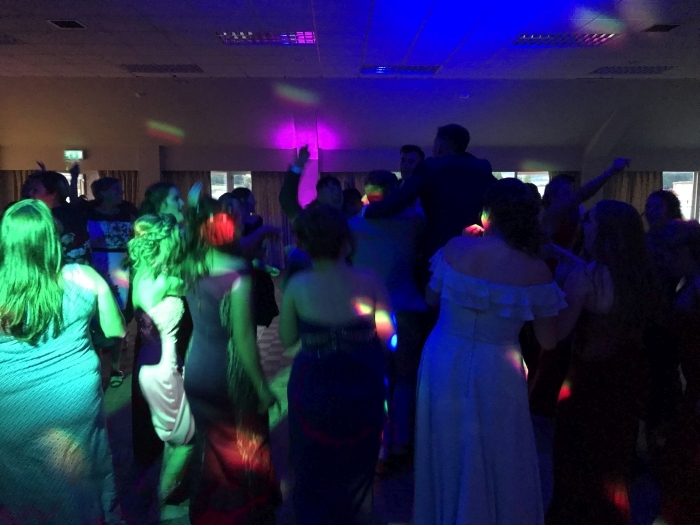 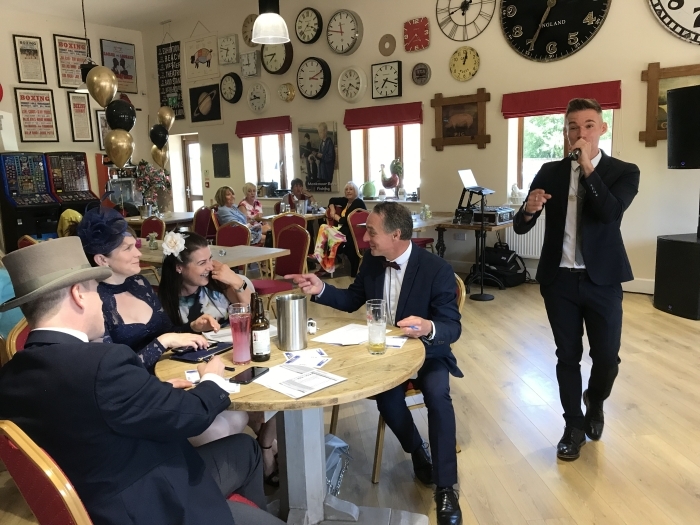 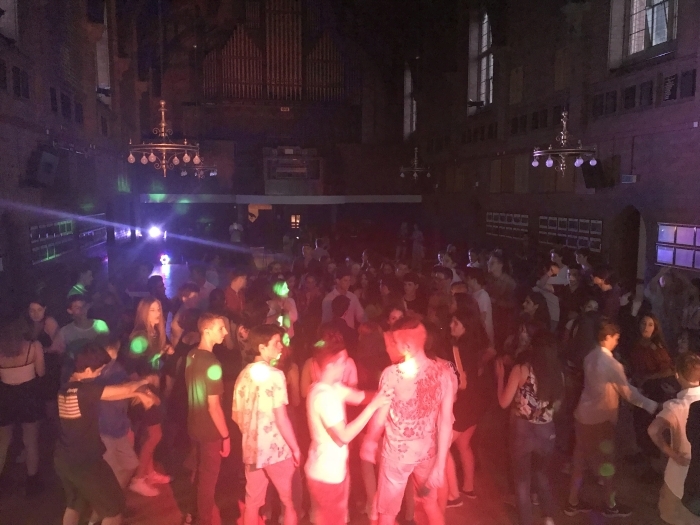 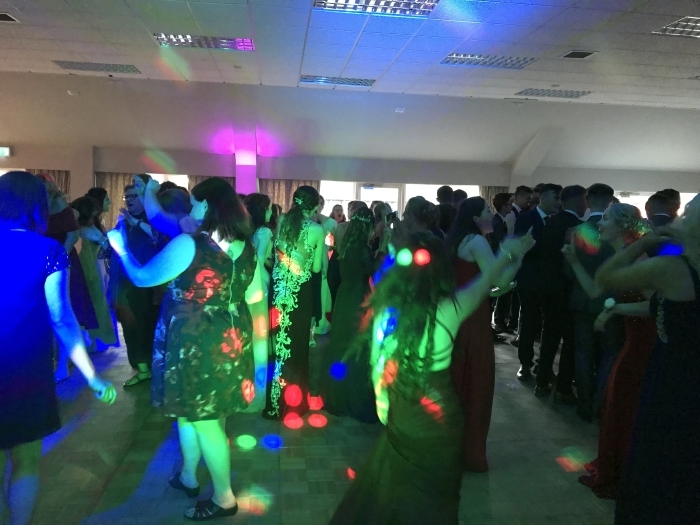 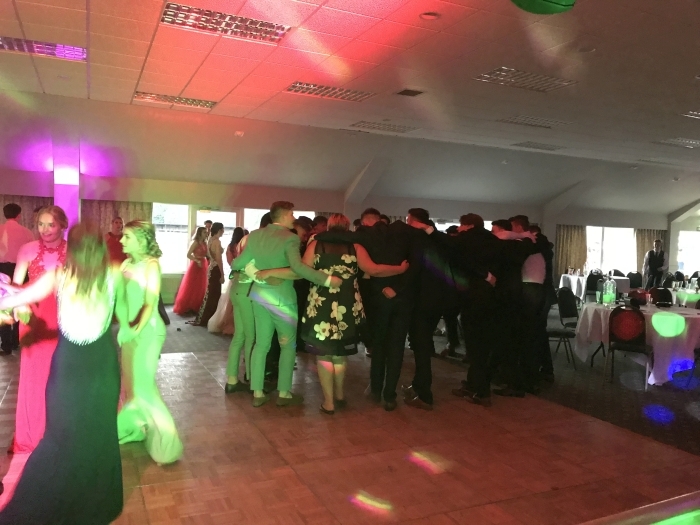 Friday 29th June 2018 was School Prom night for Ludlow High School at the Ludlow Racecourse and I was asked to provide the Disco for the second year running. 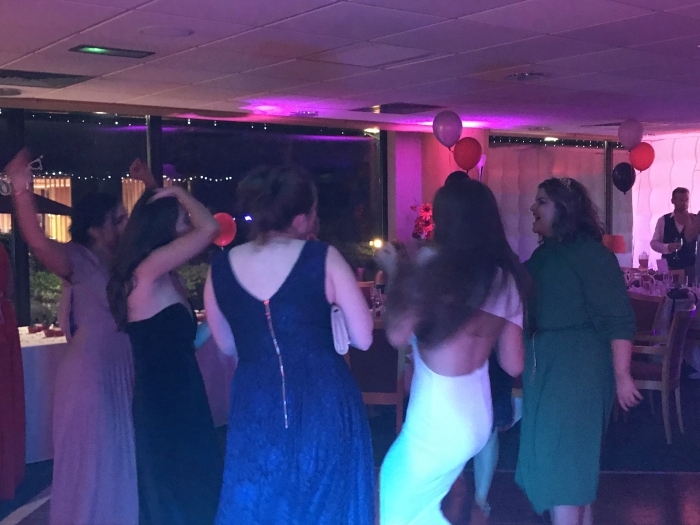 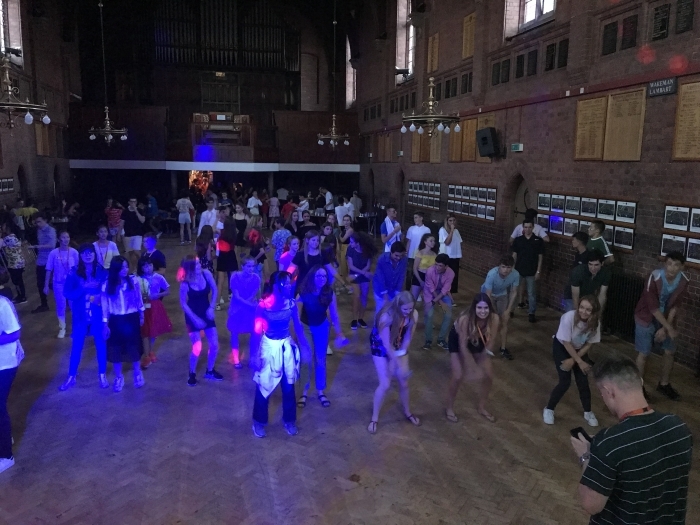 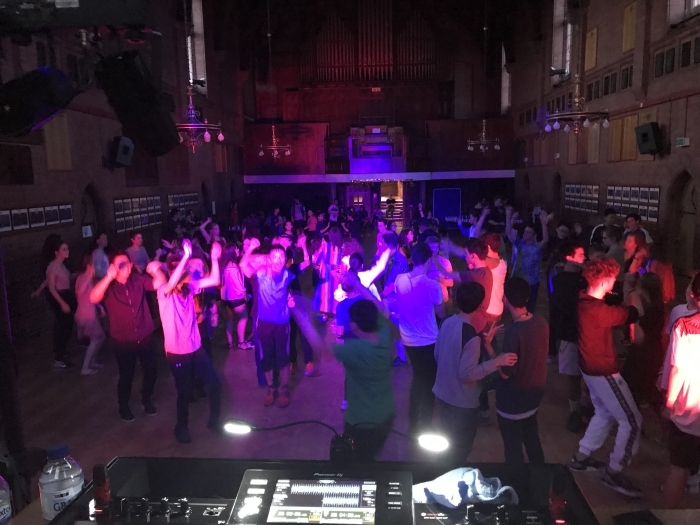 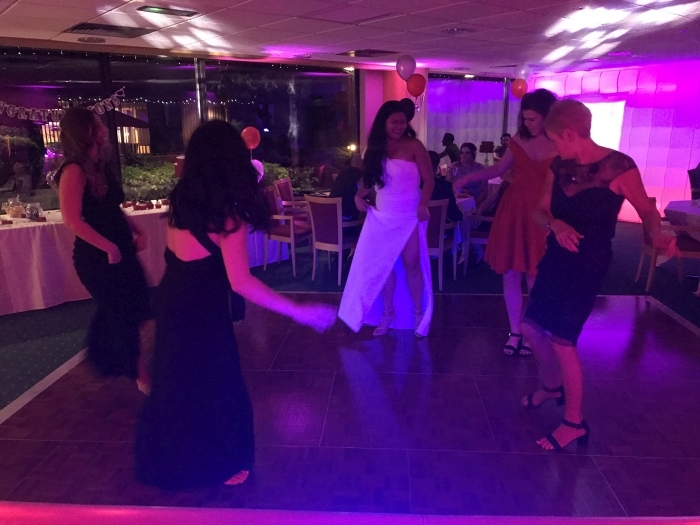 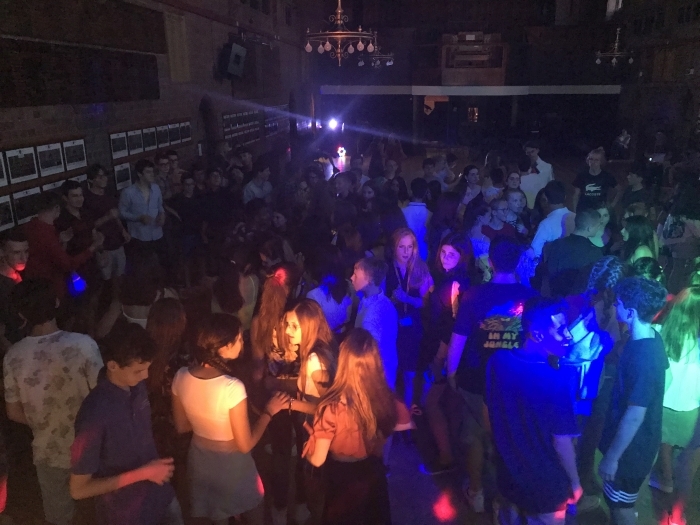 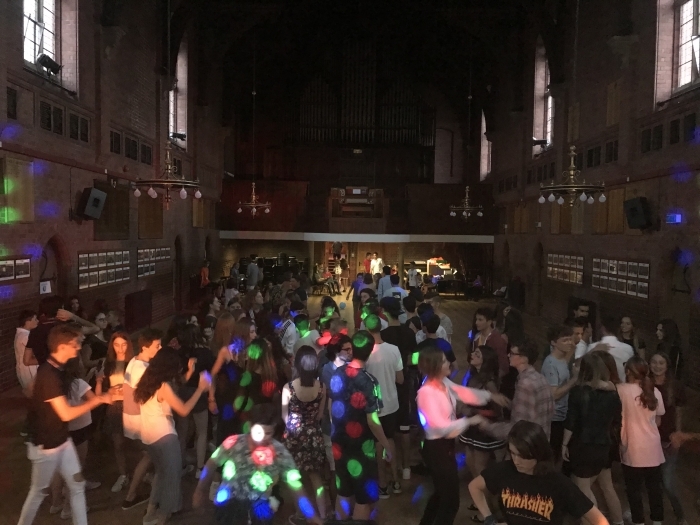 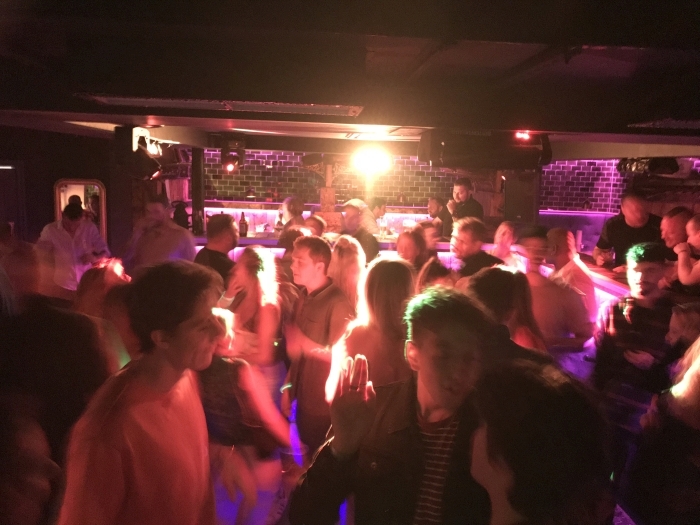 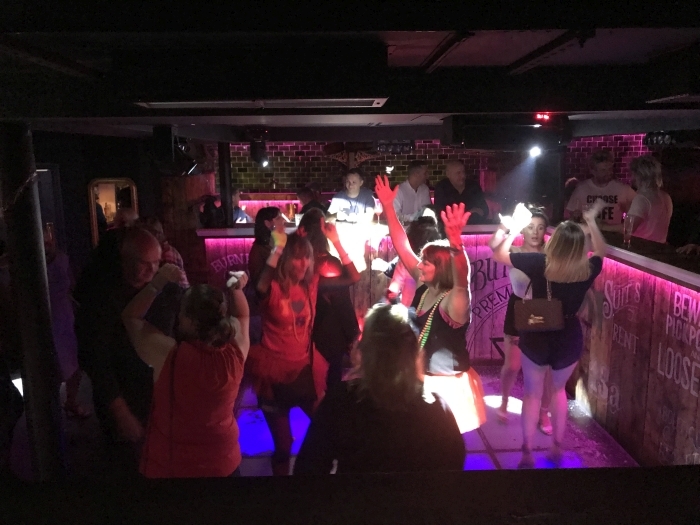 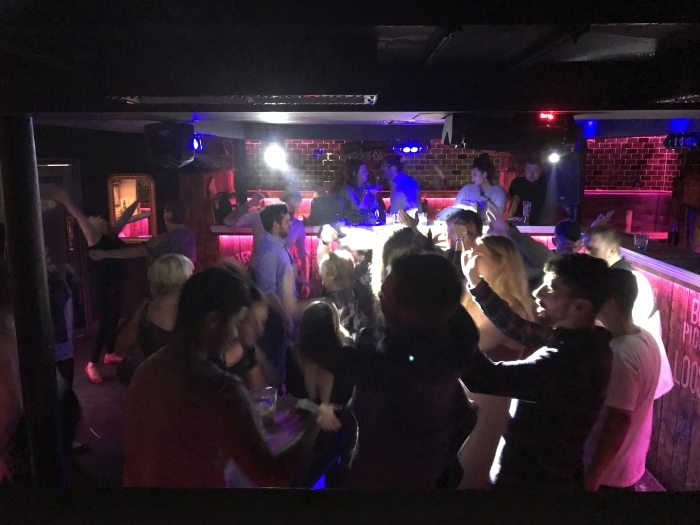 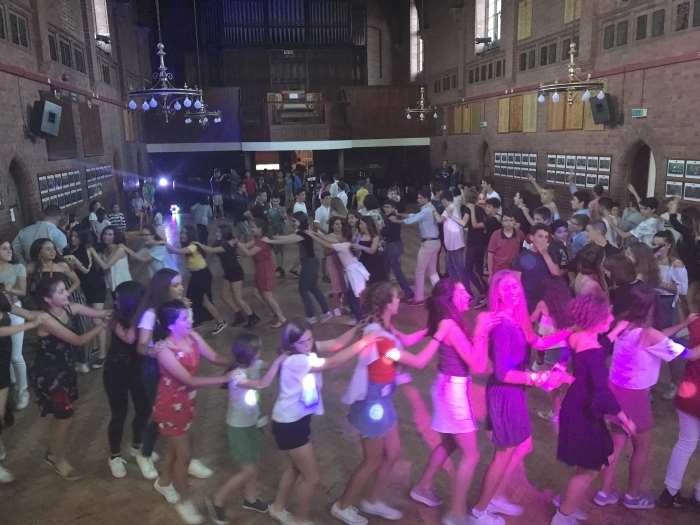 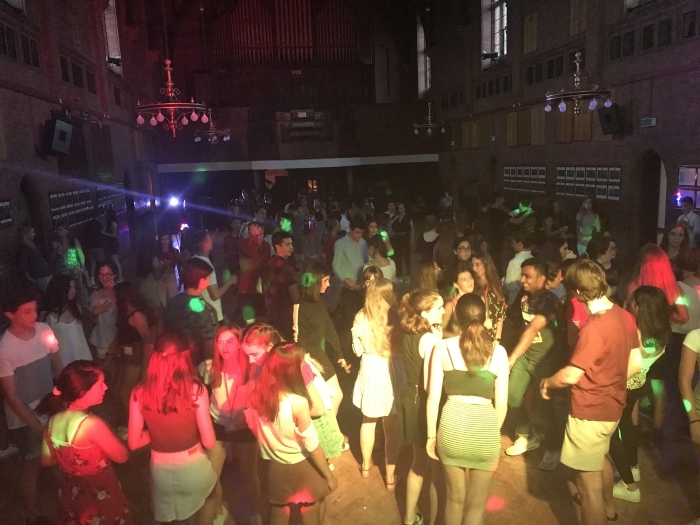 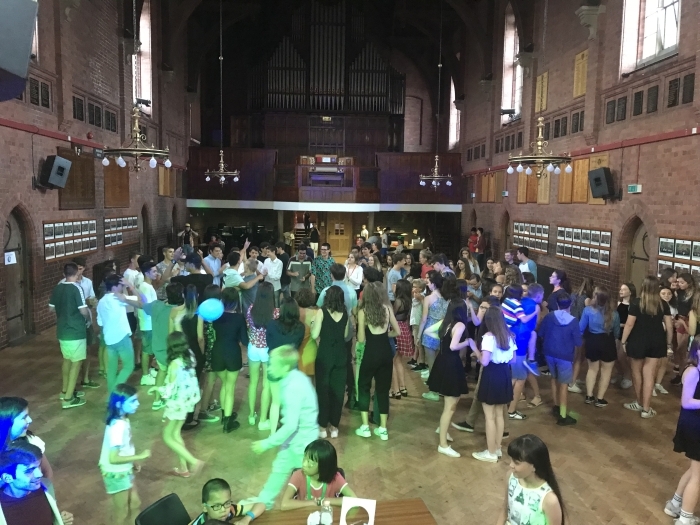 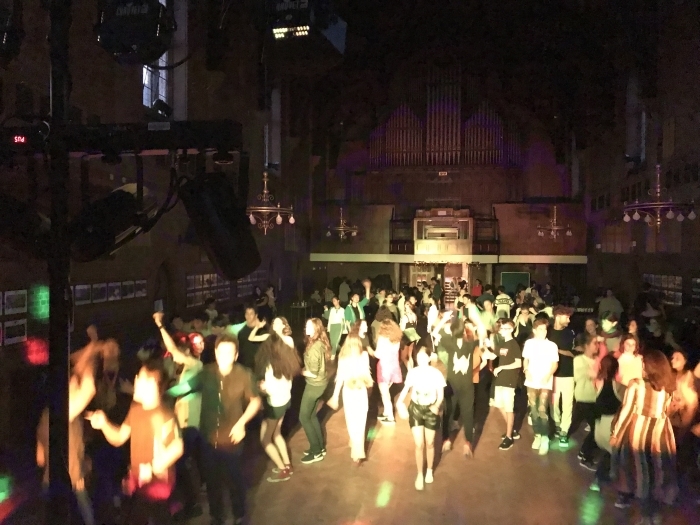 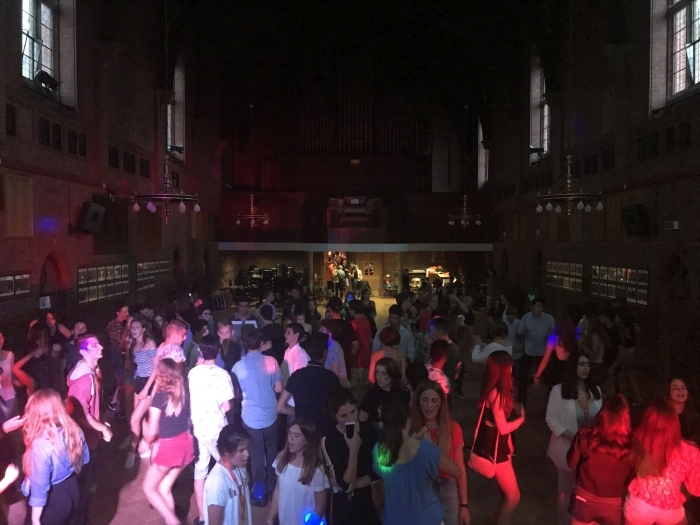 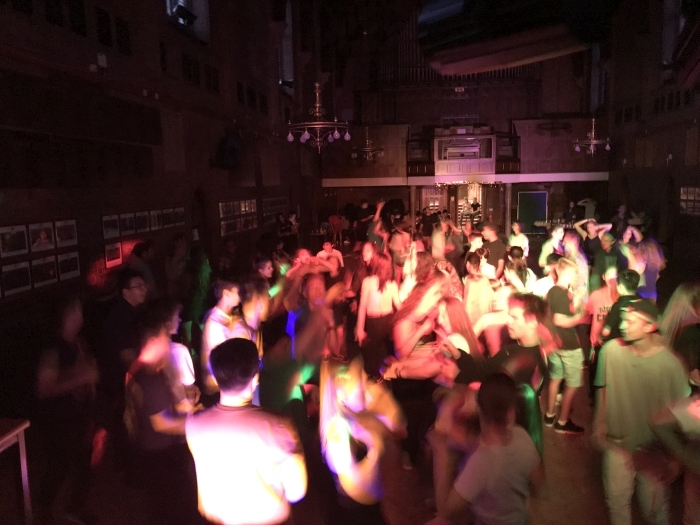 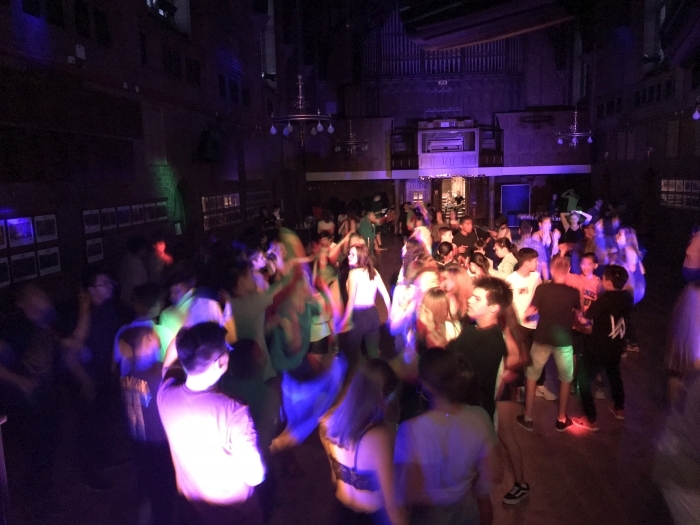 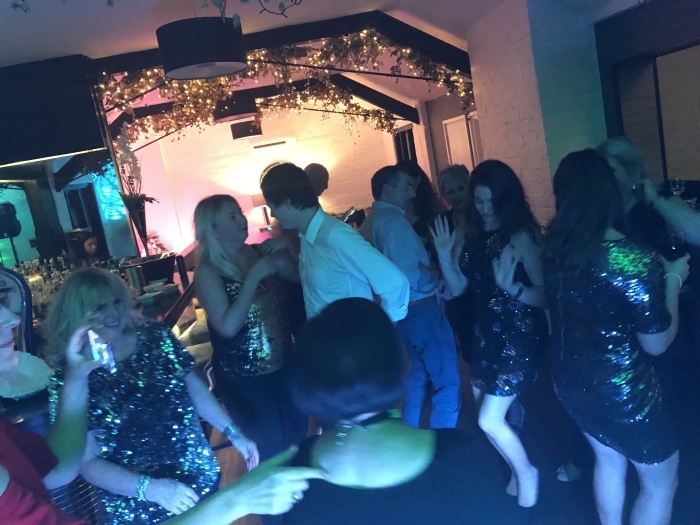 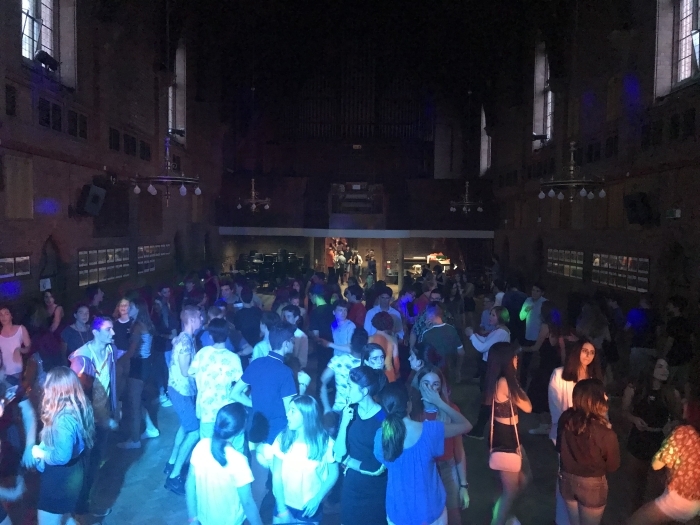 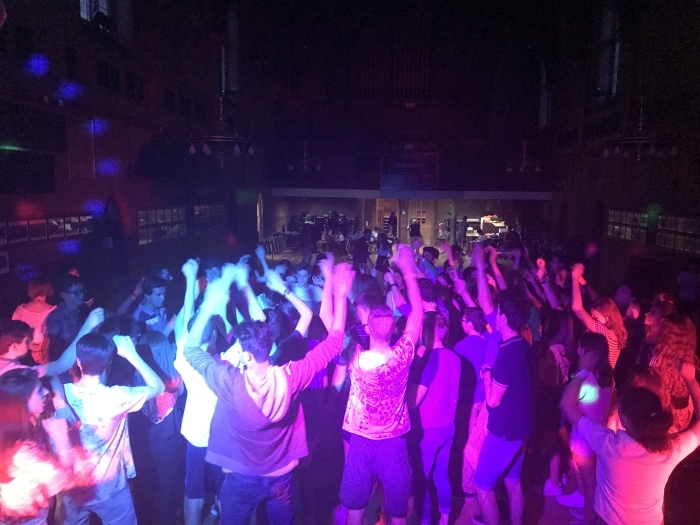 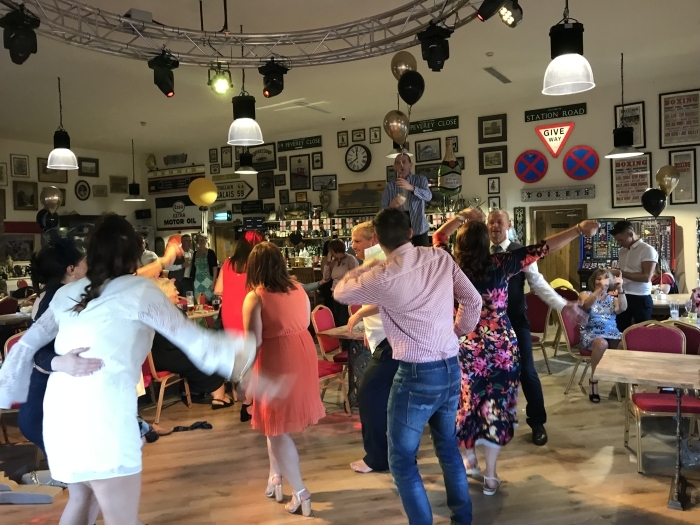 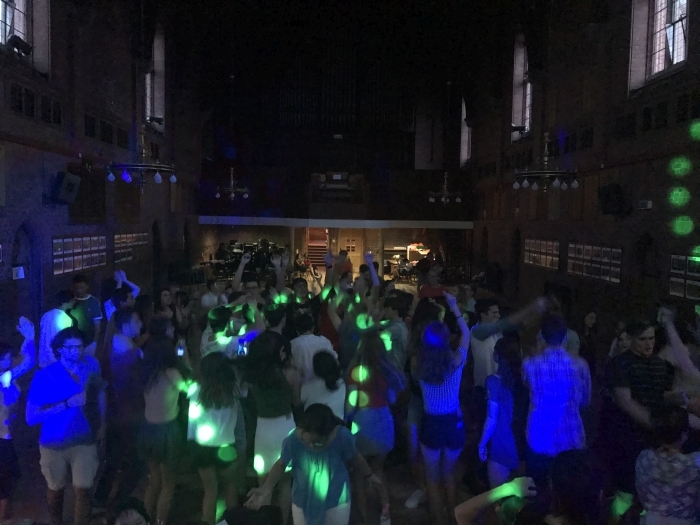 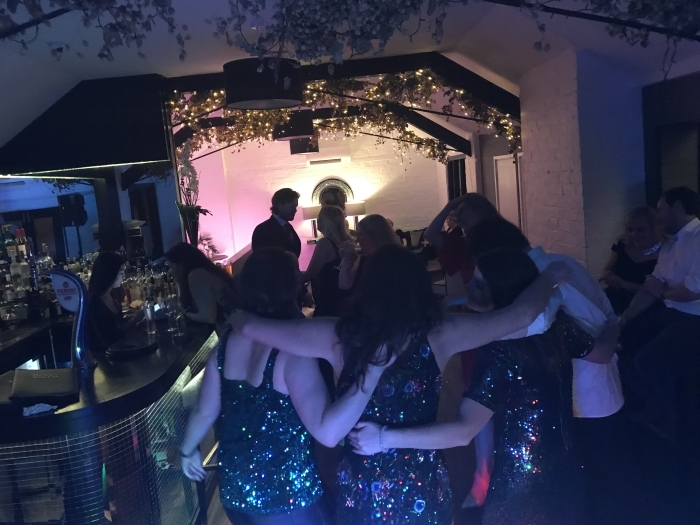 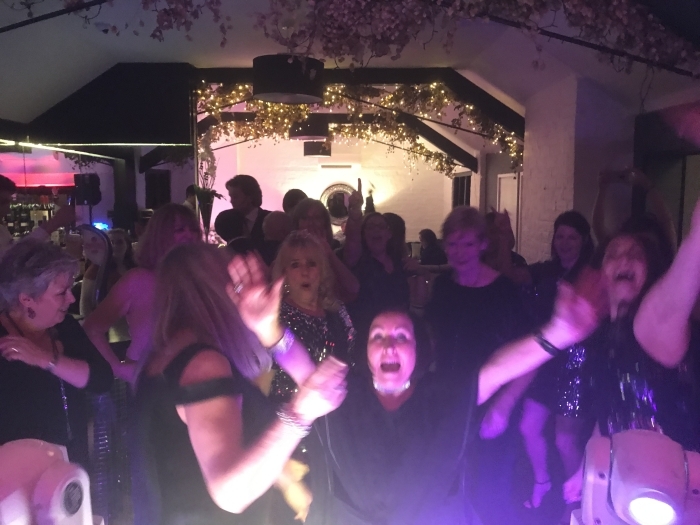 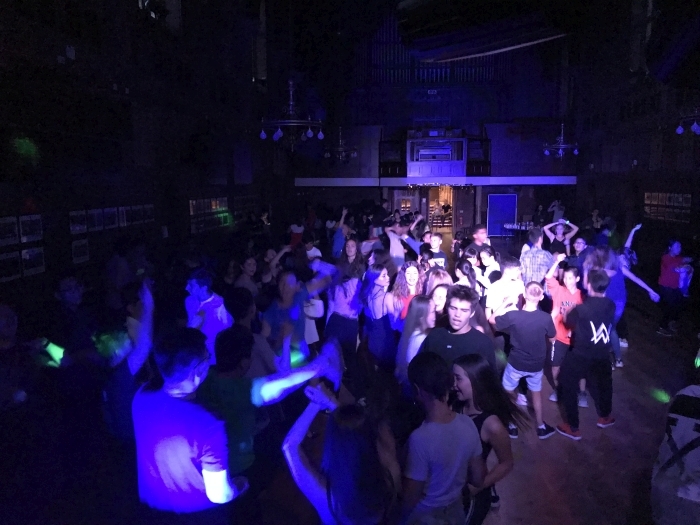 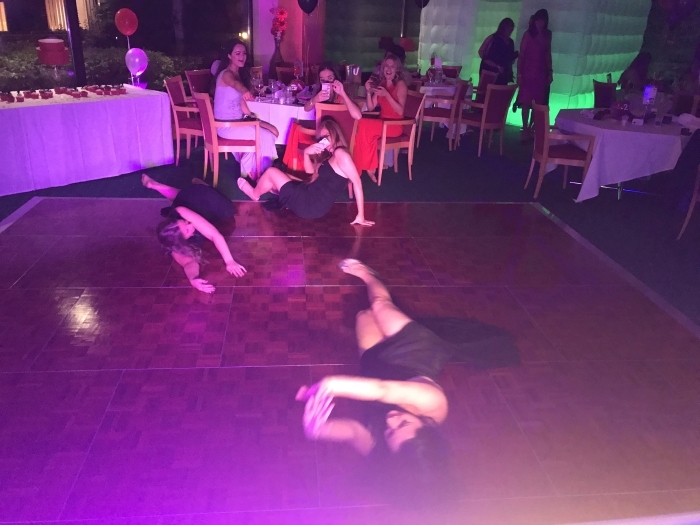 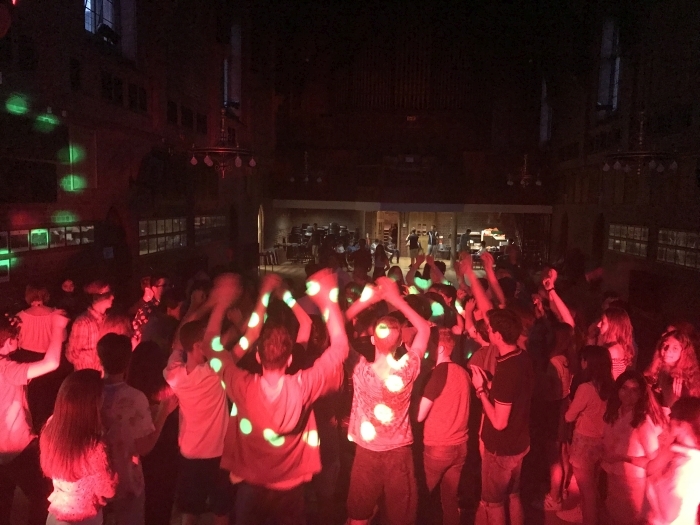 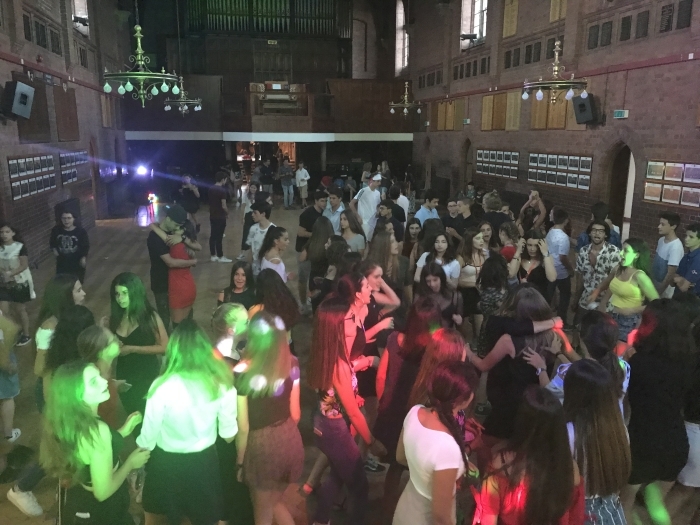 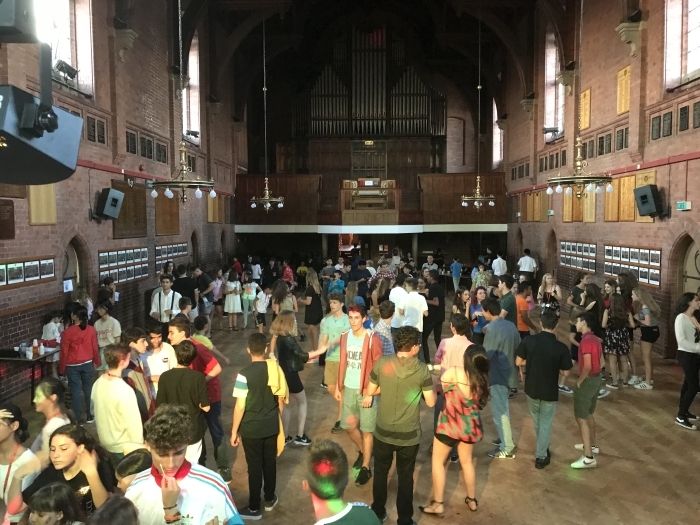 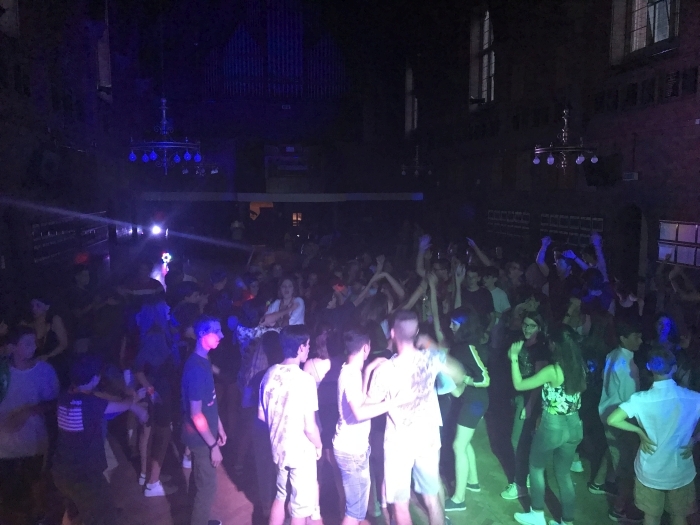 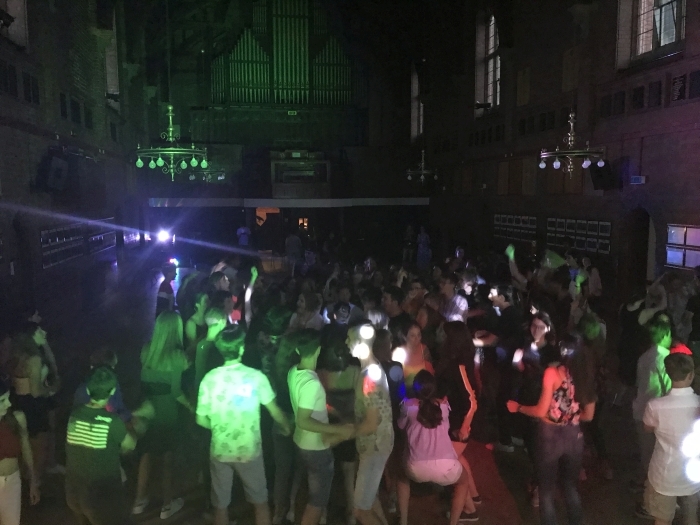 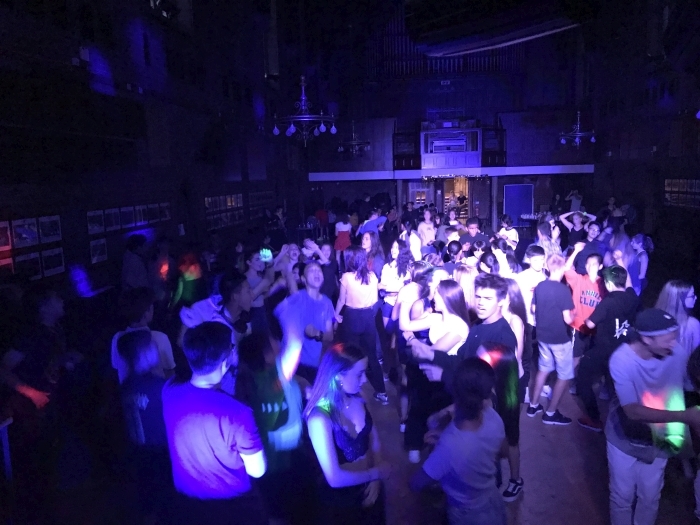 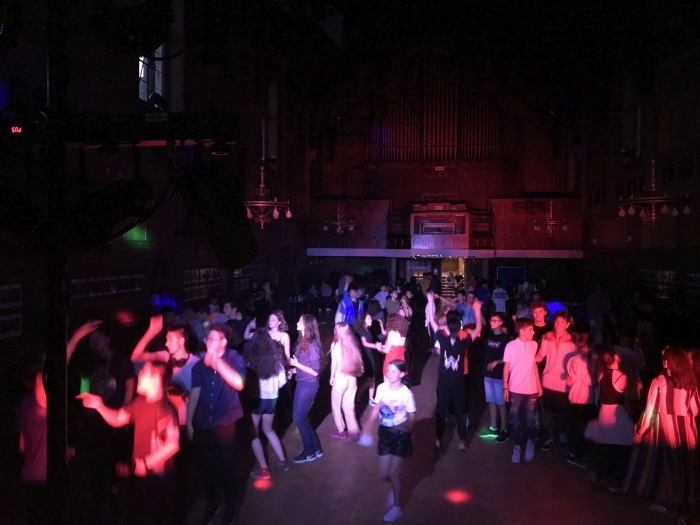 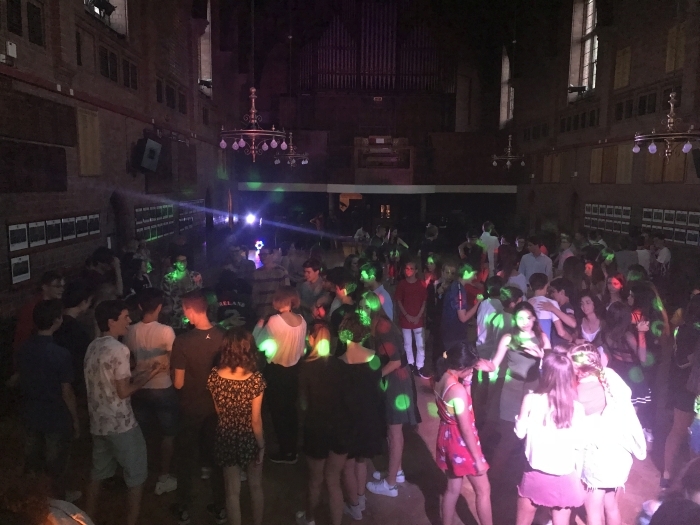 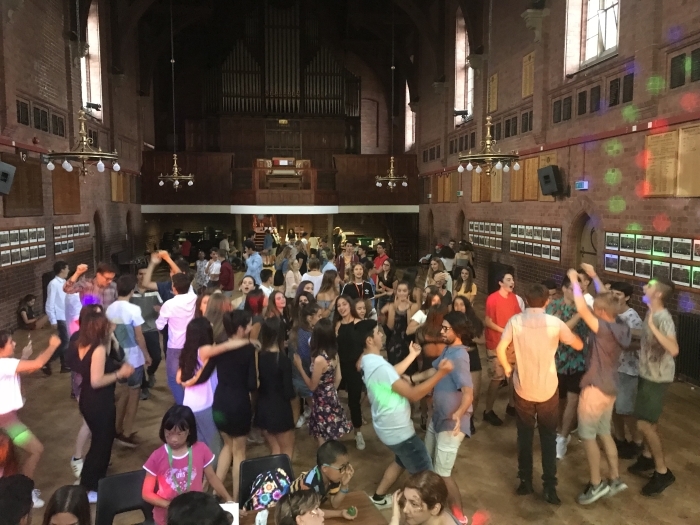 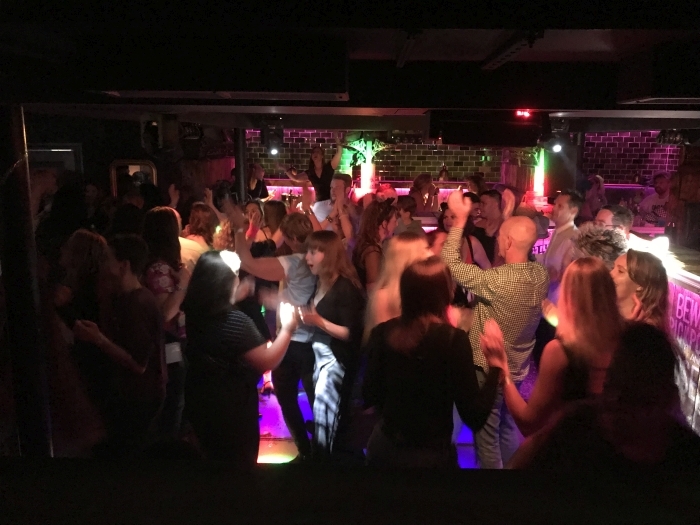 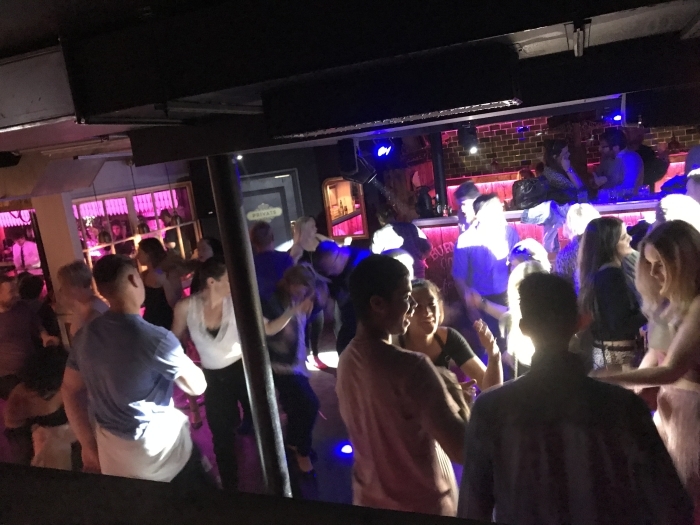 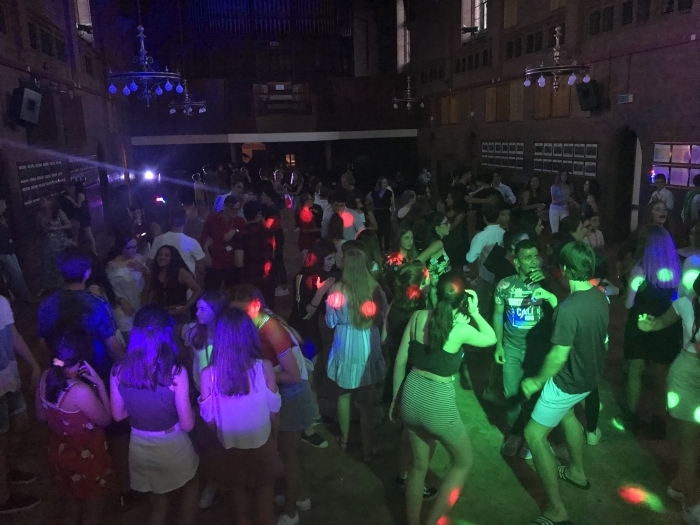 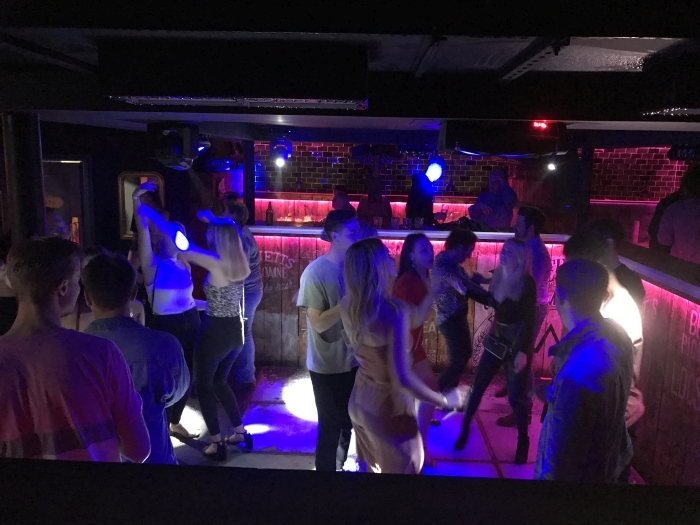 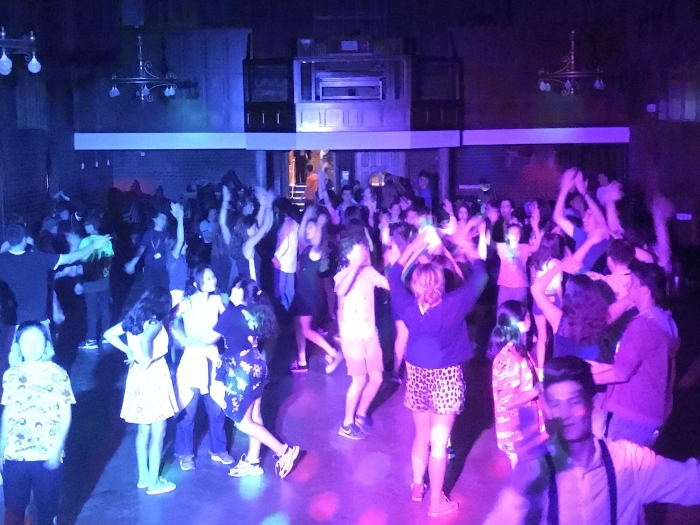 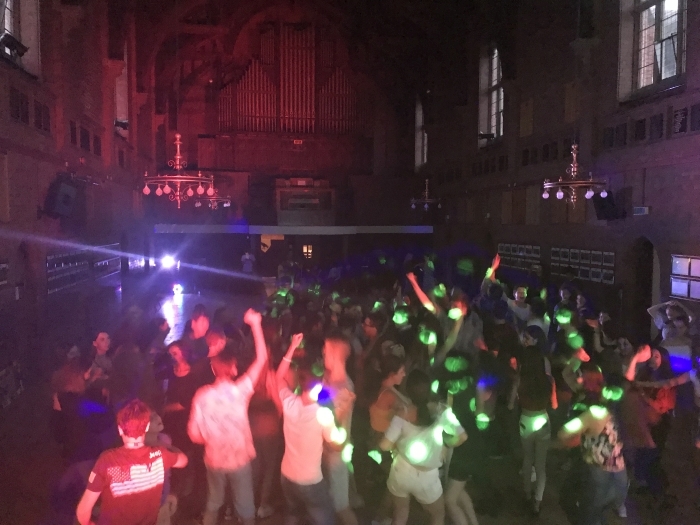 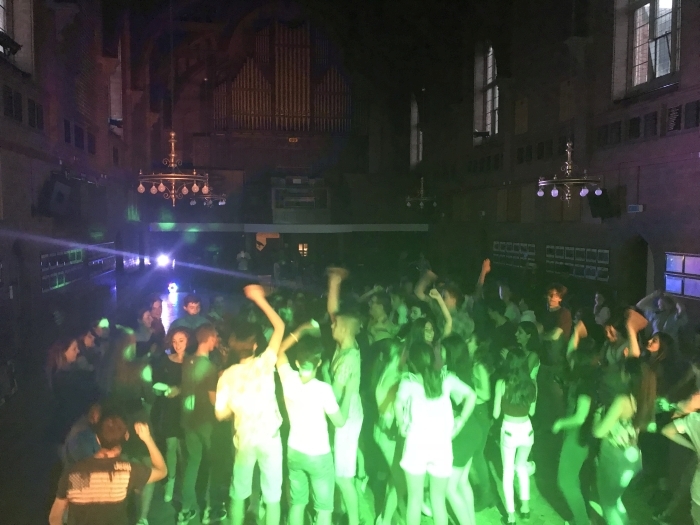 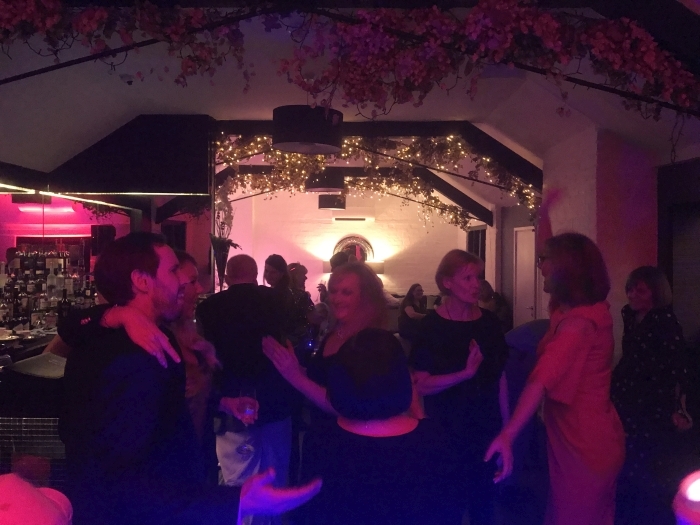 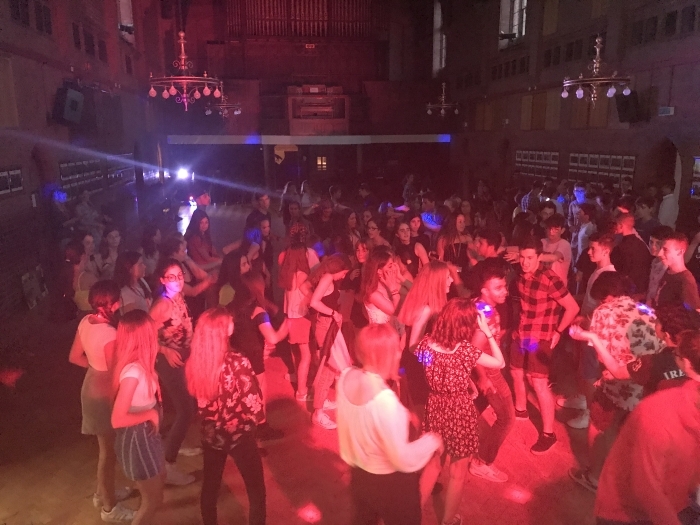 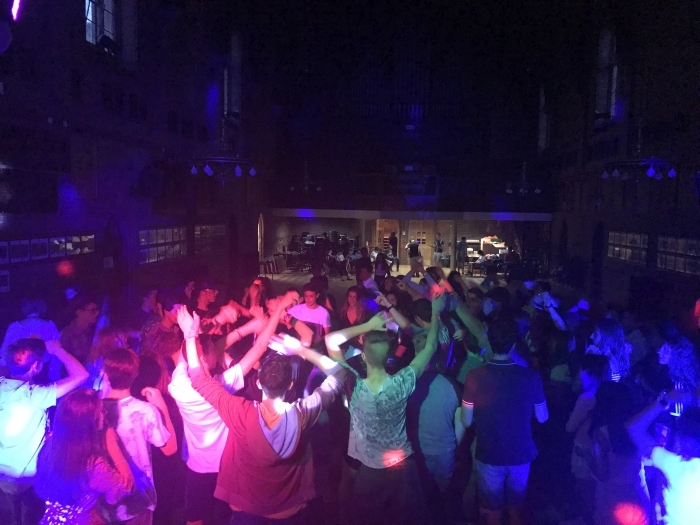 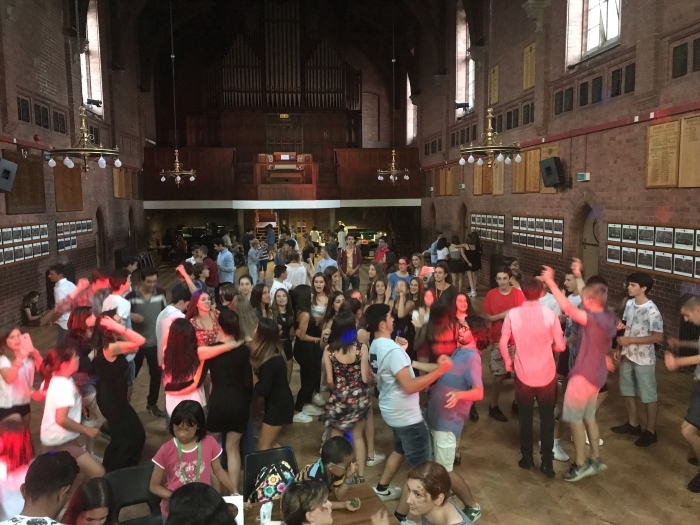 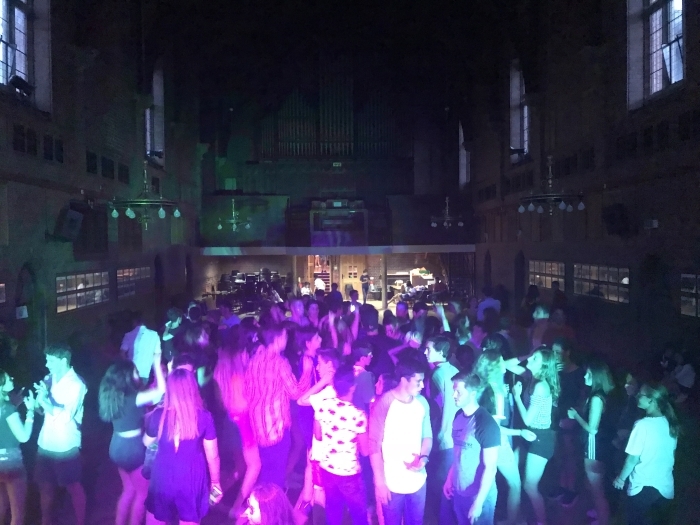 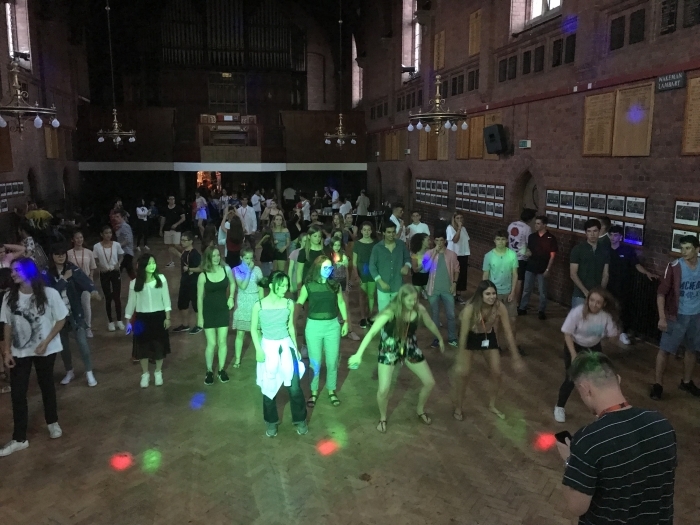 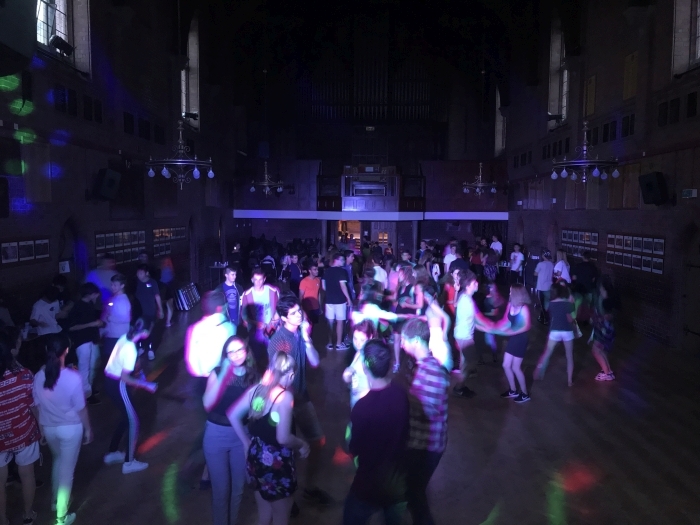 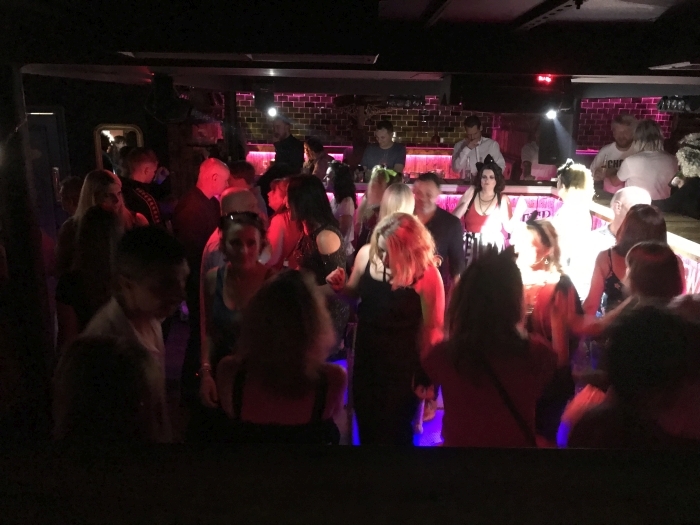 This year was a slightly smaller year group than last but that did not stop them filling the dancefloor from the off on what was a very hot evening! 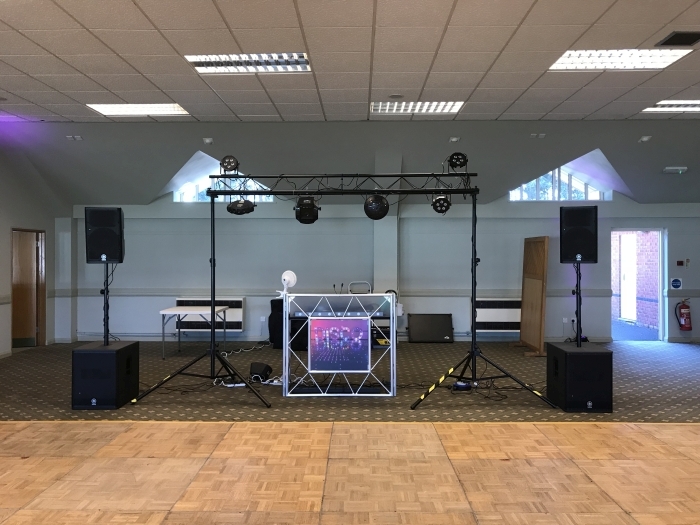 A quick run through on the equipment used for this High School Prom. 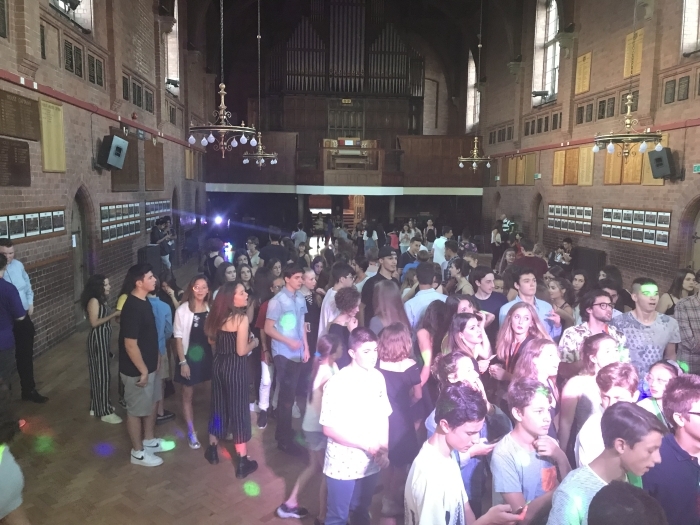 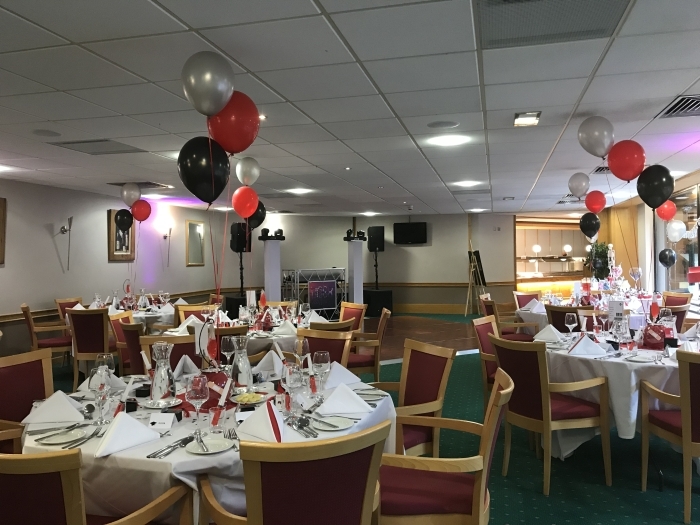 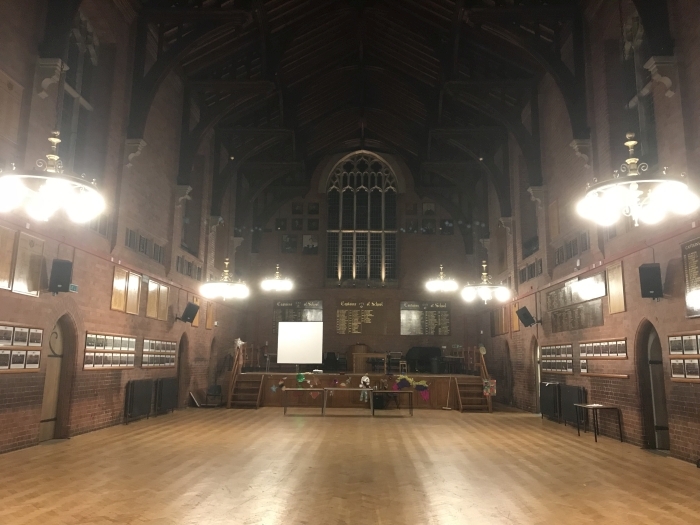 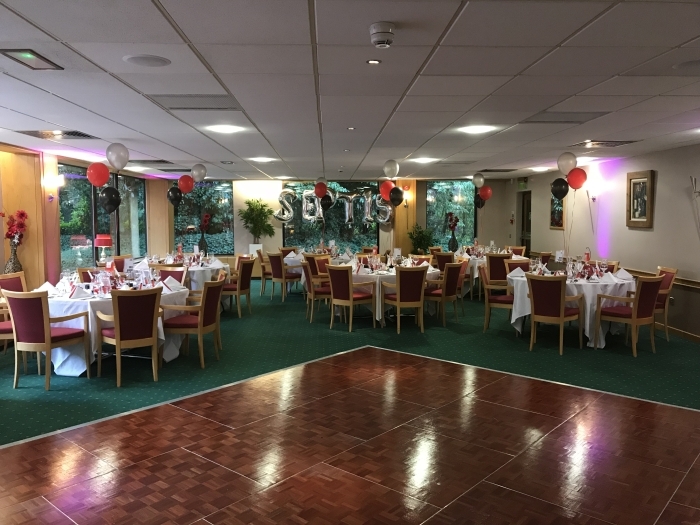 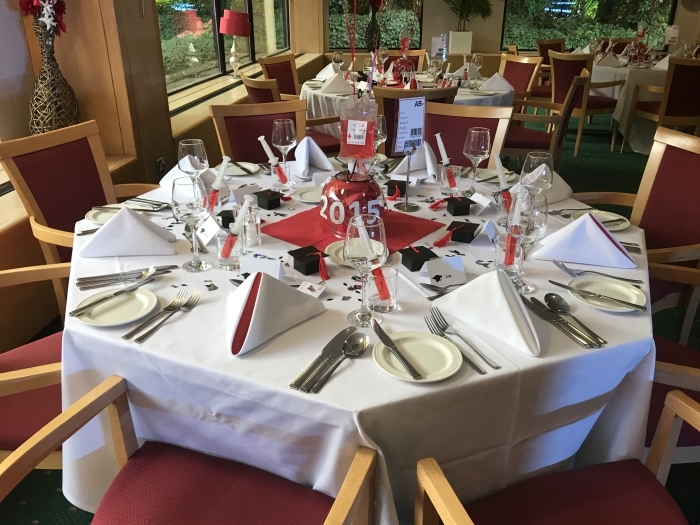 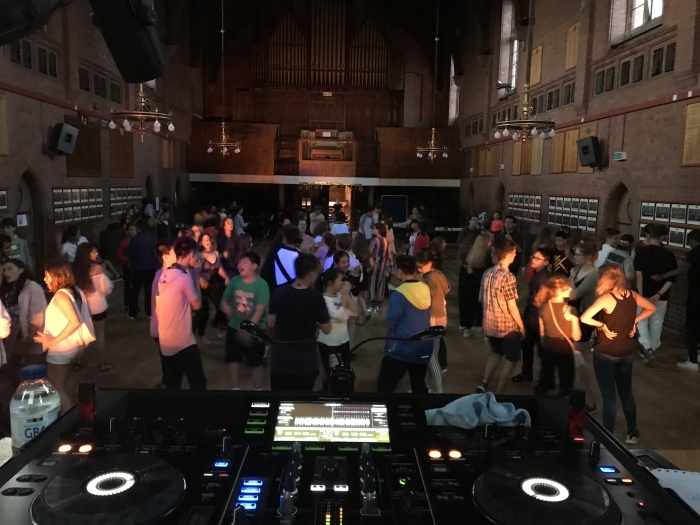 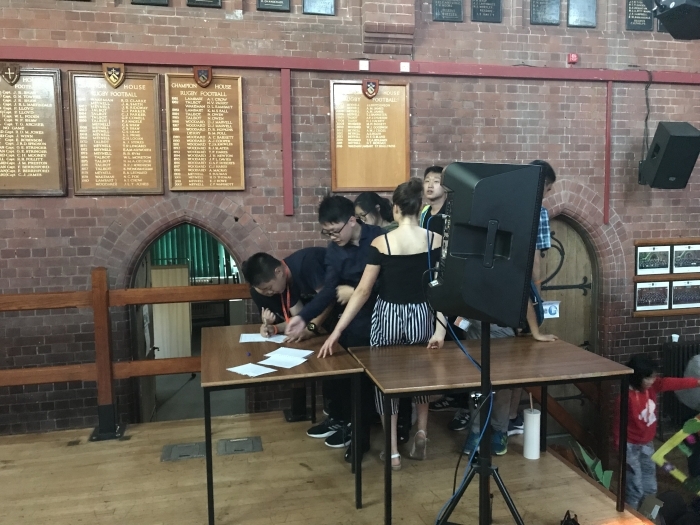 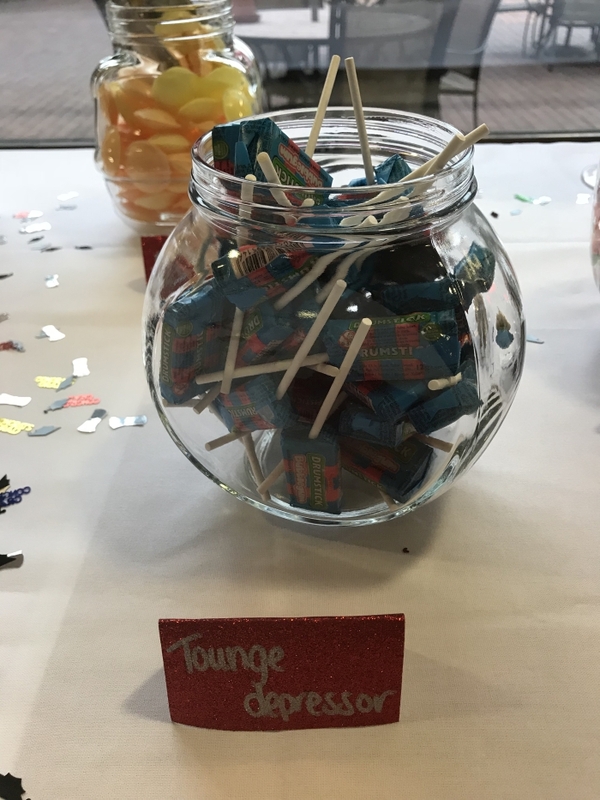 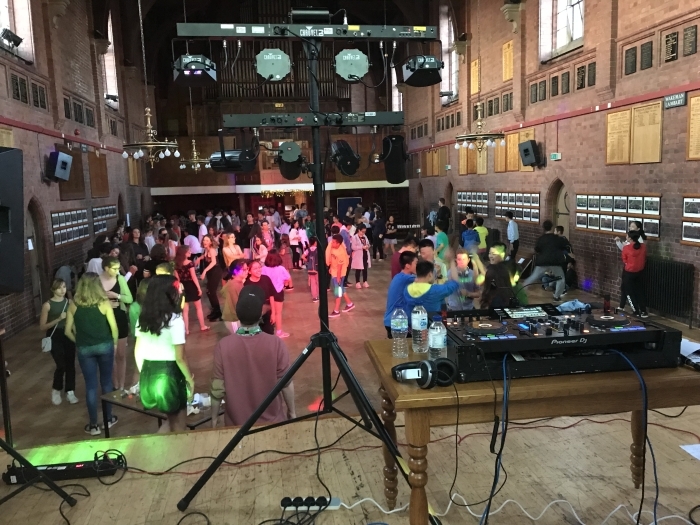 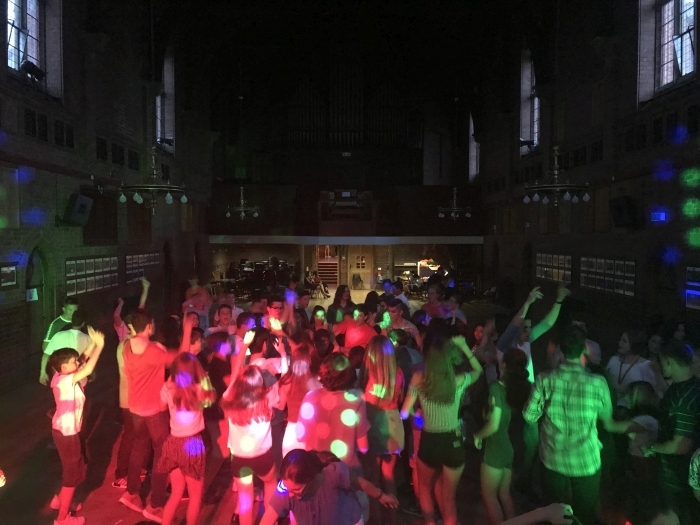 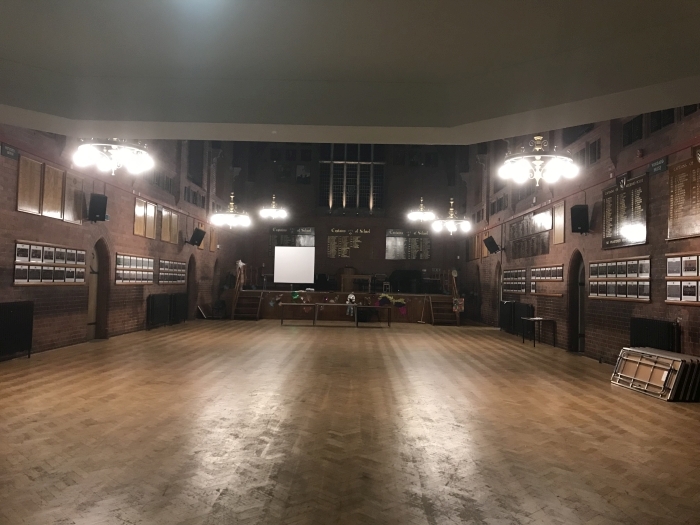 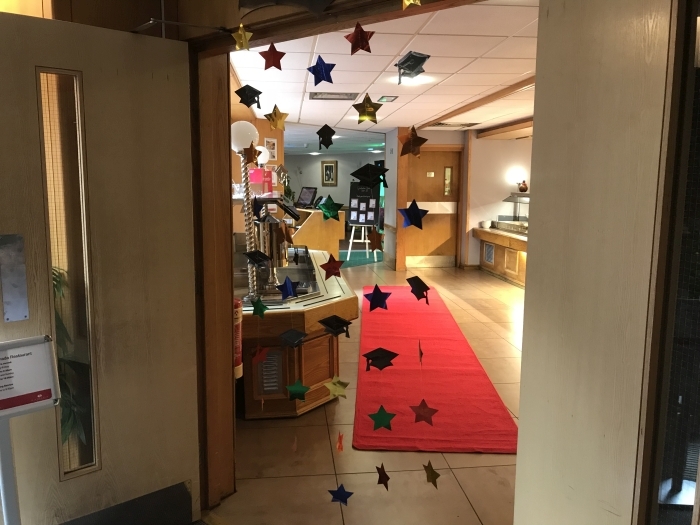 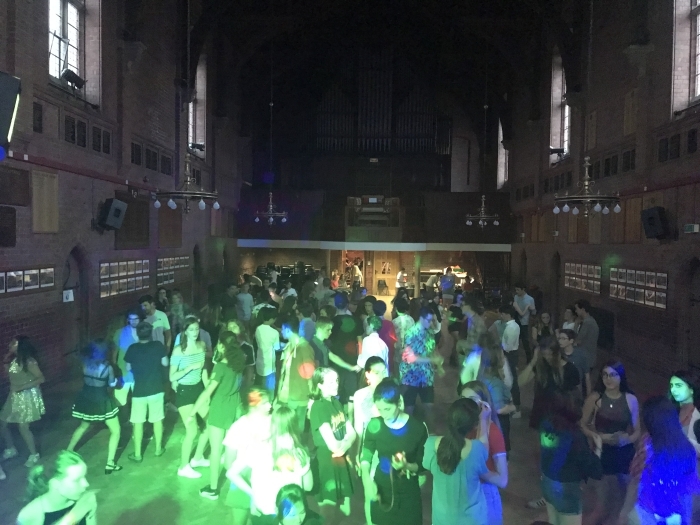 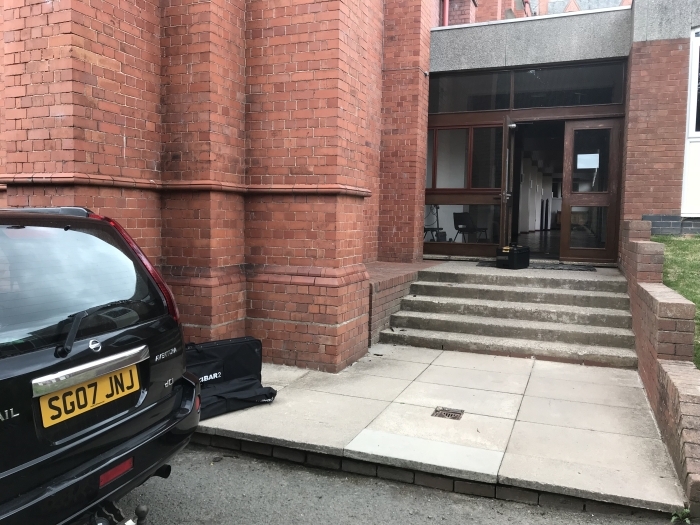 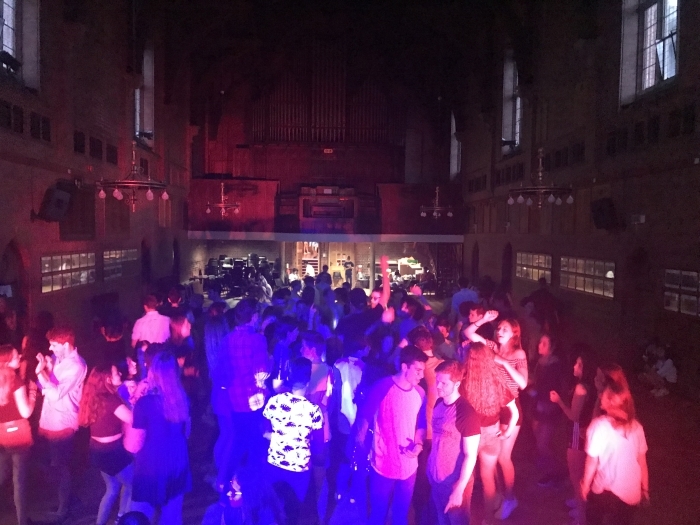 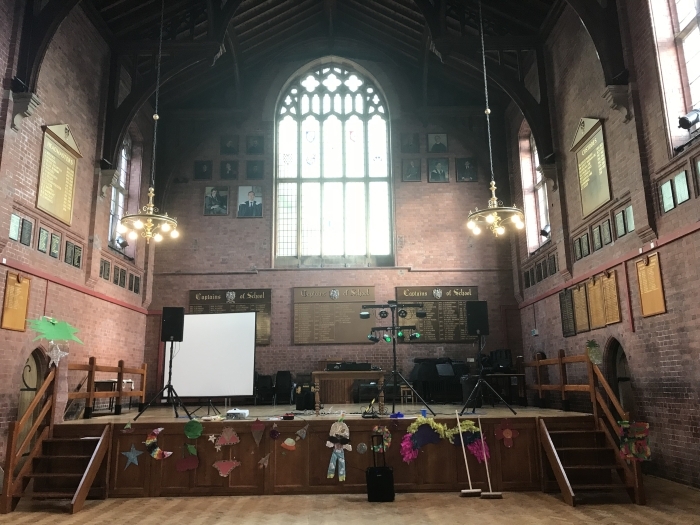 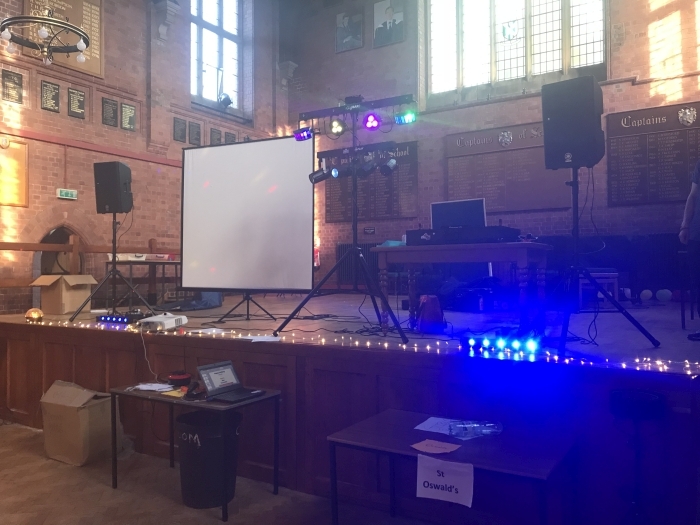 These are pictures of the June 2018 School Prom Disco setup images. 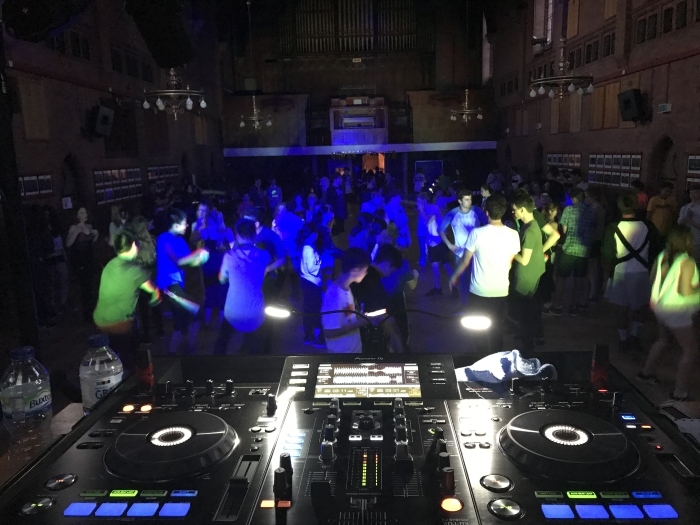 Don’t forget to feed the DJ! 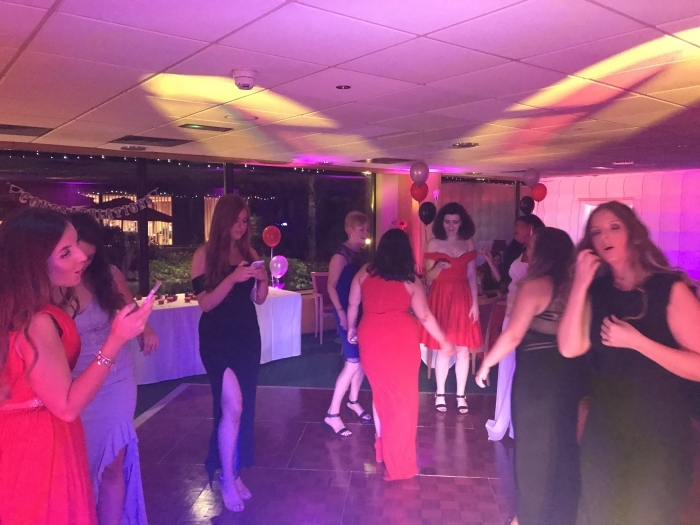 This is a selection of pictures I took on the night of the event. 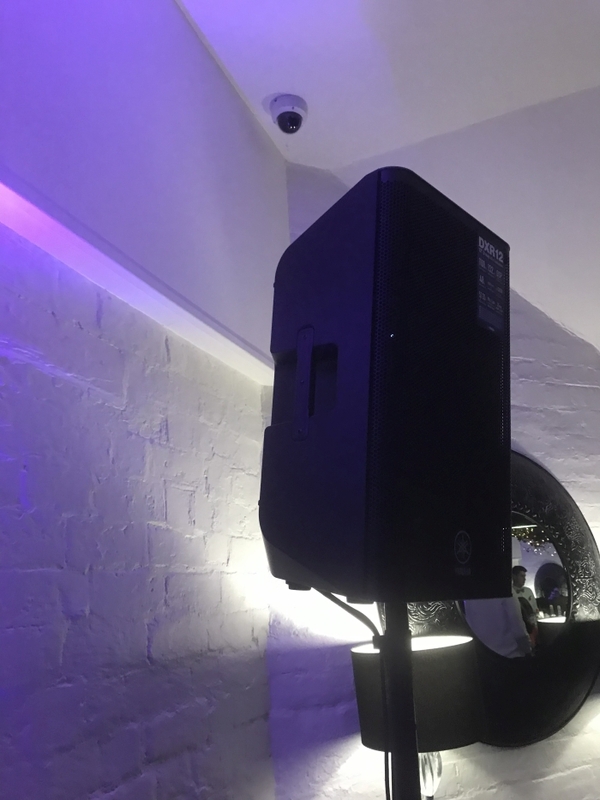 This event had quiet a bit of equipment to enable to provide not only an amazing sound quality but also a visual wow factor. 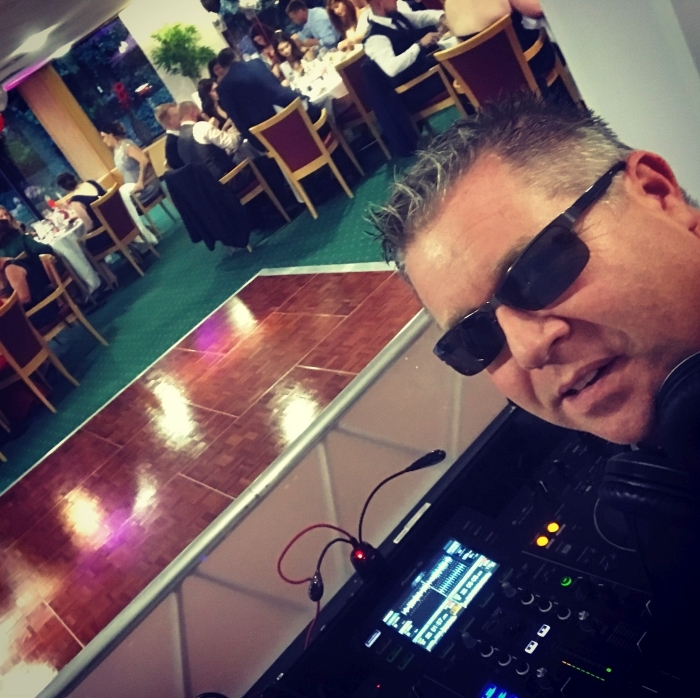 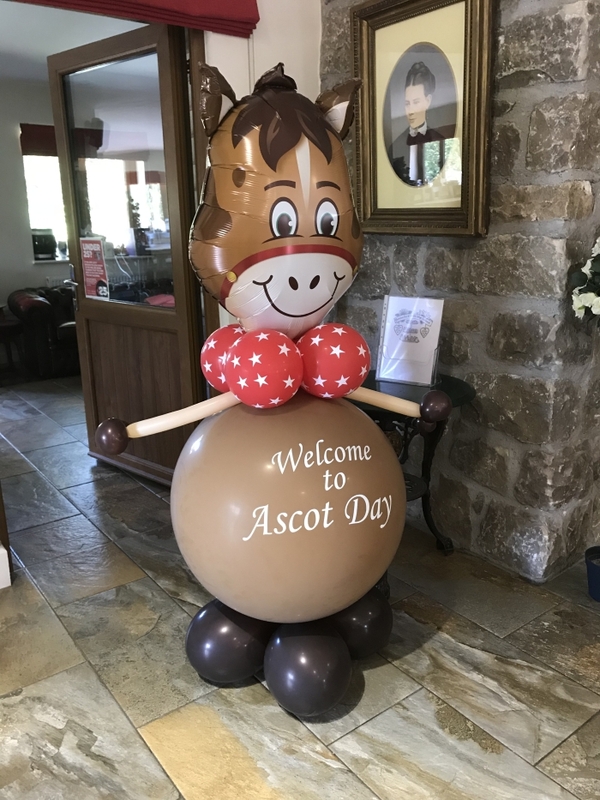 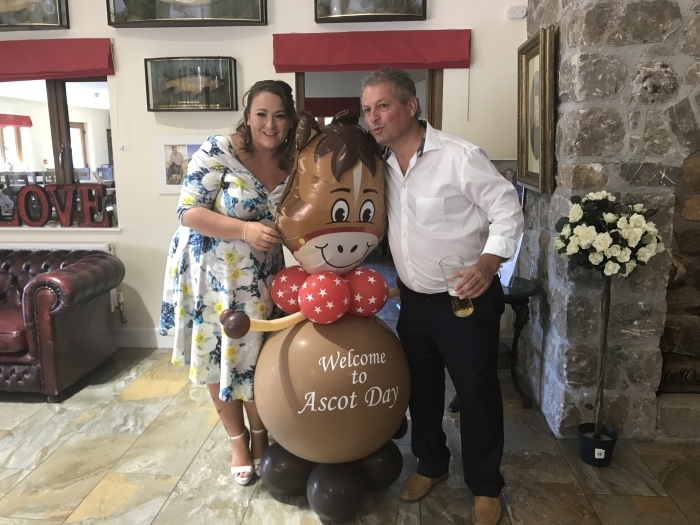 Thursday 21st June 2018 was Ascot Ladies day and for the second year in a row I was asked to compère the event and also DJ the afterparty! 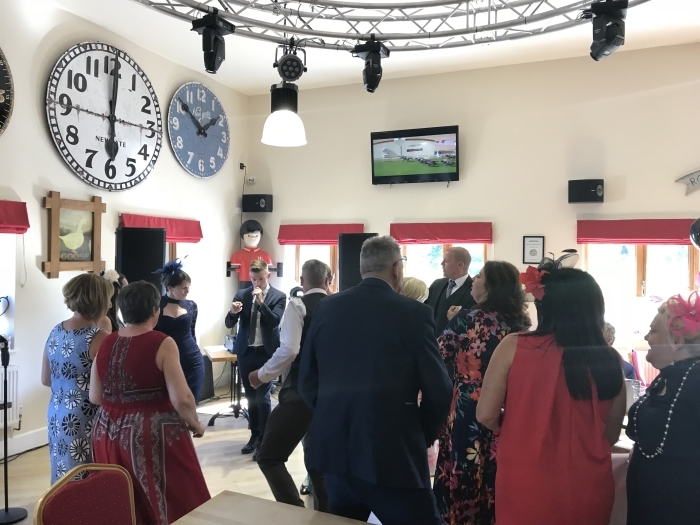 This well attended event had a great party atmosphere from the start with a glass of champagne on arrival for all the guests, Seafood Buffet Lunch, Mussels Mid-afternoon, all the days races on the three big screens, On-site Bookmaker, Live Entertainment from Neil Christopher in between selected races and me DJing between the other races, a Full Buffett and followed off by me DJing the after-party event.